Each and every day we receive a phenomenal number of emails asking all matter of questions pertaining to audio / visual related issues. The more frequently we get asked something, the more likely that the question will end up here on our frequently asked questions page. This page is updated regularly and is forever growing, so check back regularly for updates. These are the questions we're most commonly asked, starting with questions about us all the way through to system design, product choice and how to do articles. Why should I employ Fhrx Studio's to install my system? Do you mail order equipment? 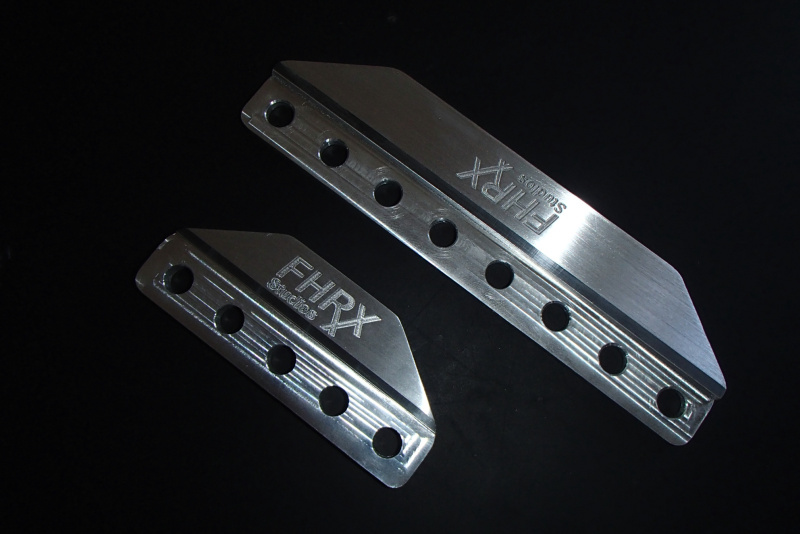 What does Fhrx stand for? Audio / Visual related questions. What's the best system I can get for XXXX dollars? How can I destroy my speakers? What do speaker power ratings mean? Should I use a capacitor on my higher frequency speakers? Do I need the biggest amp possible? 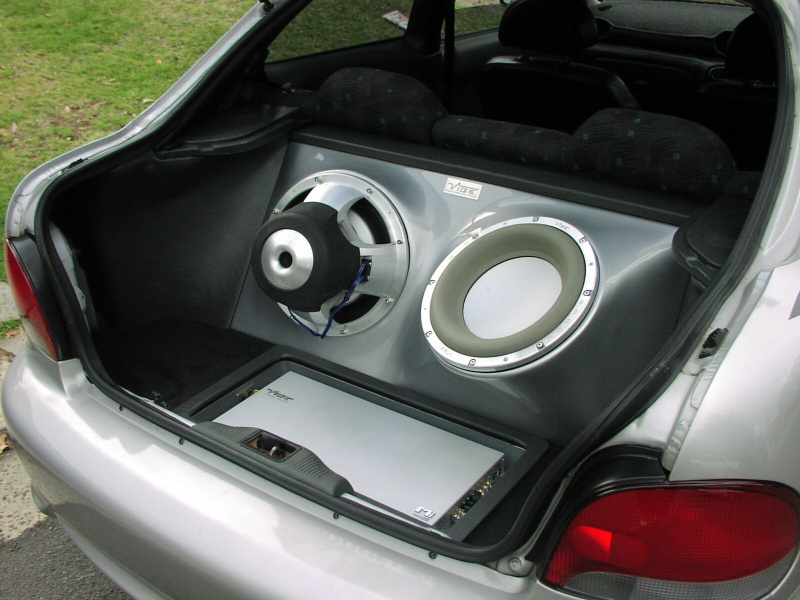 How loud will my speakers play? What brand of amplifier would you recommend? What is the optimum enclosure design? 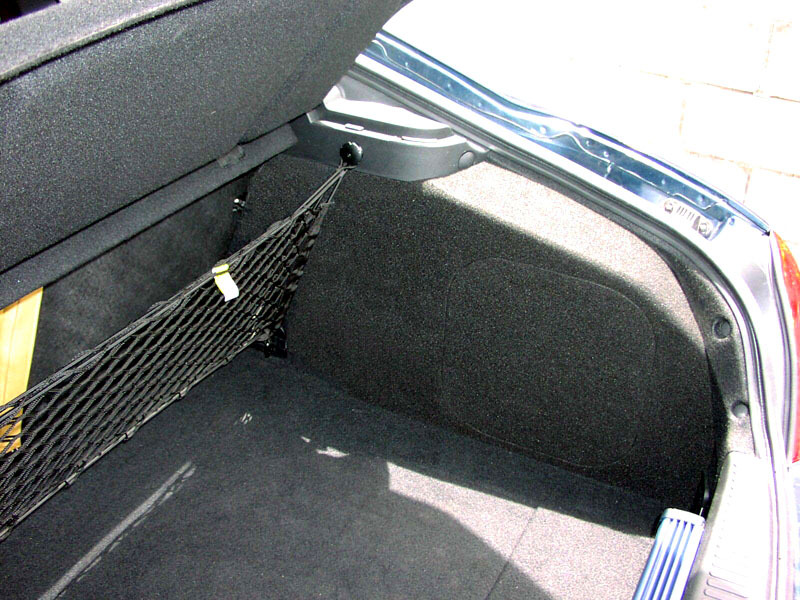 Should I use sound deadening, diffusers or fibrefill inside my enclosure? What is the ideal box size for my midrange speakers? 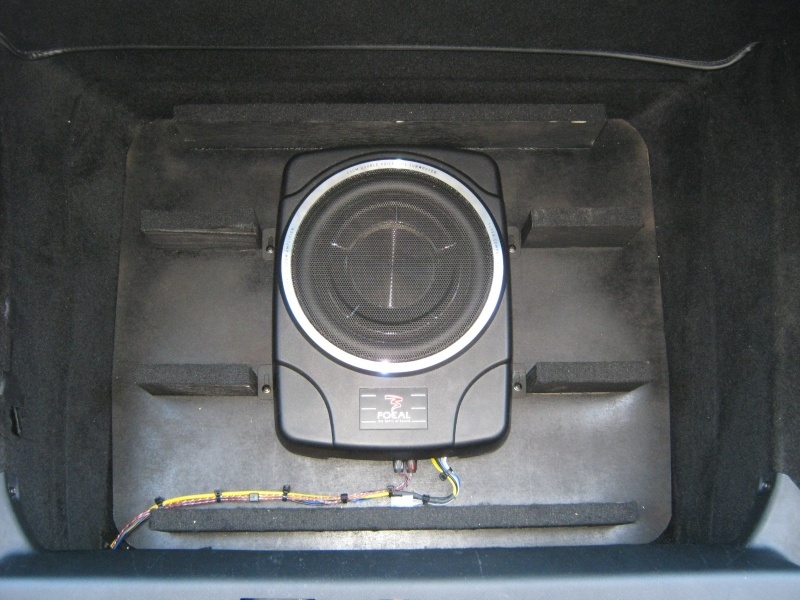 What crossover frequency should I use between my subwoofer and my 6" or 5" midbass drivers? Can you explain the difference between crossover parameters? Where should I place my tweeters for best performance? 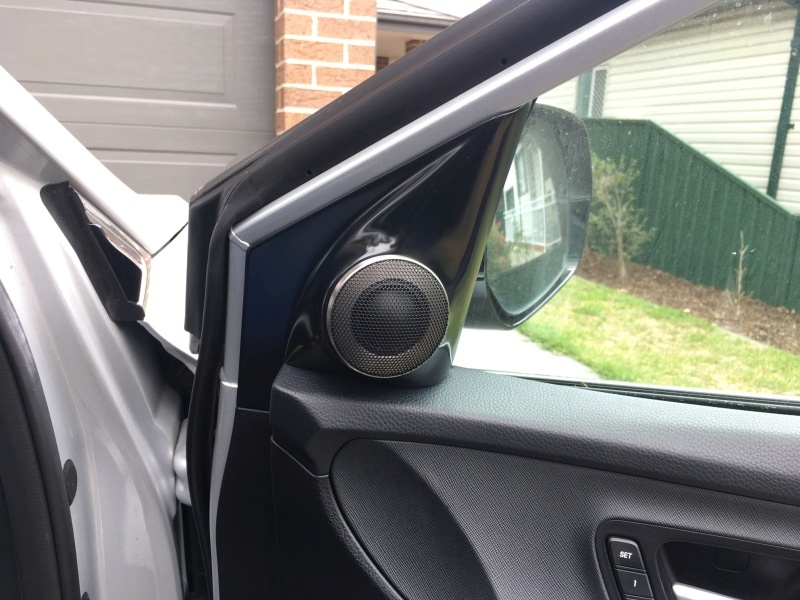 What speaker pods and door trims can I get for different budgets? I've heard people recommend against 6x9's. What are the pros and cons? When I turn my music up, why do my headlights dim? I've heard you're not keen on demo walls. Why? How do I tell if my speakers are in or out of phase? How do I use my faders and balance settings to make my system sound better? 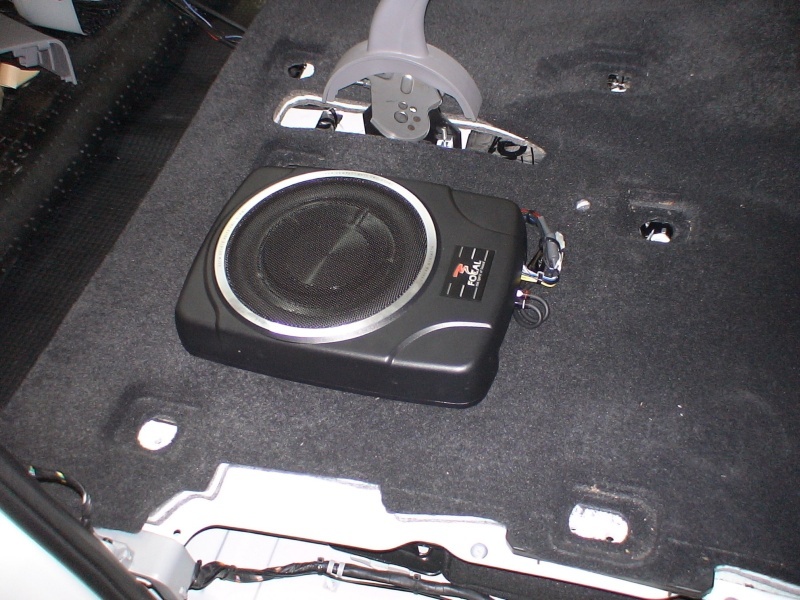 Can my car stereo really hurt my ears? Is there a place I can talk to someone about this stuff? Can you explain amplifier specifications and the difference between the classes? Can you simply explain Ohms and resistance? 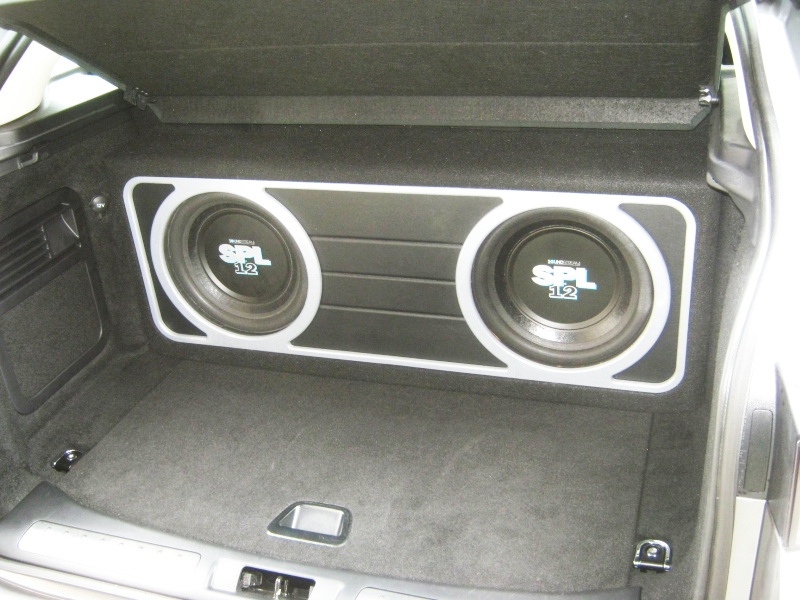 Which way should I aim my subwoofer? What is the highest sound pressure level (SPL) we can achieve? How do I set my gains? What do all the Theile / Small parameters stand for? 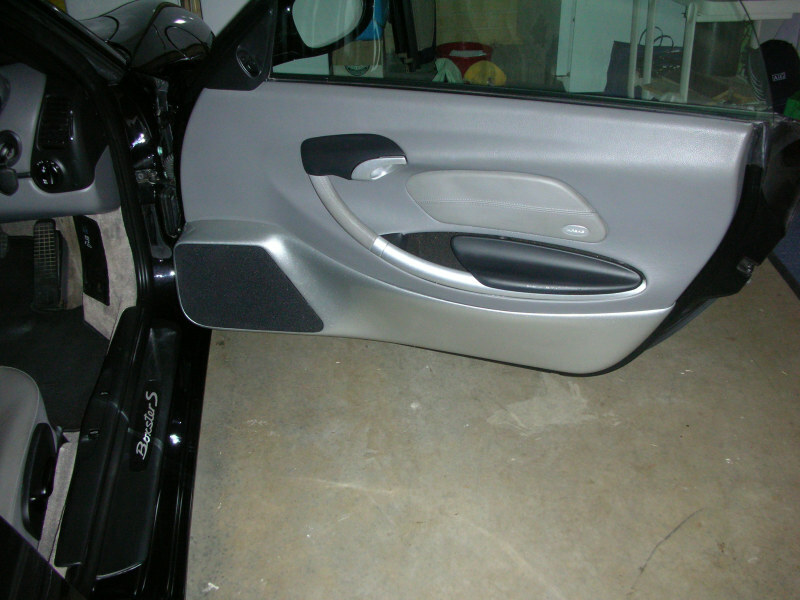 Do I really need sound deadening in my doors? What is the wavelength of different frequencies of sound? 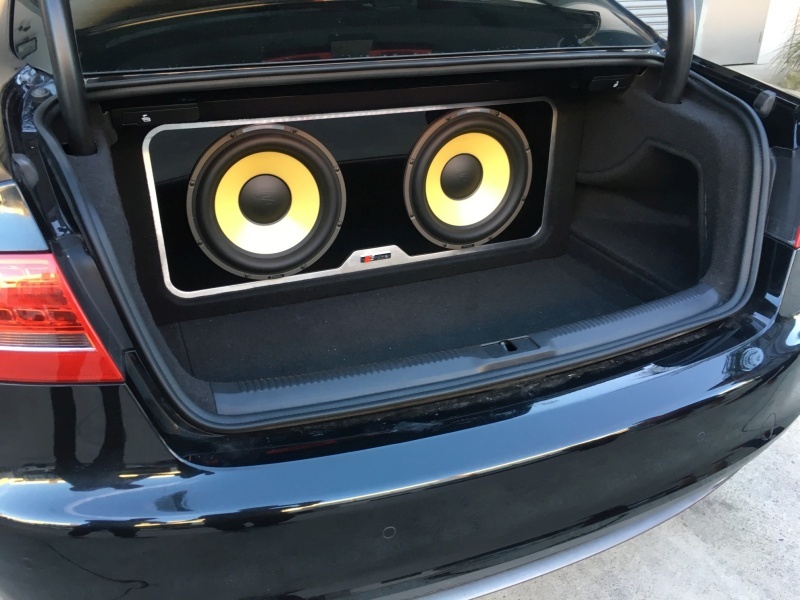 Should I upgrade my rear speakers? Are the expensive cables really worth it? 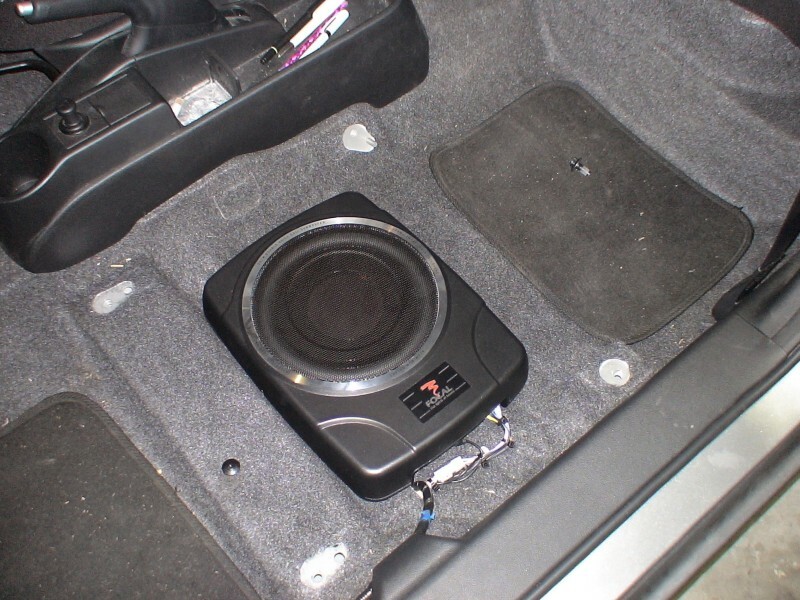 Do my subwoofers need separate chambers within their enclosure? 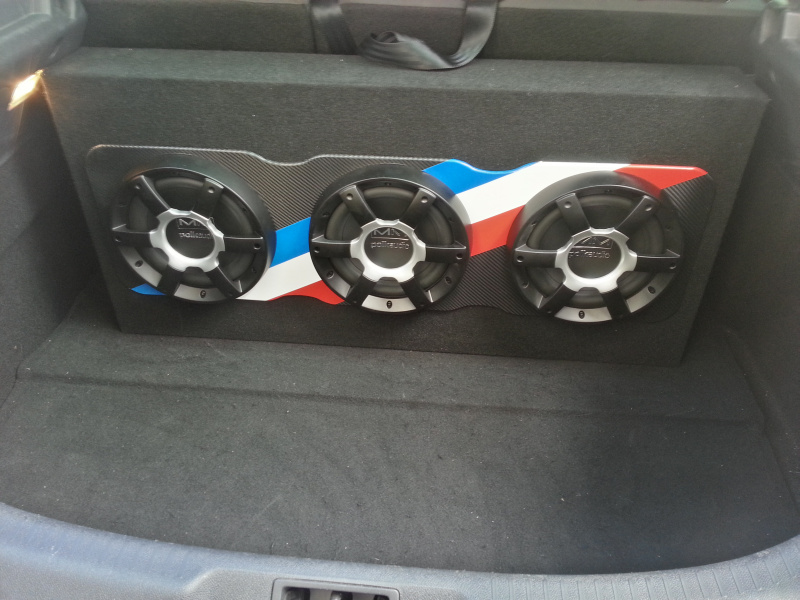 What grilles can I get to protect my speakers? What are the frequencies of sound? Can you explain batteries, capacitors and cycles? 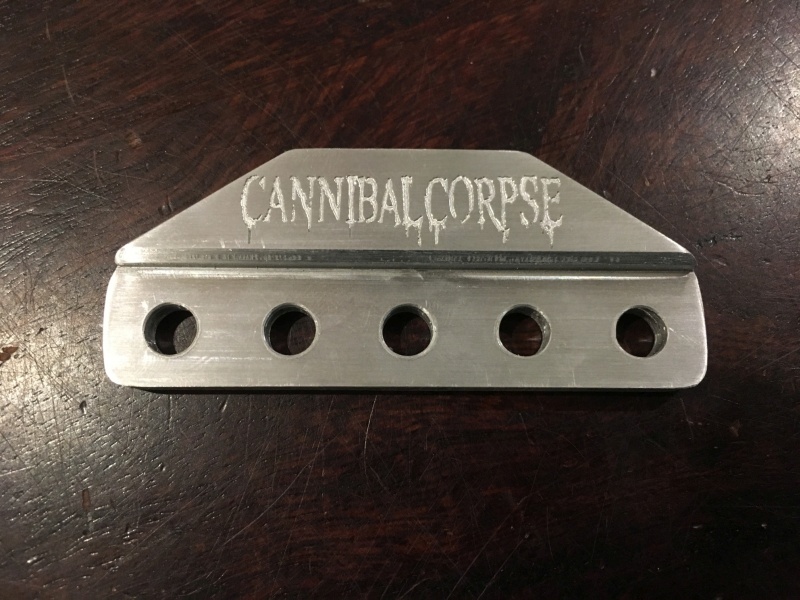 Is there a website that lists all manufacturers? Should I upgrade my earths? 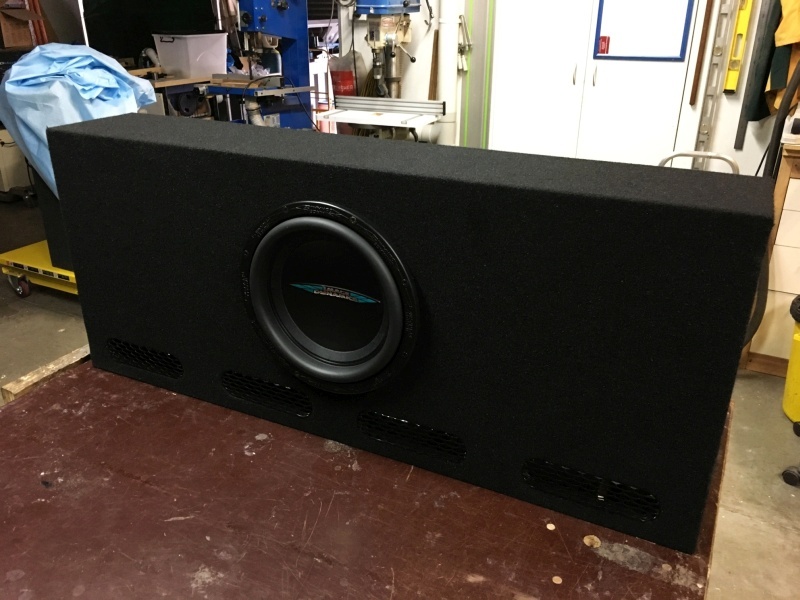 What subwoofer enclosure can I get for different budgets? How does 'Qtc' effect my bass? Should you be buying locally? 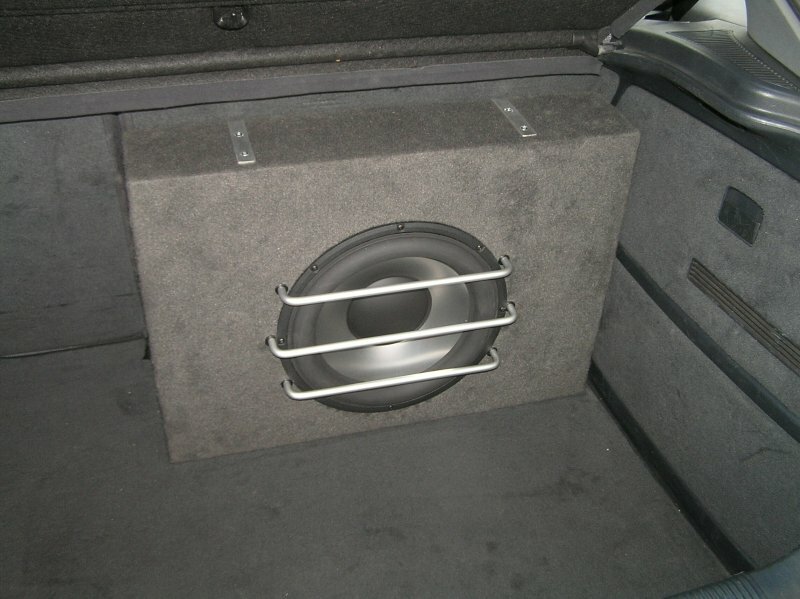 Is there a bass solution for tight spaces? 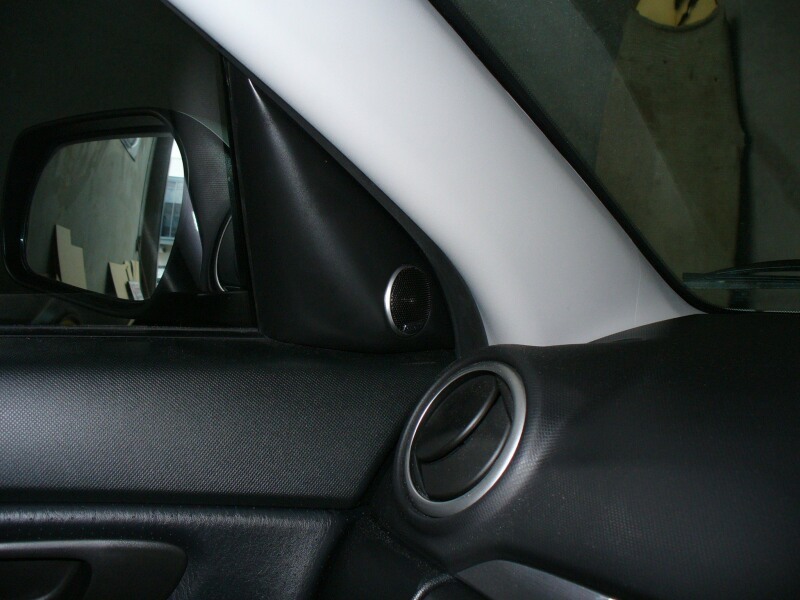 What simple decorations and beautifications can I employ to personalise my install? Why do you so rarely screw crossovers down? A frightening portion of our work comes from fixing other stores work; us bearing witness to a near endless stream of people being burned by shoddy workmanship and corner cutting. 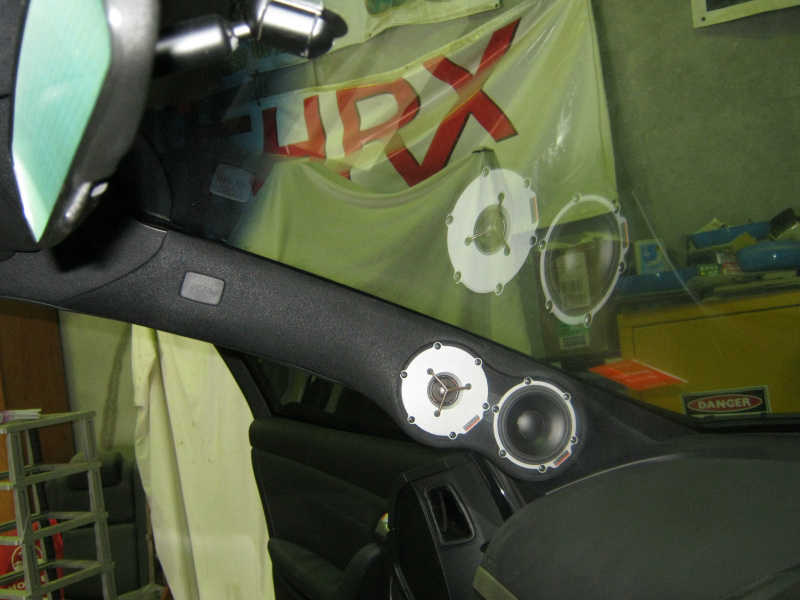 This is conducive to many walking away from car audio simply assuming no one does high quality work anymore. 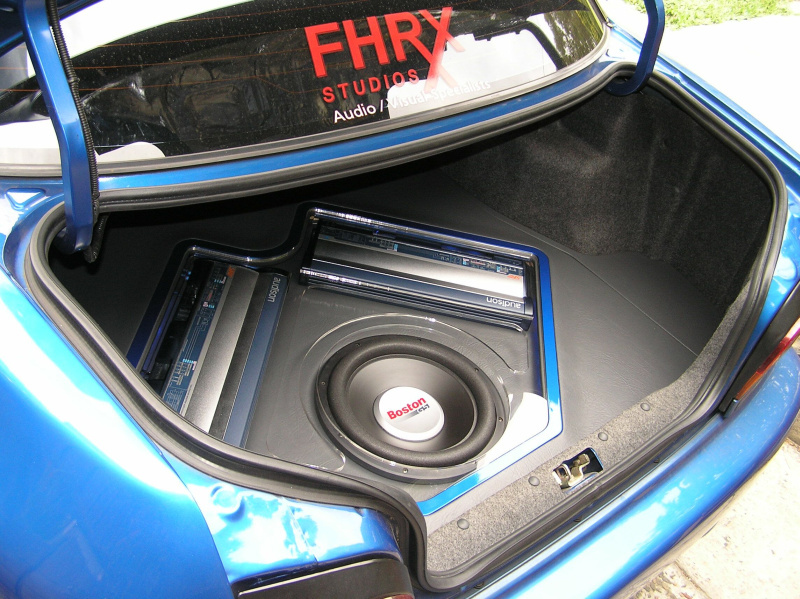 Starting out decades ago; Fhrx Studios set out to change this attitude, striving to produce the best install possible for any desired vehicle and budget. For info about us, our methodologies and reasons why you should come see us for your next install click here. Yes we certainly do! We're always more than happy to take orders for most products via email and phone. Payment can be made by all the usual payment methods and upon clearance and receipt of payment you're issued with a receipt. 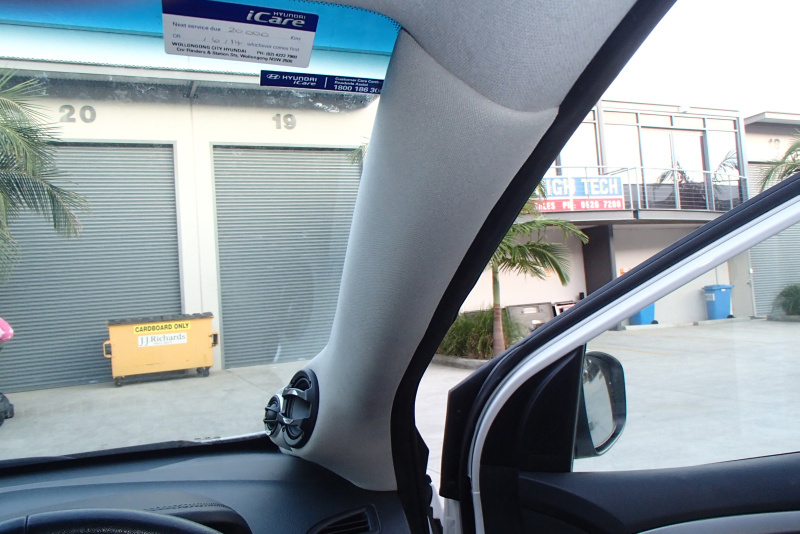 Items are shipped via Australia Post and are registered and insured. 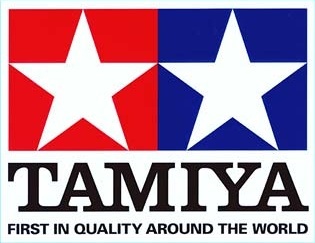 We are also more than happy to ship to New Zealand. Note; due to some of our agreements with certain distributors and companies we are forbidden to ship certain brands overseas. If in doubt, please ask as these conditions constantly change. There are also some brands that we have interstate agreements with meaning that if you want to order a product from them we'll refer you to a reseller located in your state. We certainly do. If you're stuck for ideas on what present to give a friend or relative how about giving them a Fhrx Studio's gift voucher? We can supply gift vouchers for any value and can even post them fully wrapped to people if that suits you better. The short answer is nothing really; it's just Marty's nickname. Expanding upon this; when Marty was young there were no mobile phones or internet, ergo everyone was on CB radio and had call signs for identification. In those very early days Marty had aspirations for a career in pyrotechnics, therefore he went by the call sign �Firex�. Fast forward to the teenage years and with him now working within the aircraft industry, he was required to have a four letter code to sign off upon various things. 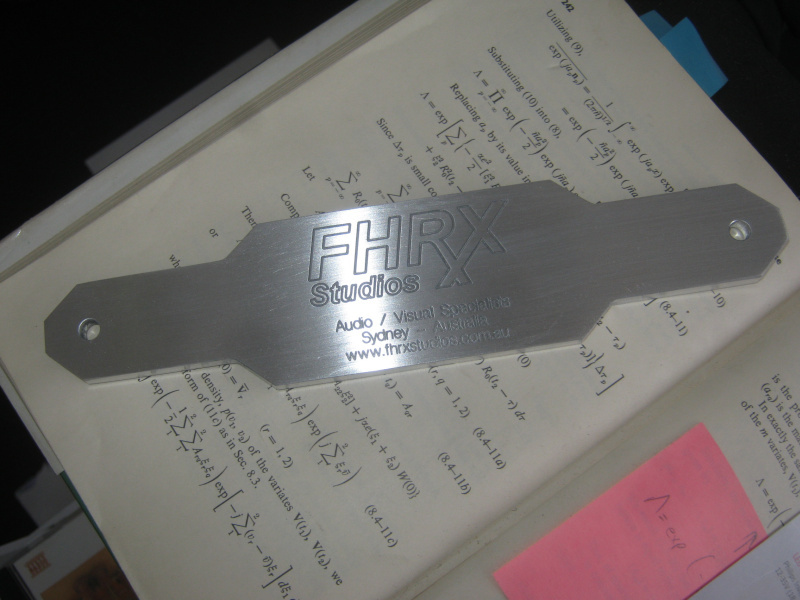 Hence this moniker was shortened to Fhrx, pronounced �fikes�. When the time came to start the audio store he didn�t want anything cheesy such as �Marty�s Audio�. Nor did he want the terms �car� or �audio� in the name either, simply because the business covered far more than just those two aspects. 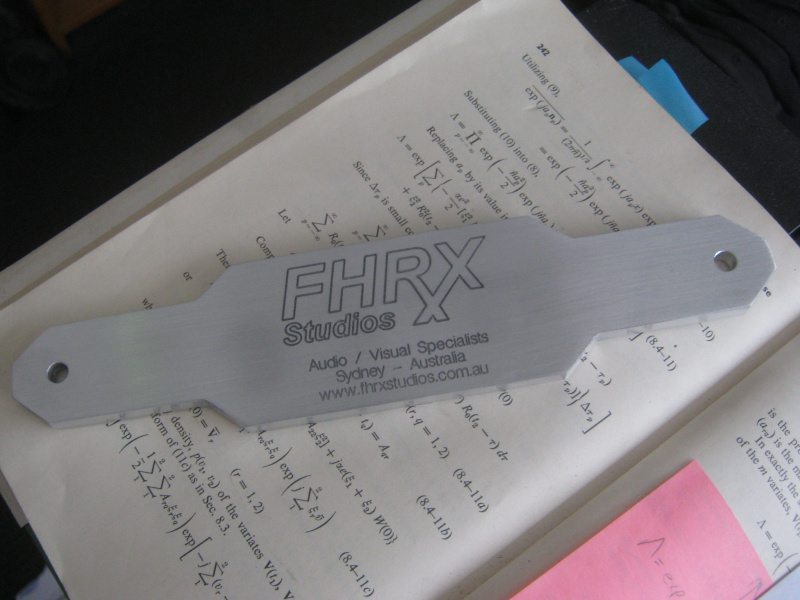 So having a musical background and therefore knowing a thing or two about professional sound studios; the name �Fhrx Studios� was born henceforth. For Marty felt it sounded far more professional then those aforementioned. The Acoustic Garage concept is basically a discussion, education and tuning session; on steroids. Whereby we first run through the mathematics and physics of sound in great depth, similar to what's taught within our seminars. From there we then set out to tailor your sound meticulously until it's just right dependant on your individual preferences. This has evolved over the years because a sizable portion of our workload, aside from the mandatory installation work of course; has focused specifically on system tuning. For not only do we employ digital sound processing in nearly every system we install here; we also tune said processors found within systems that're either self-installed by their owners, else installed by other stores. Both locally and interstate based. Rather than have customers sit around endlessly whilst we tune their system 'for' them, we instead tune the car 'with' them. In doing this it also affords us opportunity to learn things from customers too because reality and wisdom dictate that no one knows everything; us included. How it works is we bring the customer�s car in and park it before a line of chairs containing our numerous testers, auditioners and tuners. 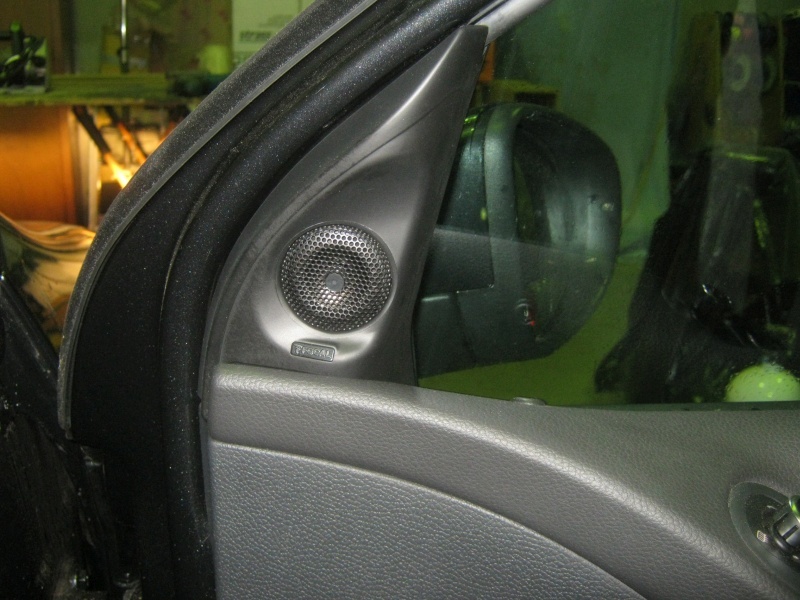 At this point the customer also takes a seat amongst us and over the ensuing hours we all not only chat incessantly about all things audio but also take turns listening, measuring, testing, tuning and throwing around recommendations and ideas pertaining to their car. 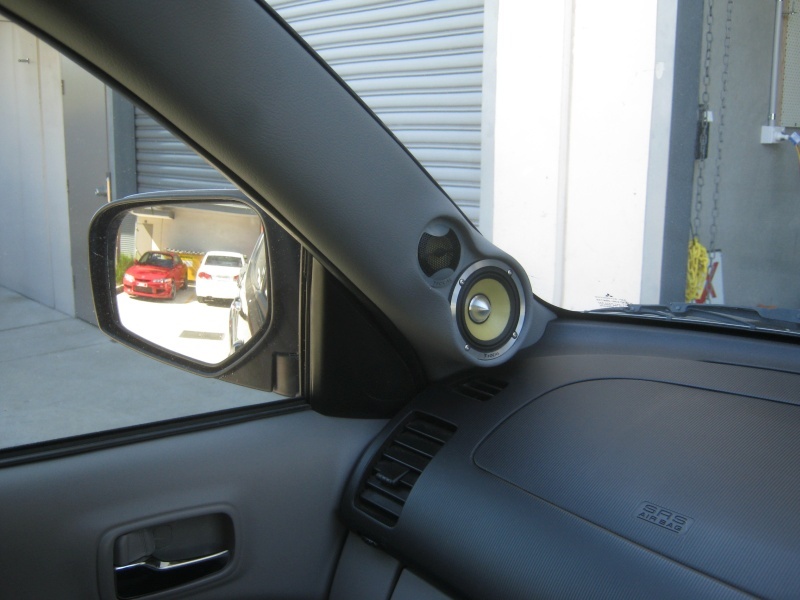 During this time the customer also has the opportunity to listen to our numerous demo cars too, in order to offer us their thoughts and feedback on each�s sound. This feedback also aids us in tailoring their sound perfectly for them. Overall we�ve found this tuning methodology to present a far more casual atmosphere for both us and the customer. Us because we're unapologetically slow and like to take our time getting the tune just right, and them because they get to chat, learn and have a real hands on approach with their own system tuning; exactly how tuning ought to be done. In no facet of real life will you find cheap and good together in the same sentence. 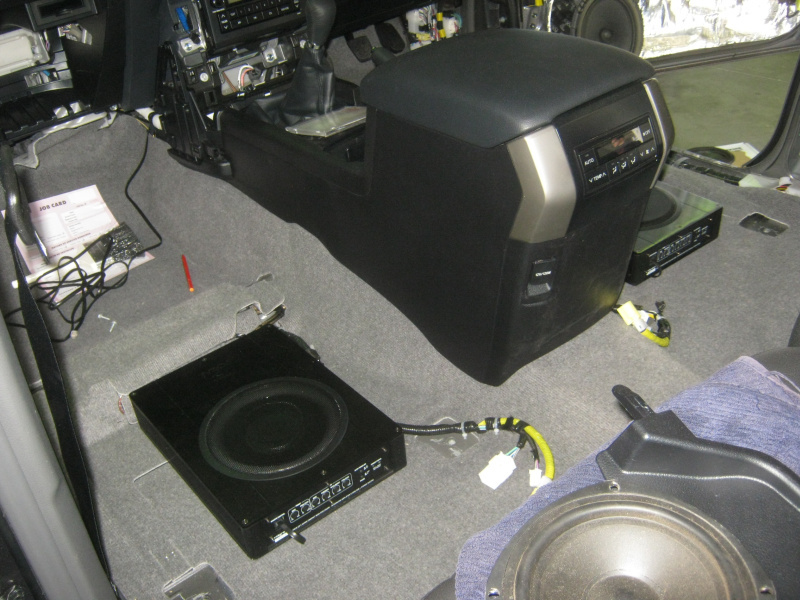 This fundamental law of nature doesn�t change for car audio. Hence there�s no $99 system, and not even a $199 system. This is a very vague guide. It is possible that your personal choices will differ significantly from those listed henceforth. These systems do not include labour or ancillaries costs. The more complex and intricate your system layout and physical install design becomes, the higher the costs tend to rise. These systems are sound quality oriented systems and therefore utilise a source unit, front speakers, subwoofer and amplifier(s). Systems often get much more intricate and can include a myriad of other items. Of course these are but a small sample selection, for there're literally hundreds of brands featuring thousands of audio visual products available. As aforementioned though; those listed above are just the ones that're currently performing best. This ideology is therefore conducive to these lists changing regularly; as superior components and combinations are released and thoroughly tested we'll update these lists. When asked how one can destroy speakers we reply by explaining there is only three real ways. The first is thermally and this is the most commonly occurring. Breaking the equation down further there are only two ways to thermally destroy a speaker (and crossover in the case of split systems); over powering and under powering. Over powering the speaker with way too much power will cause the voice coil wire (which is receiving more current through it than its rated too) to melt and short on the magnet. This is simple enough to understand so if you have a 200 watt subwoofer then you don't feed it 2000 watts. However much more dangerous is under powering the speaker because the end result will be the same but it happens in a slightly slower and sneakier way. In audio systems where you hear speakers 'distorting', it's not the speaker that is causing the struggle, it's the amplifier. Speakers are quite simple devices and don't discriminate. They cannot tell the difference between harmonic sound and rough distorted noise and simply reproduce whatever wave signal is given to them regardless of what it may sound like. When you ask the amplifier to do its job (by turning the volume up) it takes a comparatively small sound wave and amplifies it before sending this bigger signal to the speakers. If you ask your amplifier to produce more than it's capable of it will attempt to achieve this request but the output sound wave becomes rough and distorted as the amplifier reaches its power output threshold. Pushing it beyond this point causes the amplifier to begin clipping. When a woofer is driven hard by a high power amplifier there is a significant amount of current flowing through the voice coil. 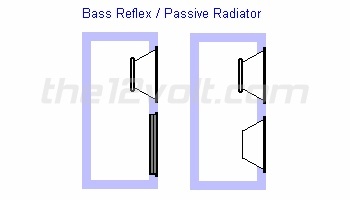 The voice coil has resistance and therefore a voltage drop across it occurs. This means that there may be a great amount of power being dissipated in the form of heat within the voice coil. 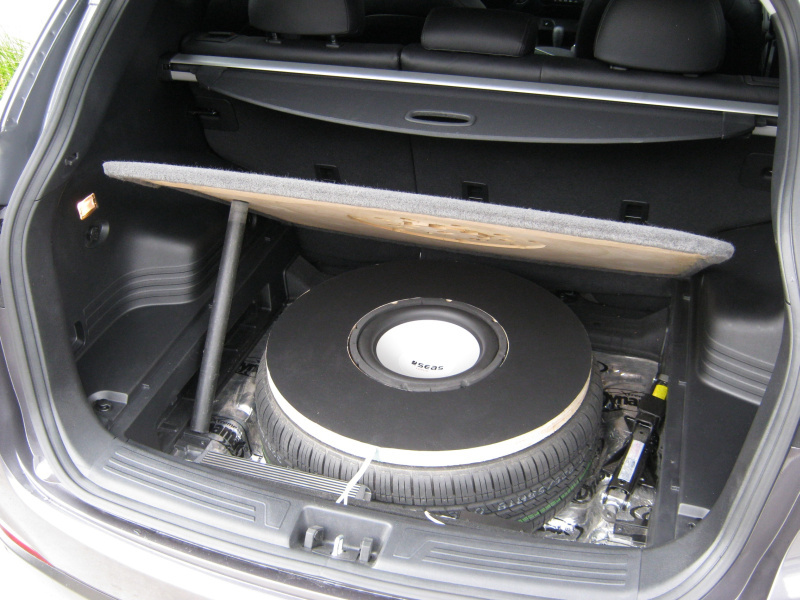 When a speaker is driven with clean power the cone moves back and forth a great deal. 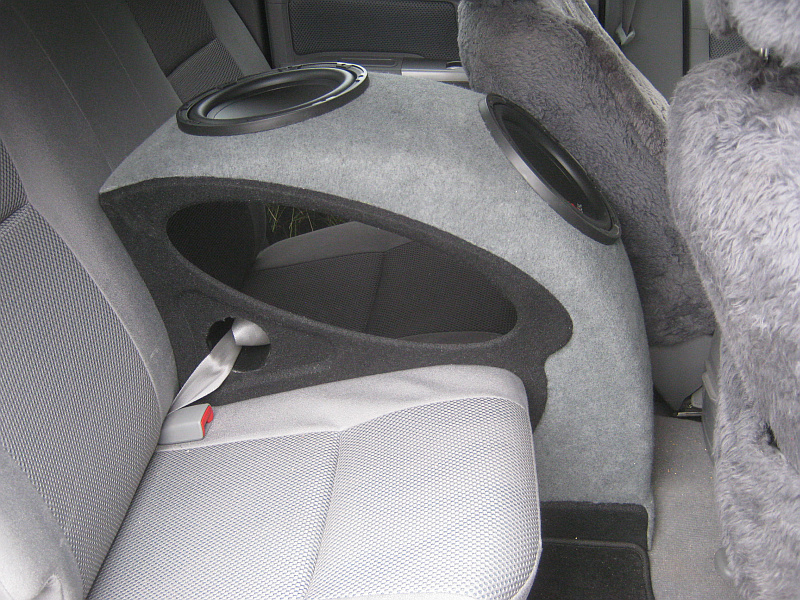 You'll notice many speakers have perimeter vents in the basket and pole vents in the back. The speakers movement forces air to flow in through these perimeter vents and into the magnetic gap (the area where the voice coil lives and moves) before flowing out the pole vent (and hopefully taking the heat with it). 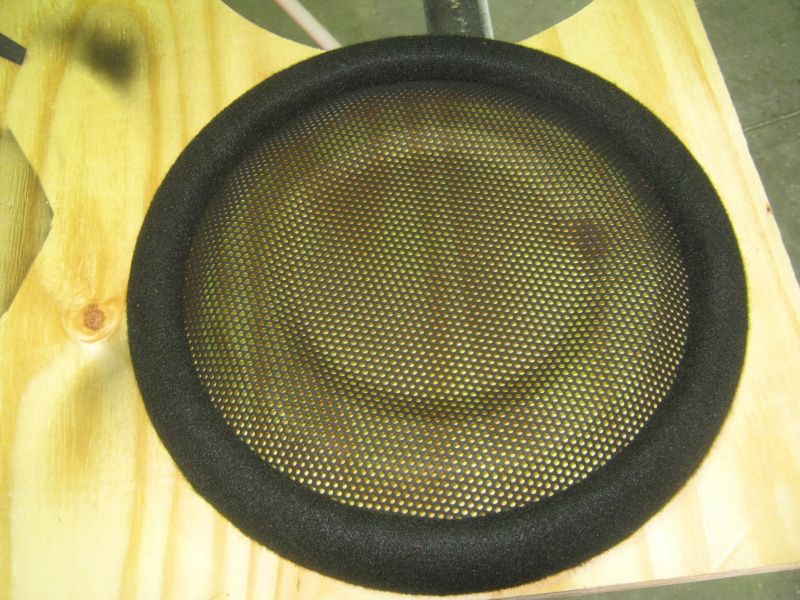 When the cone moves forward out of the basket, the area that's under the dust cap and around the voice coil increases in volume. 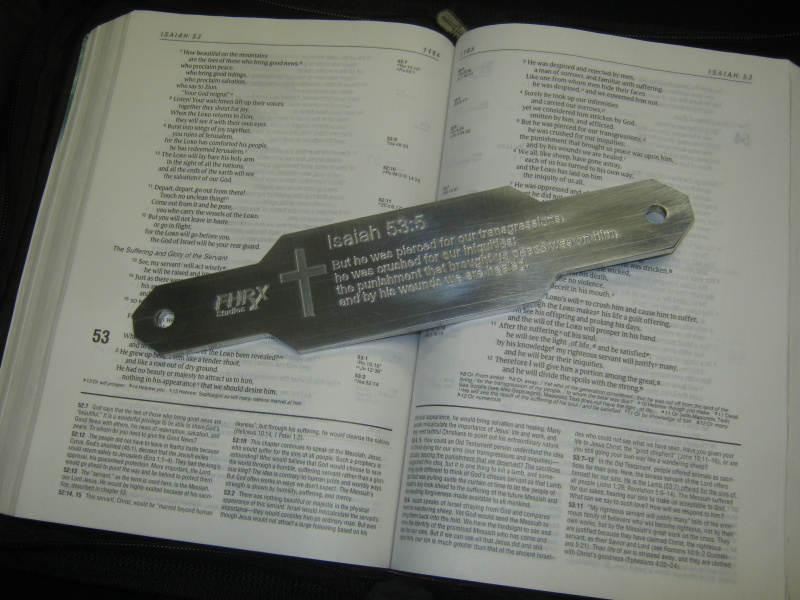 This pulls cool air into the magnetic gap. 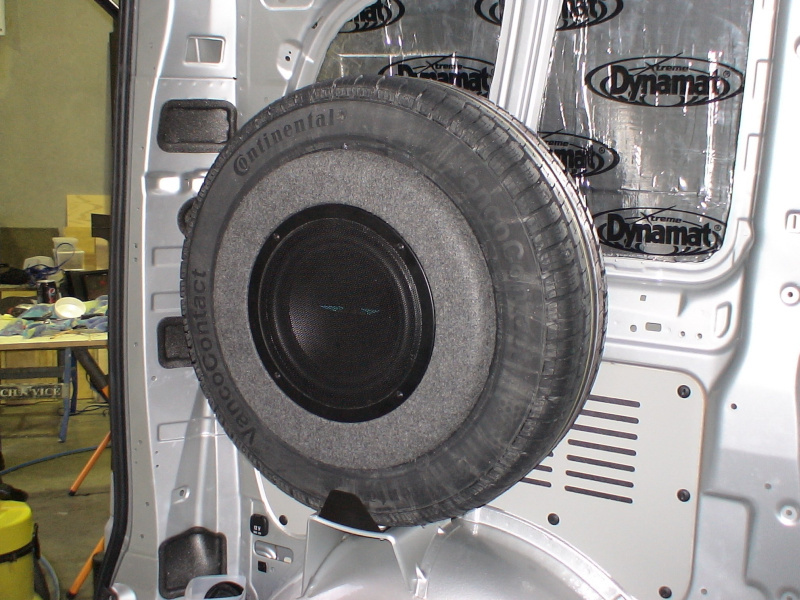 When the woofer moves the other direction, the chamber size is reduced and the hot air is forced out of the pole vent. This air flow cools the voice coil. When a relatively low powered amplifier is driven into clipping (to the point of full square wave sometimes) the voltage delivered to the voice coil no longer resembles a sine wave because the amplifier clips the top and bottom of the wave off (because it's beyond what it can do). While this output is clipped (the flat spot on the top of the wave) the voice coil in your speaker is not moving but instead remains almost stationary at this time with high current still running through it. Because the voice coil is not moving it is not being cooled sufficiently (remember the coil is driven by a linear motor therefore the more voltage applied to the voice coil, the further it moves). In the image above you see that at points A, B, D, E, F and H the voltage is changing causing the voice coil to move in the gap and therefore pull in fresh cool air. At points C and G, the voice coil is still moving a little but this is only due to momentum. This is not enough to cool efficiently and there is still full current flowing through the voice coil. Since the displacement of the voice coil (and the relating airflow around it) is no longer proportional to the heat being generated, the voice coil will overheat. This excess heat (just as with overpowering) causes the voice coil to melt its insulation and the former to physically distort. Basically the whole motor burns apart as adhesives start to fail. However before you stress too much it should be noted that many reputable manufacturers underrate speakers so generally slight clipping isn't a problem. 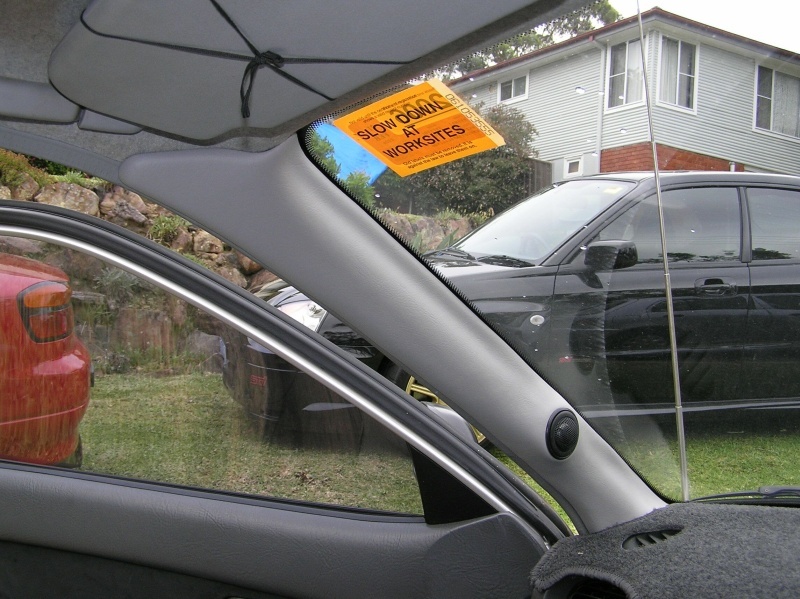 Severe clipping is more likely to cause a problem. 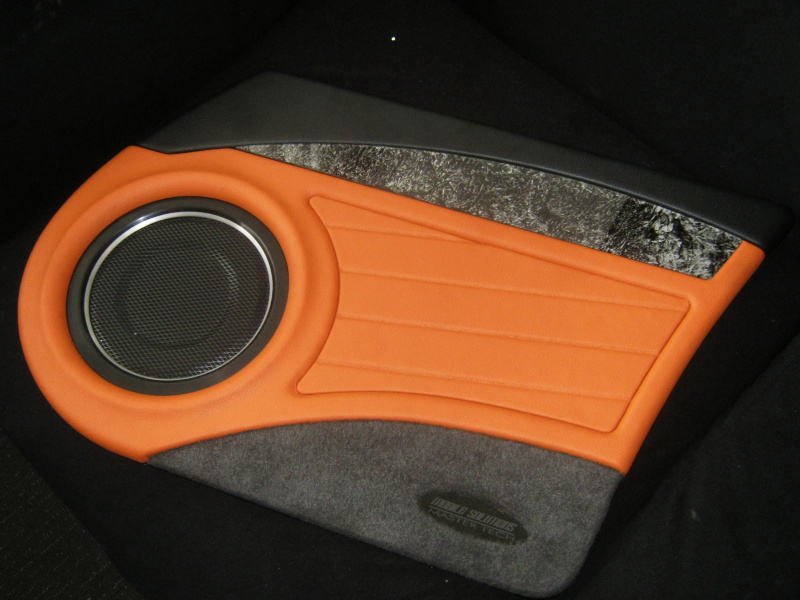 The second way to destroy a speaker is physically and this can also be broken down into two facets. The first physical facet is what we call bell mouthing. 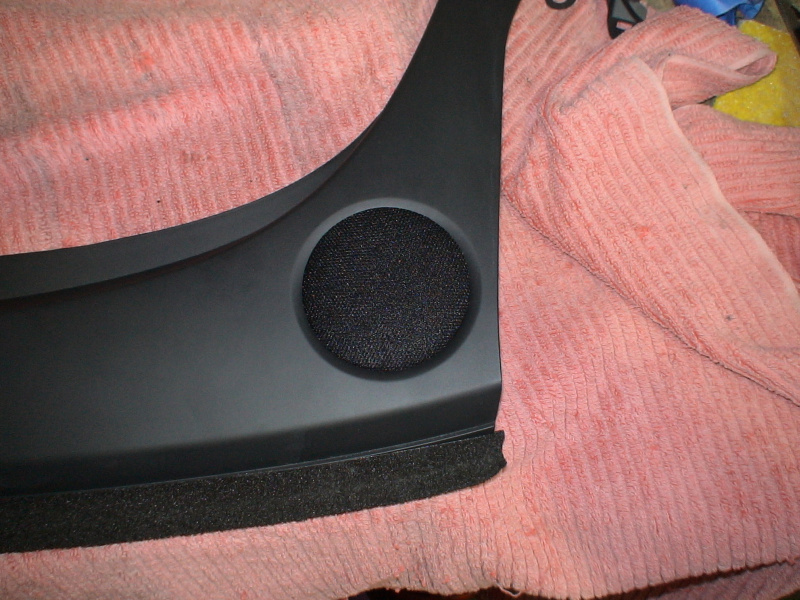 This is where the voice coil and former are driven so hard they actually extend beyond their normal range of motion and impact the back plate on the bottom of the speaker. This continual impacting causes the bottom of the voice coil to bend out like the bottom of a bell and this eventually cause the coil and corner to become so physically disfigured that it rubs on the magnet surrounding it and eventually comes to a complete halt. 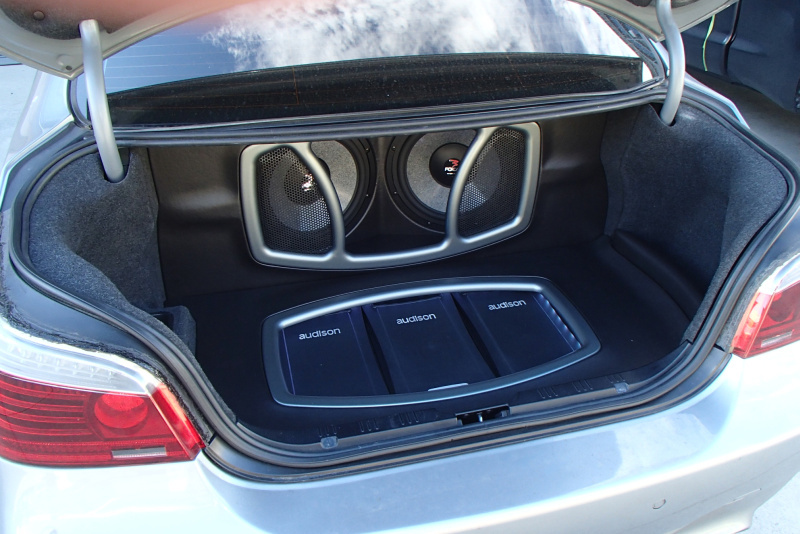 This isn't just restricted to subwoofers either. Tweeters playing frequencies that are too low tend to suffer from this phenomenon too because they're not designed for high excursion. The second facet of physically destroying a speaker is to punch way too much power into it fast and this causes what us engineering types like to call critical structure failure. That is a technical way of saying you'll simply tear the surround and/or spider(s) and pop the cone and motor assembly right off the frame. To 'blow the guts out of the speaker' is the more Aussie way of saying it. This is commonly witnessed during sound pressure level competition because the drivers are being pushed to their absolute limits. The third and final way to destroy a speaker is an age old enemy of technology; sunlight. 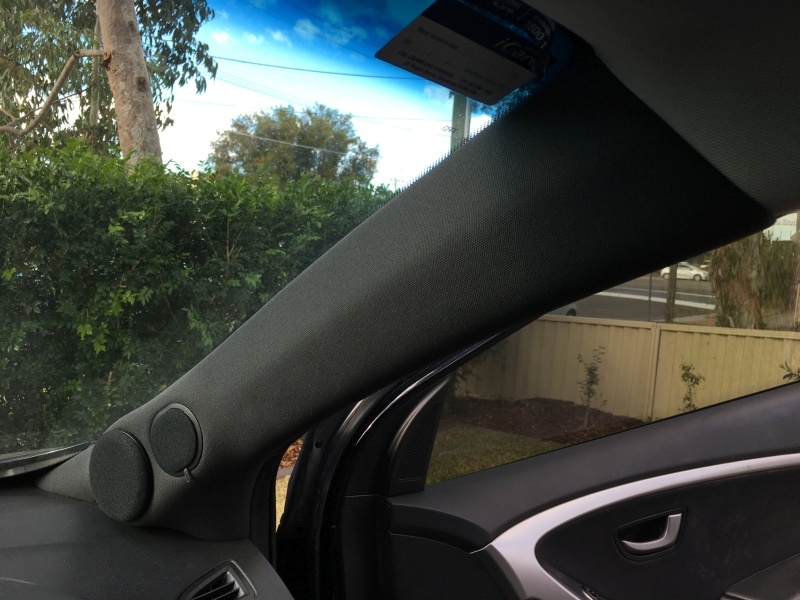 Nothing breaks down and erodes foam surrounds faster than sunlight (well except bugs like moths but you shouldn't have them living in your car). 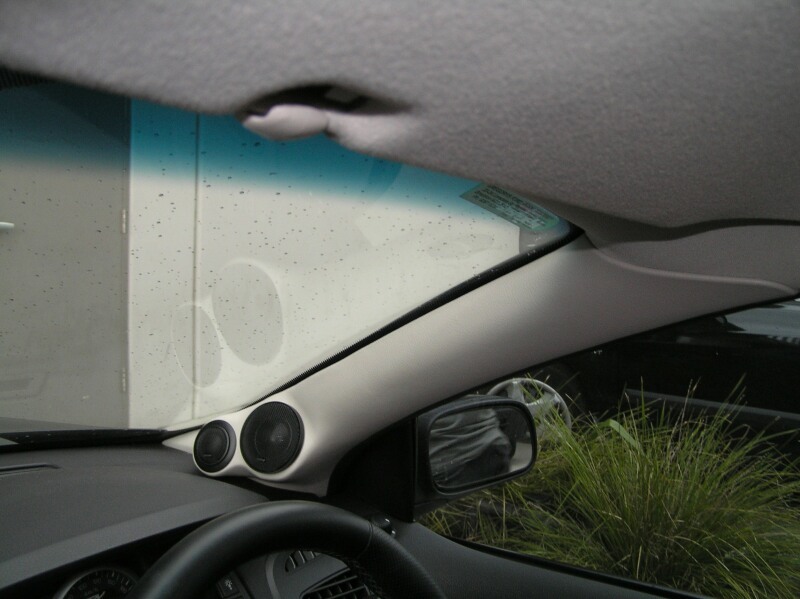 After only a few months of direct sunlight your speaker surrounds will be significantly weakened and may eventually begin cracking or simply tear all together. 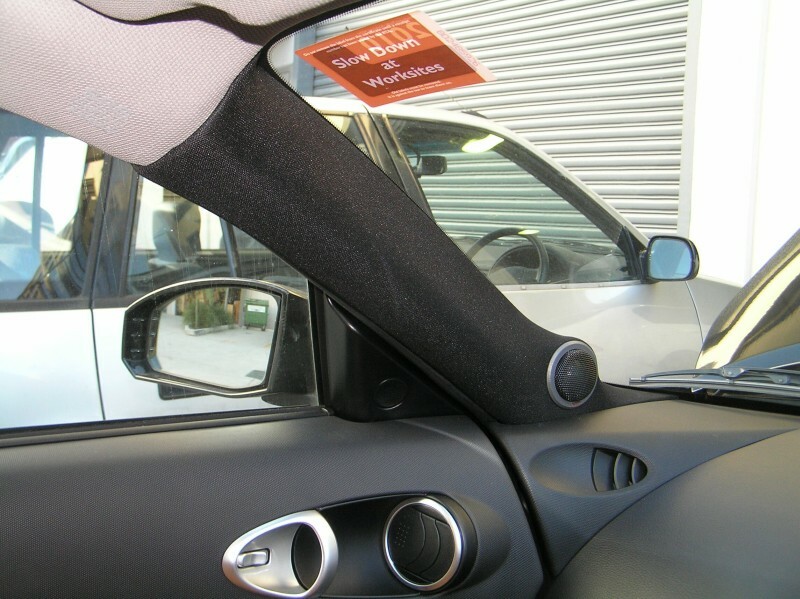 Butyl rubber surrounds are more resistant to sunlight but eventually all materials succumb to the mighty sun. 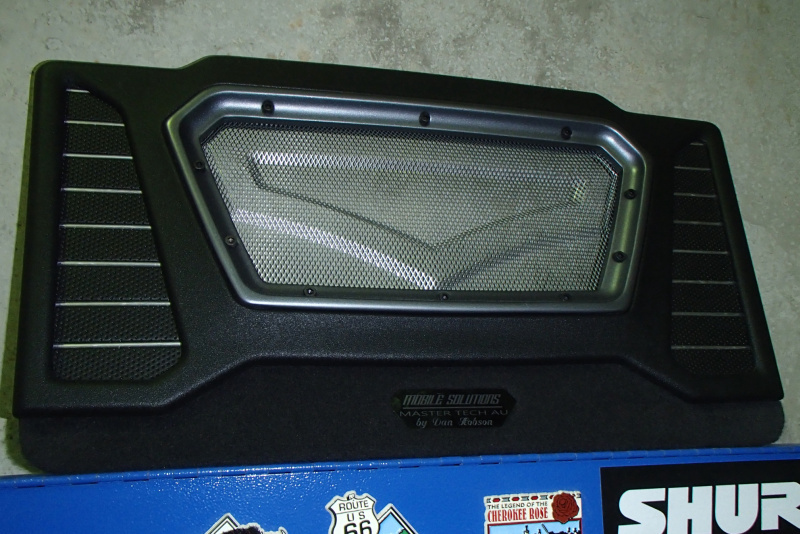 The best thing to do with shelf speakers is place some grille cloth over the factory grilles. 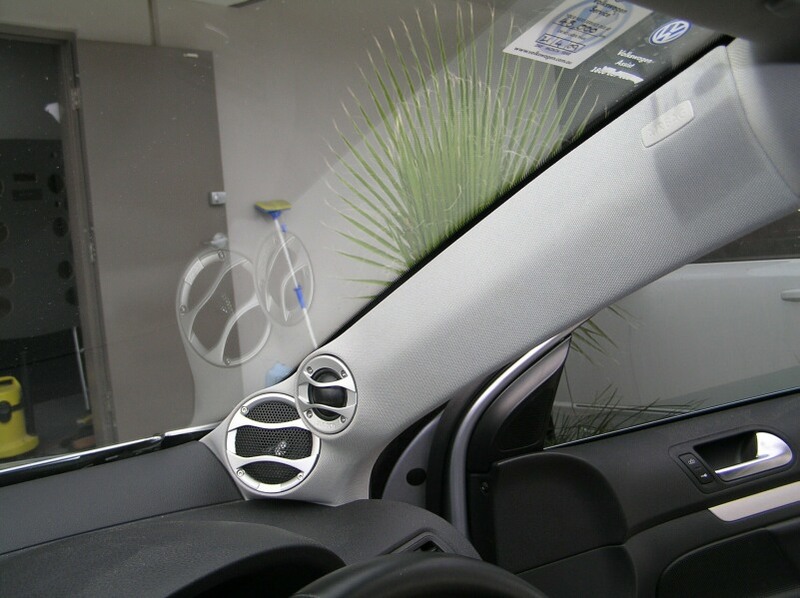 This helps in resisting ultra-violet rays from the sun penetrating through to the speaker. These are the three main causes of most damaged speakers. 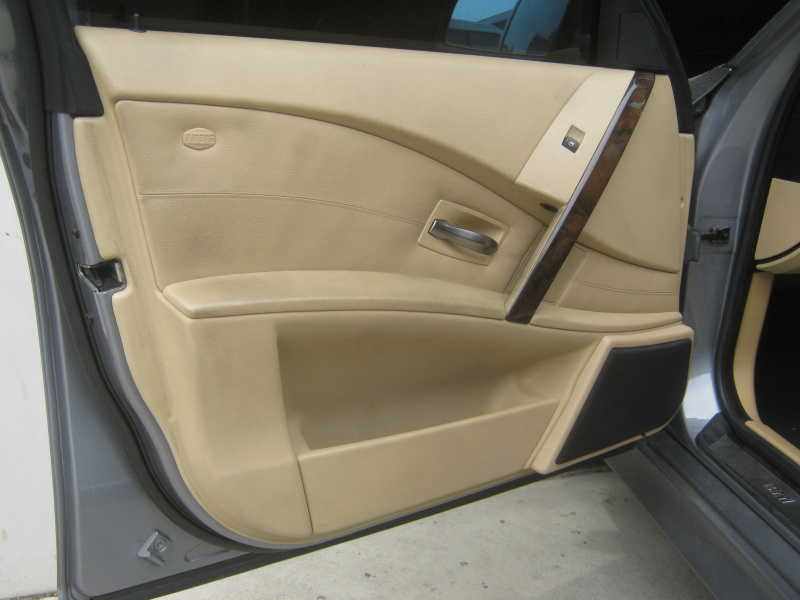 The end result is the same with all three methods but you tend to get a lot more warning with thermal or sunlight damage. 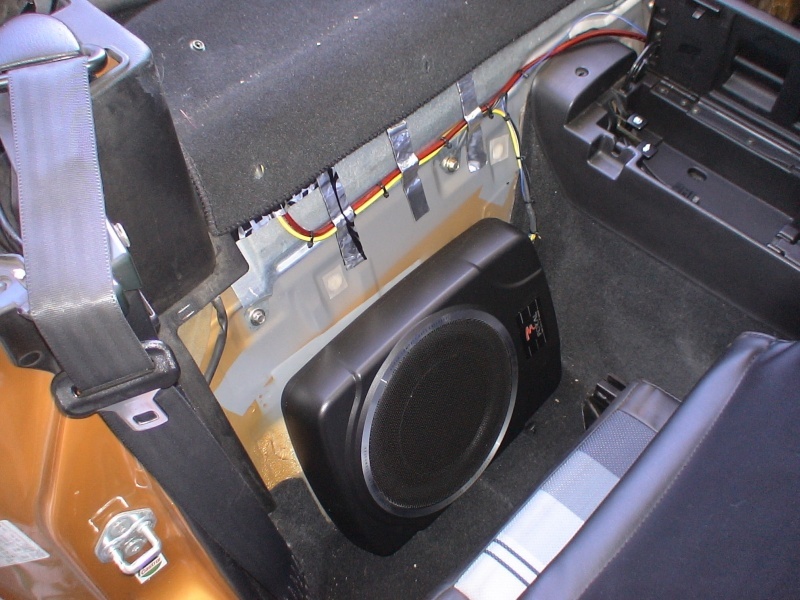 Physically speaking though; if you're pushing your speaker way beyond what its rating dictates you'll get very little warning before your speakers starts to smoke or literally explodes. Now that you know about clipping (see above) we move to severe clipping (a.k.a square wave). It always amazes me when I hear some idiot driving down the road and the audio is clearly distorted (you know what I mean). 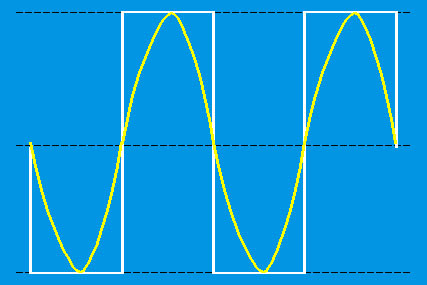 Many people drive their amplifiers into what could be called a square wave output (white line below). When an amplifier is pushed that hard, it is actually possible to drive the speaker with twice as much power as the amplifier can cleanly produce into the speaker. As you can see below, the yellow sine wave is the maximum 'clean' output that the amp can produce. When an amplifier is pushed way too hard, the signal will eventually look like the white line. The effective voltage of the white line is ~1.414 x the yellow line. This means the total power driven into the speaker by the clipped (square wave) signal is double the power delivered by the 'clean' signal (yellow line). This means that the power is double but the cooling of the voice coil will not increase in proportion with the power increase (since the voice coil isn't moving as much as it needs to be for the given power dissipation). This will lead to the voice coil overheating. If we compared the output of a 100 watt amp (the one that's clipping) to a 200 watt amp, the 200 watt amplifier would be able to push the speaker as much as 40% farther than the 100 watt amp (depending on the frequency of the signal). This extra travel (in each direction from its point of rest) would result in added airflow around the voice coil. Note: The RMS voltage of a pure sine wave is equal to the peak voltage multiplied by 0.707. The RMS voltage of a pure square wave it equal to the peak voltage. For 2 waveforms with equal amplitude (as shown above), the RMS voltage of the square wave is 1.414 times the voltage of the sine wave. If we use the example of the 100 watt amp which can produce a sine wave of 20 volts RMS, we can see that the output power at hard clipping is double the power it can produce cleanly. Well, to get a little more complicated, distortion is any departure from a true and accurate reproduction of the original waveform. It can include Noise, Clipping Distortion, Harmonic, and Intermodulation Distortion. These last two forms are fairly common in loudspeaker reproduction and can be reduced but not entirely eliminated in the existing technology. It would be fair to say that modern amplifier design fairly eliminates nearly all forms of inherent perceived distortion, leaving only that caused by inappropriate user settings and overloading. Distortion is the name given to anything that alters a pure input signal in any way other than changing its size. The most common forms of distortion are unwanted components or artifacts added to the original signal, including random and hum-related noise. Distortion measures a system's linearity - or nonlinearity. Anything unwanted added to the input signal changes its shape (skews, flattens, spikes, alters symmetry or asymmetry). A spectral analysis of the output shows these unwanted components. If a circuit is perfect, it does not add distortion of any kind. The spectrum of the output shows only the original signal - nothing else - no added components, no added noise - nothing but the original signal. It's rather amusing to see amplifier manufacturers making great claims about the advantage of the extra .001 % Distortion they've wrung out of their products, while most speakers are considered very good if they can keep such distortions below 5 %. It's true that the reduction of any distortion anywhere is a positive contribution to the goal of high fidelity, but the disparity between the two technologies in this regard points up the largely subjective nature of many such claimed advantages. Noise is perceived sounds not in the original soundtrack. Such things as hiss, crackle, pops, hum, and buzz, are typical of the types of extraneous signals described as noise. Inherent noise in the electronic processing in any system is measured in decibels relative to the amplitude of the original signal. Sounds perceived as noise are heard in contrast to the sound that is the object of attention. Thus, a noise signal measured at 15dB below the output of Tchaikovski's 1812 Overture finale would probably not even be heard; while a slight hiss at 55dB below the level of a soft piano passage would be annoyingly obvious. 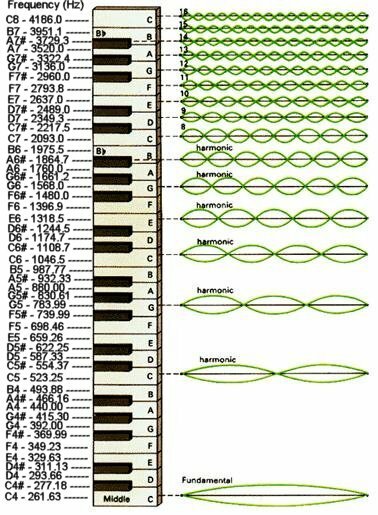 Harmonic distortion is a type of distortion in which resonance or sympathetic ringing vibrations are added to the original sound to produce second and third harmonics of a fundamental tone in a way that was not present in the original signal. 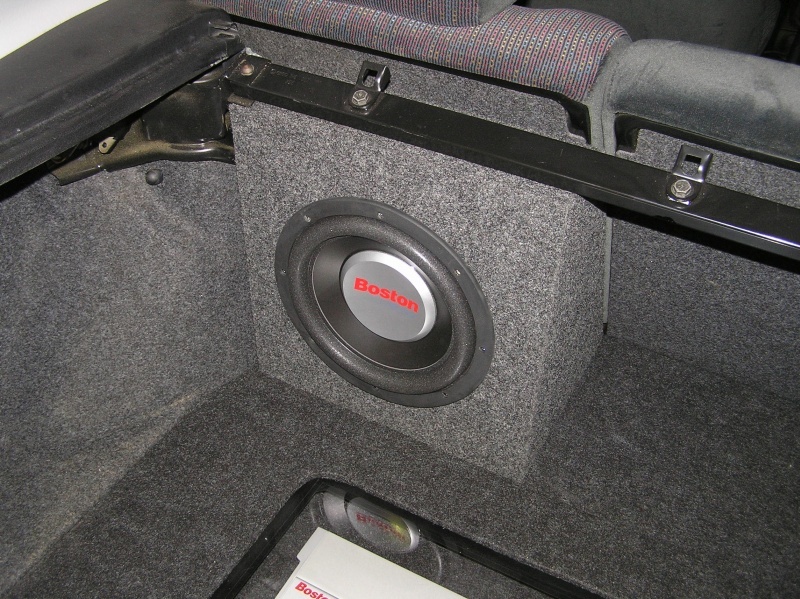 Choosing good drivers and a well-made enclosure design is essential in overcoming this tendency in speakers. Last but not least is intermodulation distortion. This is the distortion that results when one set of frequencies is superimposed on, or is modified by, another to produce a third frequency not present in the original signal. Quantifies the distortion products of nonlinearities in the unit under test that causes complex waves to produce beat frequencies, i.e., sum and difference products not harmonically related to the fundamentals. When talking speaker power ratings you need to exercise a little caution because whilst they hold significant meaning to us speaker designers, to you the end user these ratings can often border on being useless. Here�s why. 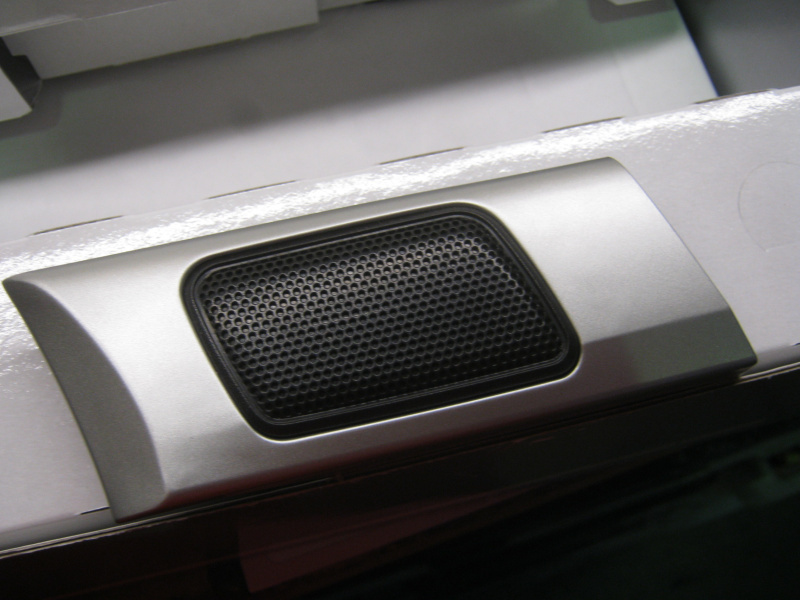 Speakers possess two primary power ratings; continuous and maximum. The trouble is neither of these have much to do with music, but actually pertain to the thermal and physical limitations of the speaker's motor structure. 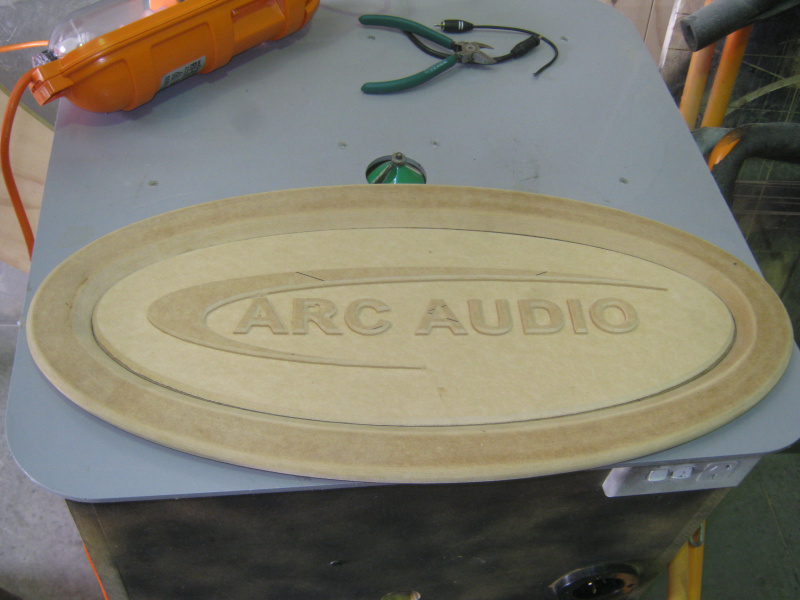 The continuous or root mean squared (RMS) power rating relates to the thermal attributes of the speaker. Remember the speaker's motor structure reciprocates continuously. With each cycle it draws cool air in through various perimeter vents. From here it snakes this cool zephyr over the outer and then inner surface of the motor before expelling it out the central pole vent. 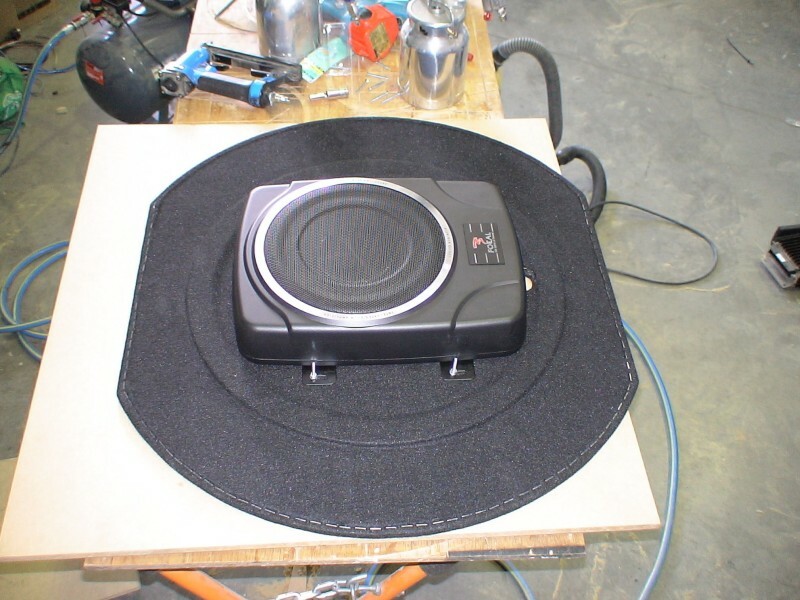 Power continuous is simply how much current you can flow through the voice coil before it can no longer get sufficient air into and out of said vents to adequately cool itself, thus resulting in the speaker cooking. 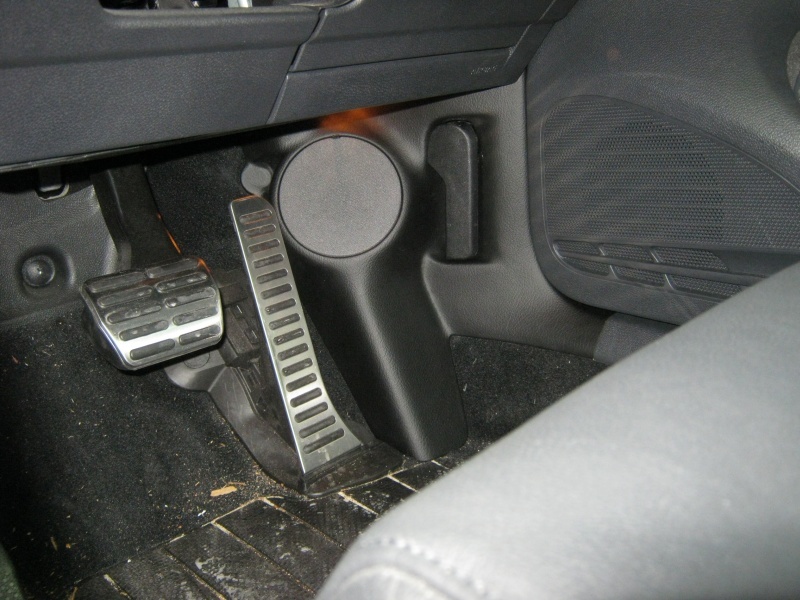 Maximum power on the other hand is related to the physical limits of the suspension. The suspension is comprised of two primary parts; the surround encircling the top edge of the cone and the spider below that extends from the frame to the former top cap. Maximum is how much power you can pump into that speaker before these begin failing, resulting in a bottom out on the downward (negative) stroke or tearing the driver apart on the upward (positive) stroke. So how much power then? It's important to remember that music is a constantly changing sinusoidal waveform. Think of your engine for a moment; it idles on 1000rpm and redlines on 8000rpm. How often do you sit on either when cruising around the streets? Music is the same, in that it�s constantly going up and down in amplitude. So unless you�re playing sine waves full blast ala SPL competition; neither continuous nor maximum are overly meaningful for you. 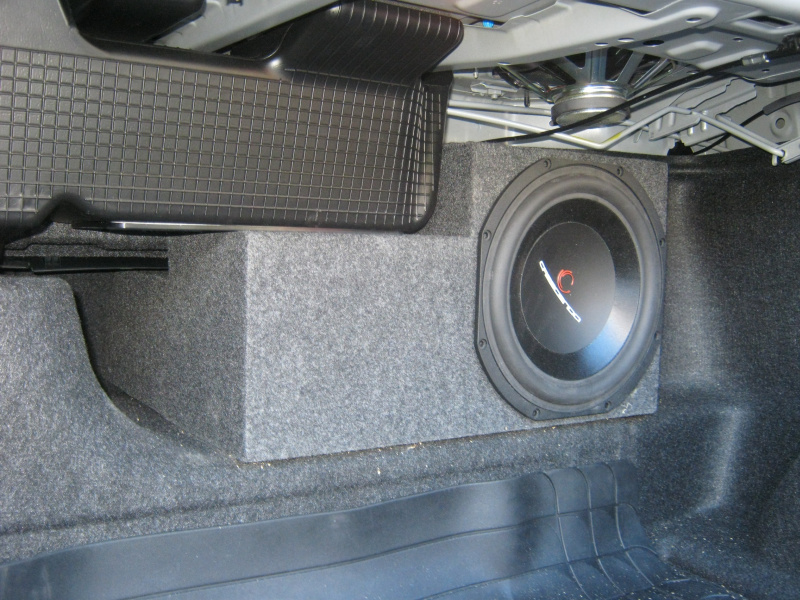 Just because a speaker requires 1000 watts to move doesn't mean it's loud. It could possess a very heavy motor structure or very stiff suspension. Open cut mining trucks possess around 7000hp but you'd hardly call them fast and nimble. The opposite can also be said, in that just because a speaker only requires 35 watts doesn't mean it's quiet; it may have suspension that's extremely soft and nimble. Continuing the aforesaid horsepower analogy you'll find a Hayabusa only has 250hp; yet it's far from slow or sluggish. Smaller power requirements could also be conducive to the motor possessing advance lightweight materials too; such as Kapton rather than alloys and neodymium instead of strontium just to name a couple. Again, this doesn't mean its feeble. You can lift the front end of a top fuel dragster off the ground with your bare hands; that doesn't mean it's got a weak chassis. Or to cite a more dramatic example; a sizeable portion of a Boeing 787 or Airbus A350 wing is synthetic fibre, whereas a standard car chassis is mild steel. Which do you suspect is the stronger? And so on. Naturally power rating talk inevitably lends itself to the follow on question "what size amplifier should I get?" As you can see above any speaker will run off as little as one watt. Therefore the answer will depend on how loud you wish to play your music. The key though is to remember that the less an amplifier has to work the cooler and more efficiently it runs and the less it struggles acoustically. This in turn equates to far superior sound quality output. So the short answer is that you get the largest and cleanest amplifier you can afford and then turn the gains right down to match your speakers. What you do NOT do is buy a small amplifier and strangle it to death by raising its gains through the roof. Lest you risk running it beyond distortion and into clipping. See above for explanations on clipping. When it comes to speakers; understand that midranges are not designed to play subsonic frequencies whereas tweeters cannot even play midrange frequencies - lest they die a horrible death from over excursion (where the voice coil begins bottoming out). Therefore you should cross your speakers over at an acceptable frequency wherein they're capable of playing loudly but with minimal risk to their wellbeing. When building both high-pass and low-pass crossovers the technique is the same but the components change places. 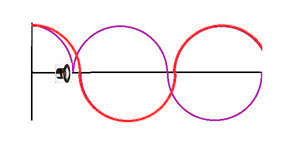 Simple 1st order (6dB) crossovers are created by using a single capacitor or coil in the positive wire of your speaker connection like this. If you want 2nd order (12dB) slopes then you'll need one component in the positive wire and the other bridged across the two speaker wires like this. 3rd order (18dB) and steeper slopes can also be achieved by wiring in a network of capacitors and coils like this. 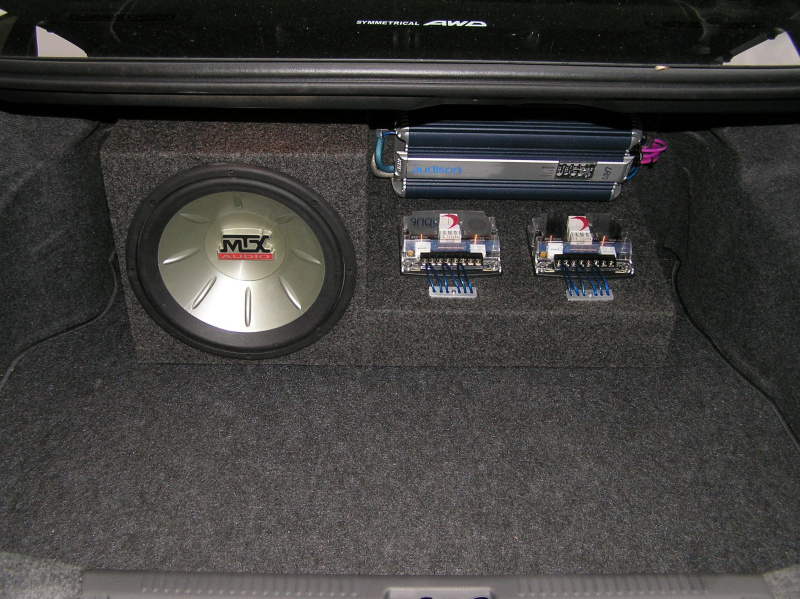 If you wish create more complex crossovers that incorporate such elements as phase control, shunts, attenuation and the like; you might want to consult your local car audio store as crossovers can become quite complex. The answer to this question depends on factors such as how loud you like to listen, what speakers you're using and what your budget is. Remember we always say that the bigger the amplifier the better because the larger the amplifier, the less work it must perform to successfully drive the speakers. 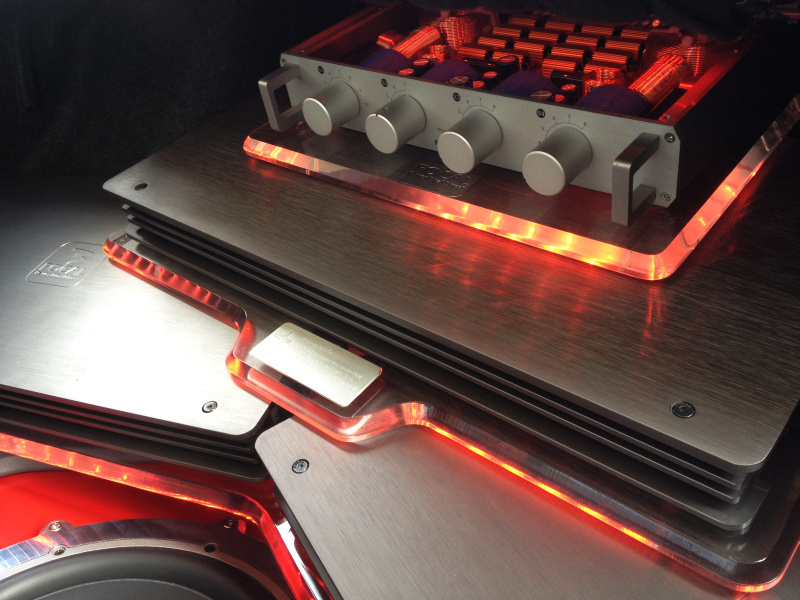 Larger amps keep their THD low, their efficiency and control level high and they stay cooler. It's better to have a larger amplifier doing minimal work than to wring the neck out of your smaller one. 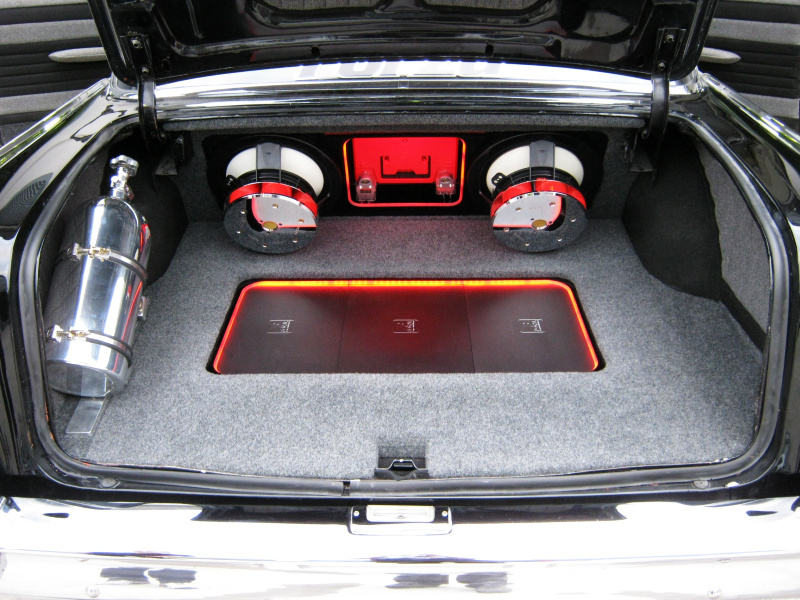 Remember though that too much power can also damage speakers so the gains MUST be set correctly. 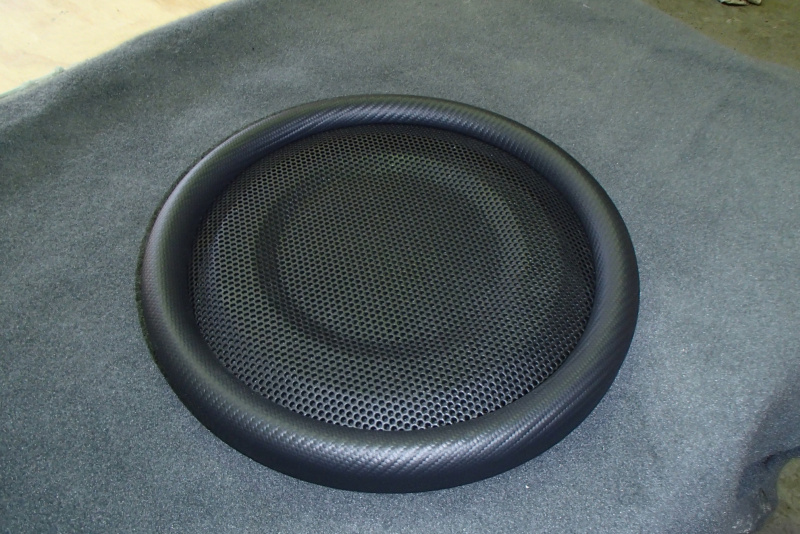 So, theoretically, the SPL limit of this speaker would be somewhere between 107dB and 110dB. There are literally thousands of amplifiers to choose from out there. This is where an installers experience comes in handy. Serious installers will listen to your demands and then recommend an amplifier that best suits your desires. Beware of "bargain" amps though as cheap amplifiers are exactly that and you'll often have problems not too long down the track. Too much power for too little money generally means that corners have been cut somewhere in quality of construction or service back-up. Aim for about $2-$3 per watt for quality. 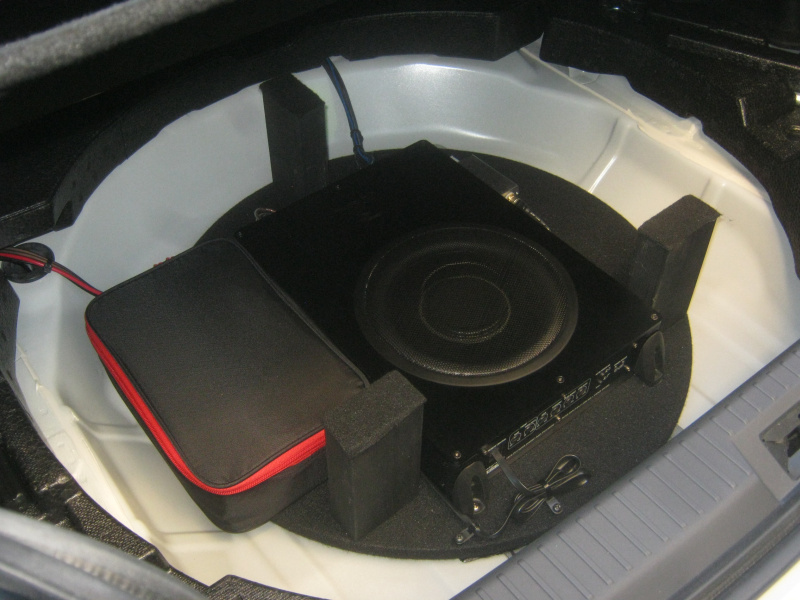 Inspecting the manual included with your new subwoofer will reveal recommended enclosure types and volumes. 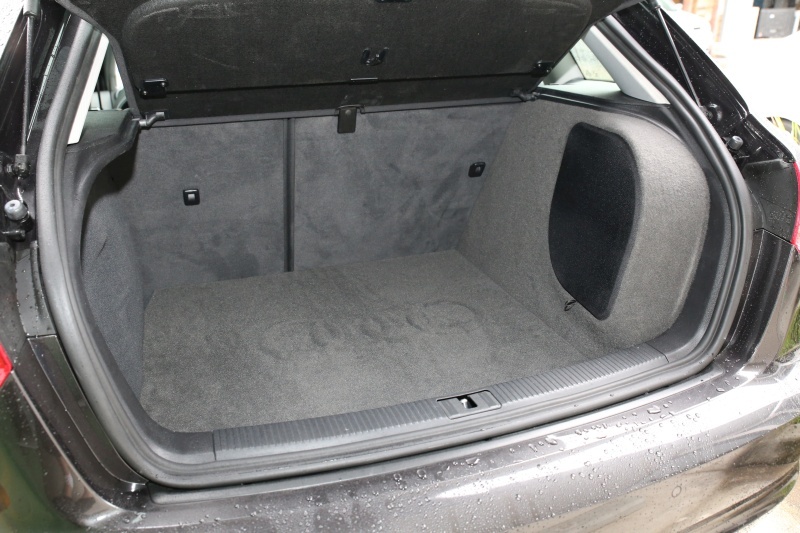 However the manufacturer cannot possibly know what type of car you own, let alone what volume or order it's interior is. Therefore these suggestions are exactly that; mere suggestions, and they often feature a safely buffer as well. Whereby the manufacturer deliberately understates sealed enclosure volumes because it equates to higher compression, which is conducive to fewer bottom outs and ultimately less warranty returns. 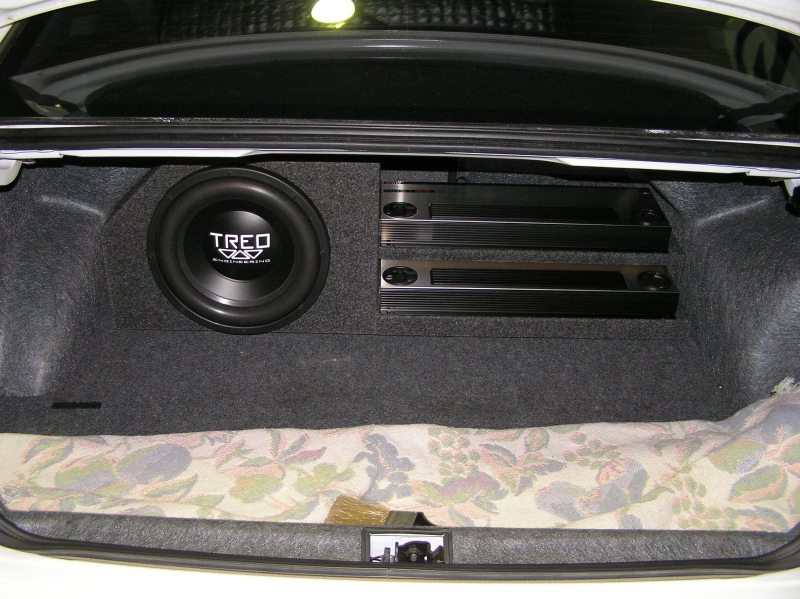 Ergo because manufacturers cannot accurately select an enclosure, many also include the subwoofers' Thiele / Small parameters. Specialised installers take these specifications, and utilising powerful modelling and simulation software design an enclosure to perfectly suit your application. Now make no mistake; even working with these fundamentals can soon result in a virtual minefield, as the laws of physics have a nasty habit of making simple things very complex. Then throw into the mix isobaric loading, whereby the subwoofers are coupled together in pairs to work together; you can get some absolutely amazing looking enclosures. However before we get too carried away let's canvas the fundamentals design types. 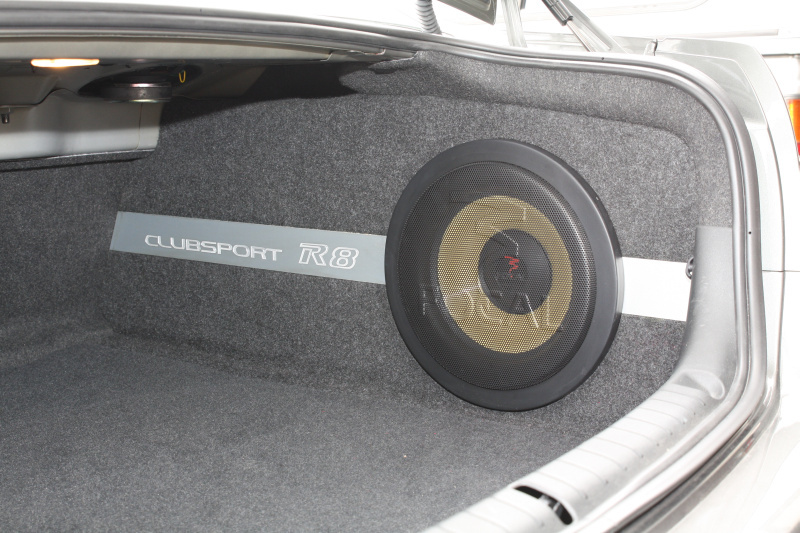 Within a sealed enclosure there's a direct relationship between the characteristics of the subwoofer and enclosure volume, the later intrinsically dictating how good the subwoofer will sound. This is called QTC and is explained in another FAQ below (q.v.). 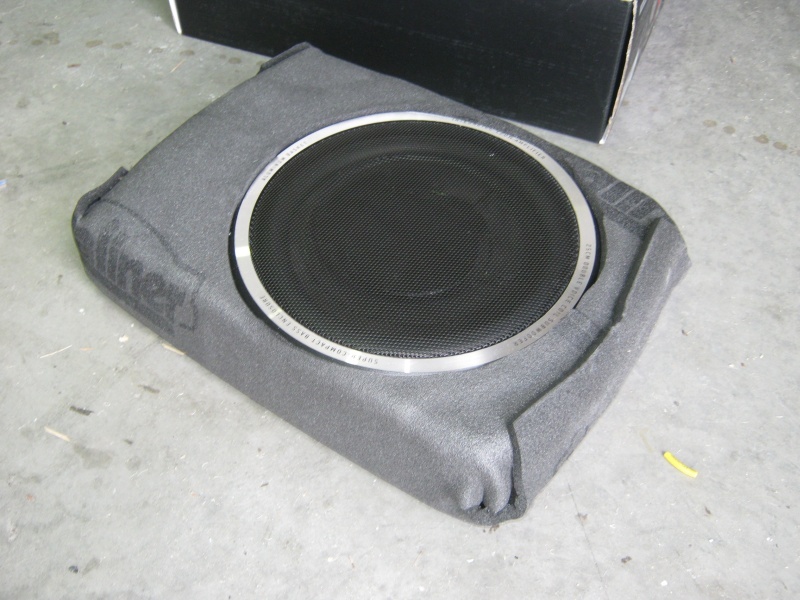 Larger volumes' air spring results in the less physical cone impedance, thus allowing the subwoofer to play lower and with flatter overall response (lower Qtc); although at the expense of power handling. If you design you're enclosure too large you'll soon compromise efficiency in order to gain the additional low frequency extension. On the other hand; making the enclosure smaller will cause the air spring to exert more control, limiting cone motion at low frequencies which increases power handling but does not let the system play as low (higher Qtc). 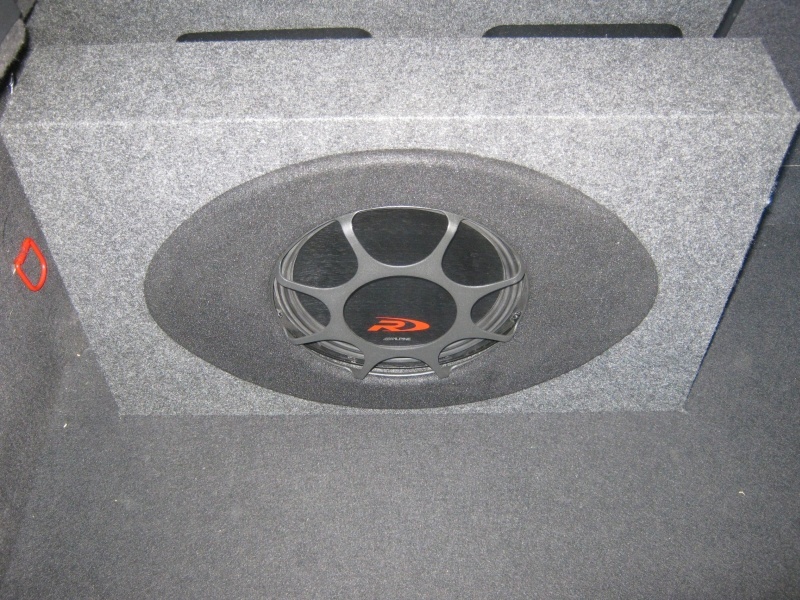 The main reason we use sealed enclosure for sound quality applications is actually nothing to do with sound quality but group delay, or how long the subwoofer takes to fire upon receiving it's electrical signal. 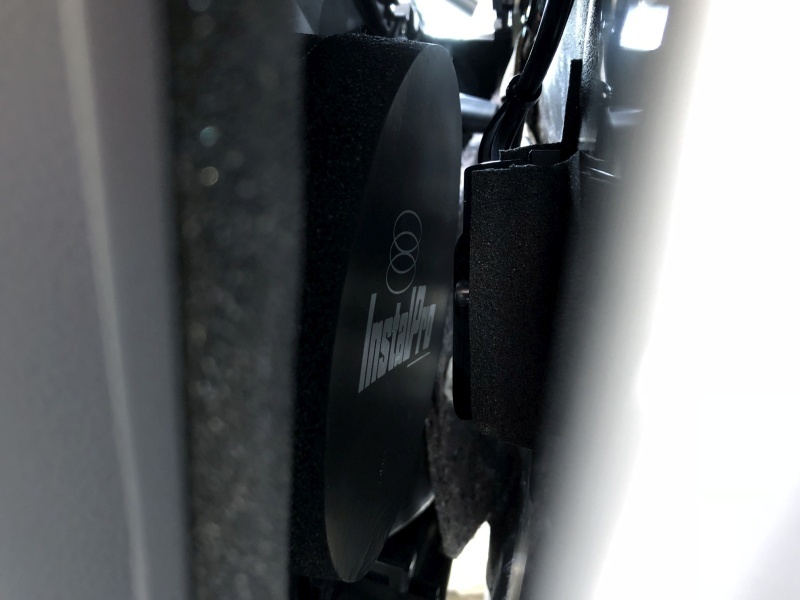 Remembering that in SQ systems we're attempting to get all our sound in front of us, a sealed enclosure provides a near constant group delay which allows you to time align your sound so the subbass appears to emanate from the front of the car no matter what frequency you're playing. Ported on the other hand is where you tune the design to a certain frequency to achieve better bass response around that frequency. 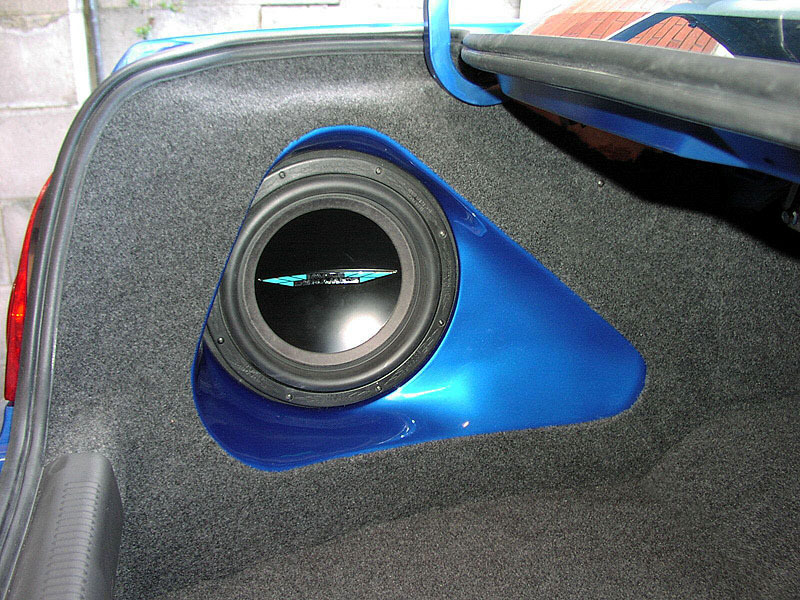 The tuning of the port must be done using careful calculations because via the employment of a port we delay the rear output wave just enough so that when it emanates from the port it's in phase with the wave being produced by the front of the subwoofer. 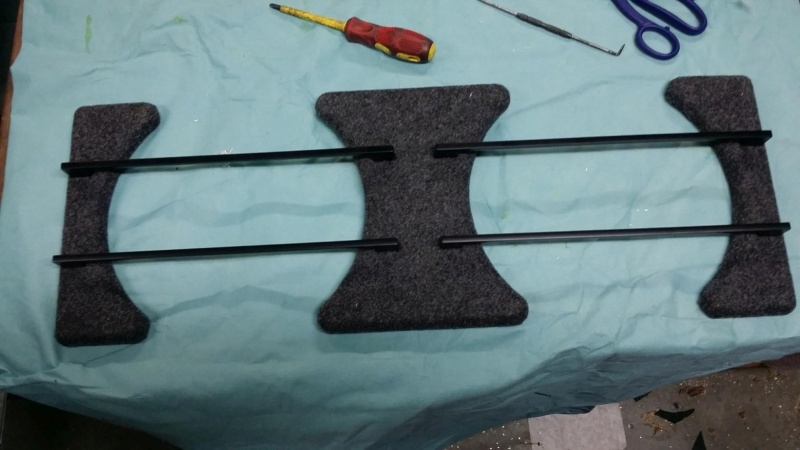 By altering the port length we tune it to certain frequency. 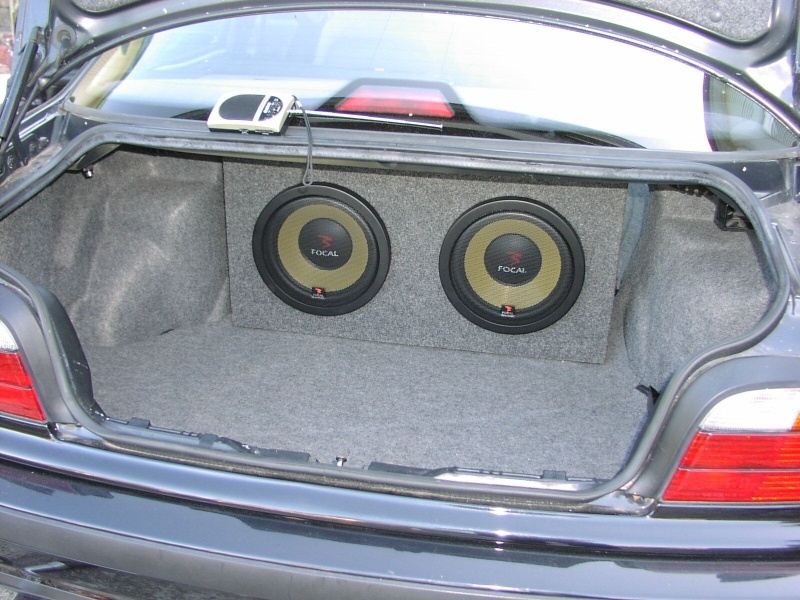 The reason ported enclosures are generally considered louder is that you theoretically get double the bass, or 3dB over; over the port tune frequencies along with a broad band around it. However ported is not without problems. 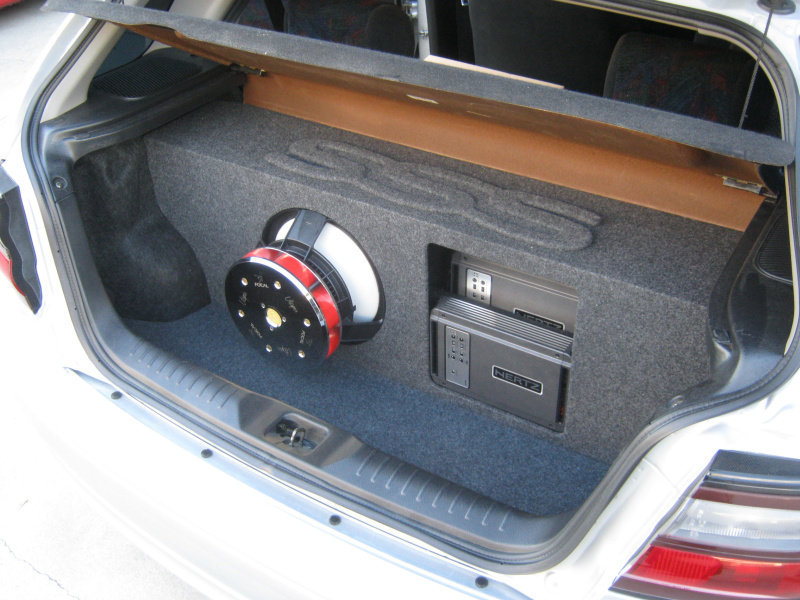 The main one of course is that you can unload the subwoofer below the port frequency which is conducive to bottoming out. The other issue relates to group delay when used in SQ systems. The group delay becomes a bell curve, rising significantly as you approach the port frequency. This often makes it very hard to get your entire subbass spectrum sounding like it's at the front. 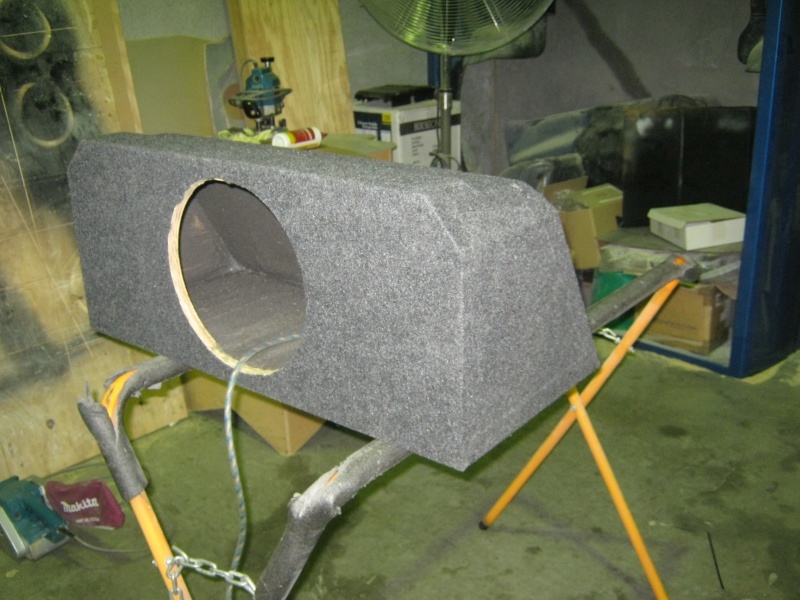 These enclosures act similarly to ported systems, however rather than possessing tuned port to extend low frequency response they incorporate a passive radiator, sometimes colloquially called a 'drone cone'. 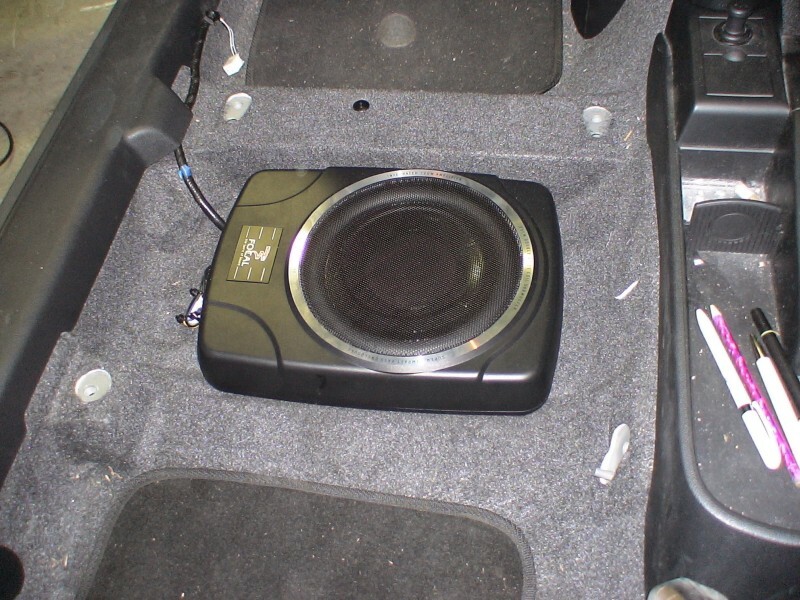 Resembling an additional subwoofer but without a magnet structure; the enclosure's response is similar to a ported system however the roll off frequency is usually slightly higher and with a slightly steeper slope. Bandpass on the other hand features a system where the subwoofer no longer plays directly into the listening area, but instead the entire output of the driver is produced through the single port or series of ports. In a conventional sealed or ported enclosure the low-frequency extension is controlled by the interaction of the speaker and the enclosure design but the high frequency response is a result of the speaker's natural frequency response capability unless limited by a crossover. 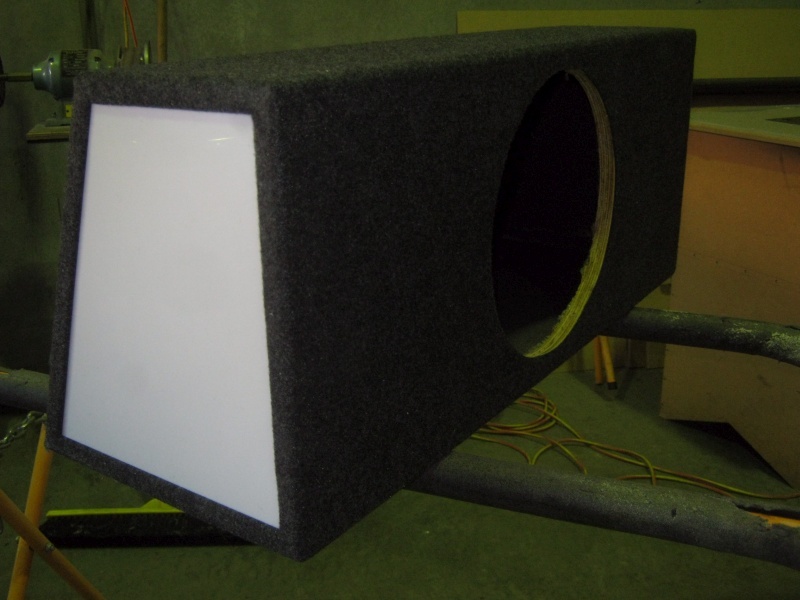 In a bandpass enclosure the front of the speaker fires into a chamber which is tuned by a port. 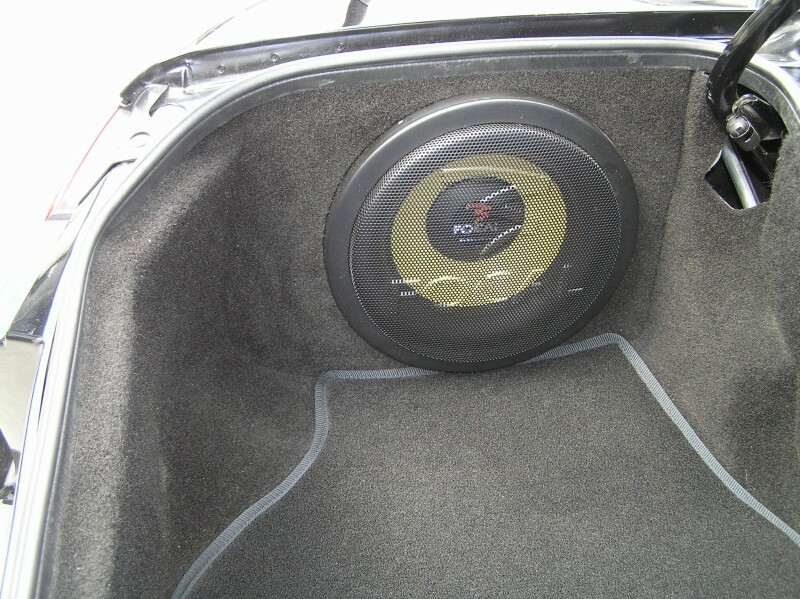 This ported front chamber acts as a low-pass filter which acoustically limits the high frequency response of the subwoofer system. 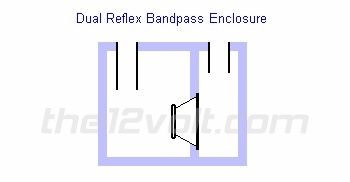 The name "bandpass" is really pretty descriptive in that it refers to the fact that the enclosure will only allow a certain frequency "band" to "pass" into the listening environment. 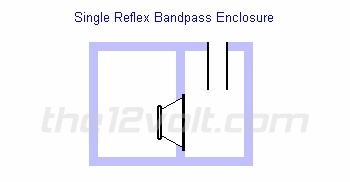 Bandpass enclosures can be divided into two basic types; single and dual reflex. 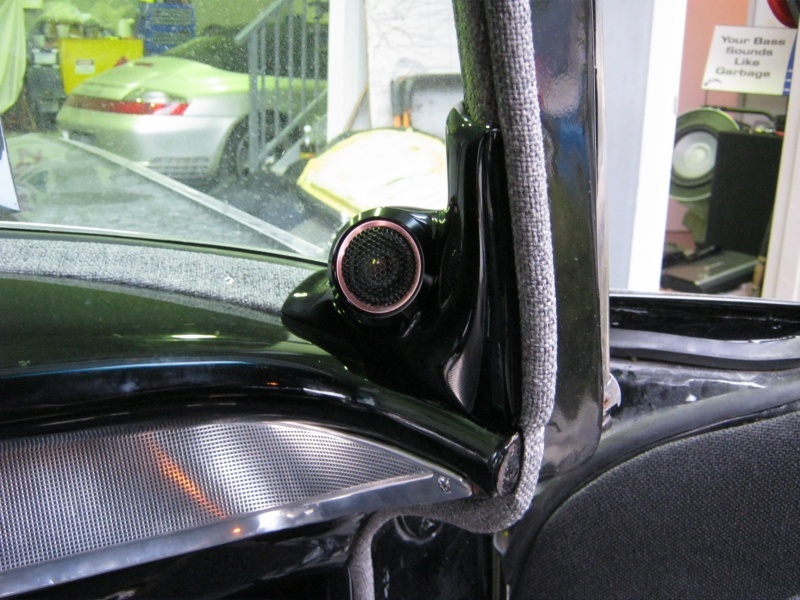 In a single reflex design, or 4th order; the rear chamber is sealed and the front chamber is ported. 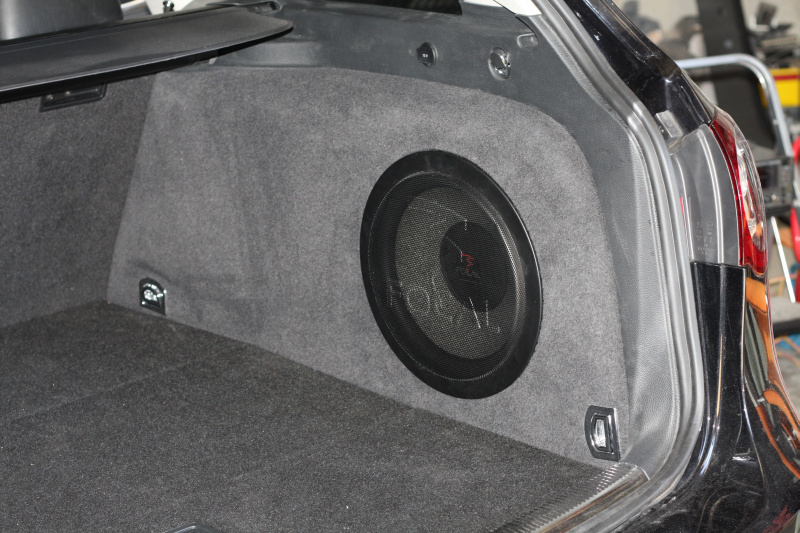 In a dual reflex design, or 6th order; both the front and rear chambers are ported into the listening area whilst the subwoofer resides in the middle. 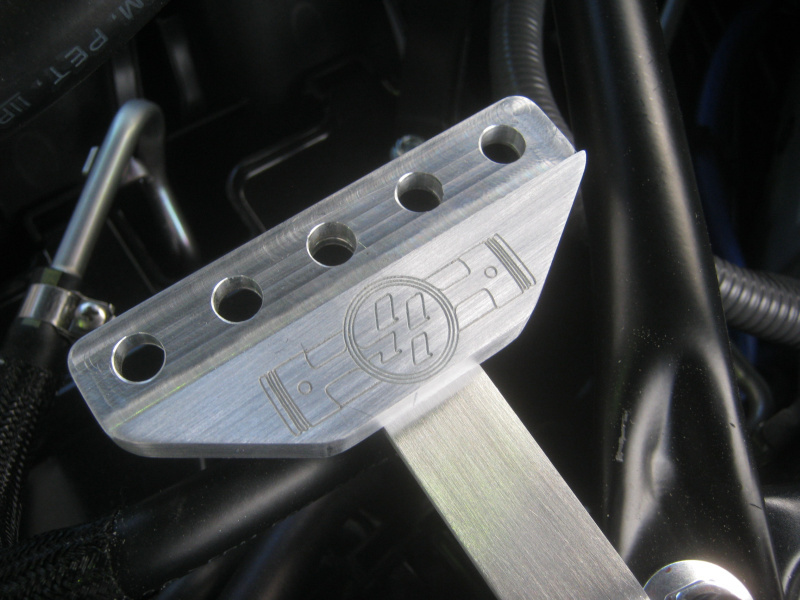 There's also a more complex variation of the dual reflex design called a series-tuned or 8th order. This has a port which connects the rear and front chambers as well. 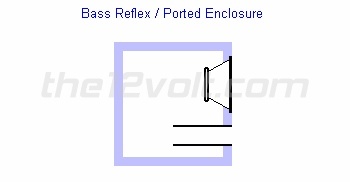 The differences between single reflex and dual reflex designs are similar to the differences between sealed and ported enclosures. A single reflex typically exhibits a shallower low-frequency roll off rate (e.g. 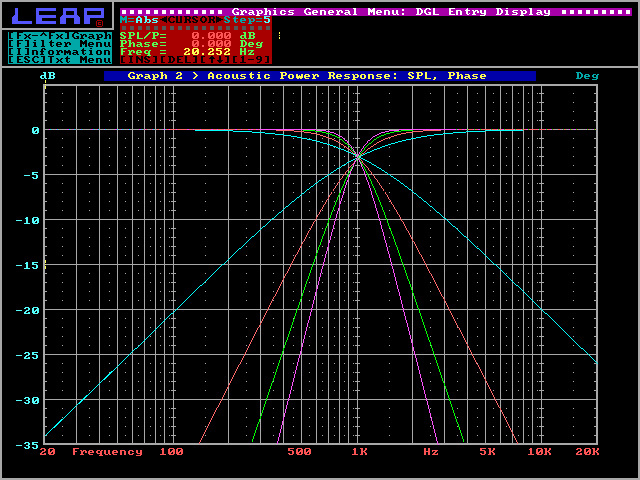 12dB/octave) and better transient response. A dual reflex is more efficient and controls cone motion over a wider range but typically has a sharper (e.g 18-24dB/octave) low frequency roll off. 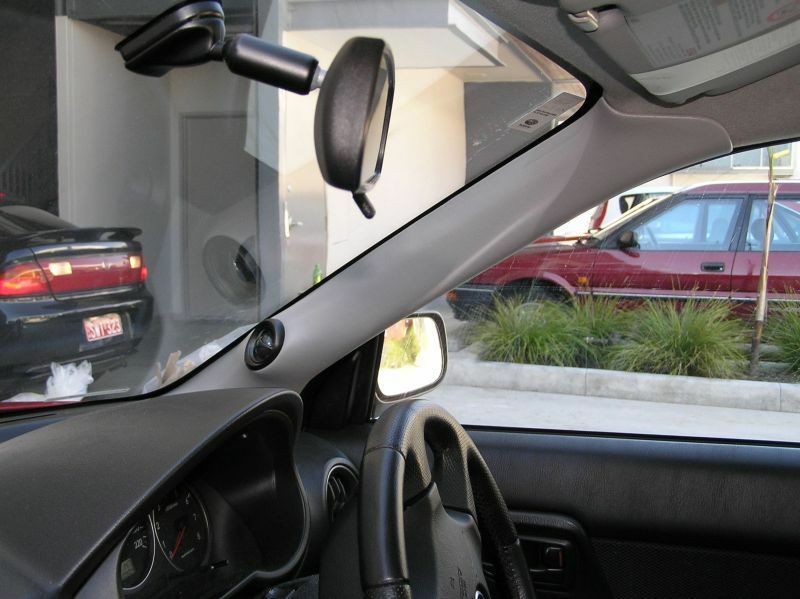 Because of the difference in low-frequency roll off rates, a dual reflex usually has to be larger in size to produce the same low frequency extension as a single reflex design. 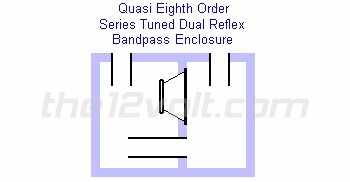 Now it's important to note here that there're many variations of bandpassing, and compared to conventional sealed and ported enclosure designs bandpass enclosures are inherently more complex to design far less forgiving; the rules governing the performance of bandpass enclosures leave little room for error. Slight volume miscalculations or sloppy construction can turn a good design into a poor performing box. Integrating the proper size port or ports can be extremely challenging and often renders designs that looked great on paper completely impractical. No matter what type of enclosure you eventually chose to settle on, the design of these boxes should definitely be left to people with extensive enclosure experience. Note; images above have been borrowed from the12volt.com website, permission pending. 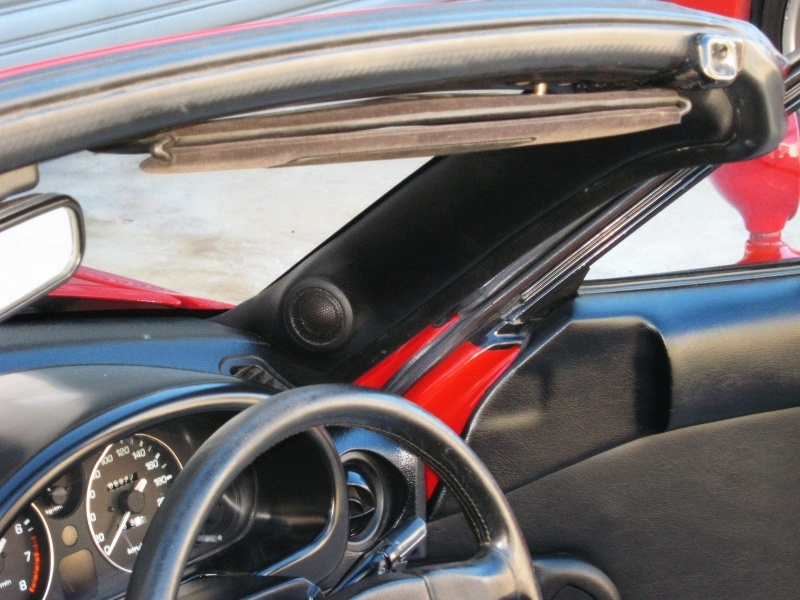 The debate on whether to use sound deadening material, diffuser panels and fibrefill inside an enclosure has been around for a long time. However, this debate needs to be broken down into two areas because you're actually addressing two separate issues when asking about these materials. The first issue is regarding standing waves and the second is regarding the delaying of sound waves and the smoothing of resonance. Well start with standing wave issue first. 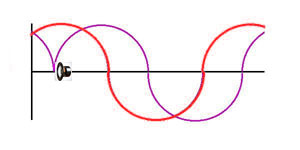 Standing waves cause violent response fluctuations inside the enclosure but for a standing wave to exist the distance between parallel boundaries (the enclosure walls) must be half the wavelength of the frequency at which the standing wave exists. 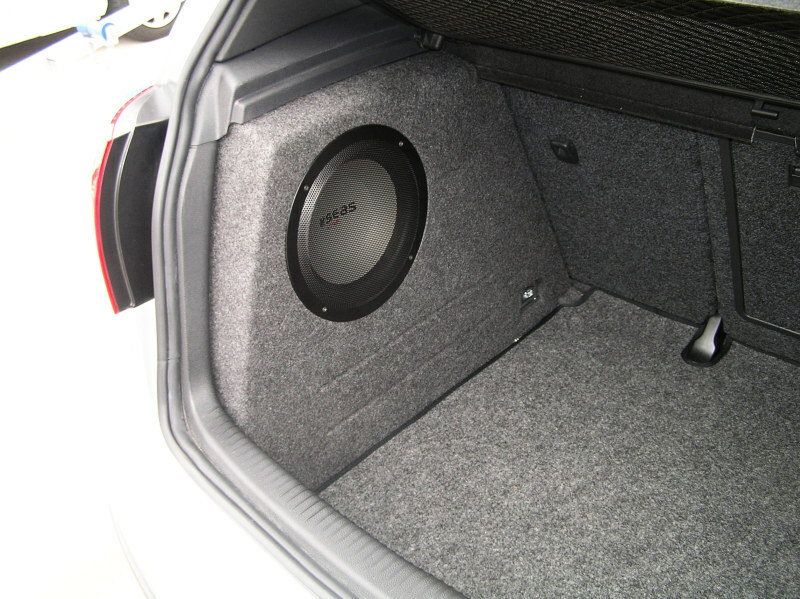 Considering that sub-bass waves vary from 17.19 meters (@ 20 Hz) to 3.44 meters (@ 100 Hz) the generation of a standing wave is going to be impossible in an enclosure designed to fit in your average sedan or hatchback. 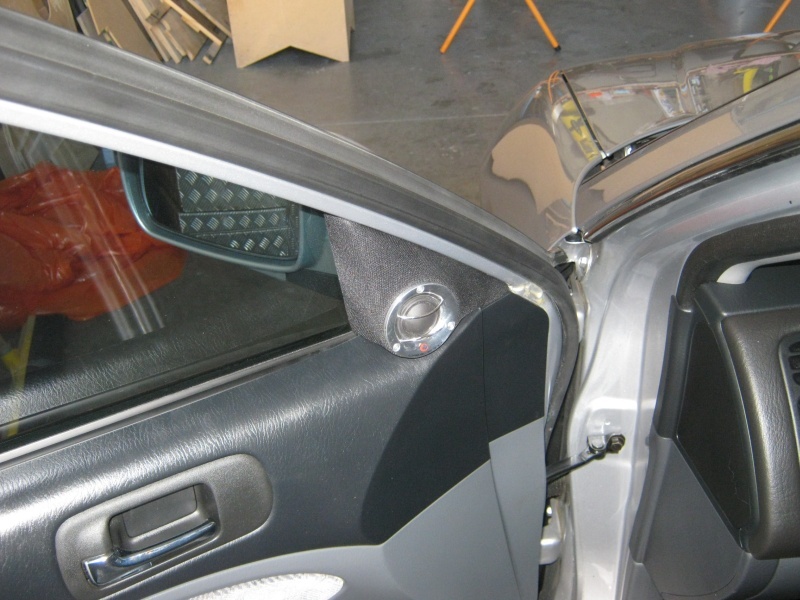 People often install sound deadening and diffuser panels unnecessarily inside their enclosures to combat these standing wave issues (this is also the reason why some people are reluctant to employ certain square enclosure shapes). 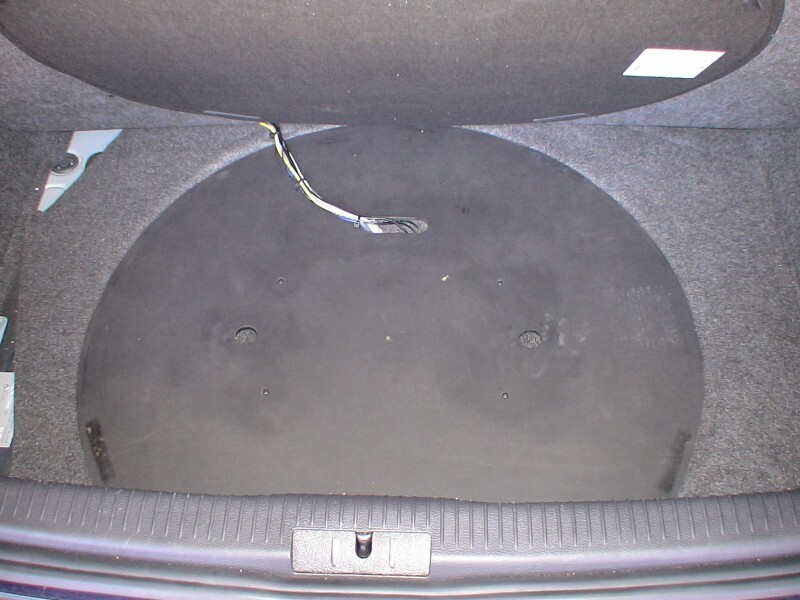 As you can see above though; in reality, due to the small dimensions of most car audio subwoofer enclosures, there is little chance of generating standing waves in the enclosure. 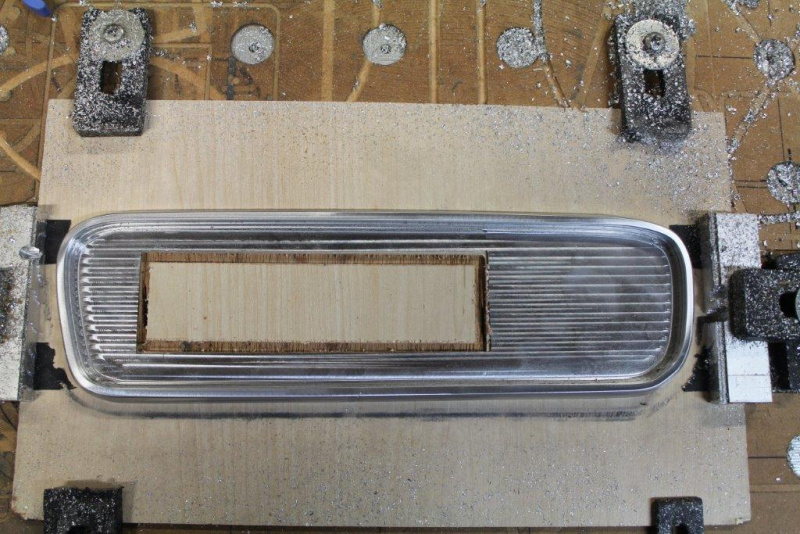 Sound delay and resonance smoothing is another matter altogether and this is where the fibrefill comes in. 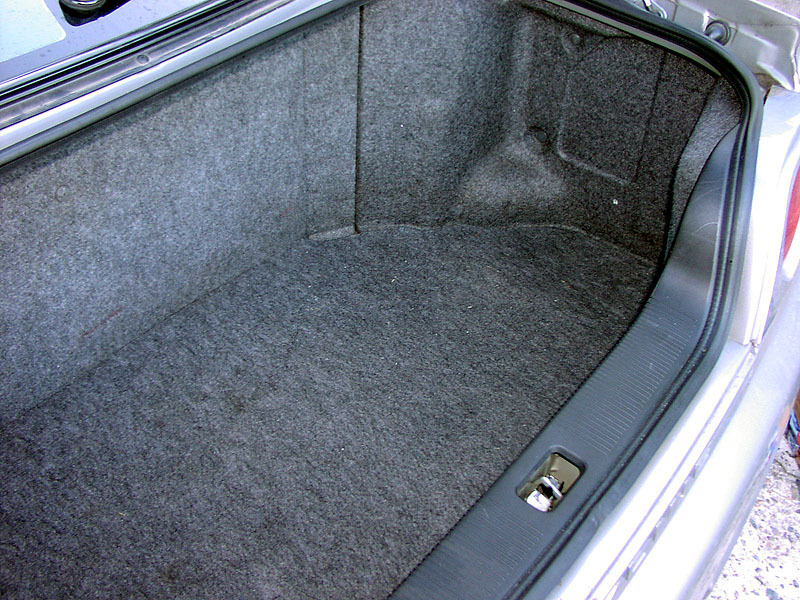 Fibrefill is often employed in enclosures that are a little too small (usually due to space restrictions within the vehicle). 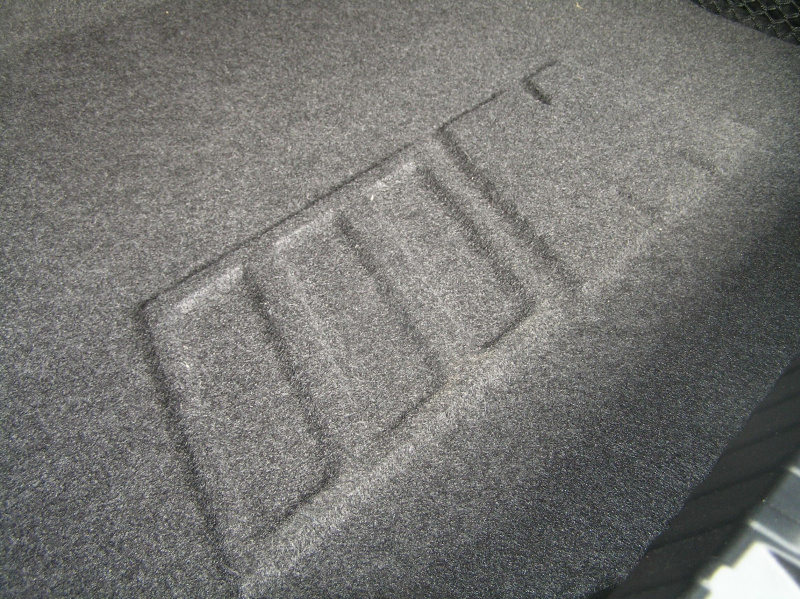 Damping material is primarily used to fool a subwoofers suspension into 'seeing' a larger enclosure than it actually lives in. 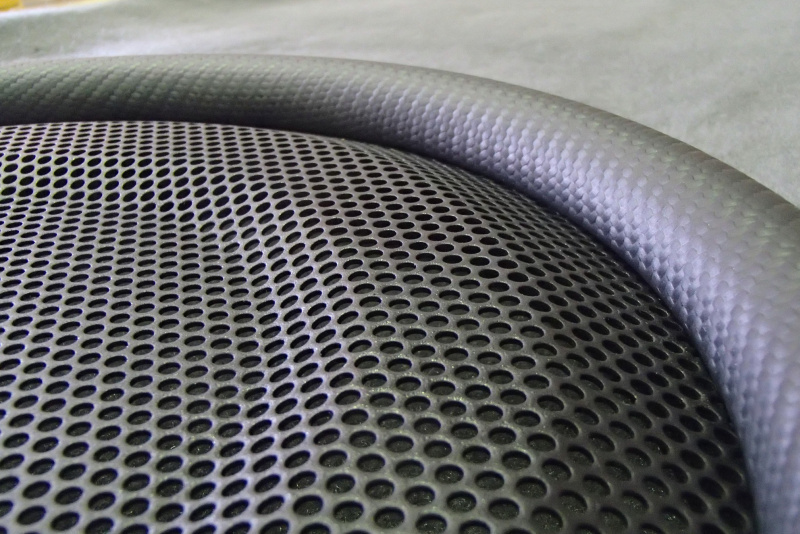 The other primary use for fibrefill is to smooth over little resonances, peaks and dips inside the enclosure itself. Just as a side note; if you're planning on using fibrefill inside a ported enclosure, make sure it is not getting to close to the internal port mouth. 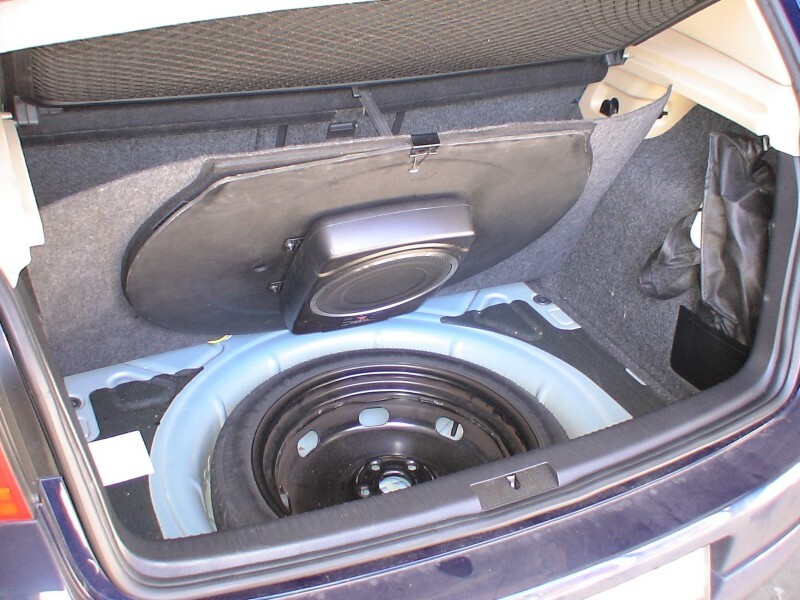 Assuming your 3" / 4" / 5.25" / 6" / 6.5" speakers are midrange drivers and not subwoofers (Focal make a 5.25" subwoofer for example), you shouldn't need to make a sealed enclosure for it. 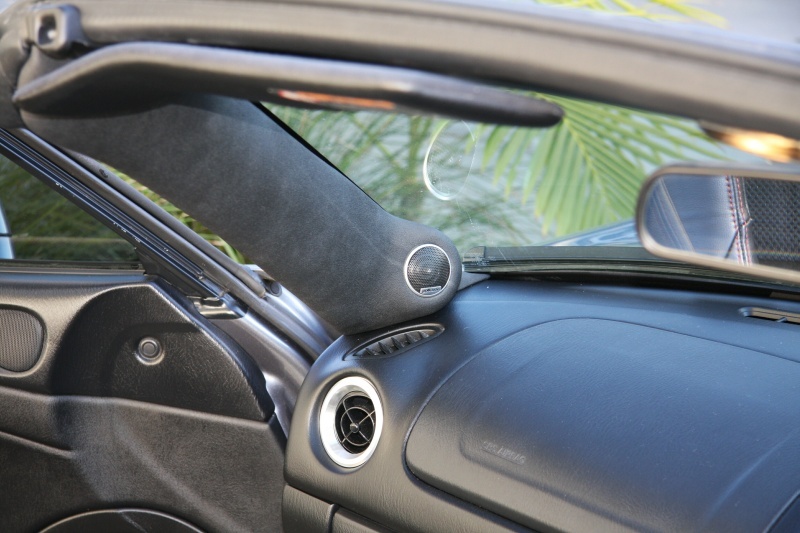 In most cases (but not all) there is no need to build sealed enclosures for these midrange drivers because their suspension (the spider and surround) is designed to operate in an infinate baffle situation such as a door or rear deck of a car. In other words, most midranges are free-air drivers. However, it's always best to consult the manual for your new speakers if you're not sure. 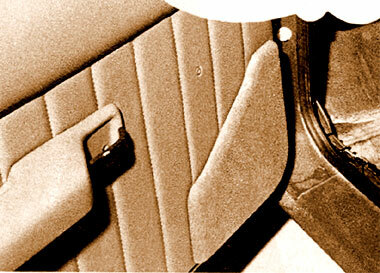 There's no quick and easy answer to this question, It all depends on the car and the overall design of the system. 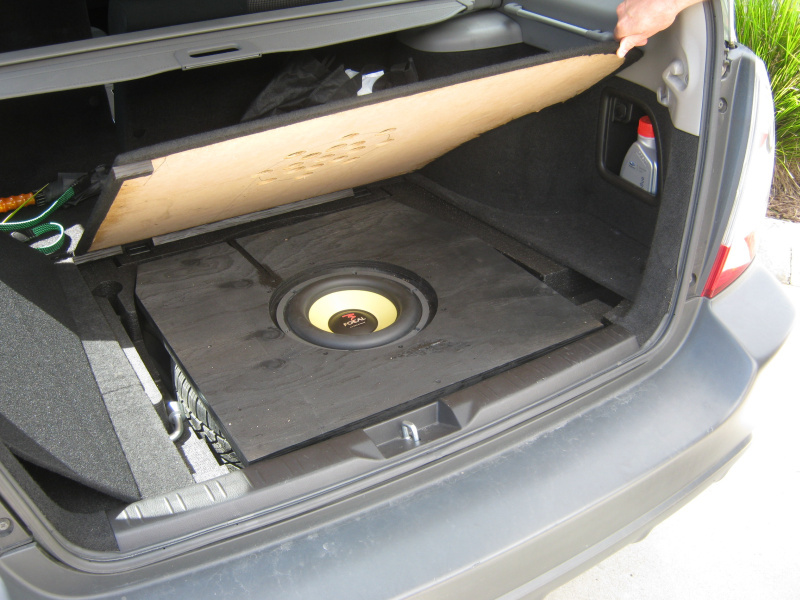 Generally speaking you don't want your subwoofers to go much higher than 80-100Hz. 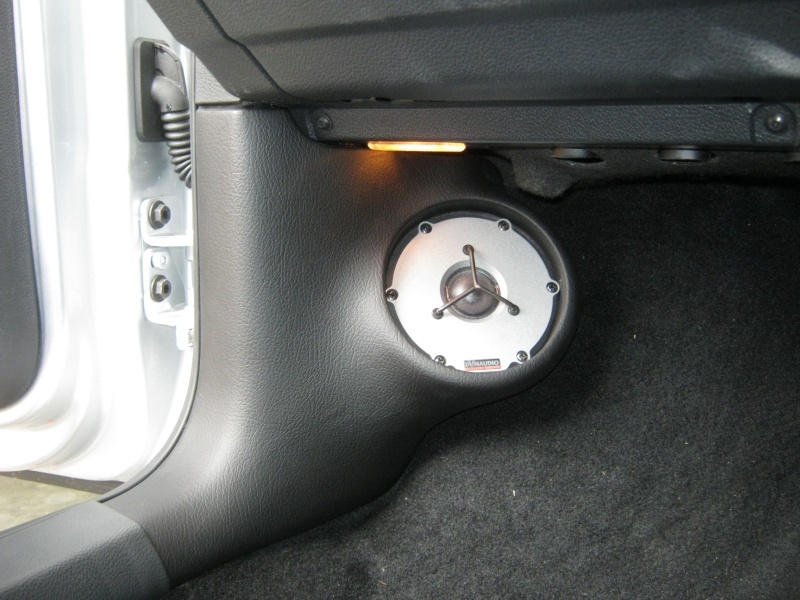 Typically when you set your subwoofer crossover point you will use that as a starting point for your high-pass on your mid/bass drivers. Sometimes you will need to increase the crossover frequency and sometimes you will need to lower it. 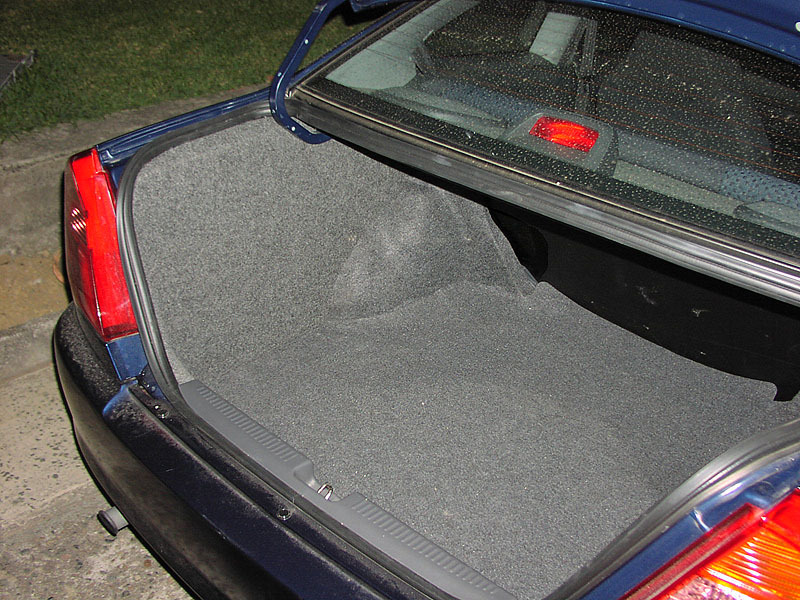 It is basically all a matter of personal preference and the acoustics of your car. Electronic crossovers make it very easy to try a variety of crossover frequencies to see what works best for you and your car. Passive networks or crossovers are designed to take a full range signal and split it; sending higher frequencies to the smaller speakers and the lower frequencies to the larger drivers. 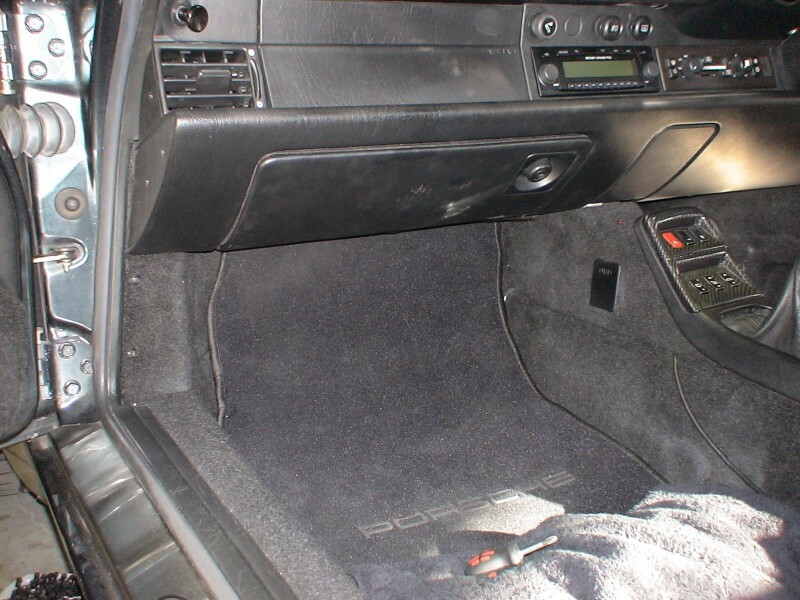 Sounds easy enough until you introduce real world conditions into the equation; for the car interior is an absolutely horrible locale to attempt good sound in acoustically. Hence the need for customization, because even two identical cars side by side will have completely different sonic characteristics. To deal with the aforesaid idiosyncrasies we need to control two main aspects. The first aspect is the roll-off slope and the second aspect is the roll-off logarithm. Below we're just going to delve into what the different slopes and logarithms basically entail, rather than going into which ones to use where. Your installer will be able to select both these based on numerous criteria including speaker size, location, axis as well as other more technical parameters. As you can see from the above graph what order slope you select basically dictates how steep the frequencies will be rolled off. For example, a second order slope means that the sound will change by 12dB for each octave of sound spanned. The graphs above demonstrate, from left to right; the summation of the Chebychev, Butterworth, Bessel and Linkwitz logarithms. The yellow line is the actual summation level. Once you have these selected you can go about building a crossover to handle the splitting of your systems frequencies. Getting these aspects correct can mean the difference between your stereo sounding astonishing as opposed to just okay. Okay, stop and think about a concert for a second. You don't sit with your back towards the band right? Rather, you want the sound in front of you. Likewise you want to be in the first row, be dead center of the band on stage and depending on your personal preference you might like to be slightly below the sound (as is an audience member) or slightly above the sound (as a conductor is). 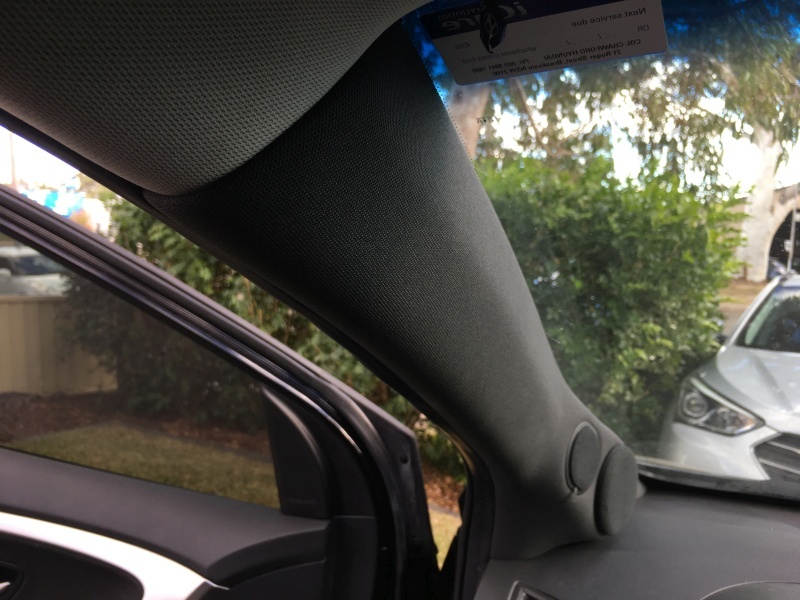 This is the image we try and capture inside cars today and tweeter positioning plays a large role in achieving this phenomenon. You cannot just simply slap tweeters in anywhere. To get a decent stage you need good width, height and depth - preferably mirror-tip to mirror-tip, floor to roof and as far down the bonnet as possible. Where to mount them then? Kick panels, sails or elsewhere? 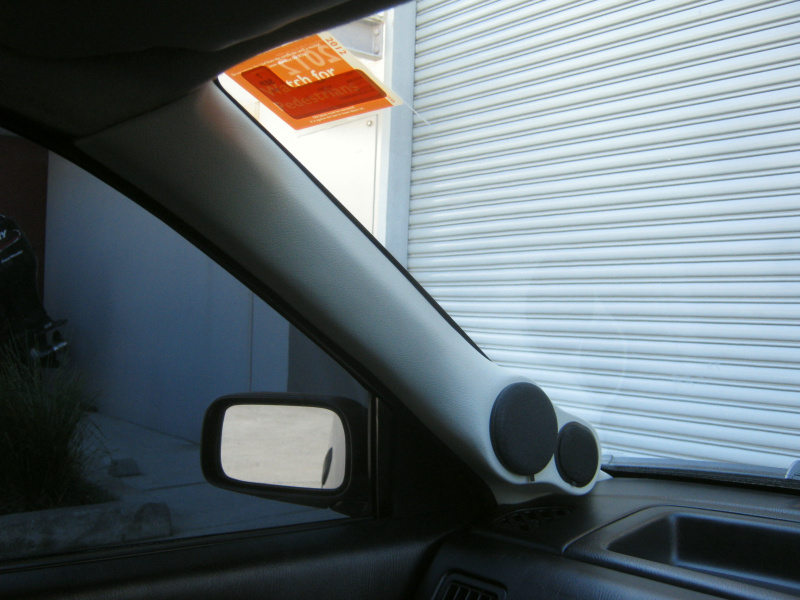 We often see tweeters mounted up high on the sail area on the door or down in the kick panels. Both these work well but can suffer from similar issues. The problem with the sail mounts is this; think about the position of your ears in relation to the tweeters. One speaker is belting the high pitch tunes out about one foot from your ear where as the other tweeter is triple, quadruple or quintuple that distance away. The image has no choice but to be right out the side window. Sheer laws of physics govern this fact. 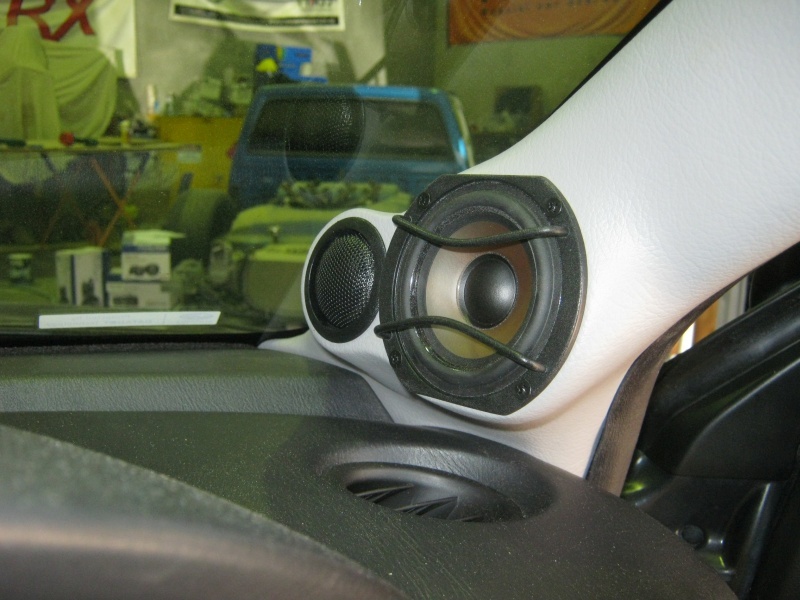 If you place the tweeters down in the kick panels then the right speaker distance is about three feet and the left speaker is about four feet away. The problem is not utterly eradicated but it becomes a lot less noticeable as the distance separation is reduced (by up to half sometimes). 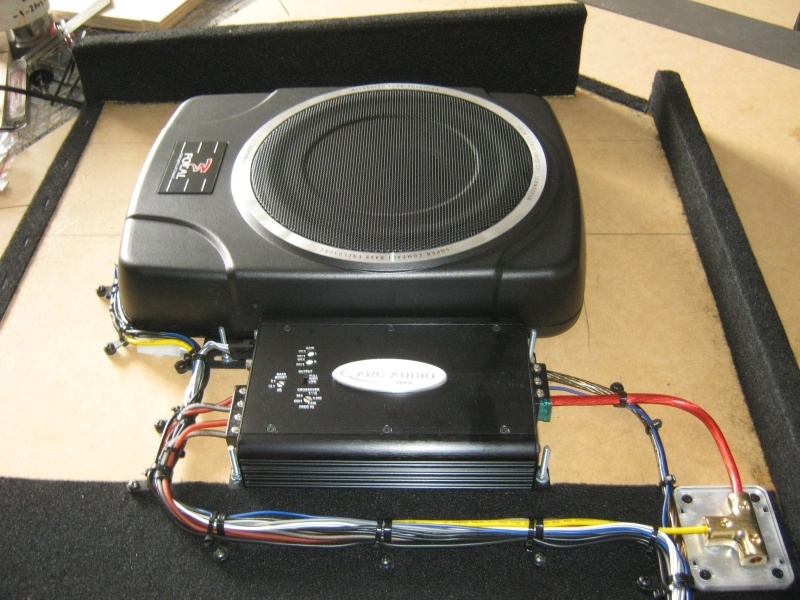 However using the kick panel method can result in the stage being a tad low (the kicks are often used on cars with no factory tweeter location to avoid the cost of custom A-pillars or sails too). 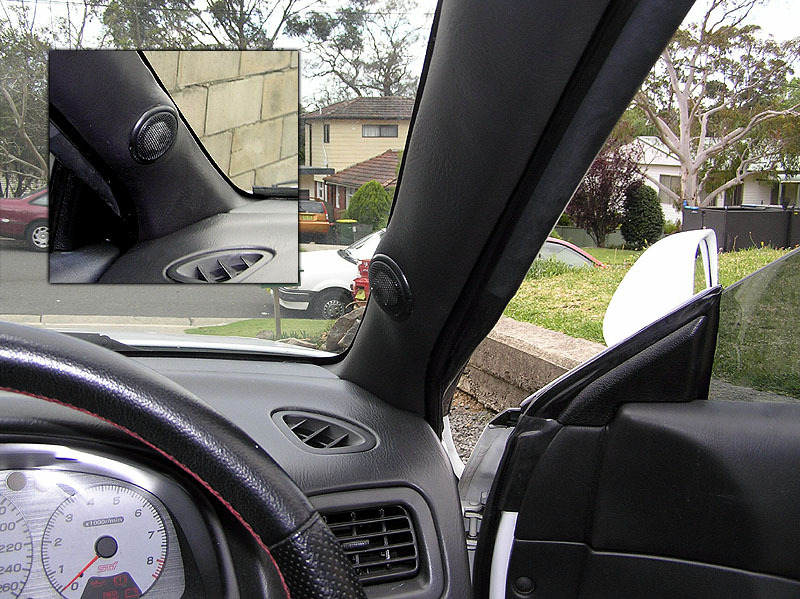 Remember tweeters cannot be placed anywhere where they fire straight into ones feet so you have to be more careful about their placement on both sides and more often than not this results in them being mounted very high up in the kick panel, quite often well out of sight and well up under the dash - this is also good for security too. The final mounting place of your tweeters depends what you desire from your system and what your budget is. As mentioned above; when choosing a tweeter mount in order to achieve a great sound stage you're always faced with various issues. Put the tweeters up high and forward and you'll get good depth and height but the stage width can sometimes suffer. 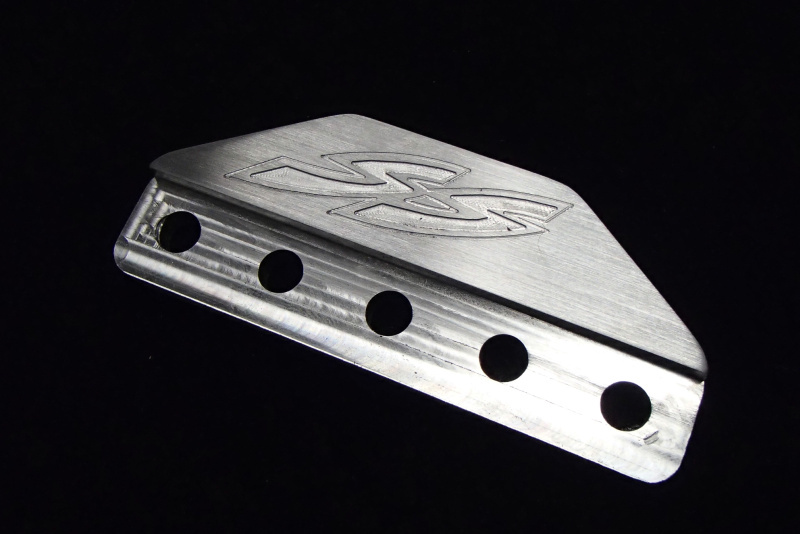 If you put them deep in the kick panels you tend to get good width and depth but the height can sometimes suffer. Seems you cannot win sometimes, especially when you factor other things on like reflection issues. 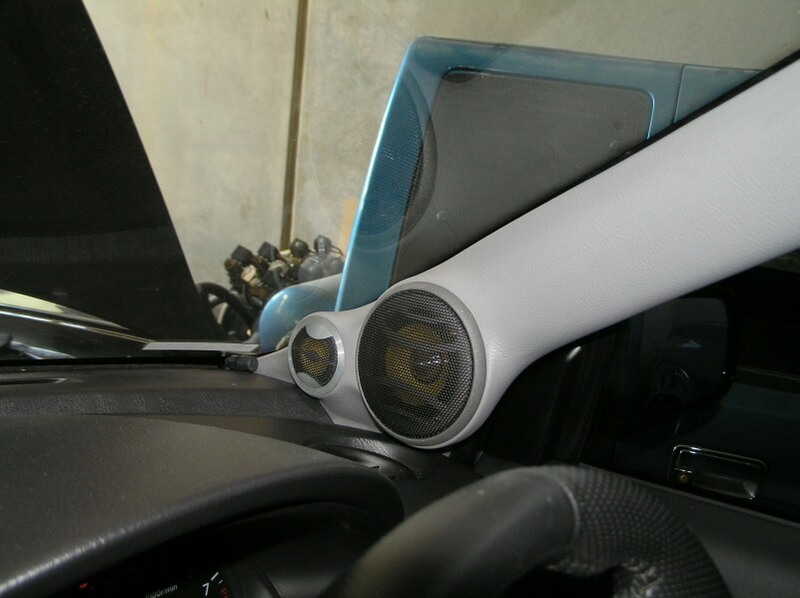 Generally speaking though, mounting the tweeters in the a-pillars right at the front corner of the dash will result in the best unmanipulated (i.e. no time alignment) sound stage. If that is not an option, then experimentation is the best strategy. Remember too that tweeter location can also play a role in ambience too. 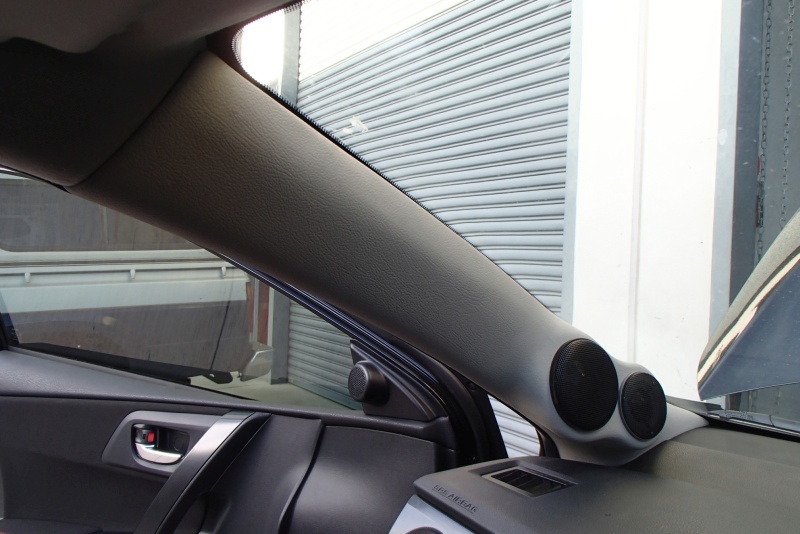 If the tweeters are positioned correctly (whether in the kick panels, A-pillars or even behind the review mirrors) they will help the whole component set fill the car with high frequency sound - not just way off in front of you. There are two other issues to consider when choosing where your tweeters will go too. 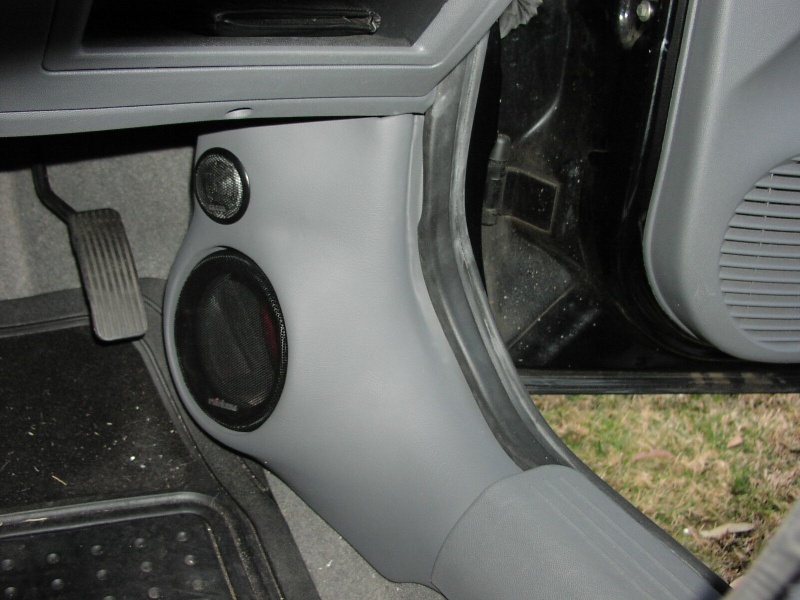 Cost is one because to mount the tweeters successfully in the A-pillars there is a good chance you're going to require some custom work done and hence the price goes up. Then there is also the security issue too because people can now see your tweeters. Factor all these issues in when you are deciding. Time alignment is an essential tool but it can also be a curse if not used correctly. 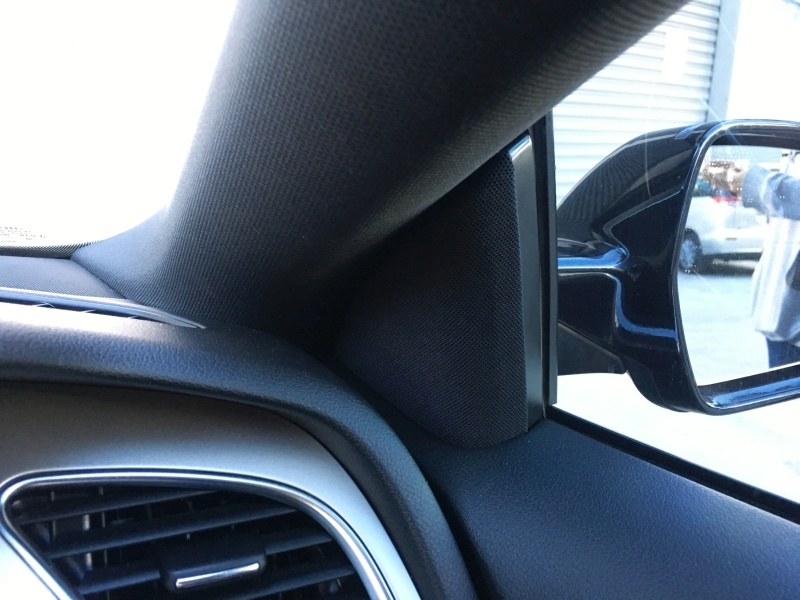 One of the more common problems associated with time alignment is regarding the seperate sides of the car in relation to stage width. If you're not careful, the better you make one side sound (and you can get it absolutely perfect) the more the other will suffer. This is because you're delaying one speaker side so both signal paths reach your ears at the same time. The problem with this is that the other side has the reverse problem to your side so as yours gets better, it can get worse. However when used correctly (and we recommend you do use time alignment) it can move the stage depth forwards (you delay the fronts in relation to the subwoofer too) in addition to getting your image perfectly located in the center. With a careful blend of experimentation and measuring you will eventually get both sides sounding great. So how does one get the stage right in real world terms? At the end of the day you'll just have to experiment quite a bit (and sometimes it can take days) to get the tweeter placement just right to achieve the perfect stage 'width', 'height' and 'depth'. Get yourself a nice big blob of blue-tac. Stick the tweeter onto a panel somewhere, turn the time alignment off for the moment and commence playing songs performed by a powerful vocalist (ranging from baritone up to contralto as these are the frequencies at which human hearing is most sensitive and therefore is best for staging). Close your eyes and imagine you're at the concert. Now listen to where the singer is coming from. Are they singing from right in front of you? Are they slightly off to the left a tad or right? Are they a little high or a little low? Simple move the tweeter a few inches in a direction and have another listen. How is the image? Can you hear where all the band members are exactly? How is the depth? Does the drummer sound like he is behind the other musicians (stage depth)? Do the individual musicians sound like they are specifically somewhere on the stage? (stage width). Keep doing this until you get the image dead center but remember to take a rest every fifteen minutes for half an hour to let your ears normalize. Remember your ear drums are controlled by muscles and they (just like any other muscle) get tired, so make sure you give them a rest. If you attempt staging for hours on end your ears tend to 'hallucinate' and give false readings. Once you have it very close then you can activate your time alignment and do the fine tuning. If you're really serious about getting your stage and image the best it can possibly be then you should also consider the manufacture of new panels altogether. That way you can physically change the location of the tweeter (in the case of a two way component set) or midrange and tweeter (in the case of a three way component set). 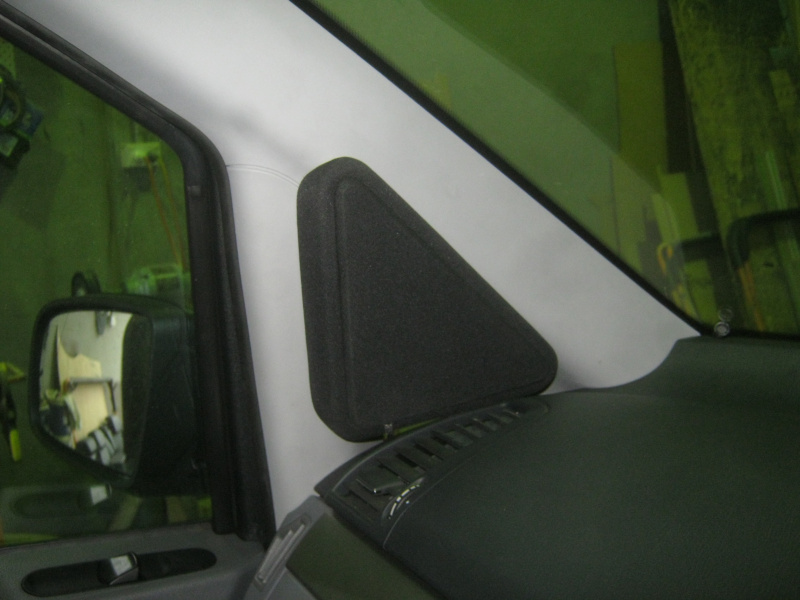 Below are some of the options for different tweeter and midrange mounting locations. 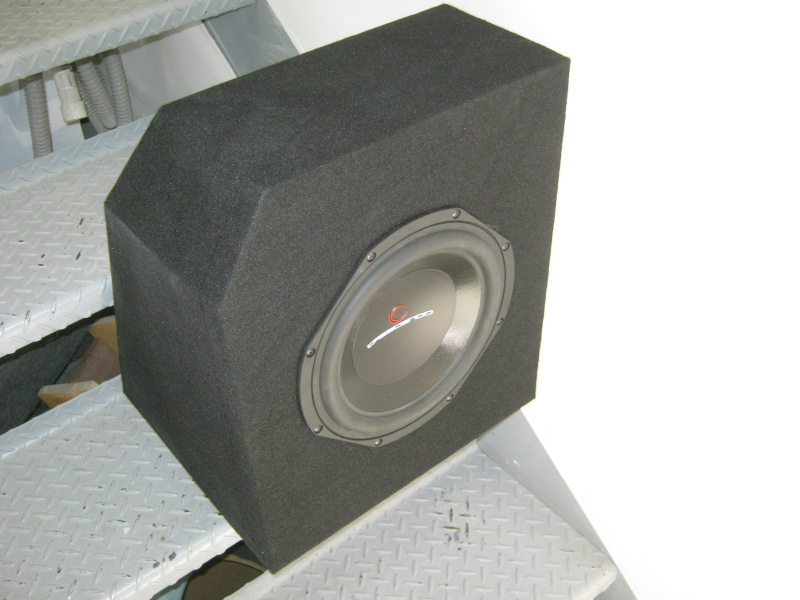 It seems there are few debates in the known world larger than the one concerning the humble 6x9" speaker. Now depending on which side you're on (as there seems to be no middle ground these days), 6x9's are either a little nuisance that you'd rather have sitting far in the rear of the car or better still, on the road behind the car, or you cannot even contemplate a life without them. Lets begin with some basics. 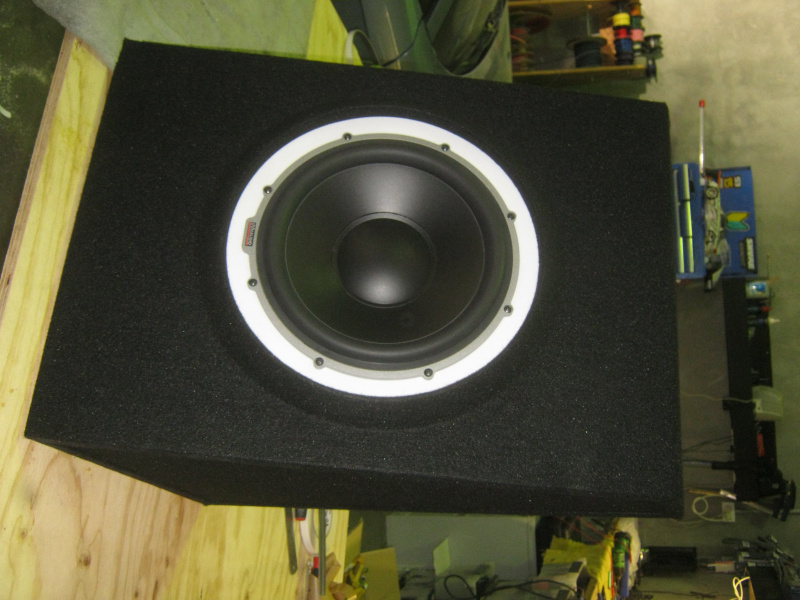 6x9's are oval shaped speakers aptly named because they measure 6 inches by 9 inches. There are slightly different versions measuring 7x10, 4x6 and 6x8 on the market but let us concentrate on the daddy of the group. 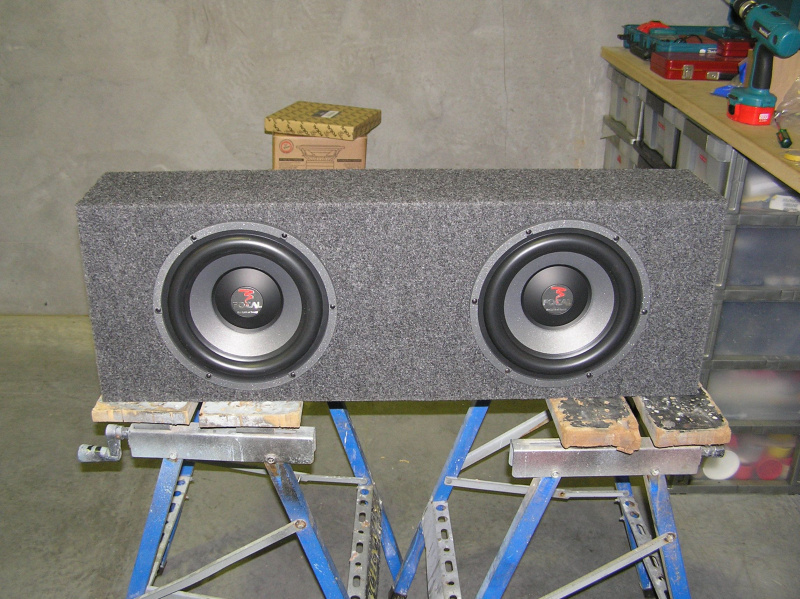 6x9's are more often than not three or four way drivers (that is; three or four speakers in one unit) and comprise of a 6x9 woofer, smaller mid-bass (or two) woofer and a tweeter mounted on a bridge over the main woofer. 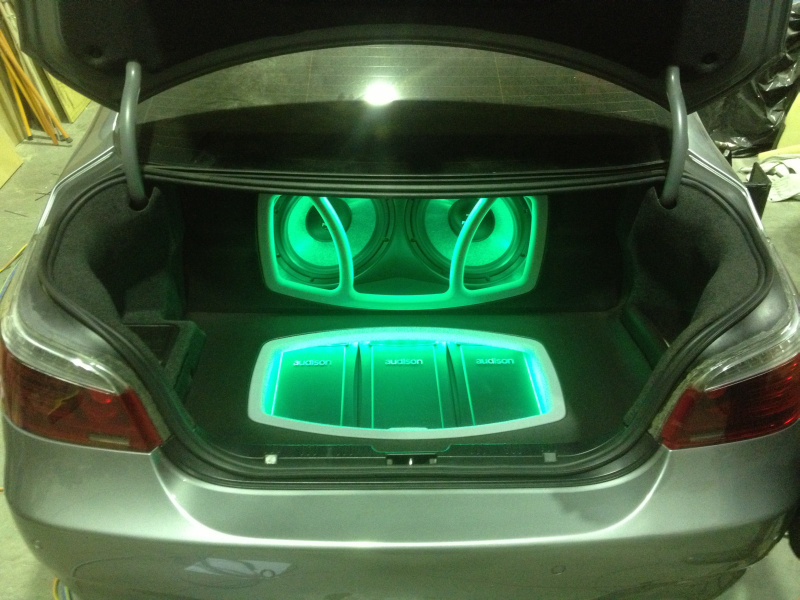 They are commonplace in many different factory audio systems right over the world. Now you might have heard hi-fi buffs recommending against using 6x9's in high end audio systems whilst recommending them for every other type of system. There are actually numerous pro's and con's of 6x9's and there are reasons why they're avoided for high budget systems and targeted for low budget systems and factory upgrades. Lets look at the cons first. The first issue is the actual cone size. 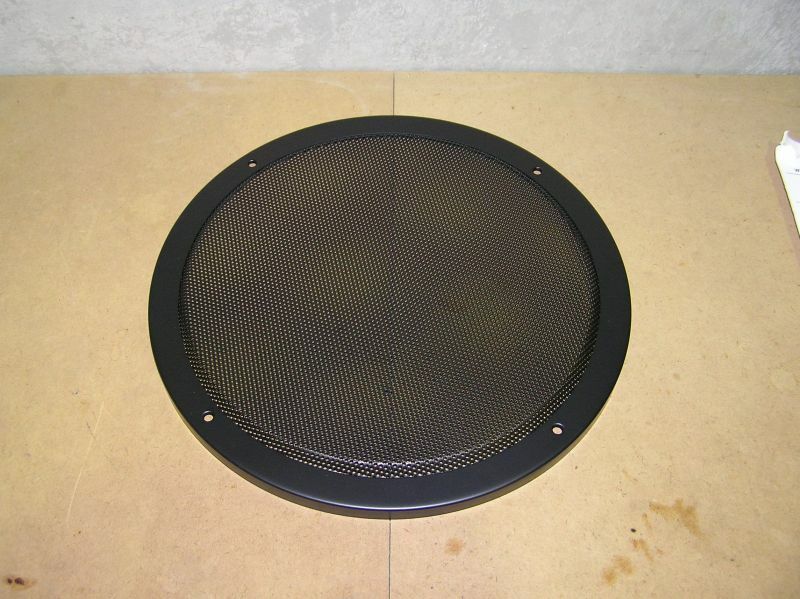 The large woofer cone is a different width to length so it is obviously uneven. When viewed under a microscope the woofer cone can physically distort quite dramatically and hence, disastrously so far as sound quality is concerned. They tend to distort more than round or square speakers where kinetic forces are evenly exerted across the cone surface. Another big problem faced by 6x9's is one similarly faced by co-axials. 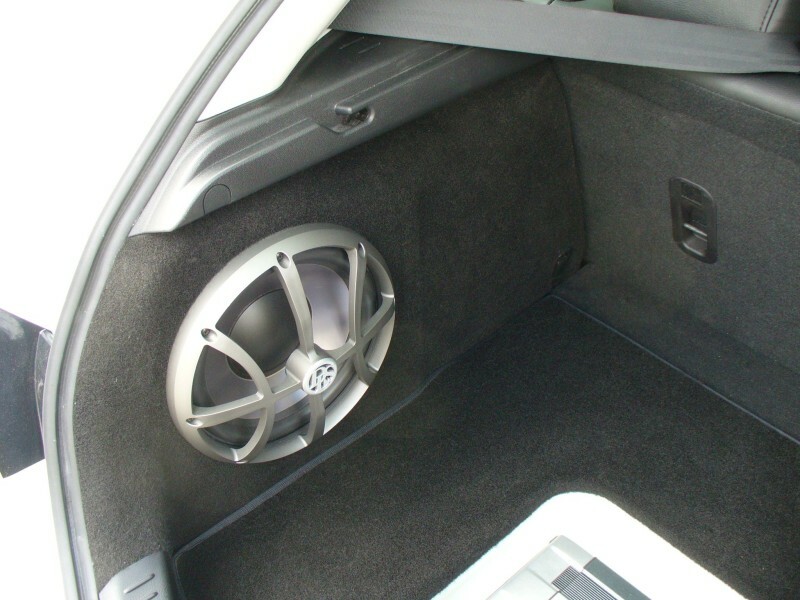 The woofer is seated directly underneath the midrange and tweeter. While this doesn't bother the average tweeter because they're sealed in most cases, it can cause great stress and problems for the midrange which is trying to play a higher frequency than the pounding a woofer underneath. 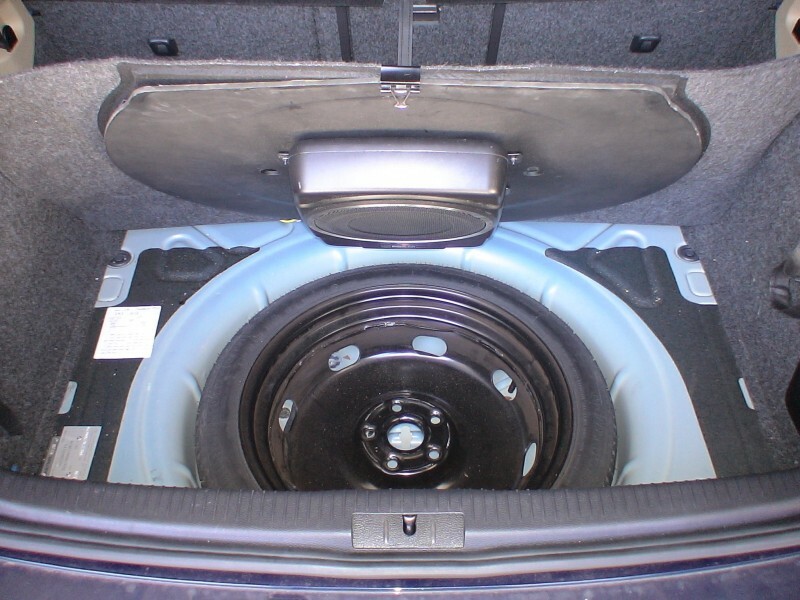 More often than not midrange clarity tends to suffer and can sound blurred as the woofer underneath wins every time. Simply put, 6x9s are not dedicated drivers. They do not offer the same freedom for fine tuning nor do they faithfully reproduce sound like separate components do. They do their job competently but will never match a separate subwoofer for bass reproduction, or separate woofer for mid-bass reproduction or tweeter for high end reproduction because these drivers are dedicated to reproducing their own little part of the sound spectrum and they do it well. 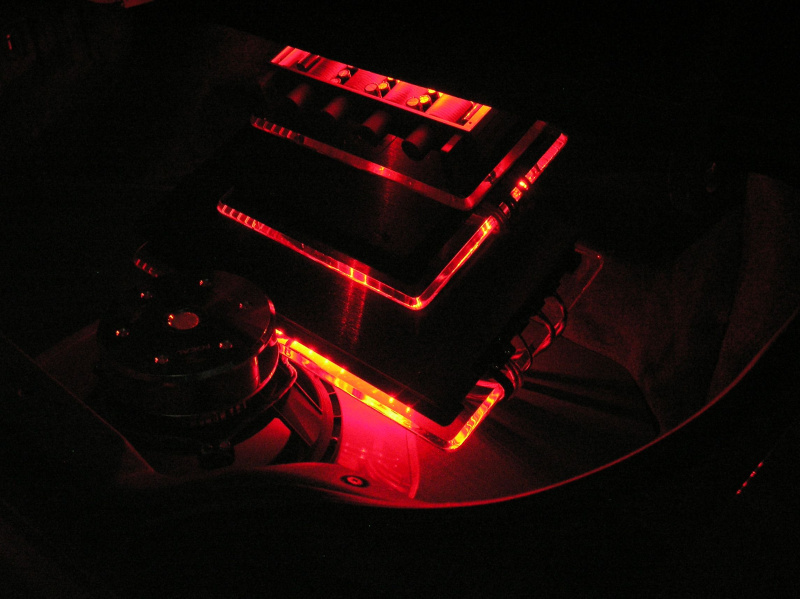 Components can also be mounted separately to help with staging and imaging. But they must have some pro's? They do. 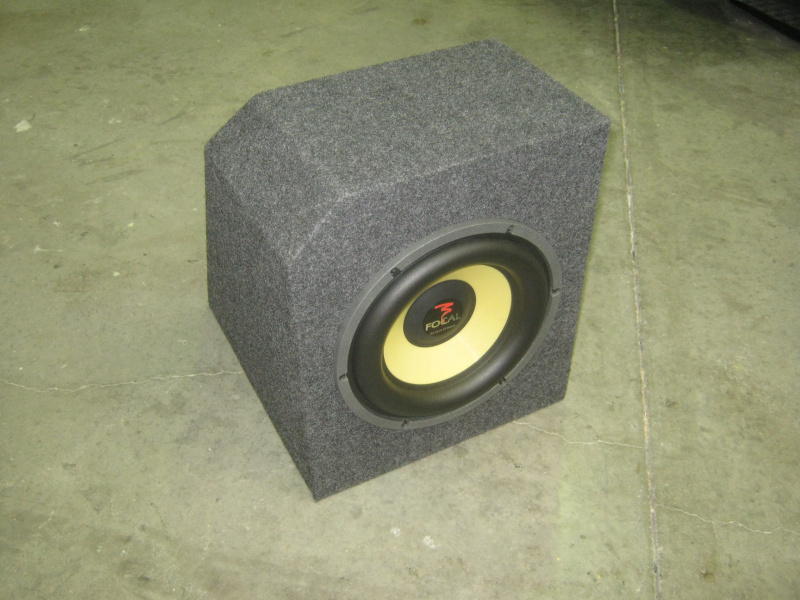 As stated above the cone on a 6x9 is exactly that, which incidentally is nearly the same surface area as an 8" subwoofer. 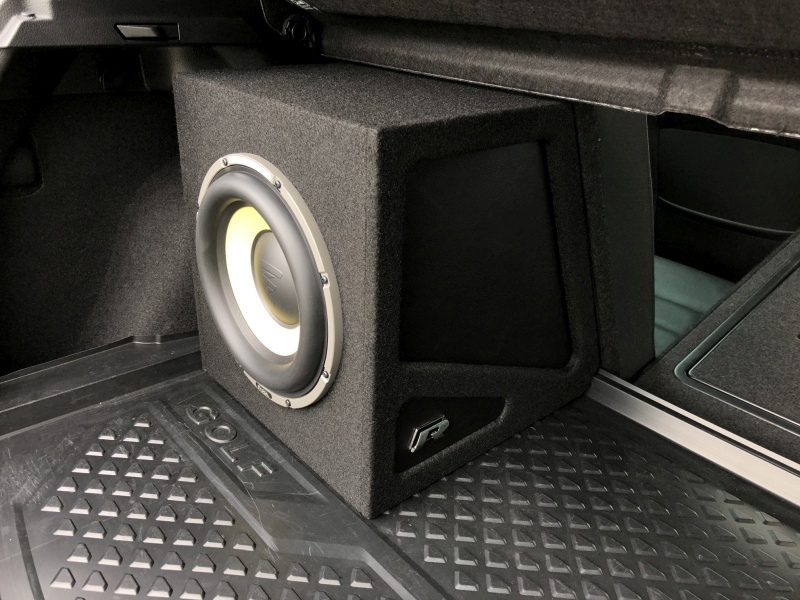 With their relatively high power handling, the 6x9 can punch out quite a bit of bass and they can even be run in enclosures to enhance this ability. Another big bonus of the 6x9 is their power handling ability and efficiency. 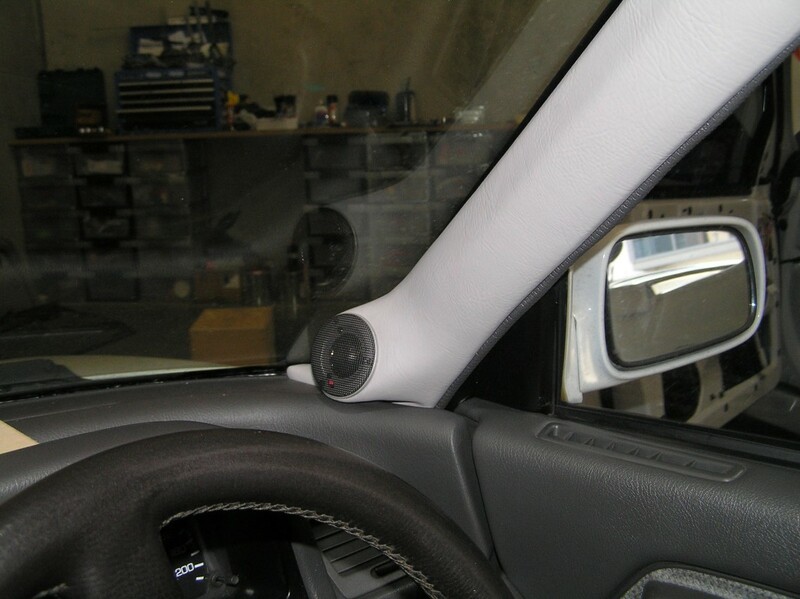 They can be run off the smallest internal (head unit) amplifier to the largest external units. 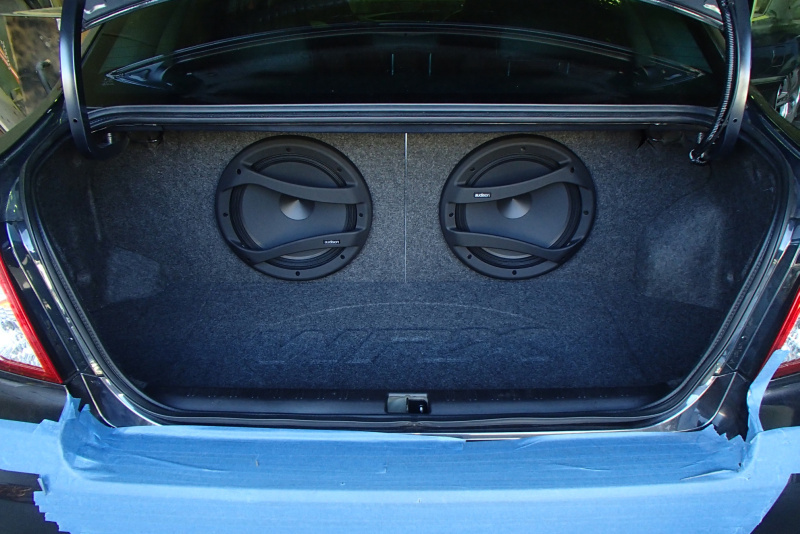 Because of this ability they make terrific upgrades to factory systems where a little more bass is required. On that note, they will also fit into many factory locations without the need to cut anything up. Expense. Time. Space. Money. 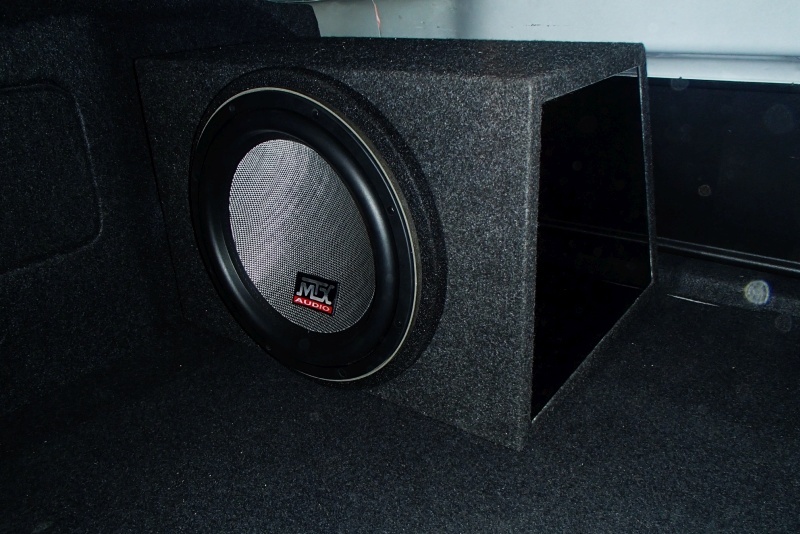 Say it how you will, 6x9's are a hell of a lot cheaper than lashing out on a large external amplifier, sub enclosure, subwoofer and splits. And they will take up a lot less room too incidentally. At the end of the day 6x9's make an excellent addition to budget systems and make terrific factory upgrades because they do a little of everything quite acceptably. They are very good drivers for beginners and people looking for a little more of everything but lets be realistic, they won't keep the staunch audio buffs satisfied for long. 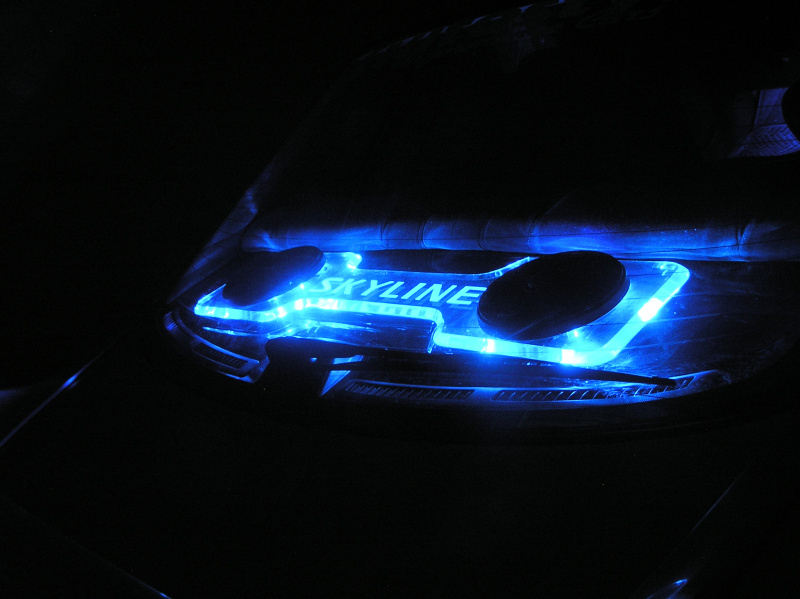 Headlight dimming is caused by a voltage drop in your car's electrical system. Contrary to popular belief this isn't simply because the amplifiers are powerful per se, but rather the problem pertains to inferior earthing. Modern batteries usually possess between 500 and 1000 cranking amperes available for instant discharge. Therefore unless your amplifiers' have something approaching this by way of fusing on their side then obviously power 'availability' isn't the issue but rather power 'supply'. Fix the flow and remove the bottleneck via way of a earthing upgrade and you'll solve your issue. 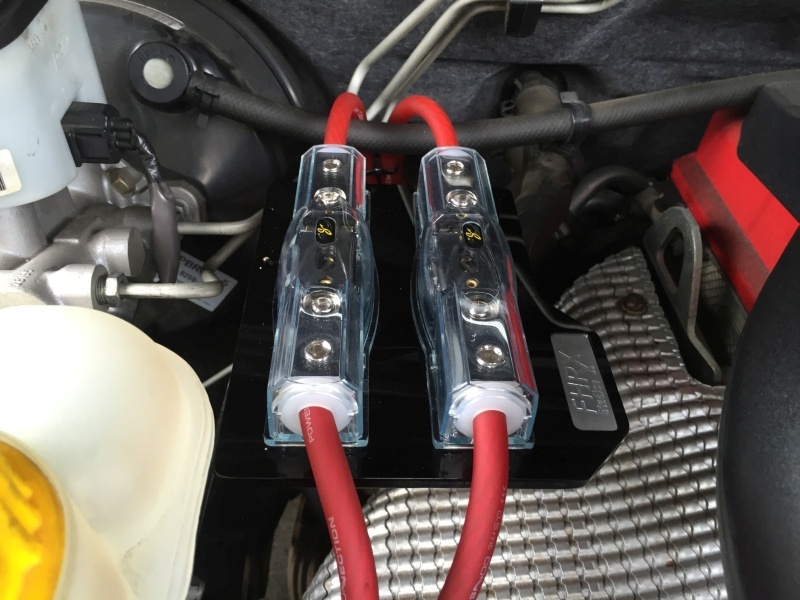 From here you need to have a read of how batteries and direct current works and then upgrade your car's earthing. Of all the issues we deal with on a daily basis this would be one of the more contentious; as it not only perplexes customers but also tends to throw many a store owner too. See sadly there's very little value in listening to speakers within a store, for they'll sound absolutely nothing like your car; as in not even close. That�s why many high end stores don't rely primarily upon endless demo walls full of speakers, as it often ends up offending serious audiophiles rather than assisting them. There're two primary factors for this phenomenon. The lesser of these two bugbears pertains to speaker motor structure. 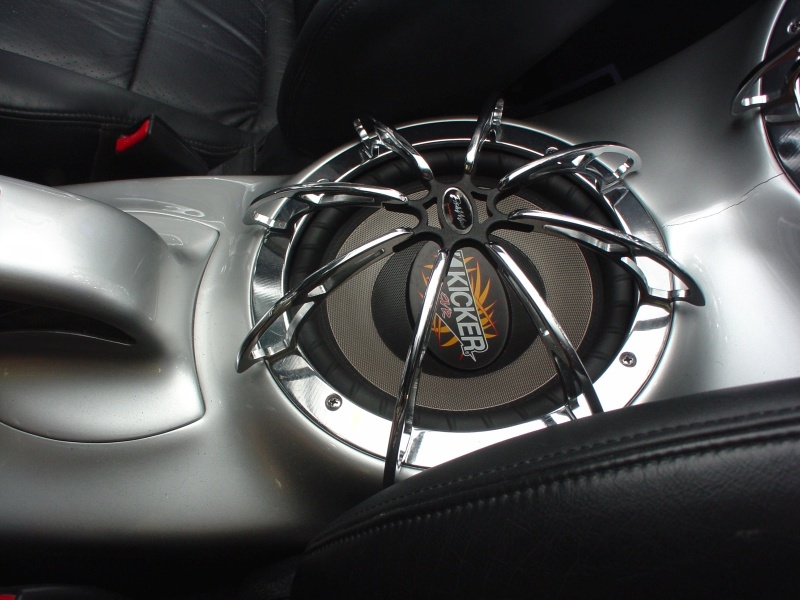 See car audio speakers are designed to be somewhat more resilient and therefore tend to intrinsically possess a vastly different suspension stiffness to their home audio brethren. 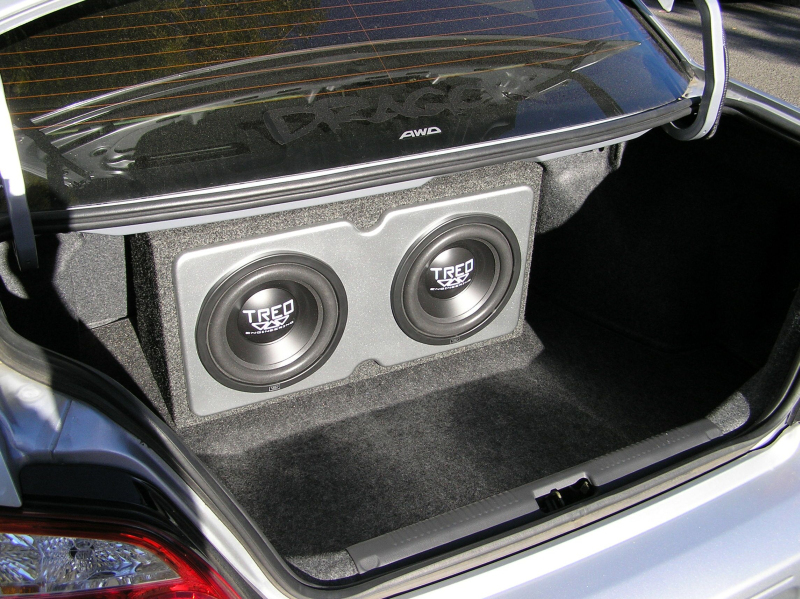 Put simply; car audio speakers are not designed to live nor play into a full sized room environment. Sure they're still play music but it's far from their ideal operational environment. 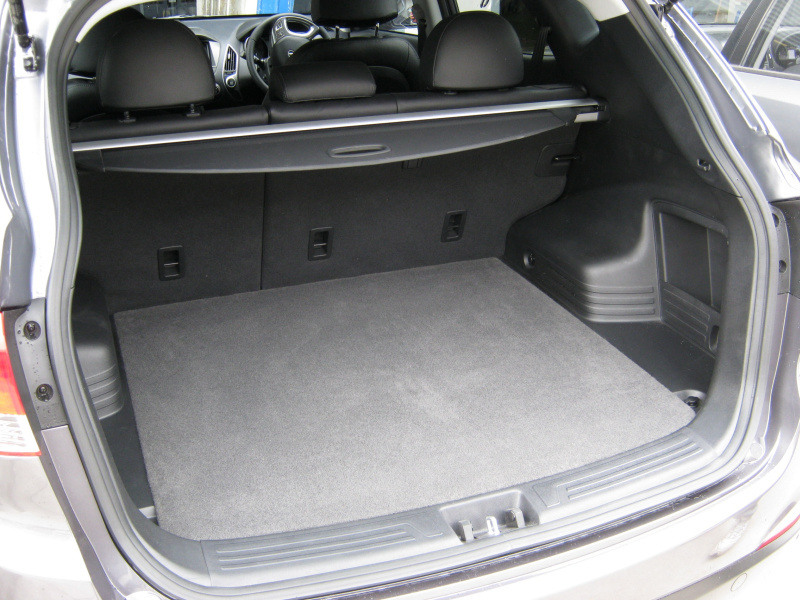 As if that aforementioned isn't conundrum enough; you've then got your individual incar environment to deal with. 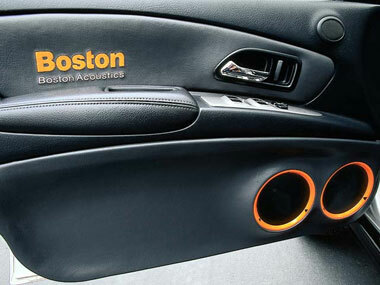 See each and every car on the planet possesses an utterly unique acoustic signature. 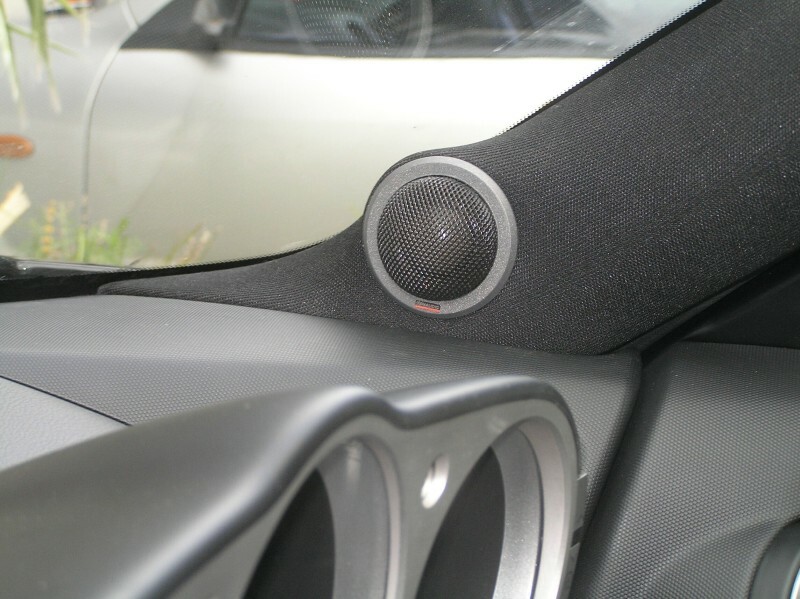 Therefore unless the speakers are installed in your particular car, they won't even approach sounding like your particular car. Think of it this way; you're looking to test drive a new sports car, therefore the dealer puts you into a truck for a test drive. Conceptually they're the same, in that they both have a steering wheel and an engine; but they�re hardly what you'd call similar. It's no different for sound. So how does one choose? Now that all said we don't just leave you completely in the dark but quite the contrary actually; in that we have numerous demo cars available for you to audition so you can get a feel for different brands. However the cold hard reality is that even that's not an accurate indicator, despite it being vastly superior to in-store demo walls. Realistically somewhere along the line you'll have to rely on someone else's advice. Now that doesn't mean old mate on the internet who once read the loudspeaker cookbook years back, but rather someone who not only installs speakers incessantly but also designs, develops, tests and reviews them too. That's where we come in. See we first invite you to sit through an Acoustic Garage session, during which we'll get you to listen to various cars and whilst peppering you with endless questions. Thenceforth we'll make an educated recommendation based on your answers. 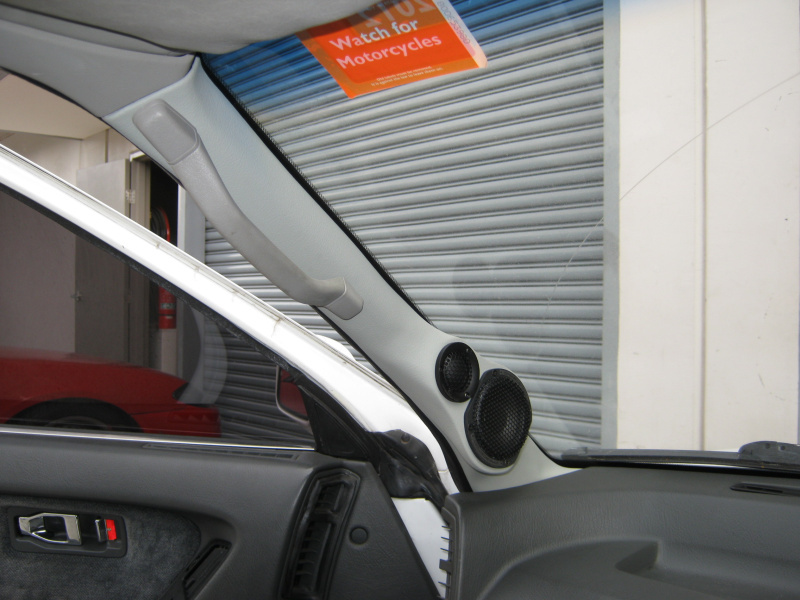 We often get asked what speaker pods and door trims are available for different budgets. 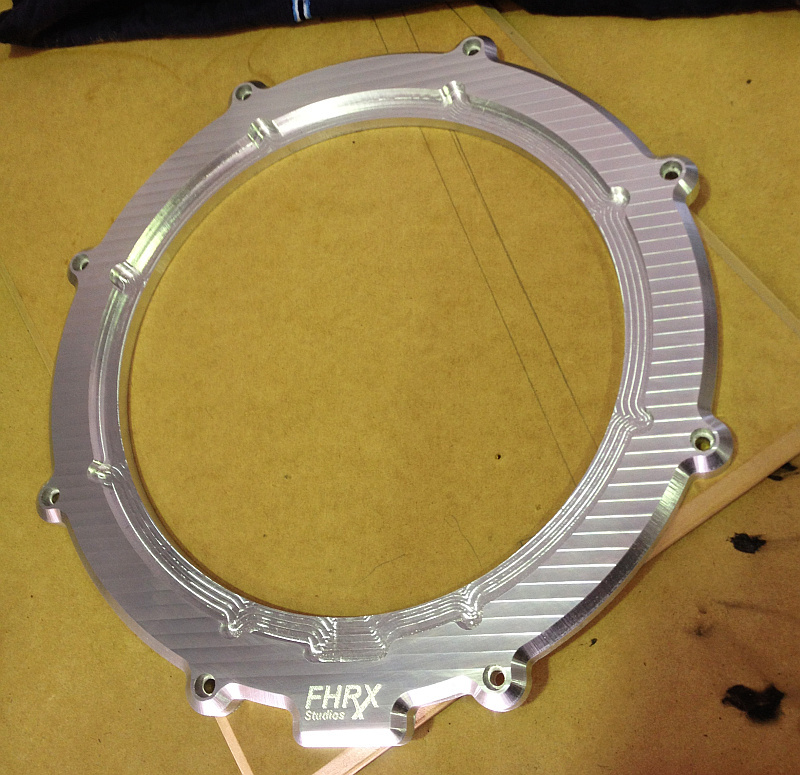 Below are some of the more common speaker pods and door trims we make here at Fhrx Studios. 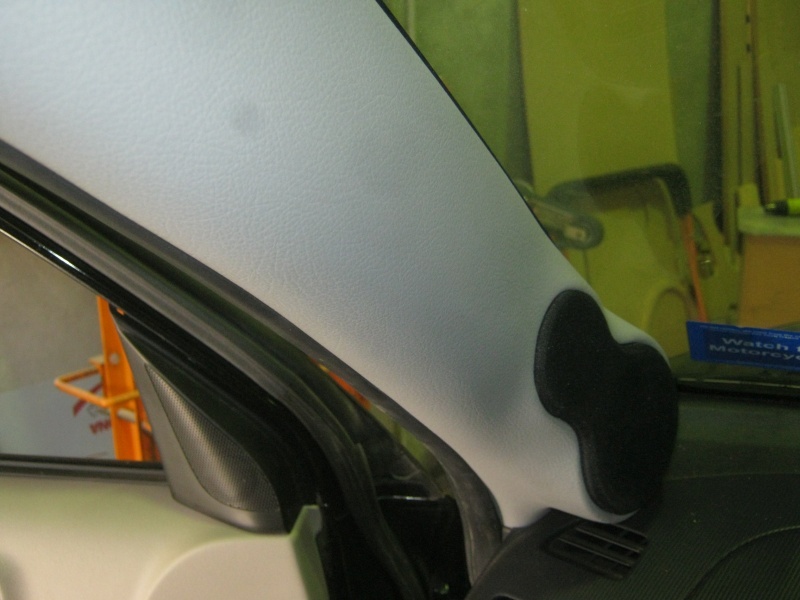 Remember many of these pods are colour matched then dyed or painted as opposed to using off-the-shelf trim. 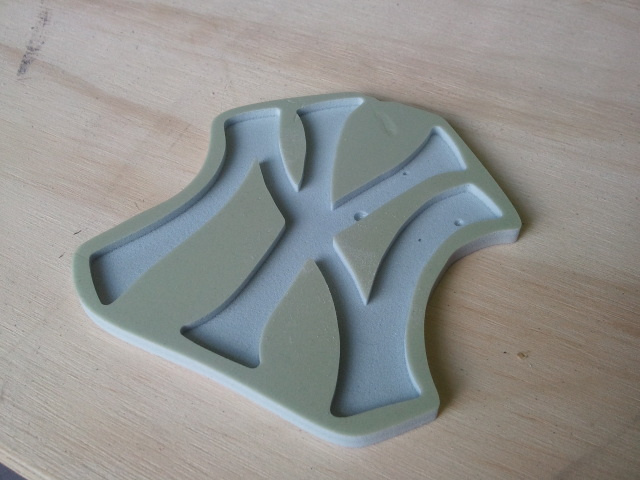 Many are also vacuum formed rather than hand formed. This often incurs extra costs. Bolt-on pro-pod. 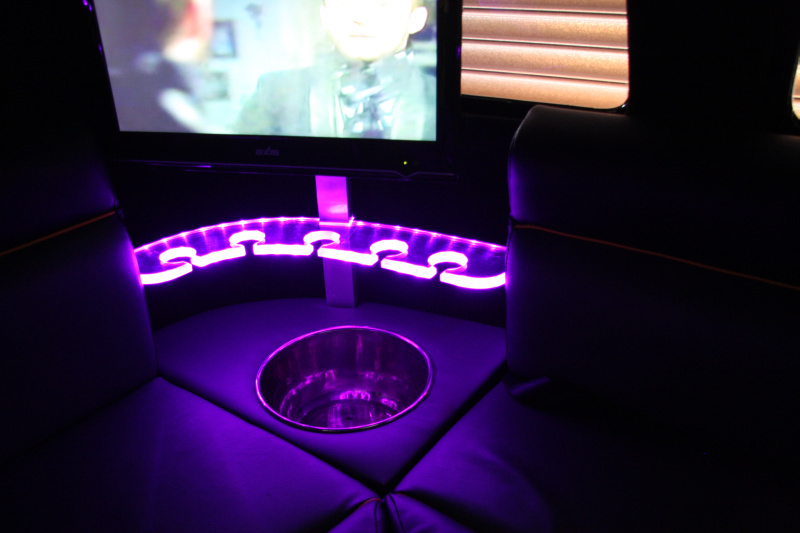 These are pre-built pods that come in a large variety of shapes, sizes and colours. They can also be colour matched then dyed or painted in two-pac. Approximate price is $50-200 each depending on complexity. Bolt-on custom pod. 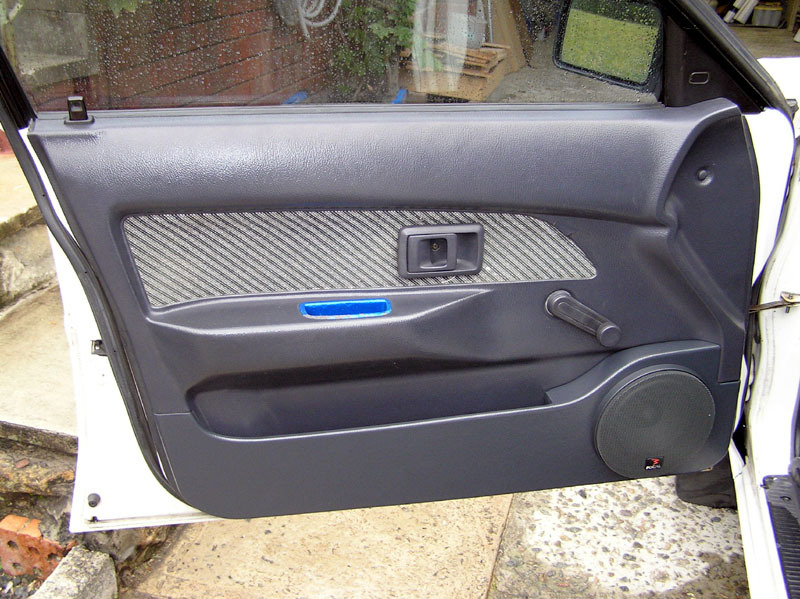 These are slightly more complex than pro-pods and are made to match the theme and lines of the taret car's door. 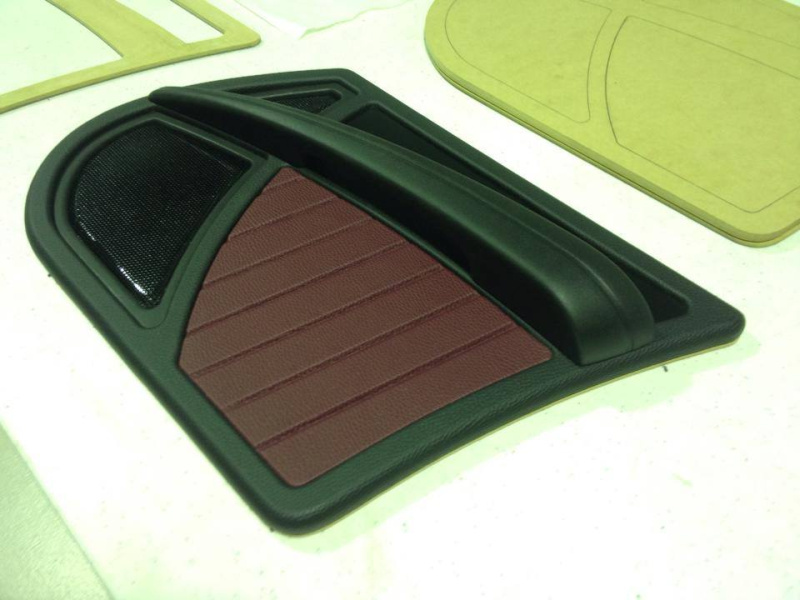 They can be either painted or dyed to match the trim. Approximate price is $200-500 each depending on complexity. Bolt-on custom pod with full cover. These pods are similar to the basic custom pod except they're covered fully in grille cloth to offer maximum security and protection from sunlight. Approximate price is $200-500 each depending on complexity. 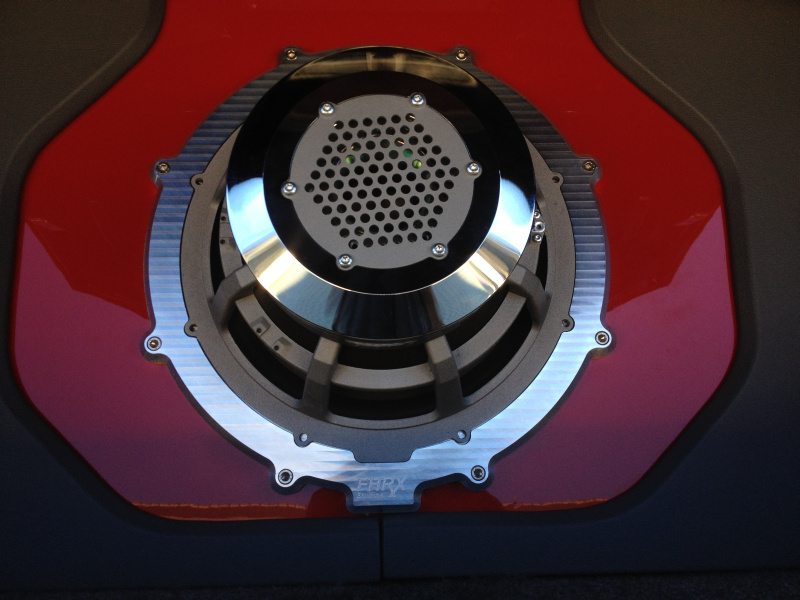 Bolt-on custom pod with grill. 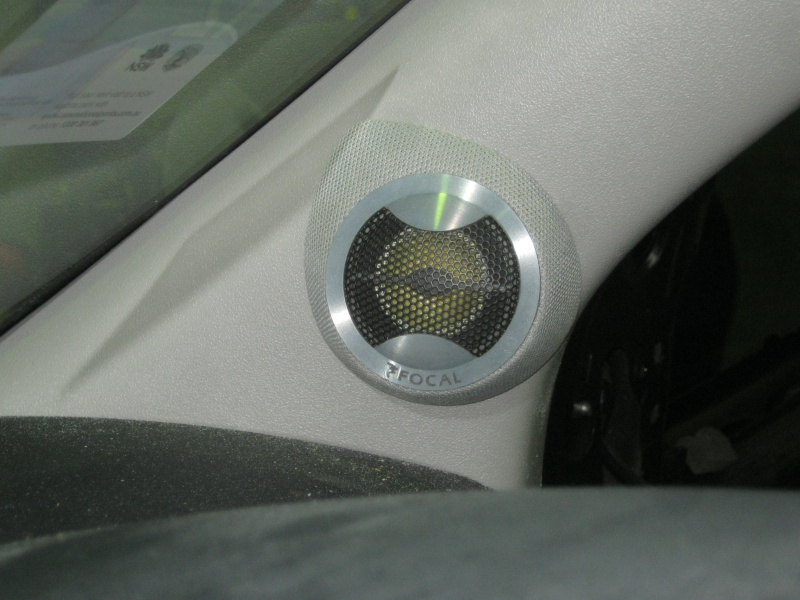 These pods are essentially the same as custom pods but have a grille cloth insert to protect the speaker. Approximate price is $250-550 each depending on complexity. Full lower door bottom pod. Bolt-on custom pod. This is the most complex bolt-on pod. 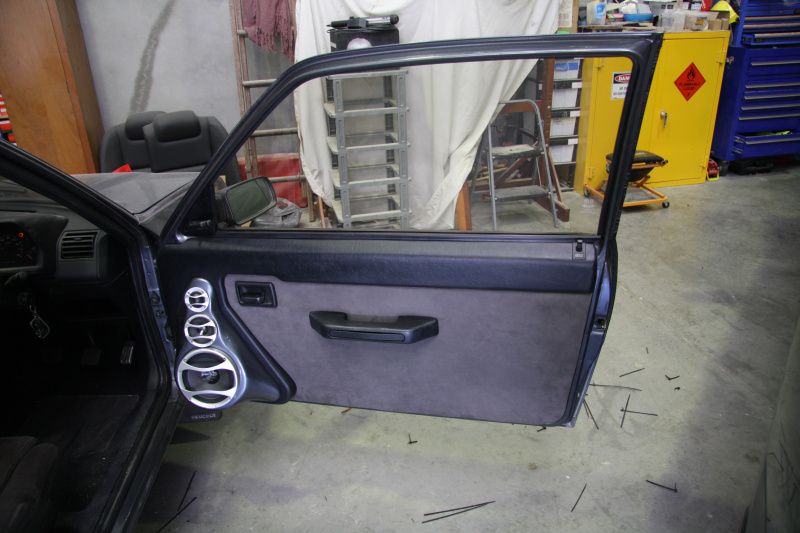 Fully custom made to match the door contours. 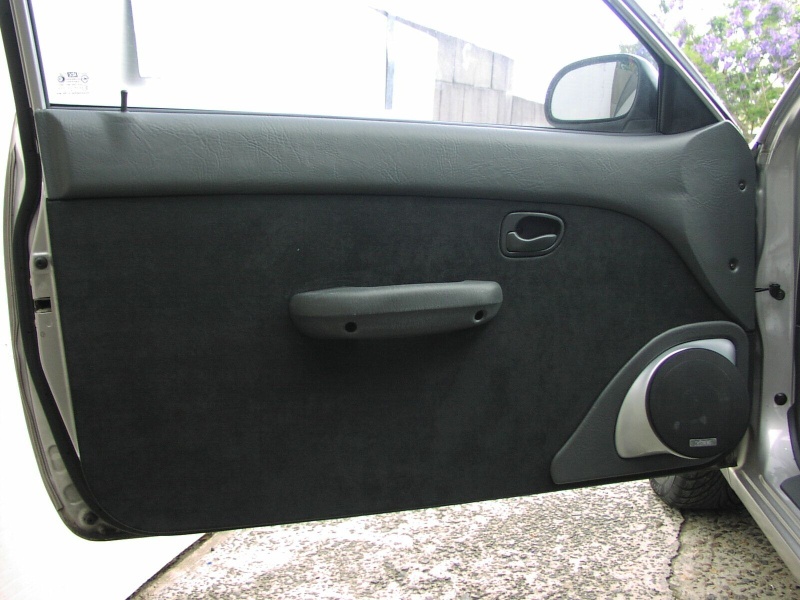 It is usual trimmed in vinyl and colour dyed or painted. Approximate price is $350-550 each depending on complexity. 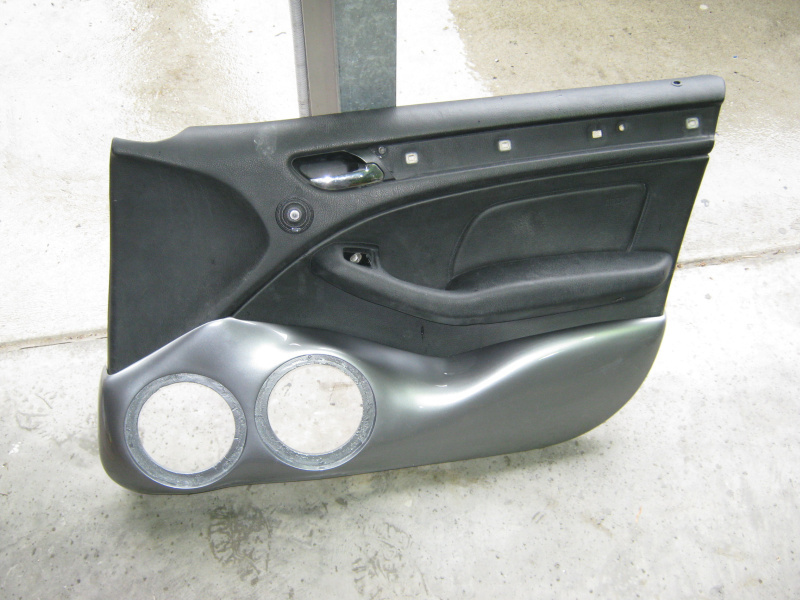 Moulded full door bottom pod. 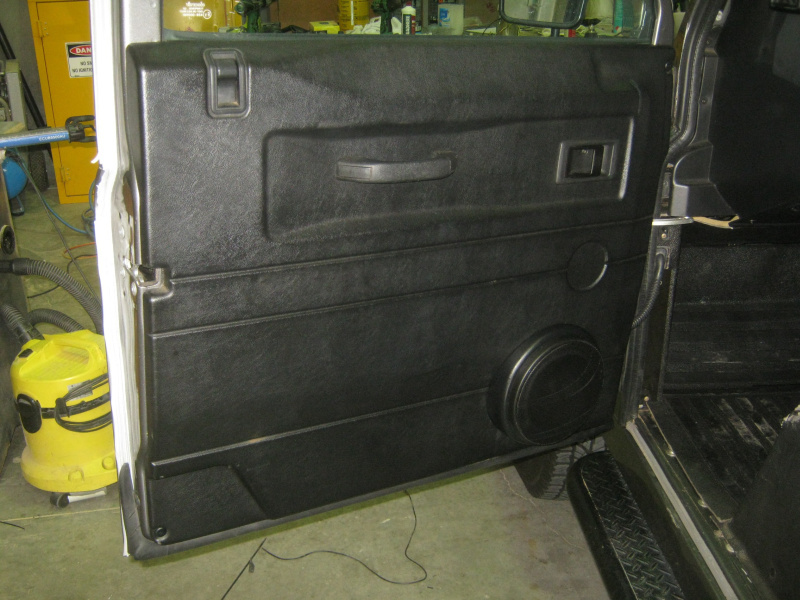 These are made to replace the entire bottom of the door and are fully moulded from fibreglass or kelvar. 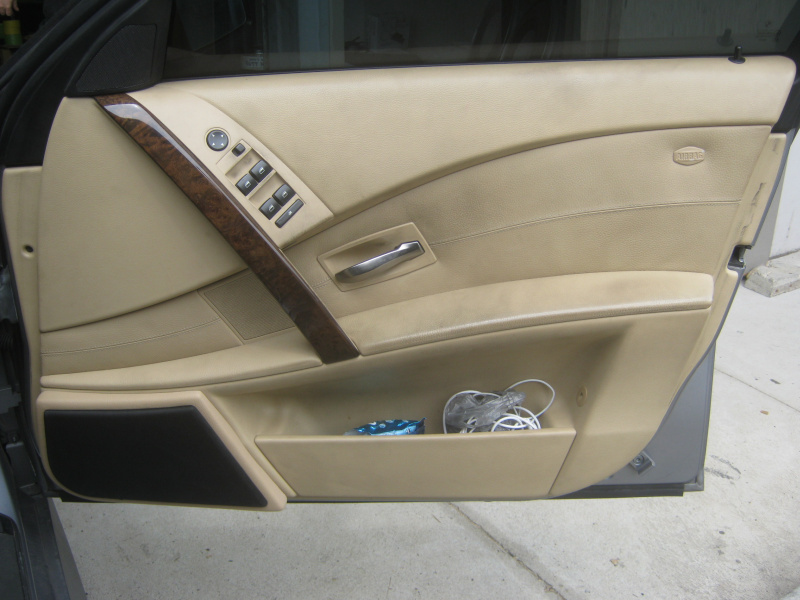 They are then dyed or painted to match the door trim. 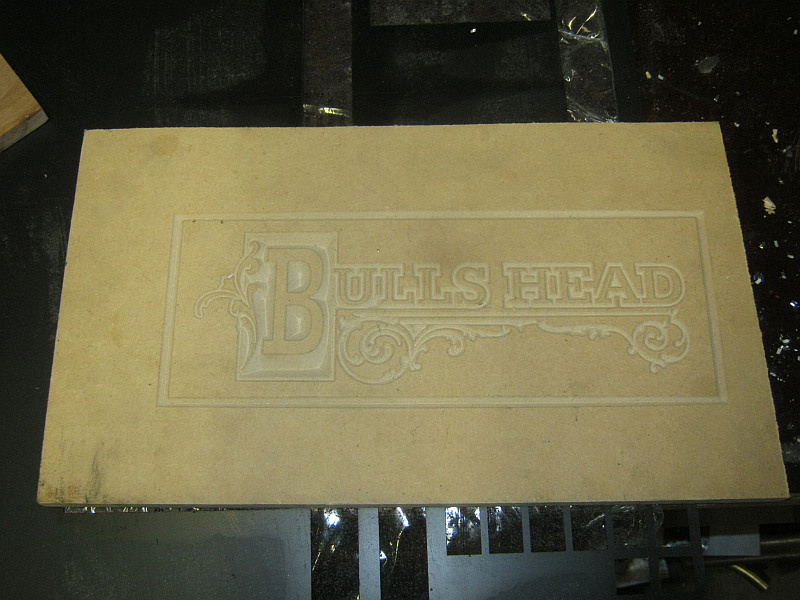 Trim is usually done with a vacuum forming machine. Approximate price is $550-1150 each depending on complexity. 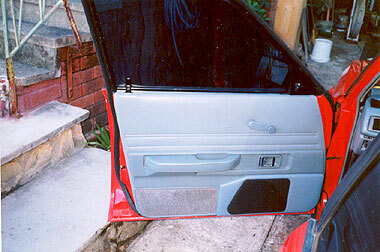 Moulded full door. 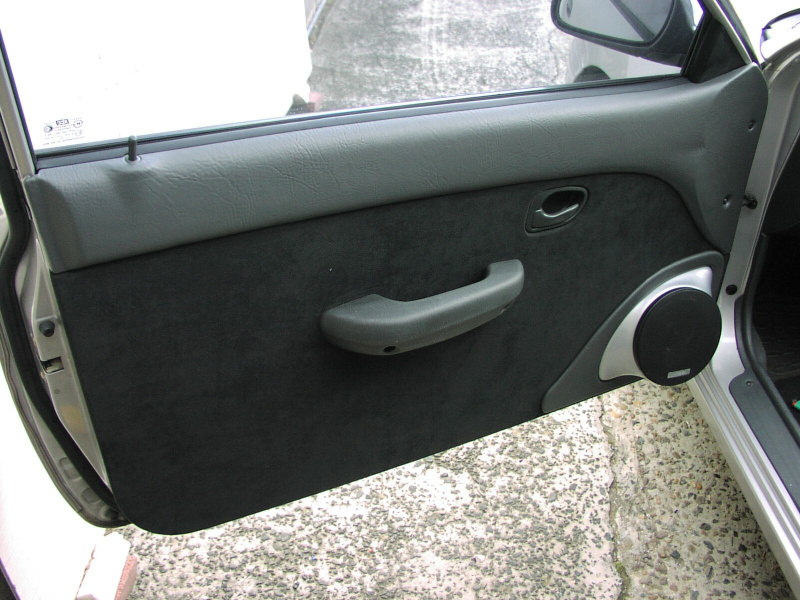 These replace the entire door trim and are custom moulded from either fibreglass or Kevlar, colour matched in vinyl dye and vacuum formed. Approximate price is $800-2000 each depending on complexity. 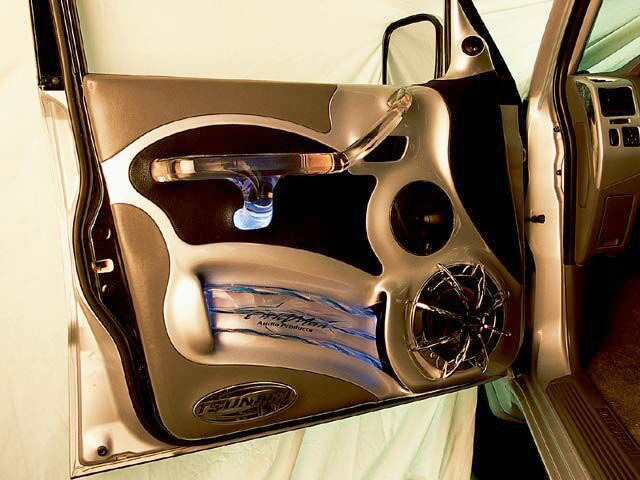 All out custom full door. 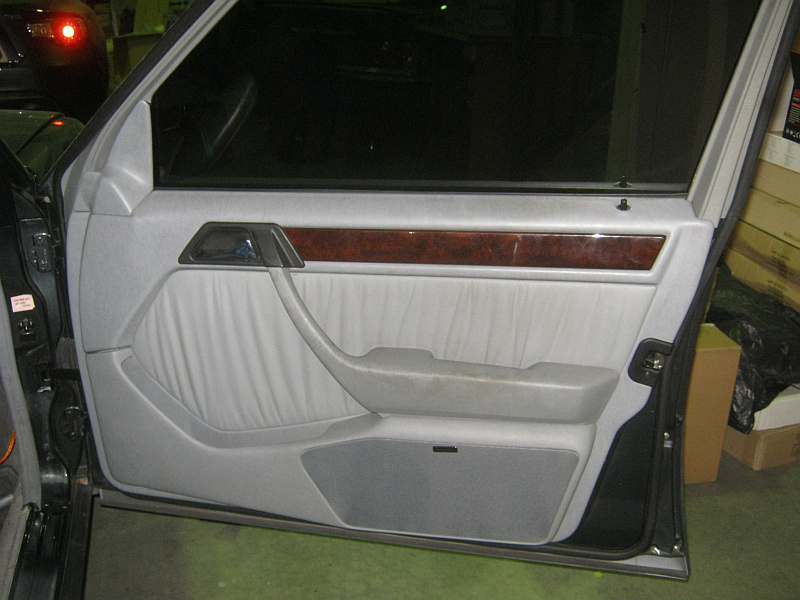 These are the most complex door trims we make. 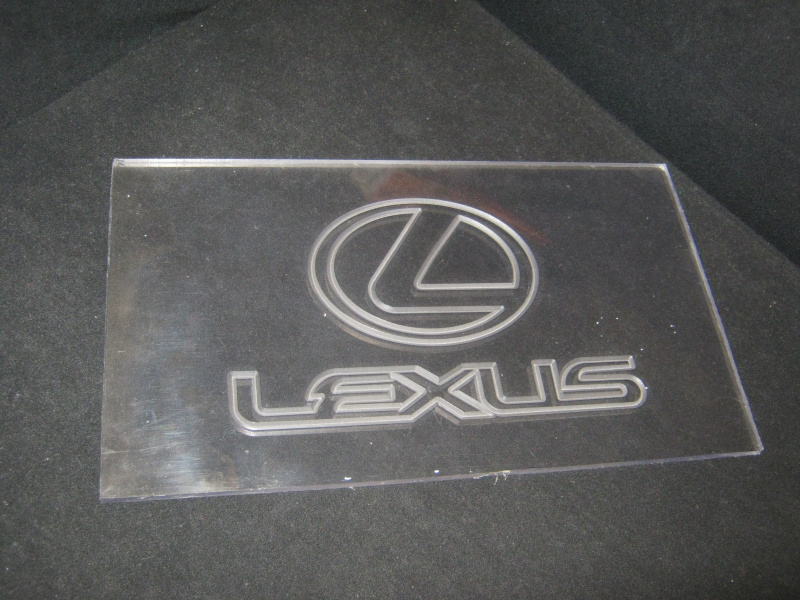 They are fully custom and can include moulded fibreglass, kevlar, perspex, metals, porcelain and even accuation. These pods are usually trimed using a vacuum former and often painted. Approximate price is $1500-3000 each depending on complexity. Other sizes are available of course and full custom ones are also available too. 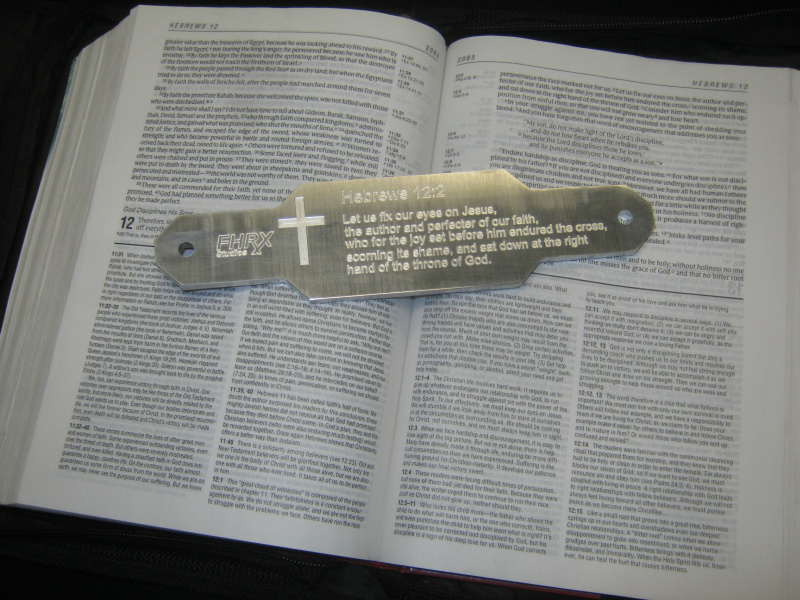 Prices for these custom items are available upon request. If your speakers are out of phase, imaging will be vague and bass output will be reduced. To ensure that your speakers are hooked up in phase, check to make sure that the positive and negative leads are connected the same way to both your speakers and your receiver or amp. Make sure red is connected to red, black to black, etc. Check for correct phasing... With a 9-volt battery. Disconnect the speaker wire from the amp. Touch the wire you think is negative to the negative battery terminal (the big one). Touch the positive wire to the positive battery terminal (the other one). If your speakers are wired in phase, the speaker cone will move "out" and stay there. If they are out of phase, the driver cone will move "in" and stay there. (This won't help you for tweeters, only midranges and woofers. So when you're wiring your tweeters, be careful. Do it right the first time.) 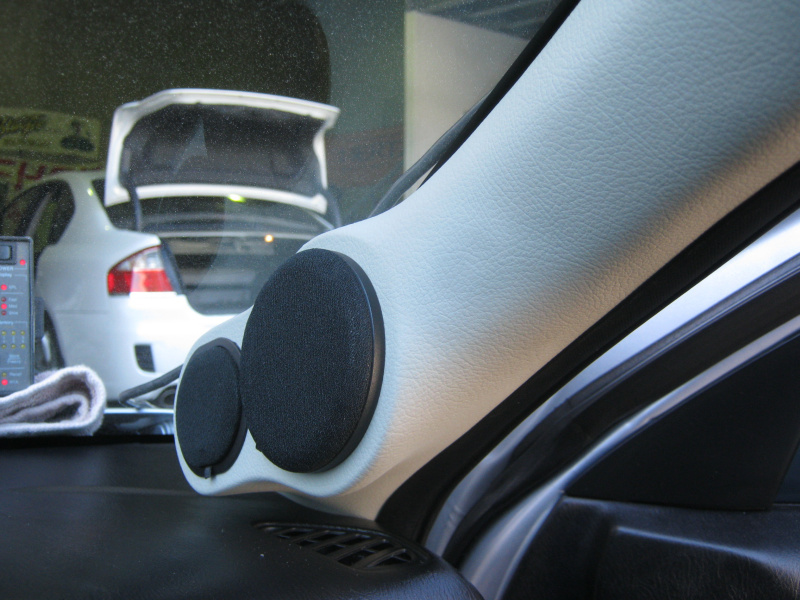 Phasing is never absolute in car audio situations, since speakers are rarely facing the same directions. Phasing differences mostly affect bass. Is your system lacking bass? Try changing the phase on your sub system. 90% of the time, that's the key to more bass! Proper setting of your front-to-rear fader and left/right balance controls is important for optimum staging and imaging in your system. 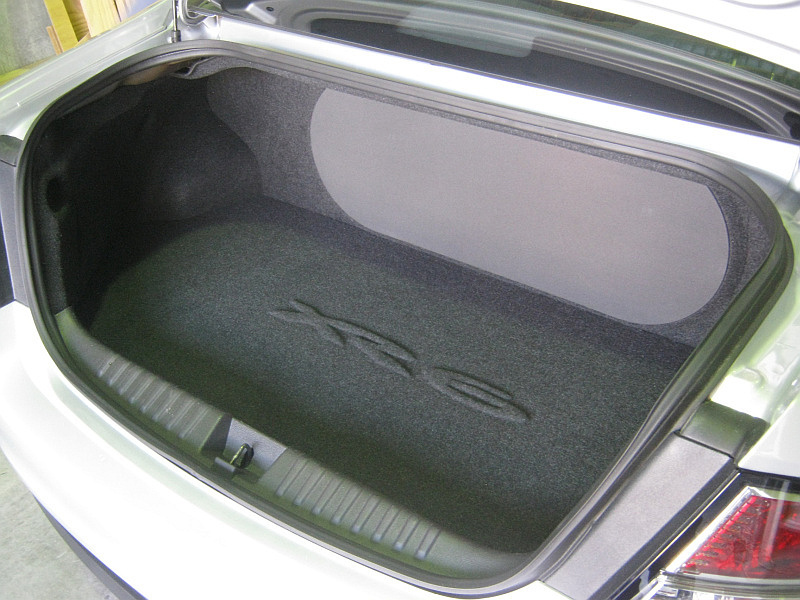 Too much sound in the rear of the car (sometimes called "rear fill") will often eliminate staging altogether, forcing sound away from the front of the car, while too little rear fill will sound dull. 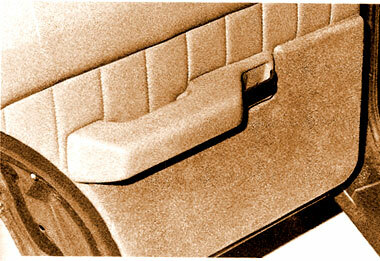 Too much sound on one side of the car or the other will add an unrealistic element to the imaging. 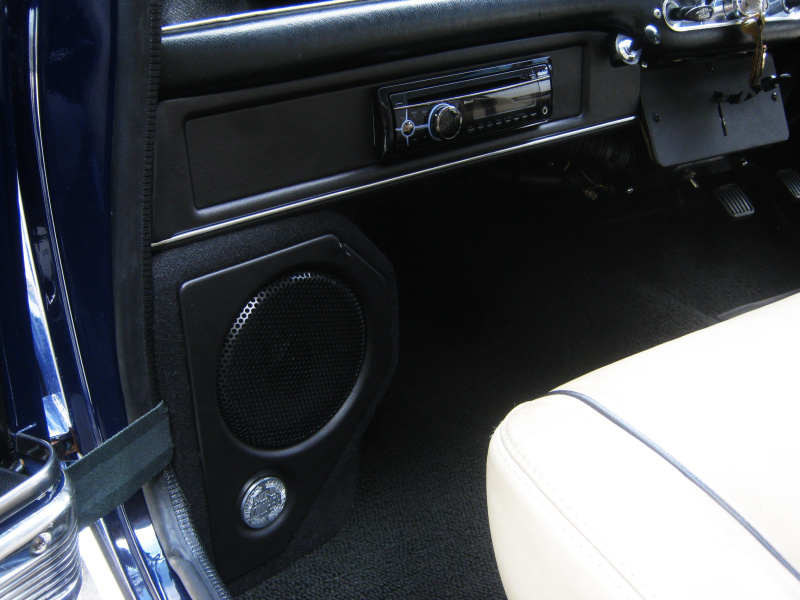 To adjust fade and balance, play a tape or CD you are familiar with and turn the rear speakers on full with the fade control. 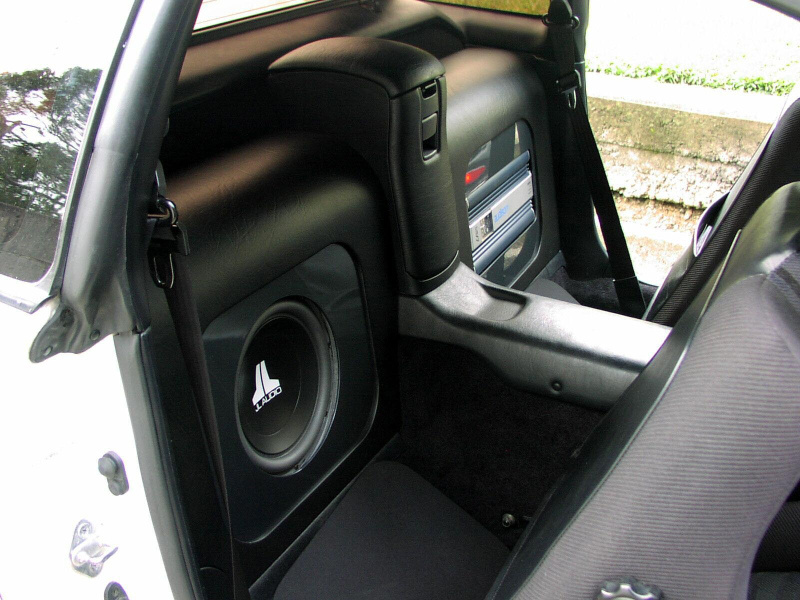 Listen to the rear speakers, and then slowly turn the fade up in the front speakers just until you can't tell the rear speakers are playing anymore, then ease off a tad. 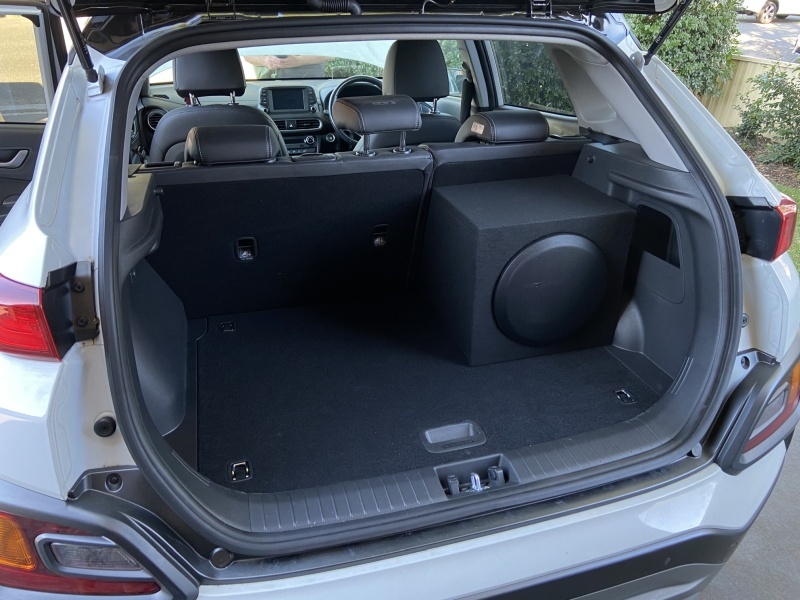 You're probably close to optimum setting when the front staging is such that the rear speakers provide little more than ambiance and space to the sound. Test it by going full on the front speakers (without losing the position you just attained). 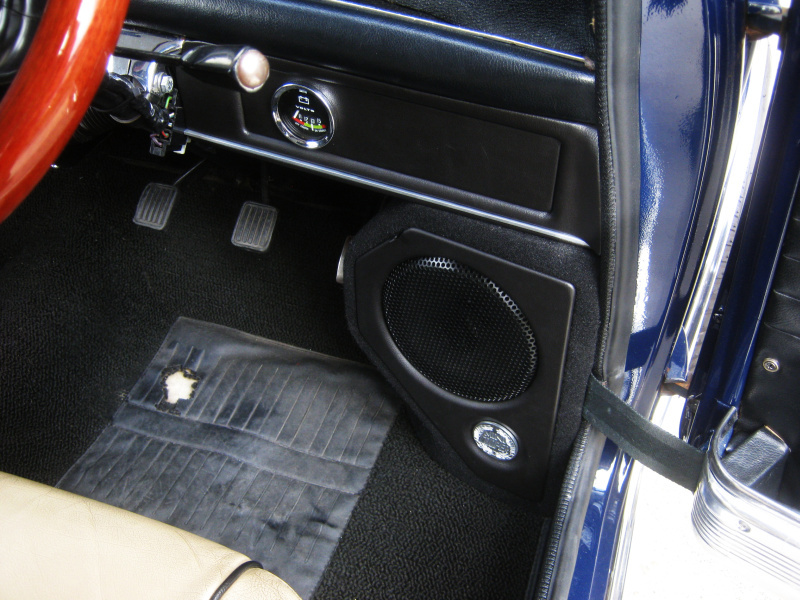 You'll hear an immediate loss of spaciousness in the sound with the rear speakers faded all the way down. Return to your optimum setting. Setting the balance is more difficult, so it's always a good idea to leave the balance fader at the "12 o'clock" position. That's as close to equal as you're going to be able to hear with your own ears. It most certainly can. Prolonged exposure to sound pressure levels above 85dB will cause permanent hearing damage. Professional audio competitions specify the use of hearing protection devices for their contests, especially at higher volume levels. 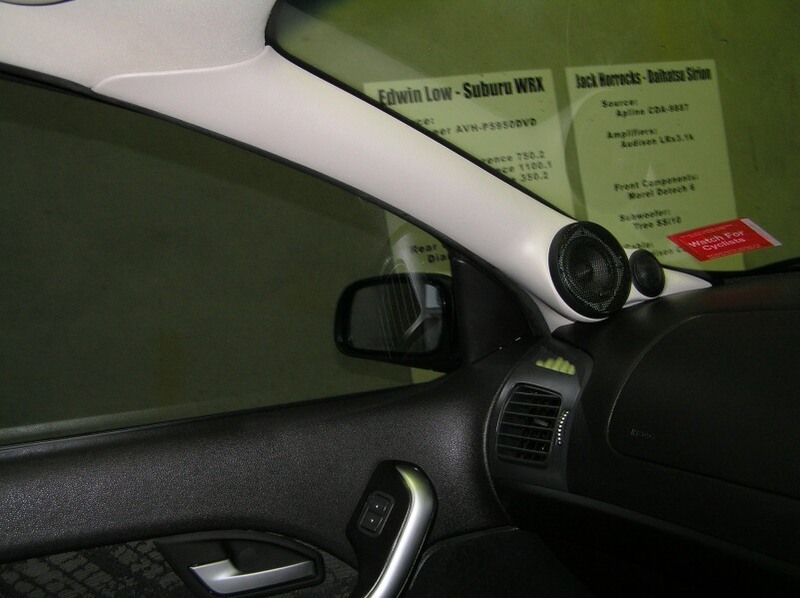 You can test the dB level of your car stereo with a Sound Pressure Level Meter (available at electronics stores). If you're disoriented and your hearing is sort of muffled after you've been listening to your car stereo, or you hear ringing in your ears, then turn it down! If you have to shout at the person in the passenger seat, and you're not angry with them, then it's a good bet that your stereo is too loud. For the sake of your hearing, turn it down. Sure is. 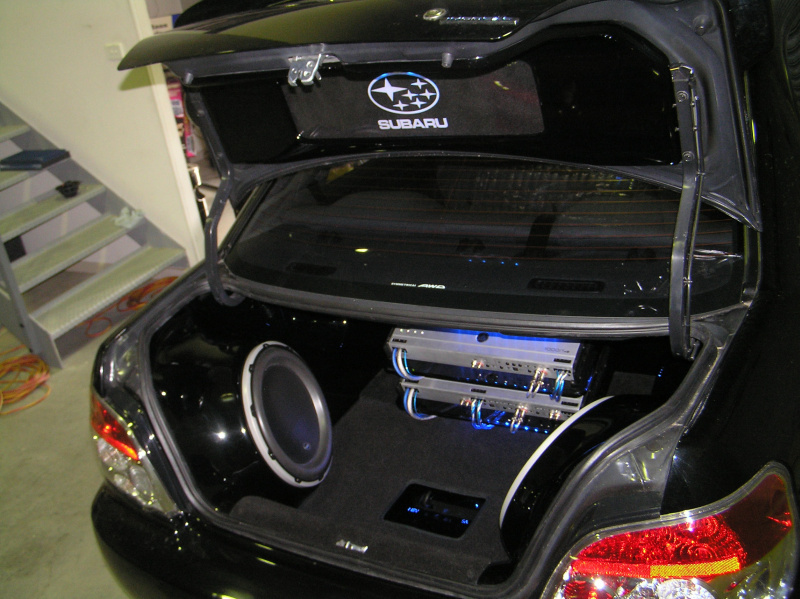 The gang and Marty, along with literally thousands of other car audio nuts can be found on various forums around the country, by far the largest of them being Mobile Electronics Australia. 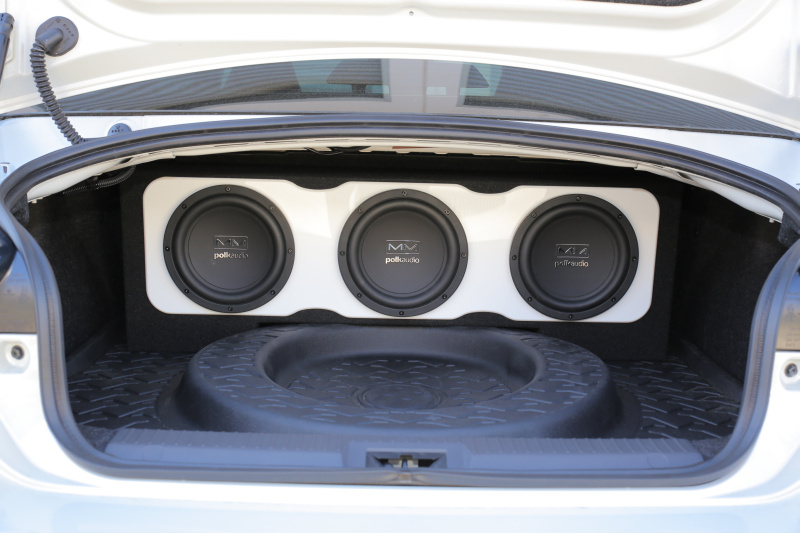 When it comes to achieving sonic bliss in your ride and getting the most from your audio system, most people simply focus on the speakers themselves and nothing else. They'll canvas just about every aspect of them from build quality and the materials employed through the power handling, size and weight. Then there's the home in which the speakers will live. Much consideration is given to deadening, enclosing, porting, filling, loading and all matter of other aspects - even the speaker cable gets a look in. What about the component driving the speaker though? That simple heat sink covered metal box with a few gold terminals on the end? You don't really need to worry about the amplifier so long as it's powerful enough right? Just like when you're considering the purchase of a new car the only thing you need to look at is the power output of the engine alone right? Well actually; wrong. The amplifier is a most important element in your system however when choosing one there is more than just power output you need to consider, lest you splash out a couple of grand on one that could potentially sound terrible. Speakers are pretty simple and indiscriminate devices - sure their names and materials can certainly get quite exotic but that still doesn't detract from the fact that at the end of the day they're just pushing and pulling air around in the form of compression and rarefaction waves. Yes friends that's pretty much all they do; move their cones forward and backwards. It's actually the device driving them that dictates how controlled your music sounds, how much hiss it has, how distorted or clear the midrange and treble is, how defined the bass notes are and so on - these attributes are all controlled by the amplifier. So don't let's concentrate on the speakers so much but the driving force behind the music. After all you don't just concentrate solely on your tires when you're trying to go faster do you? Before we get down to discussing the various performance attributes you'll see commonly associated with amplifiers let us first have a look at the various modes or operation, or classes. 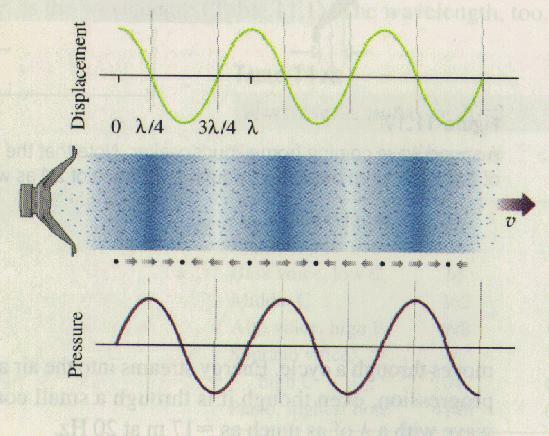 Analogue amplifiers are classed according to how much current is flowing during each wave cycle (or Hz) and this is measured in degrees, where 360� means the current is flowing during the entire cycle. There are many different classes of amplification but most are derivatives of either class A, B, AB or D so let's take a closer look at these four. Most class A amplifiers use the same output transistor to reproduce both the top and bottom halves of the audio waveform and seeing as it's reproducing both halves it means the transistor is always on with full current flowing through it - even if it has no audio signal (i.e. it runs 360� of the cycle and never stops flowing direct current). This lends itself to quite serious inefficiency as you can imagine, not to mention the fact they also run very hot because what current isn't being used for the music is converted into heat - as much as 85% of current running through a class A amplifier can be bleed off as heat at any given time. The reason people use class A amplifiers though is that it's widely believed that the class A design sounds best compared to other configurations. Whereas class A amplifiers utilise the same transistor for the entire waveform, class B amplifiers instead use twin transistors (or groups of transistors). One transistor reproduces the top (positive) half of the waveform while the second transistor produces the bottom (negative) half of the waveform - basically each one does 180� apiece. This is ultra-efficient because in the class B design there is usually no idle current flowing through the output transistors when there is no audio waveform. Now this would be perfect except that all transistors require a small amount of current to turn on and whilst they're consuming this power it causes a blip in the sound waveform to occur. Therefore they're not ideal for true sound quality despite being extremely efficient and thermally superior to the class A design. So from the two aforementioned classes we can see a dilemma starting to present itself. We want maximum sound quality and control when outputting a waveform but we also want maximum efficiency and least amount of heat possible. This is where the class AB concept was born. Class AB amplifiers also employ two groups of transistors like class B amplifiers and for all intent and purpose are very similar in design. But as we said above; transistors require power to switch on and this is where the class A part comes in. What if we could still produce the amplifier waveforms like a class B but have at least a little bias current always running through the transistors so they remained switched on therefore eradicating that blip in the waveform? This is exactly what class AB amplifiers do and is what most 'analogue' car audio amplifiers are today. They're about 60% - 70% efficient and are considered to be the optimal compromise between the two classes. So if that's analogue amplifier classes covered then what are these new digital ones all about? Well in actual fact 'digital' amplifiers are just class D analogue designs but to understand class D (sometimes called switching) amplifiers we need to first have a look at voltage and its relationship with current which means examining Ohm's law. 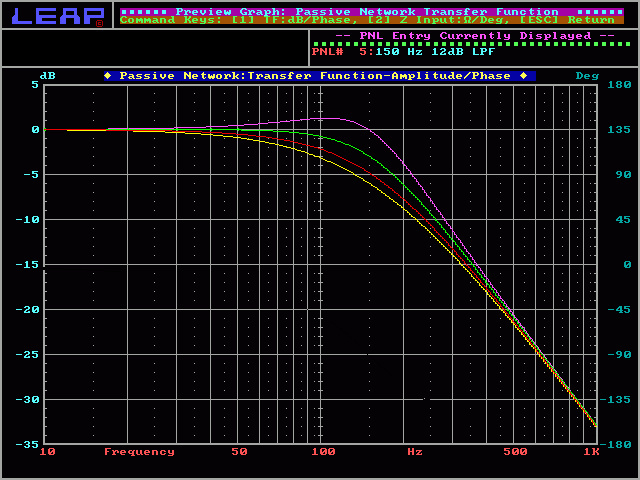 Class AB amplifiers are more efficient than class A but that said they still generate quite a bit of heat. The reason that these amplifier configurations are inefficient can be traced back to Ohm's law P = I * E (where P is power, I is current and E is voltage). Because in AB designs there is a difference between the voltage across the output transistors and current flowing through them, there will be power dissipated in the form of heat. The power consumed when this heat is generated is basically wasted and this is their inefficiency. Looking again at Ohm's law; we see that when there is virtually zero voltage drop across a transistor there can be a significant amount of current flowing through it with hardly any power dissipation in the form of heat - it's super-efficient in other words. The same can be said for the reverse - for if you have a significant voltage running across the transistor but no current flow then again; there will be little or no dissipated power in the form of heat. Basically looking at P = I * E again, you can see that if either current or voltage are near zero then power dissipation as heat will be very low. Now that we have that out of the way we can have a look at what makes the switching design so efficient. In the class D design the output transistors are either completely switched on or completely switched off. When a transistor is conducting (that is; switched on) there is virtually no voltage across it. When the transistor is switched off, there is no current flowing through it. 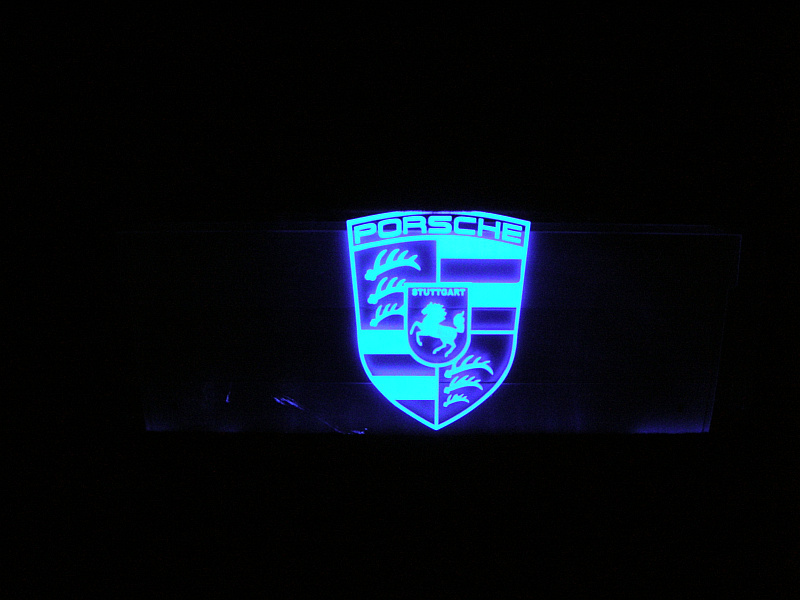 This means the design is inherently efficient - usually to the tune of over 90%. The reason class D amplifiers are usually called digital is because these transistors are usually digitally switched on and off rather than via analogue voltage - there is no such thing as a true digital amplifier because sending 0's and 1's to a speaker will get you nowhere. The output stage still needs to send AC current down the speaker wires to the voice coil. We now have a basic understanding of the main amplification classes. It gets a little more complicated when you start factoring in additional classes such as class G voltage following / switching amplifiers and class T tri-path designs but let's just stick with the main four for now. 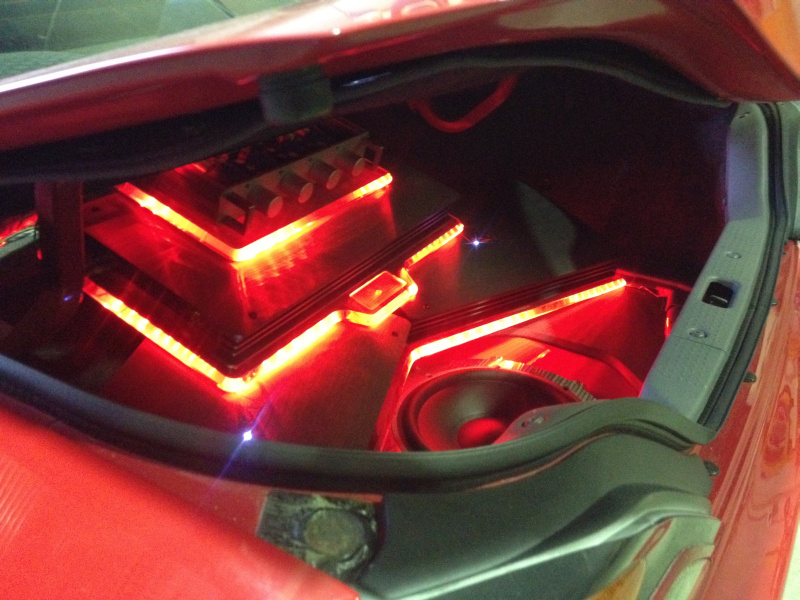 From here we'll move onto the main function of the amplifier which is raw power output. When talking power ratings of amplifiers remember how much power you 'need' is radically different to how much you should 'want'. The golden rule though is that you can never have too much power. Even if you only need ten watts - a thousand watt amplifier will be happier providing it than a ten watt amplifier is despite the fact both in theory 'can' do it. 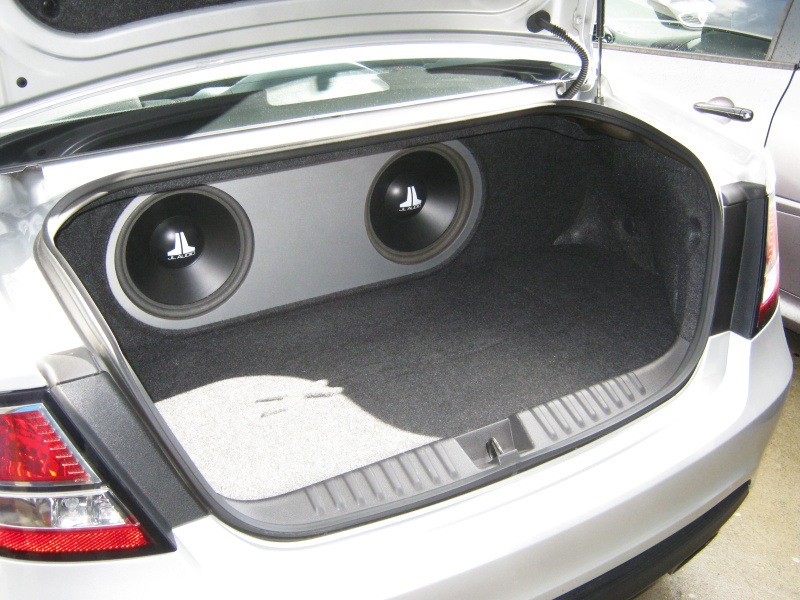 The reason we aim for the larger amplifier is that the gains can be set lower therefore offering you more headroom. 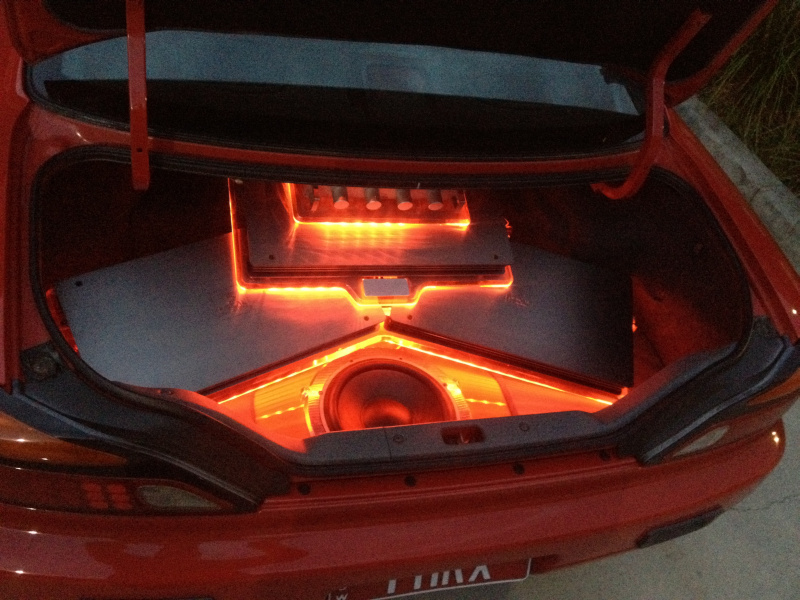 Headroom is the excess power you have above what the amplifier needs to control the speaker effectively. So if you have a 10 watt speaker running from a 100 watt amplifier, then in theory you have 90 watts headroom. 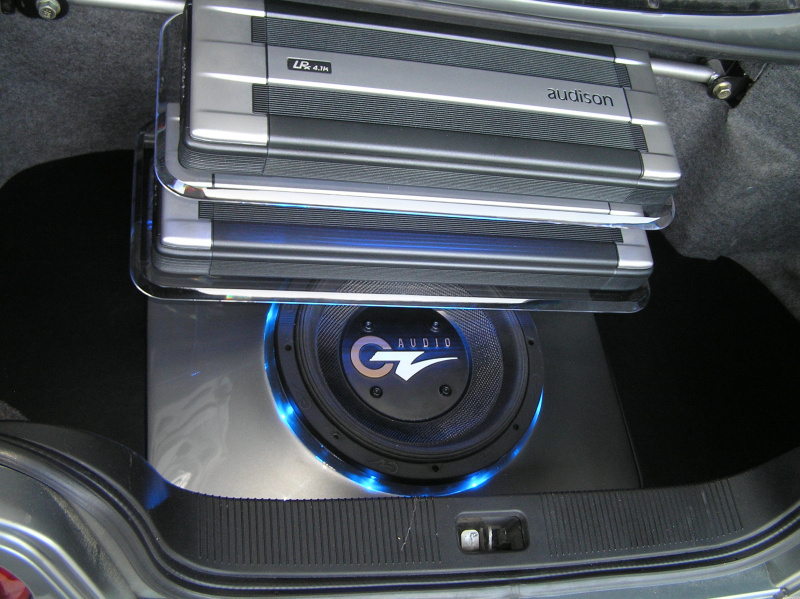 The more headroom you have the happier the amplifier is doing its job. There will be less hiss and whine output, it'll run more efficiently, it'll run cooler and most importantly it'll stay well away from clipping which is a sure fire way to ensure your speakers destruction. Think of it as towing a caravan; both a small car and a truck will tow your average sized caravan however the latter does it with a lot less effort. As opposed to how much power you 'want', when looking at how much you 'need' you might be surprised to learn that bigger doesn't always mean louder. Open cut mining trucks have over 7000 horsepower whereas a Hayabusa only has a couple of hundred - therefore which is faster? 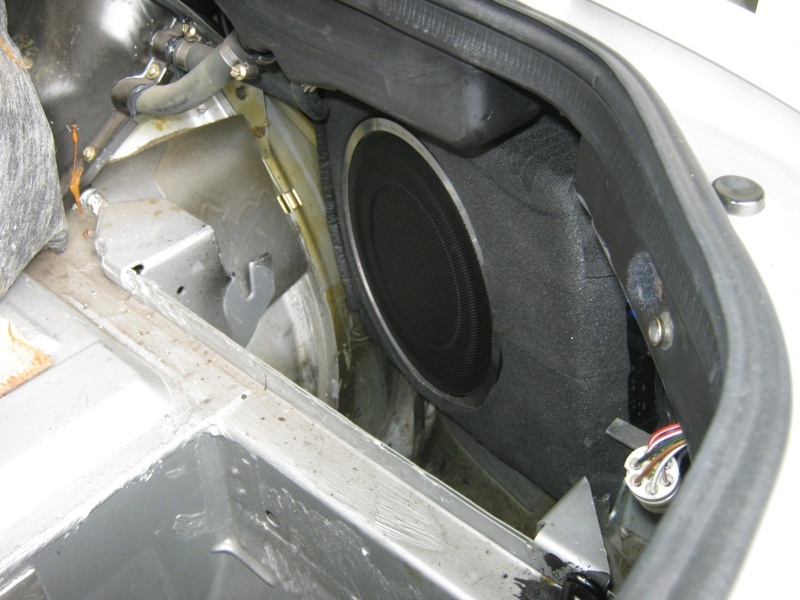 Speakers are the same; just because a subwoofer has a power rating of 1000 watts doesn't mean it's necessarily loud - it might have extremely stiff suspension, possess a very heavy motor, have a steel cone reinforcement retainer or it might simply just have a large diameter voice coil because the magnet is located in the middle on the pole. Furthermore; higher level speakers tend to employ lighter and more exotic space age elemental materials which are extremely strong but lightweight so they only need a fraction of the power to produce maximum output. The crux of the matter is that while you should buy the largest amplifier you can afford, don't go overboard chasing titanic power figures at the expense of attributes such as damping factor, slew rate, total harmonic distortion, signal to noise ratio and channel separation. Now that we've made mention of these other ancillary specifications let's examine them in more detail. Starting with damping factor; this describes an amplifiers ability to control a speaker cone. 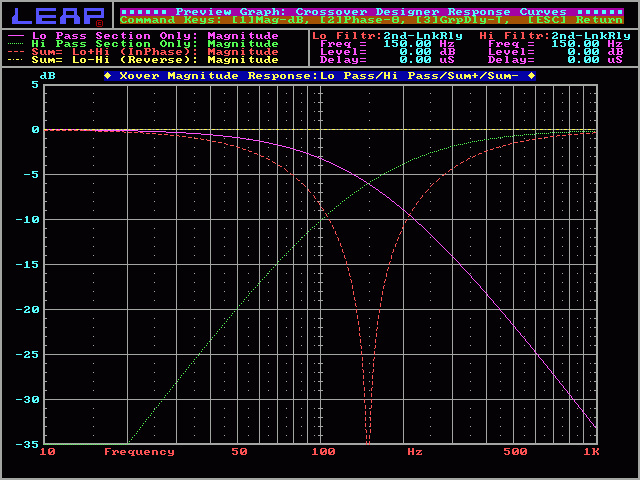 It's the ratio of rated load impedance to the internal impedance of an amplifier. 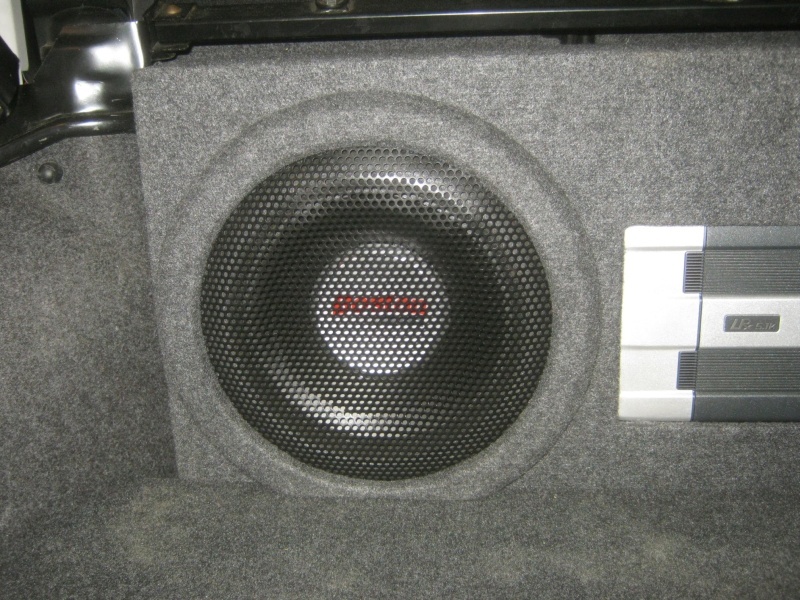 The higher the damping factor the more efficiently an amplifier can control unwanted movement of the voice coil and this is especially vital for subwoofers. The higher the damping factor the better although it's debatable whether anything over fifty is audible. Damping factor is calculated by dividing the speaker impedance by the output impedance of the amplifier. In other words the damping factor will decrease as the speaker's impedance decreases. This means an amplifier optimised for operation at four ohm will provide tighter bass than if it's forced to run at two or one ohm. An inferior damping factor will leave bass notes sounding soft and undefined, regardless of the amplifiers power output. It is for this reason that a smaller amplifier with a higher damping factor is better than the reverse situation (provided of course that the smaller amplifier still has adequate minimum power). Slew Rate, which is sometimes referred to as damping factor for tweeters, describes the amplifiers ability to accurately control fast direction changes of a speaker cone or dome. Have you even turned your stereo up to discover that your cymbals sound like someone throwing a brick through a glass window? That's often because the amplifier simply wasn't fast enough to accurately reproduce the high frequency ring of the symbols - remember humans can hear detail upward to 16kHz - that means changing direction sixteen thousand times a second! Measured in volts per microsecond, a low slew rate softens the definition of a sound signal which blurs transients and causes the sound to appear muddy. A high slew rate means the amp responses faster which ultimately results in crystal clear highs. Total harmonic distortion or THD is the measurement of the how much the amplifier may distort the sound signal through the introduction of added harmonics or overtones. THD figures are usually given as percentages and a THD figure below 1% are generally considered inaudible to most people. However, distortion is a cumulative phenomenon so if your head unit, equaliser, crossover and amplifier are all rated at around 1%THD each; then together they could produce 3% - 5%THD which will be noticeable to most of you. Noise leaking into the sound stream is an ever present problem for any amplifier so to this end you need to keep an eye on the signal-to-noise ratio. The SNR is a measurement of noise level in the amplifier compared to the level of the signal. A higher SNR signifies a greater difference which is better. Technically speaking, it's the ratio expressed in dB of signal power at a reference point in a circuit to the noise information that would exist if the signal were removed (the noise floor). The maximum SNR of the amplifier can be seen as a measure of realistic fidelity. This ratio is basically how much absolute noise it can produce compared to the highest signal voltage it can pass without distortion. 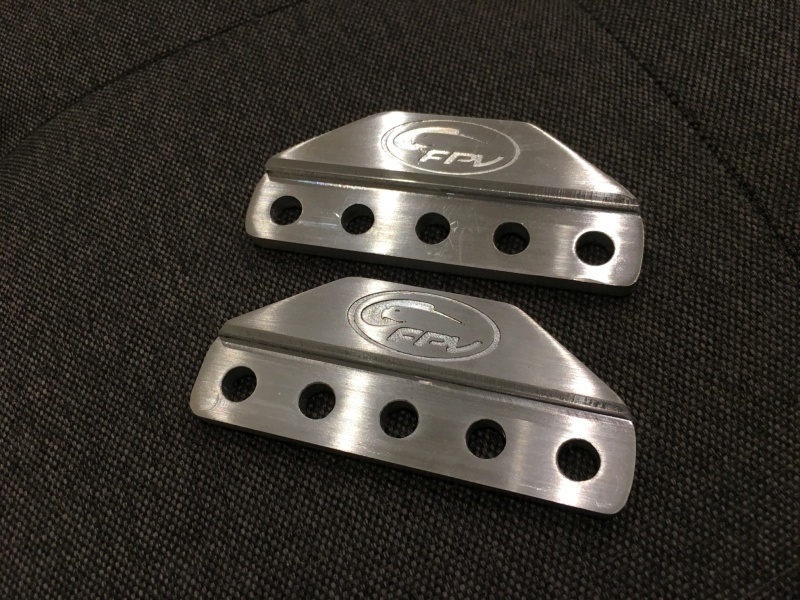 Some companies combat noise by utilising balanced line systems where both the positive and negative input has matched impedances rather than the negative being at the mercy of the chassis' impedance. Last but not least is stereo separation. Separation is not spoken about much but this refers to the amplifiers ability to maintain the separation between the right and left channels. This essentially governs how accurately the amplifier recreates the sound stage. 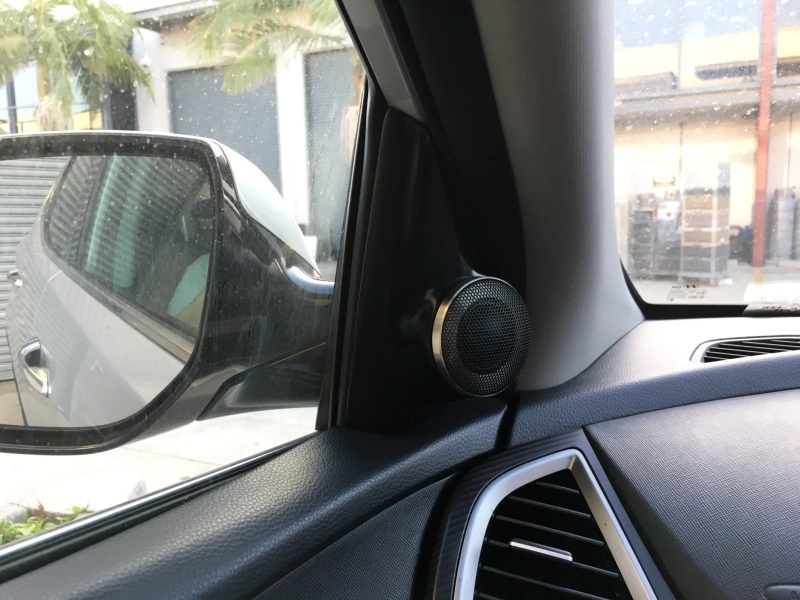 Each individual instrument is usually recorded in its own location within the sound stage and you should be able to hear this in the same way when it's played in your car. This figure obviously doesn't apply to mono-blocks. When looking at amplifier specs you'll often find that they're followed by the term 'A-weighted'. Put very simply, 'weighting' scales are part of a compensation system that accounts for various factors such as the human ears' natural hearing curve. Be careful with heavily weighted figures though because sadly some companies are guilty of using these weighting scales to make inferior amplifier figures appear more attractive. Also take care with the amplifiers presented electrical load. While most amplifiers are stable at lower impedances, this doesn't mean they're overly efficient or happy when loaded down. Your car's engine is 8000rpm stable but it's unwise to hold it there for too long. By the same token many amplifiers are two, one, half and even quarter ohm stable but this is built into their design more for intermittent spikes as the music (which is dynamic) causes the speakers resistance to continuously change during playback. 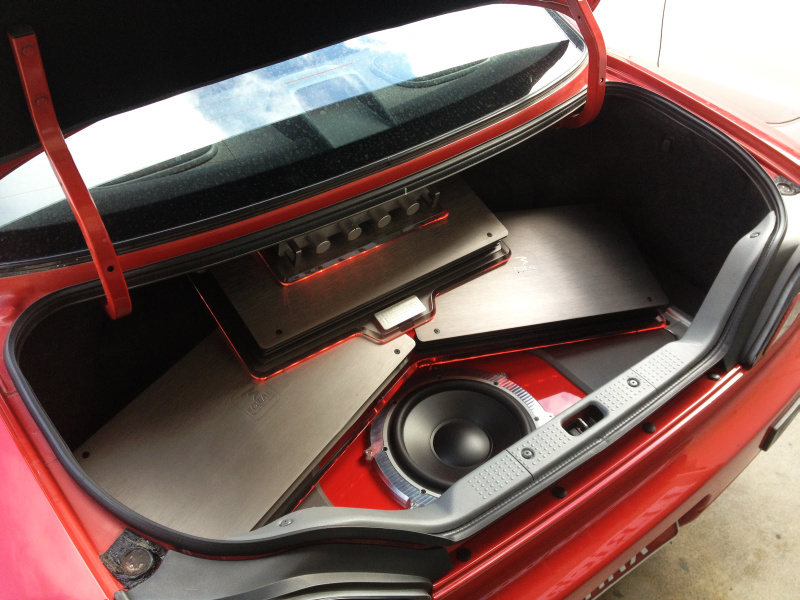 It's not for just strangling your amplifier with twenty 15" subwoofers. 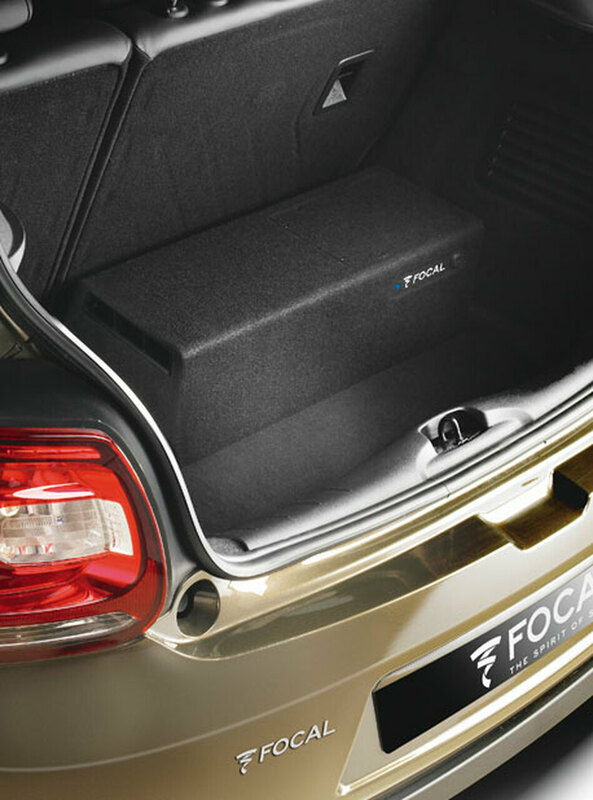 If you need more power then buy a larger amplifier - don't just squeeze the life out of your existing one. These are some of the more important things to consider when looking too purchase to new amplifier. It's not simply just a matter of buying which ever unit outputs the most power. It's a matter of taking all the figures into consideration and ultimately choosing which amplifier best suits your application. Well lets see? Put simply, Ohms is the measurement of electrical resistance and system impedance. It is a measure of the degree to which electrons are limited in both velocity and quantity in passing through a circuit. In Impedance measurements, this takes into account, the mechanical resistance inherent in the motion of transducers. 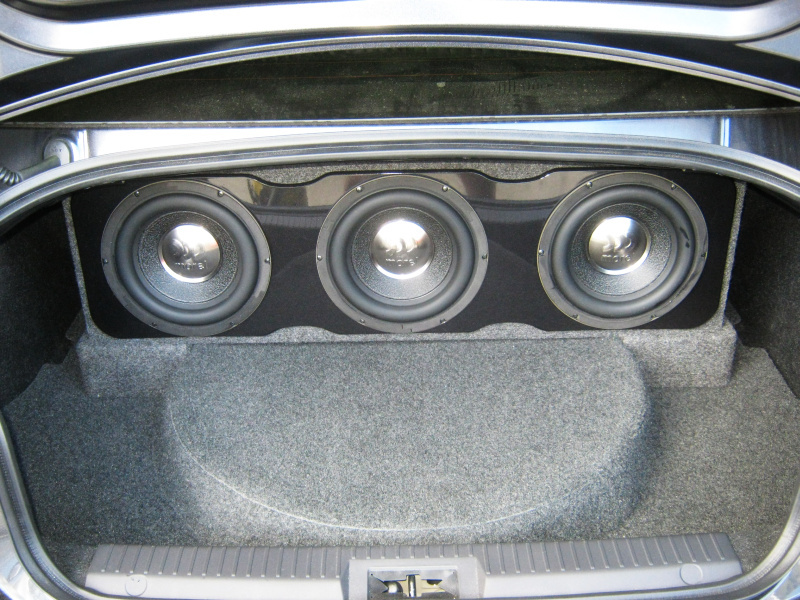 The standard is usually 4 ohms for car audio and 8 ohms for home and commercial audio. 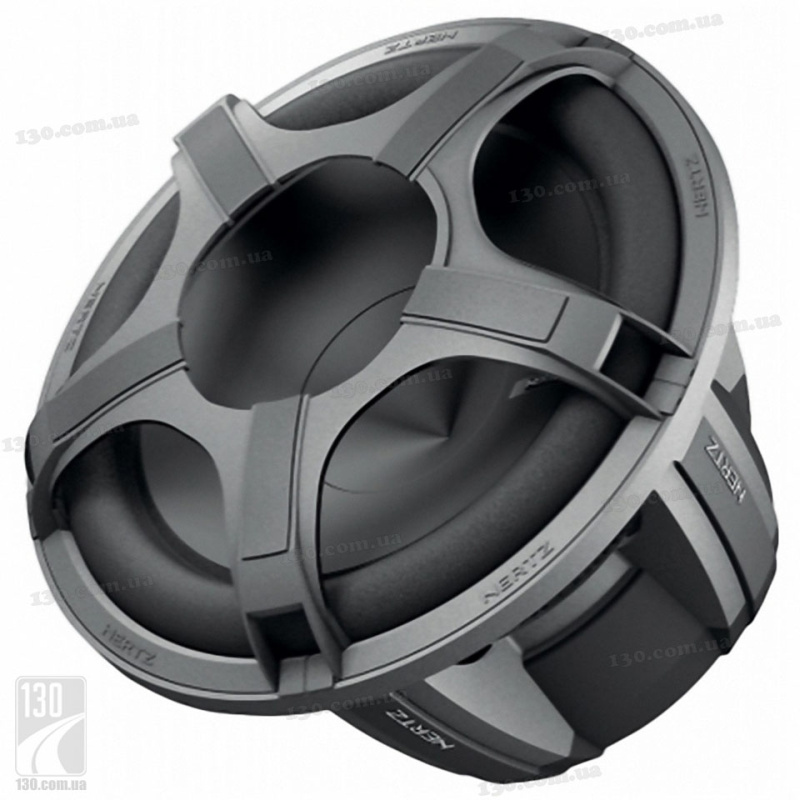 Some specialty woofers may be rated at 2, 6, 12 or even 16 ohms. 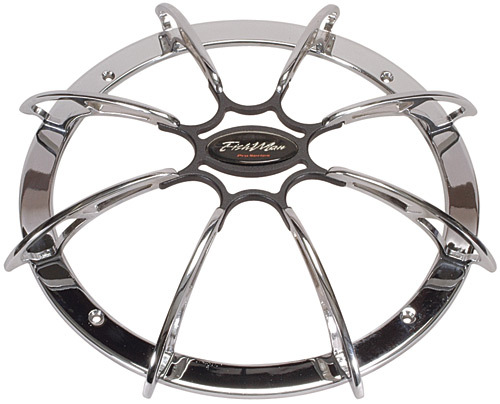 You would have seen the 12 ohm JL's before no doubt. Ohm's Law is the he mathematical relationship between voltage, current, and resistance. It is named after George Ohm, it's discoverer. Ohm's law states that current volume in a conductor is directly proportional to the voltage flow across it and inversely proportional to its resistance (assuming the temp remains constant). In general, this means that more voltage will produce more current, if resistance stays the same, but higher resistance will cause current to decrease if voltage stays the same. In mathmatical terms, V = I x R, where V is voltage, I is current, and R is resistance. Ohm's law is a description of electron behavior upon which virtually all understanding of electronics is based. Just for further background information, you might have heard all this called resistance of impedance so I'll give you a little more info on those two things as well. Regarding resistance, almost all conductors of electrons exhibit a property called resistance. Resistance impedes the flow of current. It is measured in units called Ohms. With a water hose, resistance could be regarded as friction between the water and the hose. A larger hose would create less friction and have a lower resistance than a smaller hose. It could also be a finger over the hose end. In electrical circuits, small round cylinders with wires on either end are called resistors. These typically reduce the flow of electrons to serve the specific requirements of the circuit elements, such as amplification or switching functions. Finally, Impedance. The totality measured in Ohms of all electrical opposition to current flow: resistance, reactance, capacitance, as well as all mechanical factors inhibiting the completion of energy transfer in a contained system. In practical terms, this means that most Drivers are assigned a certain nominal impedance based on their DC voice coil resistance and mechanical stiffness. 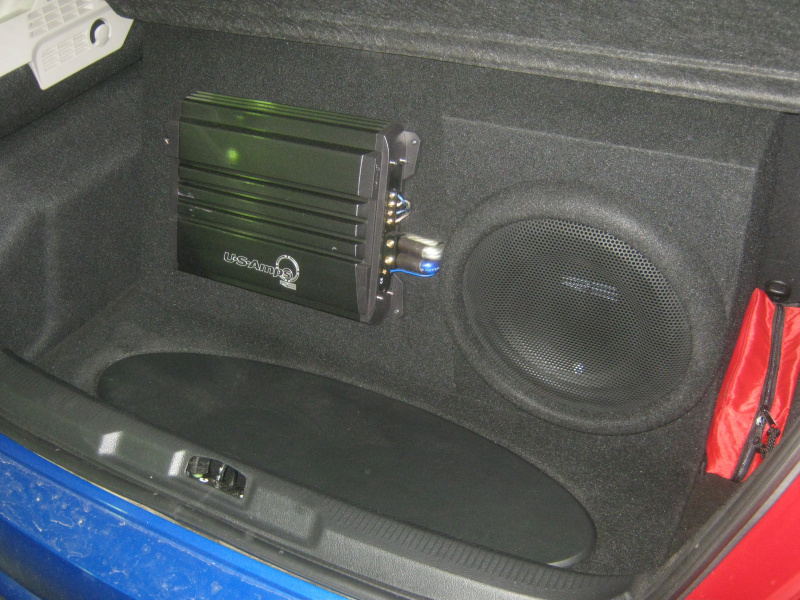 For car audio this is usually 4 ohms; for home stereo, 8 ohms is the standard. 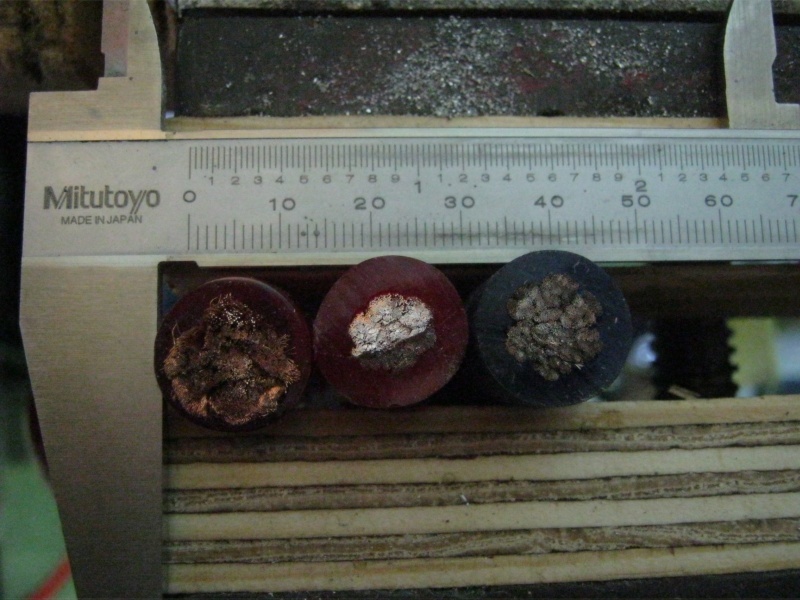 Put simply, your voice coil has a certain amount of copper winds in the voice coil(s). If you want a high resistance, triple the amount of winds and the current suddenly has to do X amount more work to travel past the coil. 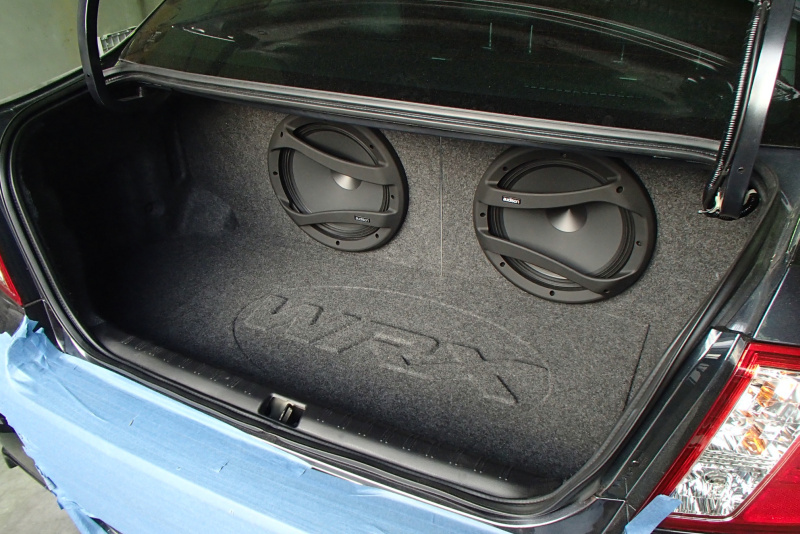 The aiming of subwoofers has been quite a topic of speculation for years now in car audio. 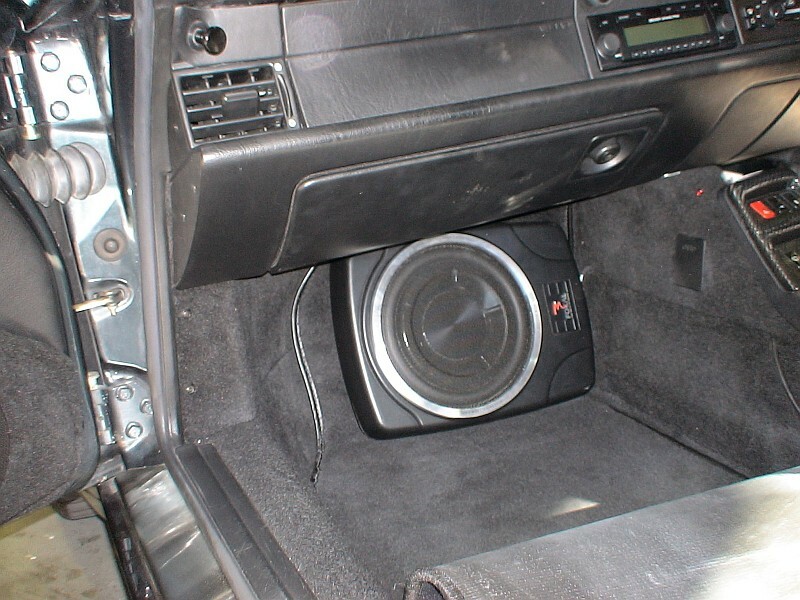 Through experimenting many people have found that their subwoofers sound much better when aimed backwards. 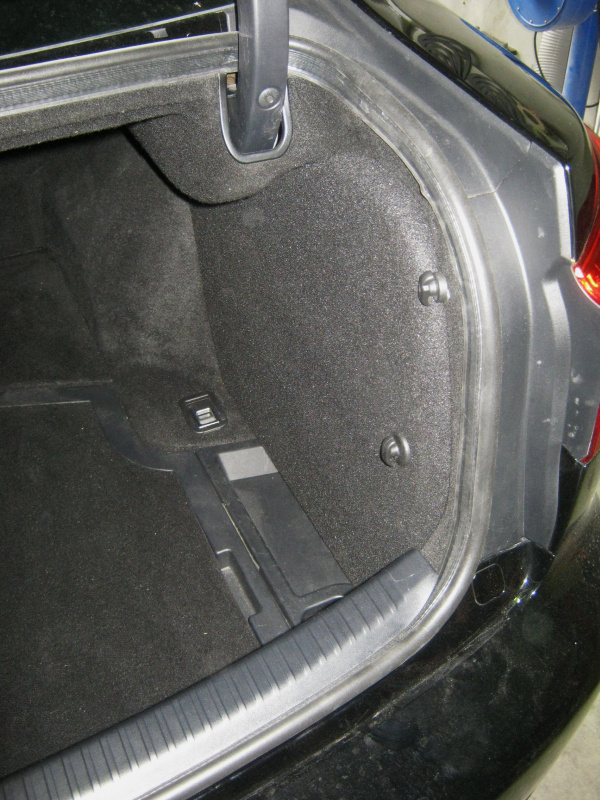 Many people realise that there seems to be much more bass with the boot open than with the boot closed. We've heard a great deal of strange and utterly incorrect theories to explain this phenomenon. The main reason this phenomenon occurs is all about sound waves (direct and reflected) and more importantly the cancellation of these waves. 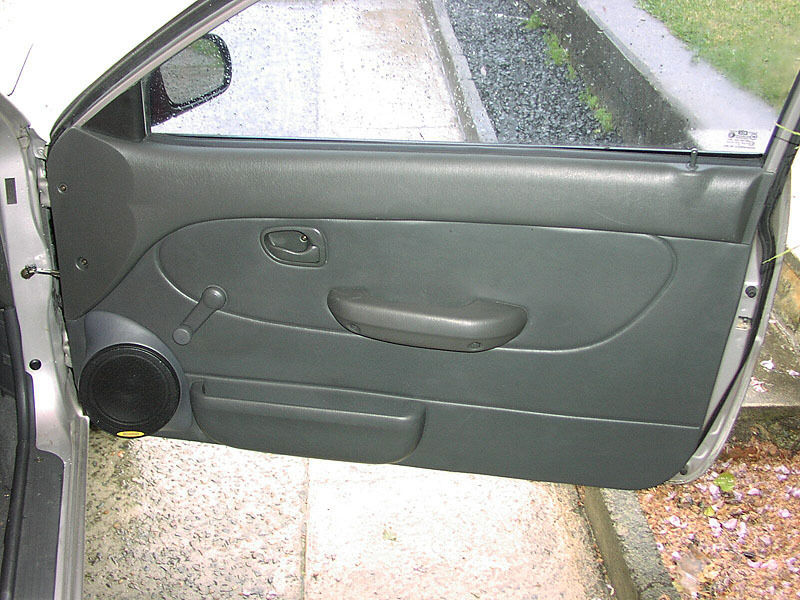 The diagrams below assist in showing the sine waves and their phase relationships between the direct sound wave entering the car and the reflected wave that hits the back of the boot and reflects forward. Since the reflection is bounced into the listening area one can treat them much the same as having two sources. 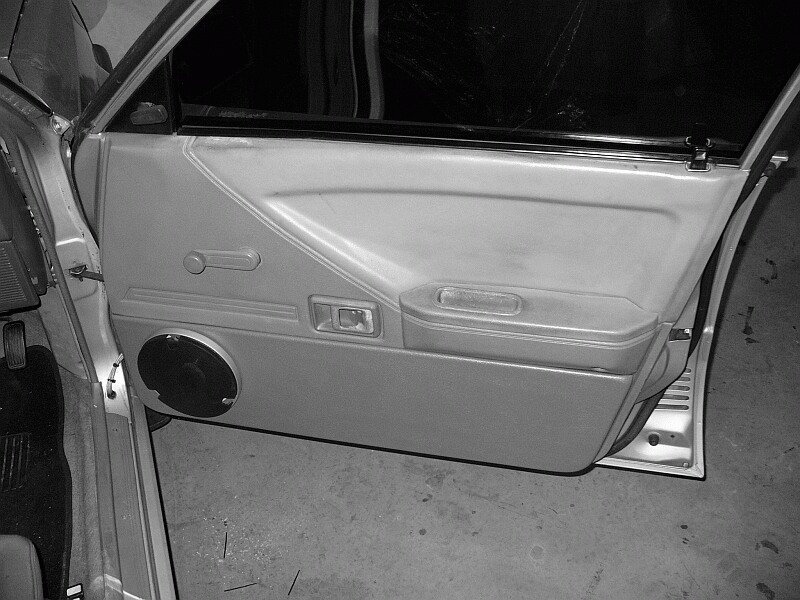 In the above picture the vertical black line at the left of the picture is the boot rear panel (the beaver panel the tail lights are mounted on). 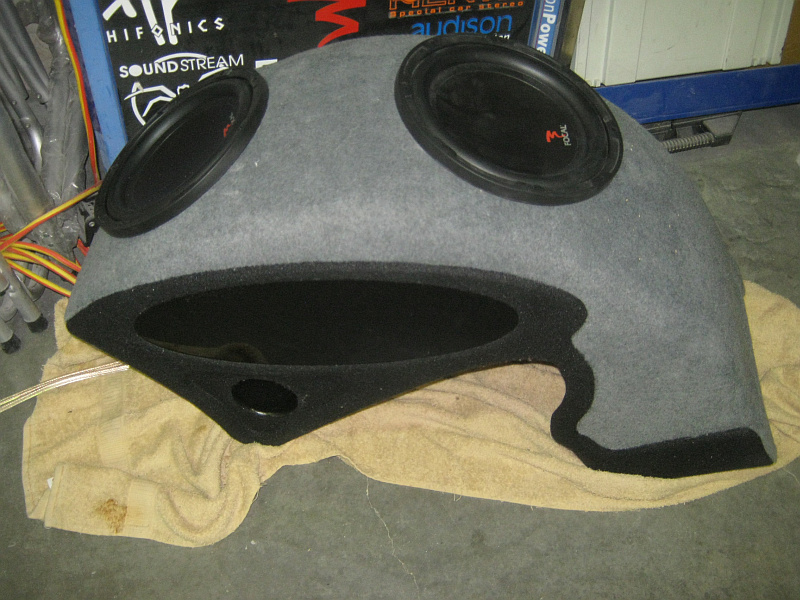 This picture is an illustration of what happens when sound comes out of the front side of the subwoofer enclosure. 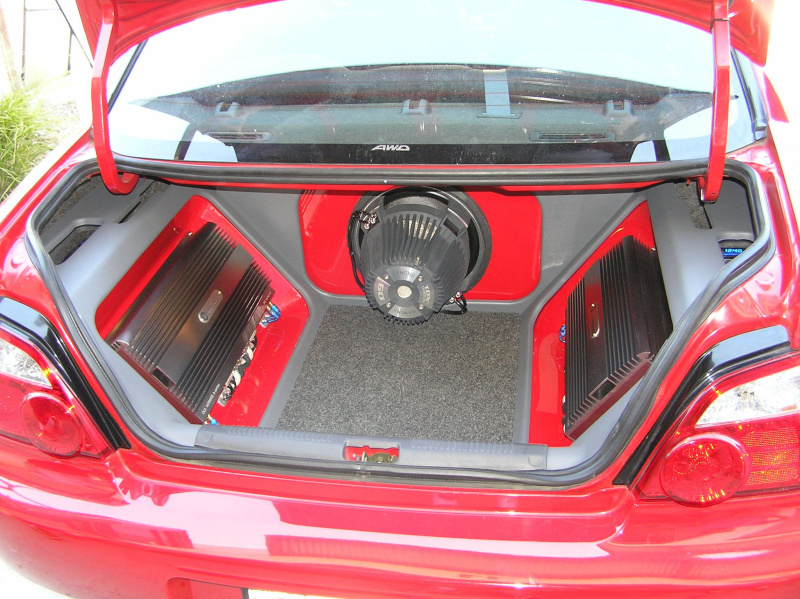 Sound travels forward into the car (the purple wave) and also backwards to reflect off of the back of the boot (the red wave). 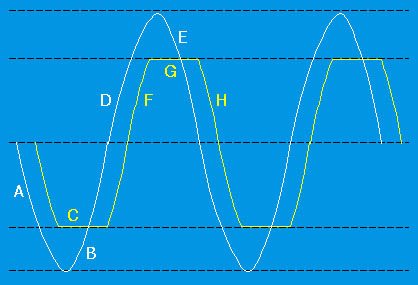 Both the direct wave and reflected wave get to the listener but they are slightly out of phase causing a variable amount of cancellation in the listening area. 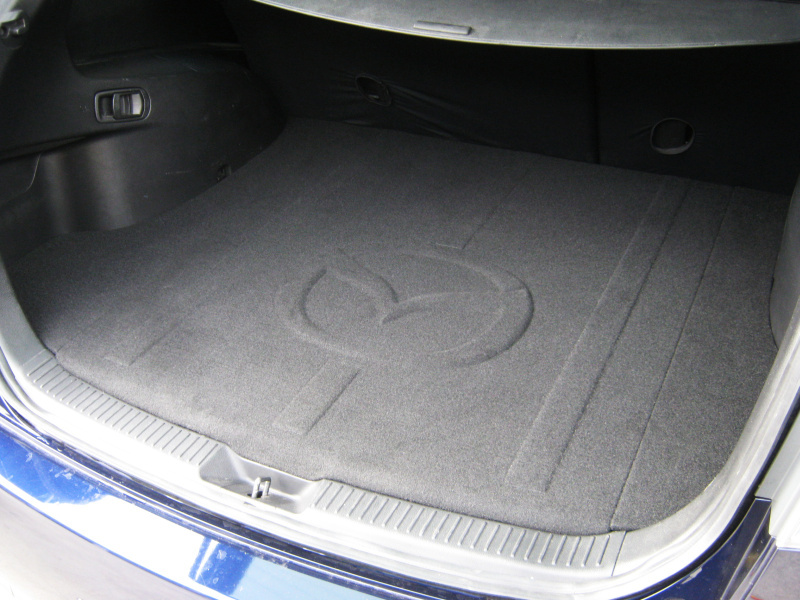 At this stage if you opened the boot the reflected wave would disappear and not reflect back into the car, thus resulting in no cancellation. 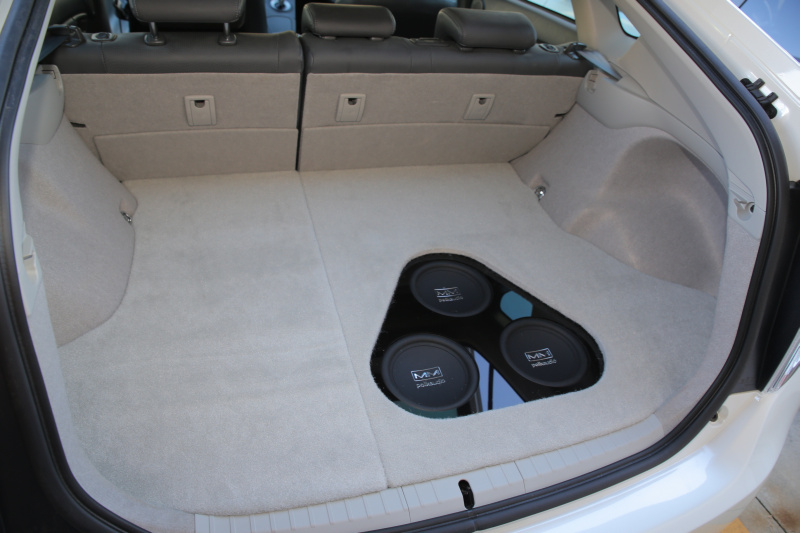 In the picture above picture the speaker box has been aimed at the boot instead of the rear seat and you can clearly see the direct and reflected waves are not nearly as much out of phase as in the first example. This resulting in much better bass reproduction. 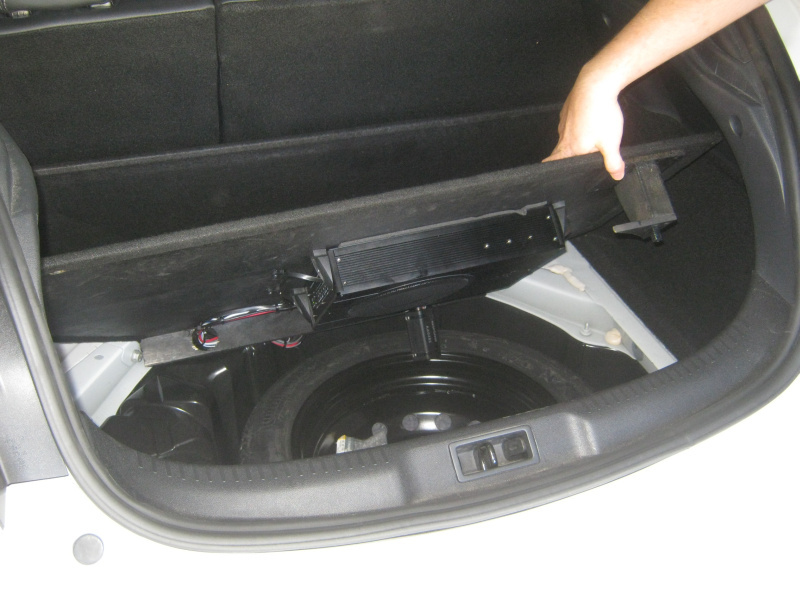 This picture above represents the subwoofer enclosure being moved to the rear of the trunk with the subwoofer aiming forward. The waves are a little closer to being in phase with each other. In this picture (above) we're aiming the rear mounted subwoofer enclosure at the rear so the direct and reflected wave are very close to being in perfect phase from the start and hence they reinforcing each other quite well. Note; these pictures are simulated using a 60Hz note with the rear of the box mounted approximately 3 feet from the back of the boot. Keep in mind we're only discussing the direct and rear reflected sound in an effort to try to simplify this. The reflecting sound waves in a car are much more complex than these drawings indicate but we must start simple before getting too carried away. 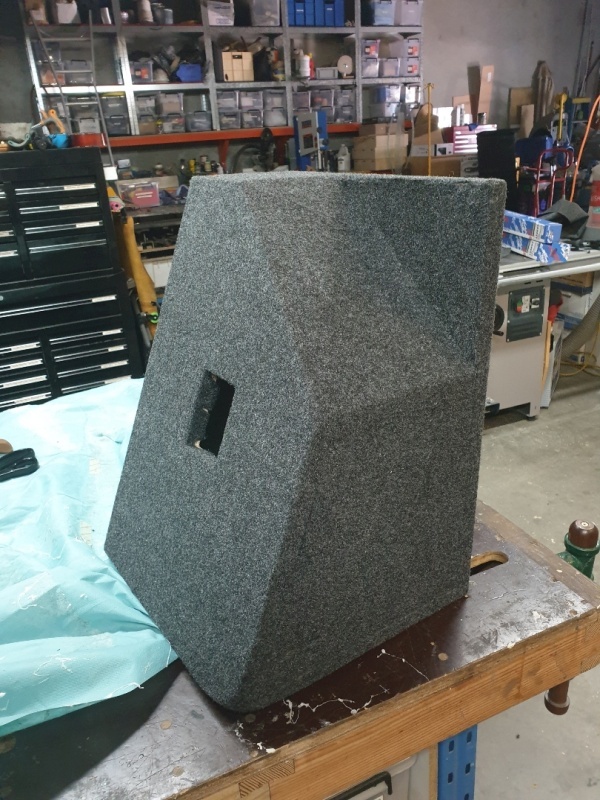 For example, remember that placing the subwoofer cone face too close to any panel can load it (resulting in a similar effect to that achieved by a bandpass enclosure) but we'll worry about that another day. This explanation should be a nice foundation for those of you who wish to study this phenomenon further. One other thing we should mention is that before people comment that this cannot be true because the interior of cars being small in relation to bass wavelengths, the full wavelength does not have to completely develop to be in or out of phase with its own reflected sound. The pictures above are showing a 60Hz wavelength and the bounce distance to reflect back out of phase a complete 180 degrees is just over 4 foot. At higher frequencies the distance is less (120Hz is 2.3ft for example). 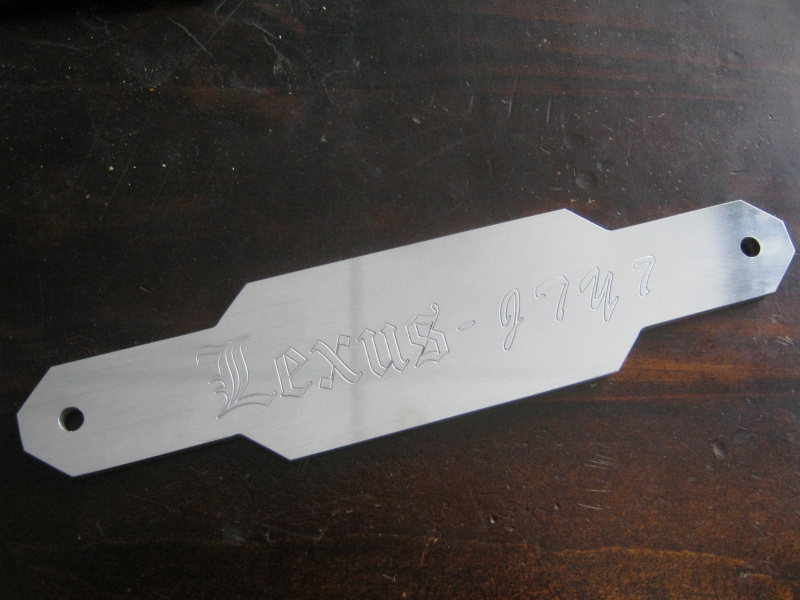 Remember, the key is to experiment and see what works best for you and your vehicle. 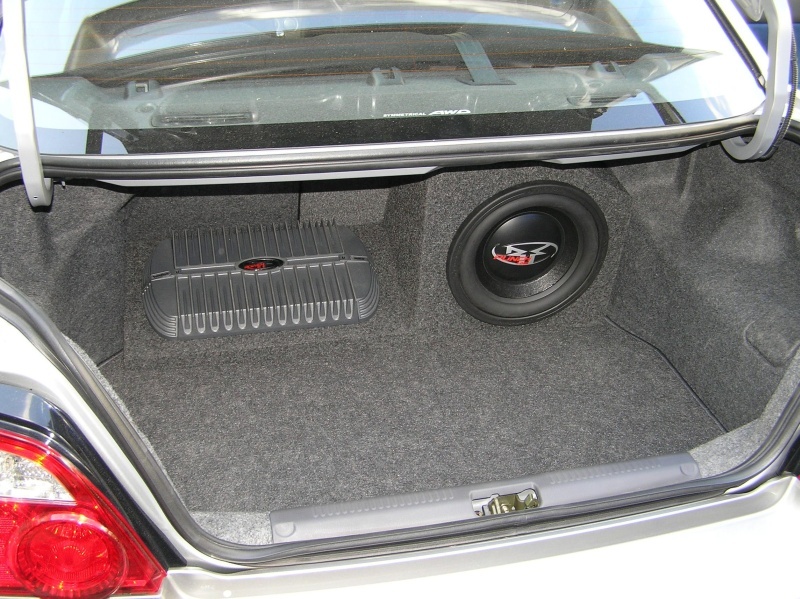 Ever wondered just how loud or soft sound pressure can get? Or have you got no idea what all those dB readings you keep hearing about actually compare too? Well click here to find out. Contrary to popular belief; your amplifier's gain control is not simply a volume knob that determines the maximum volume that your amplifier can squeeze out during a pink fit. Rather it's a device for matching the full undistorted output range of your head unit to the full output range of your amplifier. 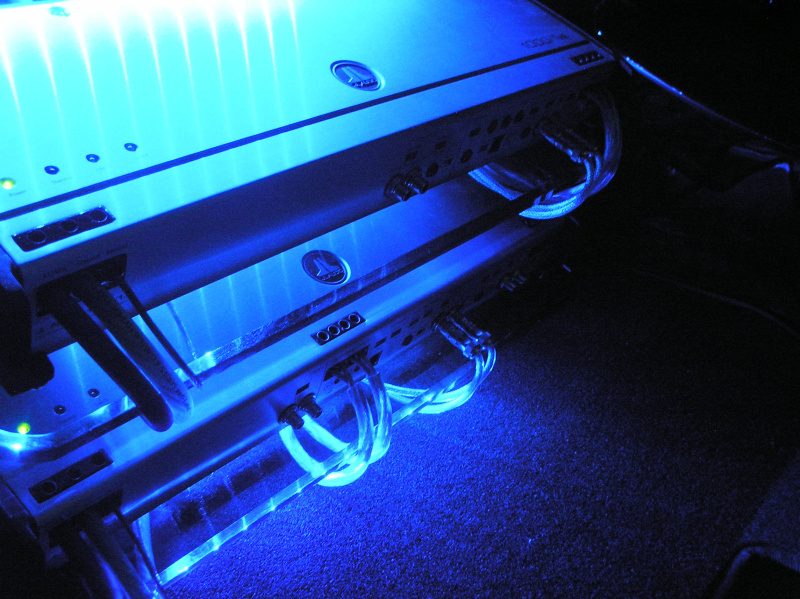 It is also used to level match the other amplifiers in the system in the case of a multi-amp setups. 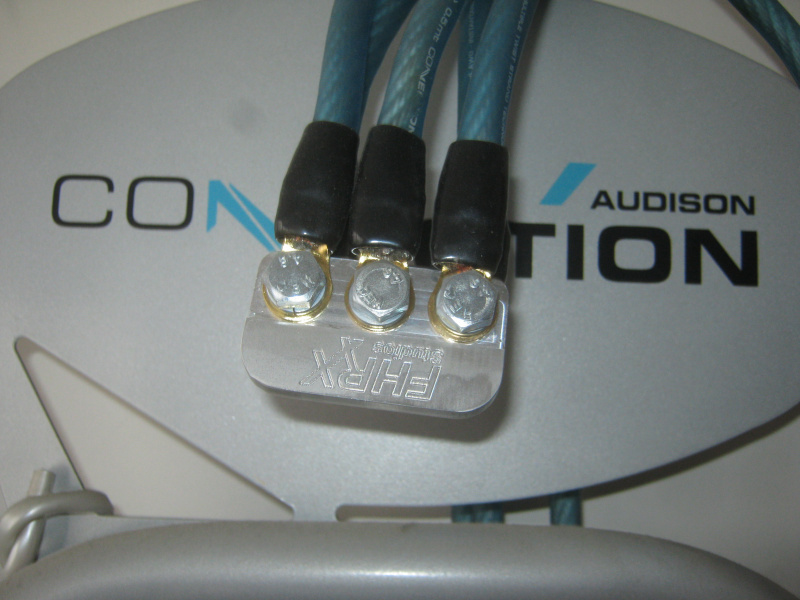 Not all head units have the same maximum preamp output voltage - some head units are capable of producing eight volts on their preouts while others are only capable of one volt. This is why the gains are variable. As an important post script to the paragraph above; please note we said 'maximum undistorted power' of the head unit - not simply 'maximum volume'. This is because there is a big difference between the two. 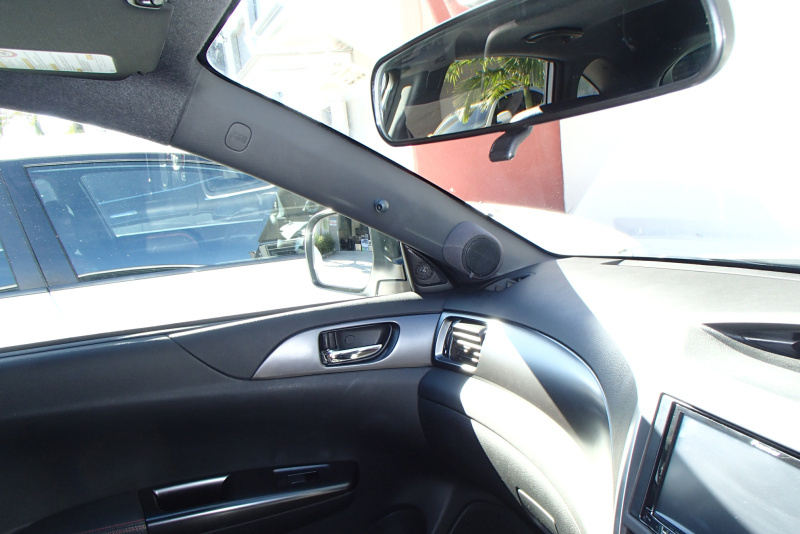 Most aftermarket head units will hit maximum undistorted power around 90% of their volume range (say 36 out of 40 for example). However many factory units will start distorting as little as half way. 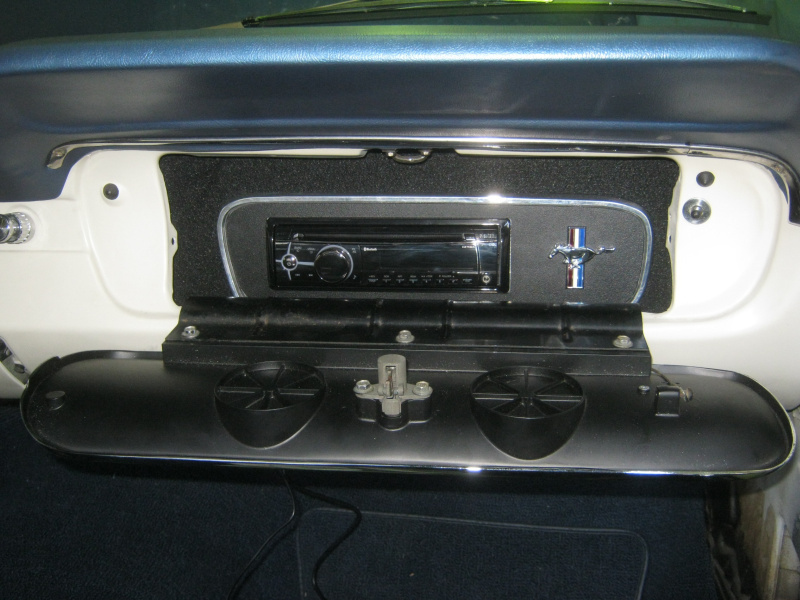 Sorry Holden and VW owners but those Blaupunkt and RNS510 head units are famous for it. If your amplifier's power is similar to your speakers the procedure of setting the gains is not overly difficult. Grab yourself a CD that is normalised at nominal 80dB. 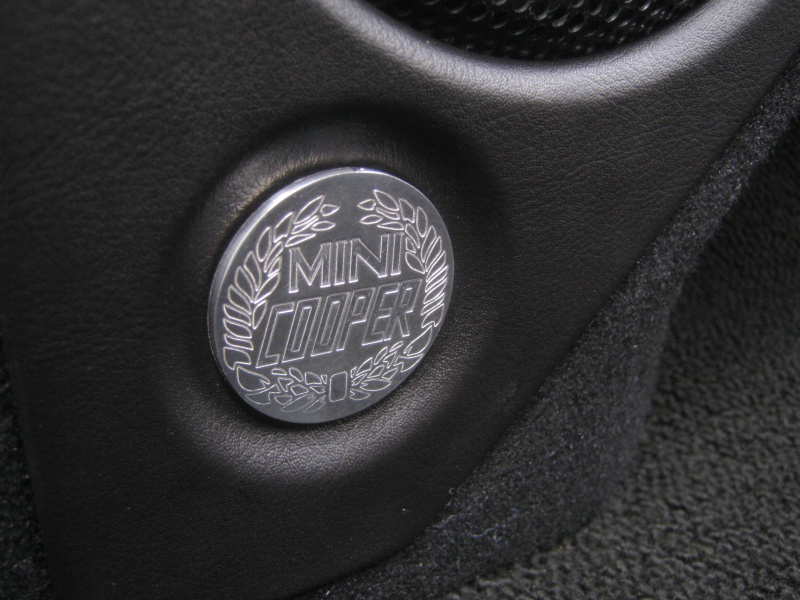 Turn all amplifier gains right down and all head unit boosters (such as the loudness button) should be off. 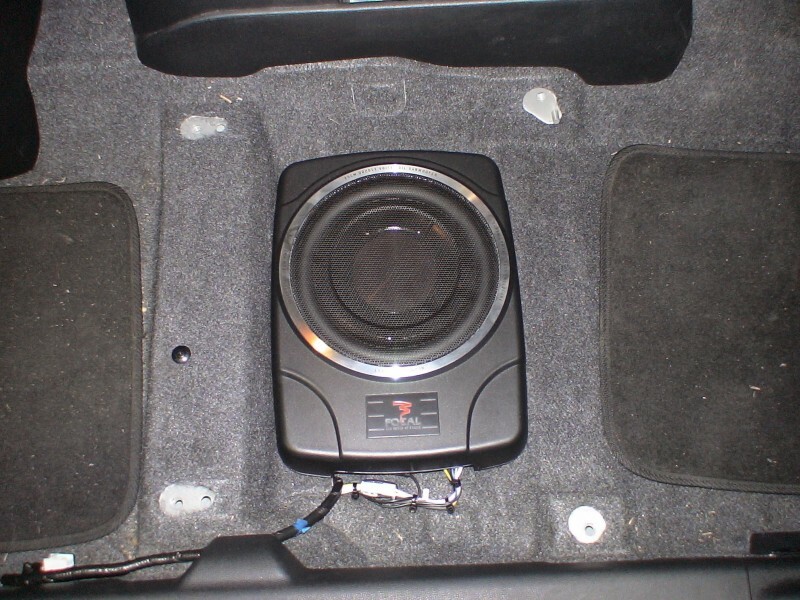 Then turn your deck up full volume and then back it off to about 85-90% (e.g. if your Alpine deck goes to 35, bring it up and then back off to 31-33). Moving to the amplifier, slowly bring the gain up until the distorting becomes audible. Once it's audible, turn it back ever so slightly and that is your gain set for that amplifier. 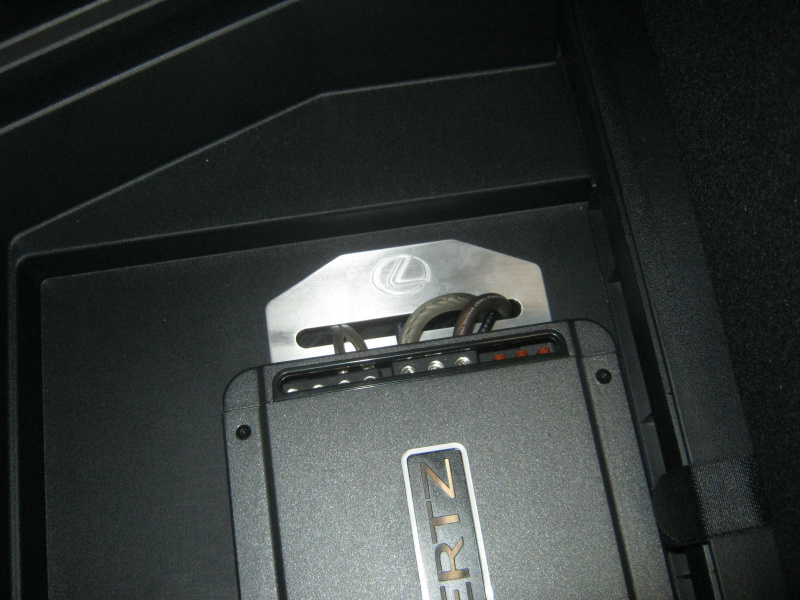 That means as you turn the head unit up to full true volume range, the amplifier goes with it. If you have an Alpine deck you shouldn't be hitting maximum volume and distortion at 10 out of 35 on the volume dial. If you are then the gains (which is sensitivity) is too high. The single main issue with the gains being too high is that because the sensitivity being through the roof, you'll not only get a lot of hissing but you might also even hear the engine whining through the system too. This is why sound quality buffs use massive amplifiers; they turn the gain all the way down and that 90% of power that the amplifier will never be asked to output is called head room - more head room means less ambient noise. 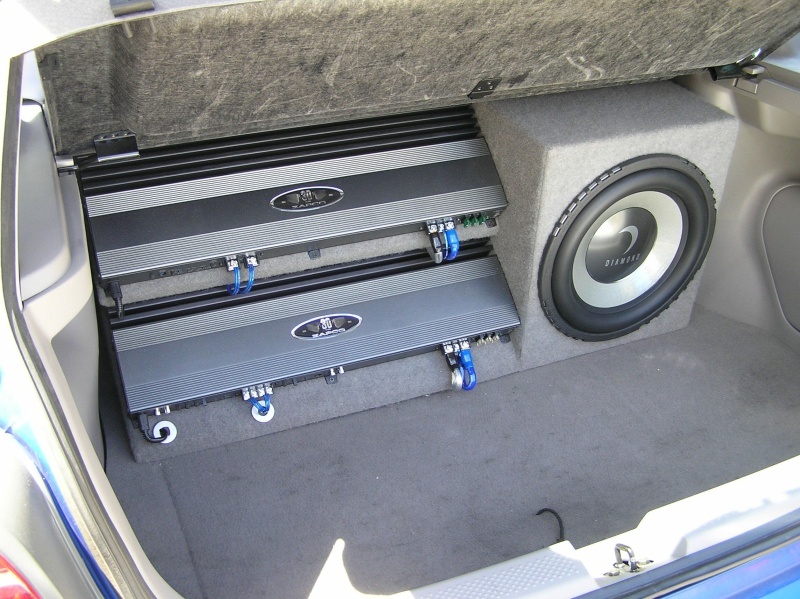 See both a 50 watt and a 5000 watt amplifier can run a 50 watt component set. However the former will need its sensitivity turned all the way up whereas the later uses much less effort - this means far less ambient noise. 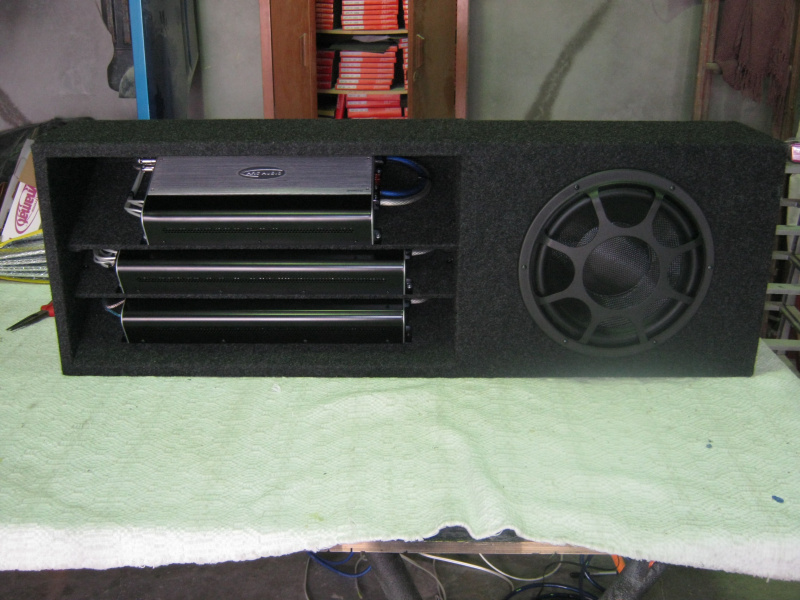 The larger amplifier will also run cooler and happier too. Now seeing as we're looking for this extra head room, you might be wondering how the gains are then set with these titanic sized amplifiers - because the obvious problem is that if your amplifier's output is much higher than your speakers rating (e.g. running 50 watt speakers with the aforementioned 5000 watt amplifier) it'll destroy the speakers through bottoming them out long before it begins to output any distortion at all. For this reason we strongly recommend that you have a pro set the gains - as they use such tools as oscilloscopes and the like to measure distortion and clipping output rather than just relying on their ears. Note; this listing and explanation is from the the12volt.com website. BL: The magnetic strength of the motor structure. 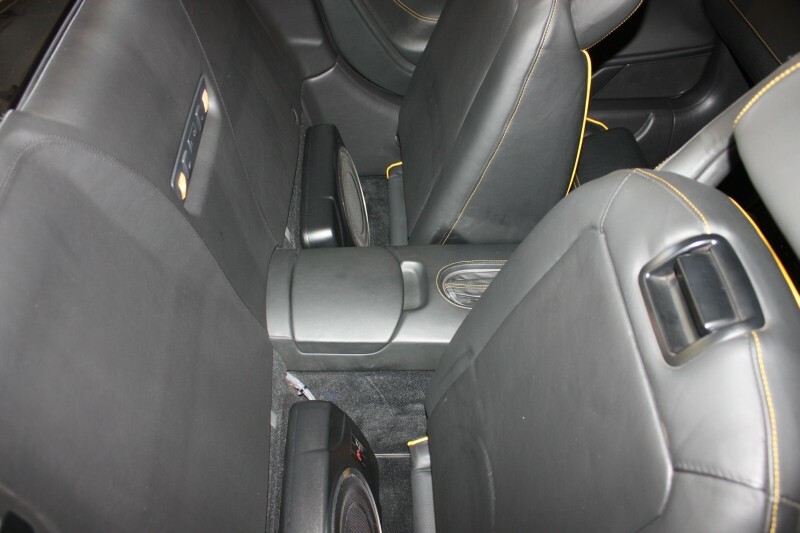 Fs: Driver free air resonance, in Hz. This is the point at which driver impedance is maximum. Ms: The total moving mass of the loudspeaker cone. Q: The ratio of reactance to resistance in a series circuit, or the ratio of resistance to reactance in a parallel circuit. Q parameters: Qms, Qes, and Qts are measurements related to the control of a transducer's suspension when it reaches the resonant frequency (Fs). 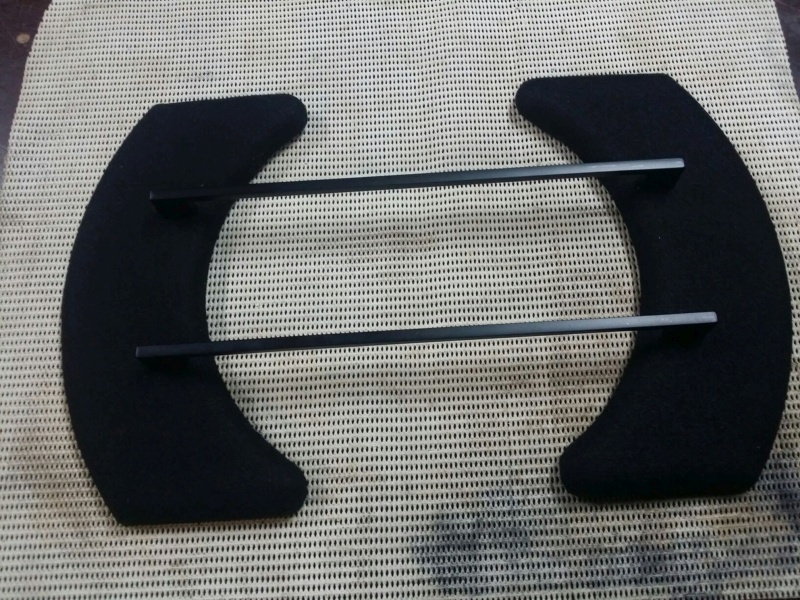 The suspension must prevent any lateral motion that might allow the voice coil and pole to touch (this would destroy the loudspeaker). The suspension must also act like a shock absorber. 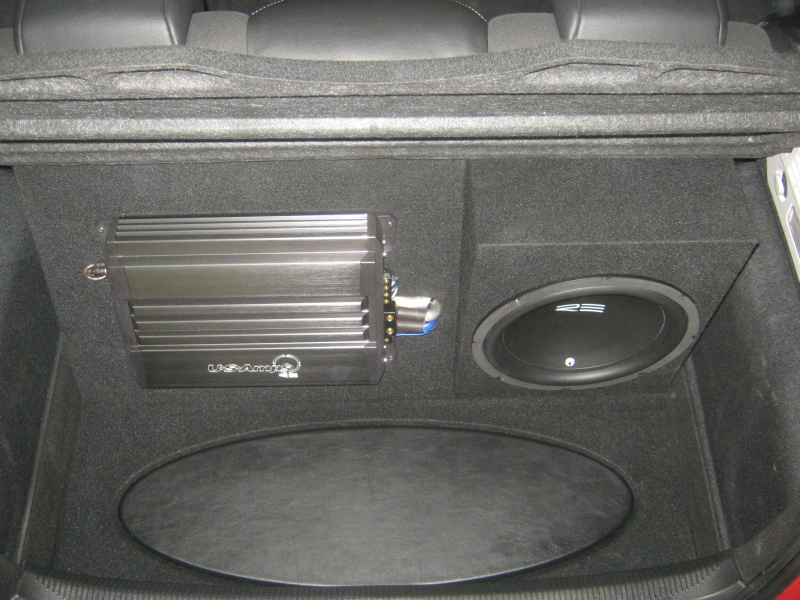 Qms is a measurement of the control coming from the speaker's mechanical suspension system (the surround and spider). View these components like springs. 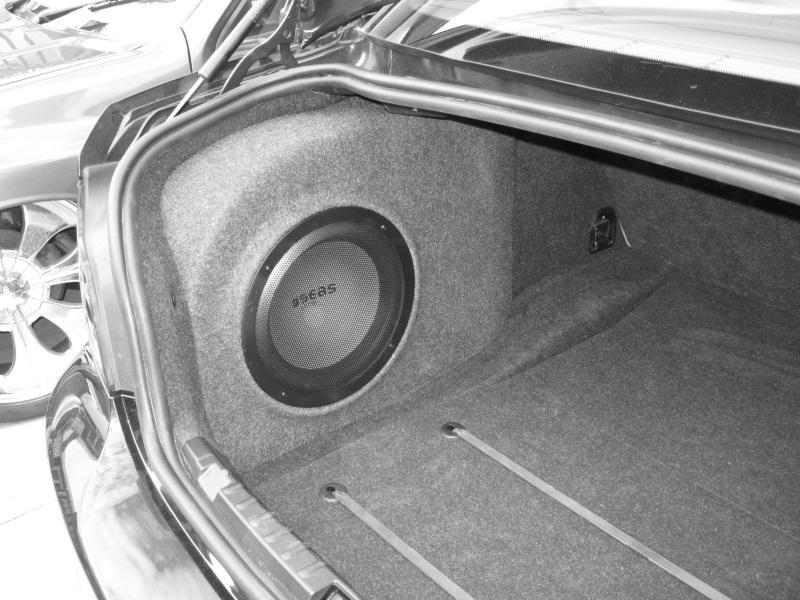 Qes is a measurement of the control coming from the speaker's electrical suspension system (the voice coil and magnet). Opposing forces from the mechanical and electrical suspensions act to absorb shock. Qts is called the 'Total Q' of the driver and is derived from an equation where Qes is multiplied by Qms and the result is divided by the sum of the same. 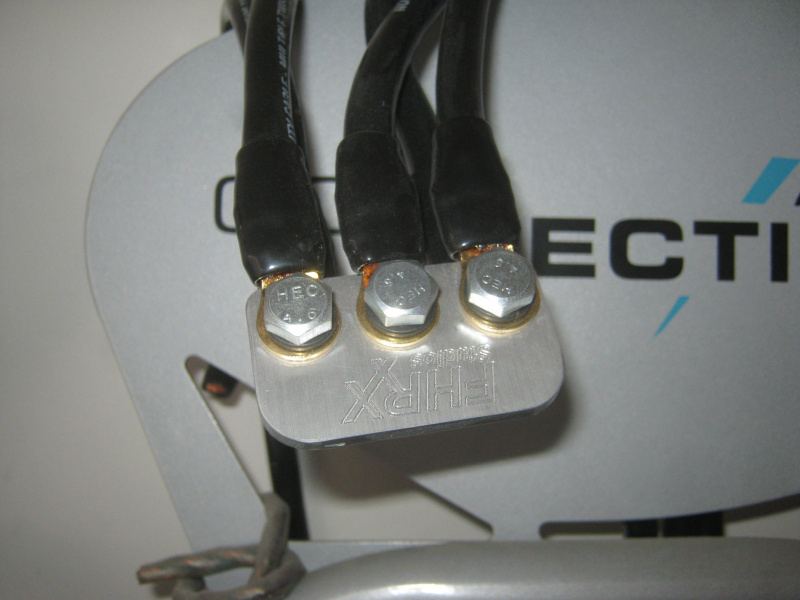 As a general guideline, Qts of 0.4 or below indicates a transducer well suited to a vented enclosure. Qts between 0.4 and 0.7 indicates suitability for a sealed enclosure. 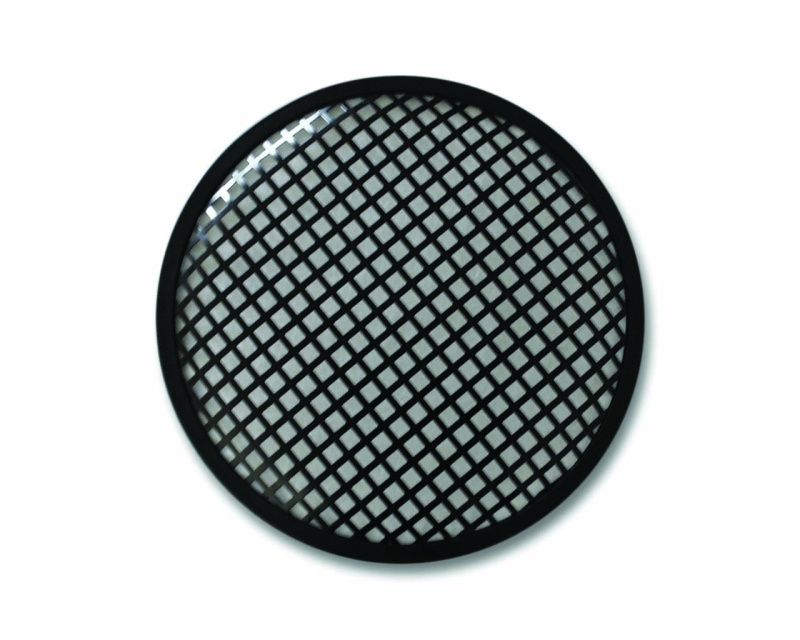 Qts of 0.7 or above indicates suitability for free-air or infinite baffle applications. However, there are exceptions! The Eminence Kilomax 18 has a Qts of 0.56. 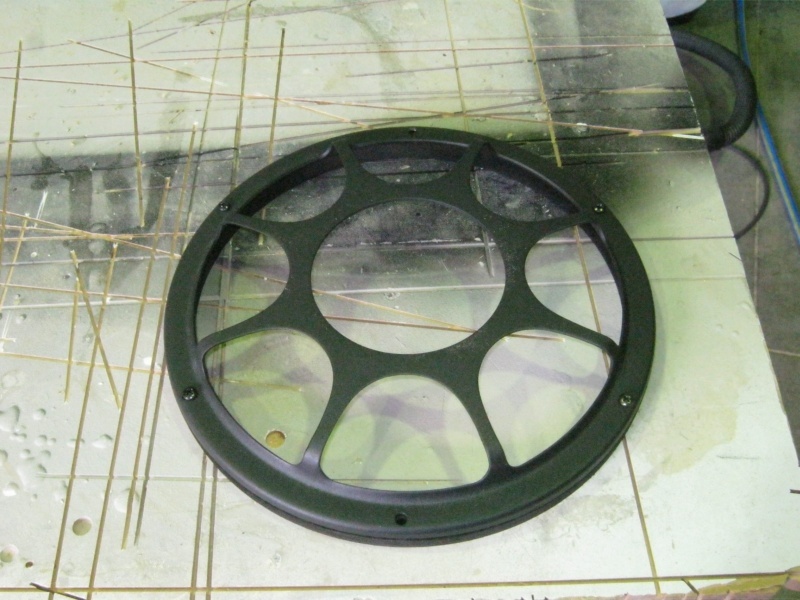 This suggests a sealed enclosure, but in reality it works extremely well in a ported enclosure. Please consider all the parameters when selecting loudspeakers. If you are in any doubt, contact your Eminence representative for technical assistance." Vd: Maximum linear volume of displacement of the driver (product of Sd times Xmax), in cubic meters. 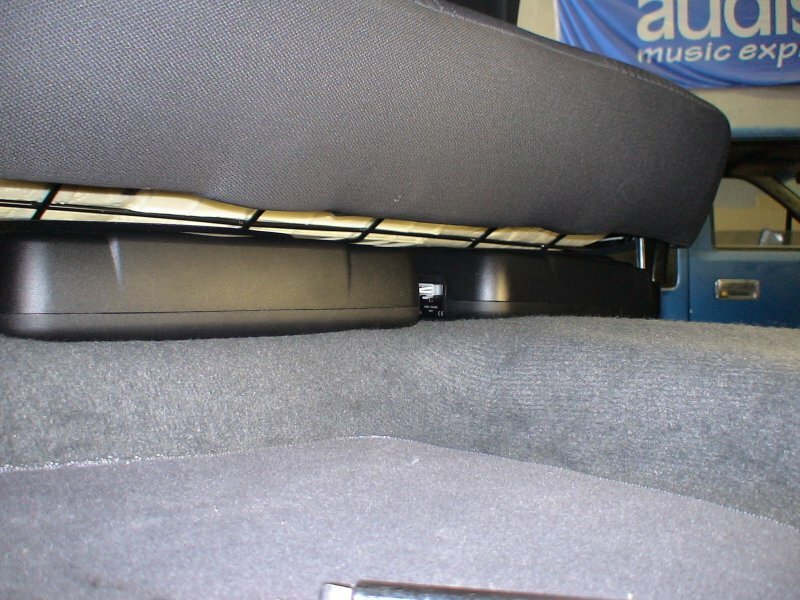 Do I really need sound deadening? Ever visited a cinema with no carpet on the walls? Ever wondered why most home theatre walls have curtains? 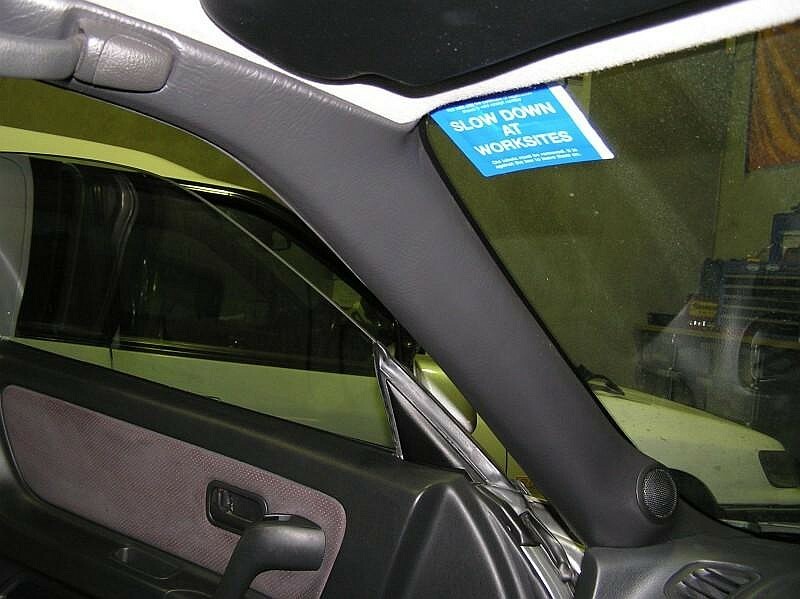 Maybe you've seen a car or jet test cell without diffusers on the walls? What about a radio studio or sound recording booth without diffusers? No? Starting to notice a pattern? 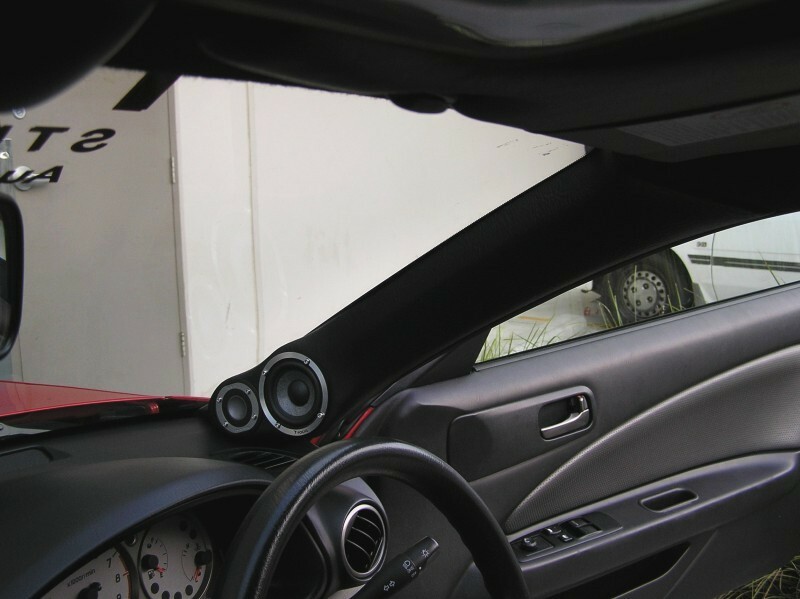 Sound deadening and diffusers are fundamental cornerstones (and arguably one of the most important aspects) of any sound system. They're so important in fact, that they should be budgeted for long before the speakers themselves are. 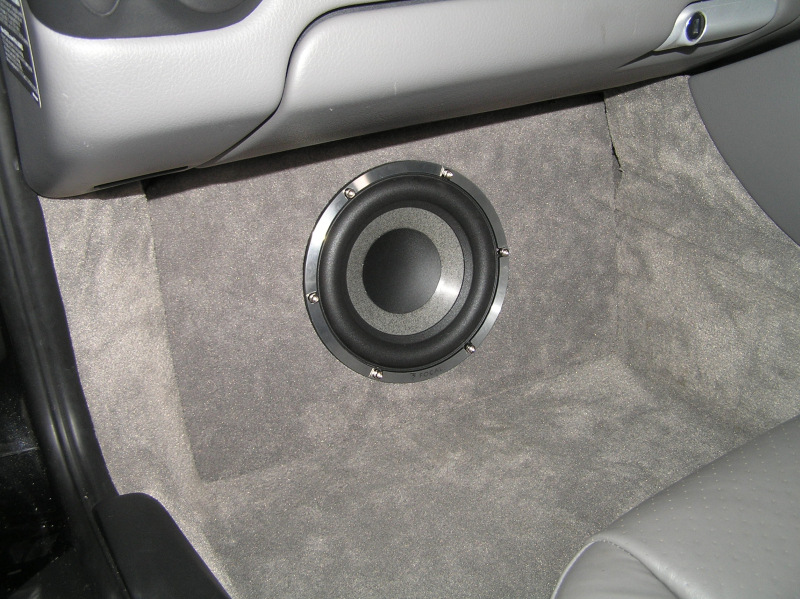 However before we delve into the wonderful world of what sound deadening and diffusers actually do, let's first take a step back and look at what sound actually is. Simply put; sound is differing frequencies of pressure waves. Expanding that concept a little; when sound is created in a medium (i.e. it cannot travel through a vacuum) it's in the form of a mechanical wave. This wave is the result of back and forth vibration of the particles that make up this medium. As sound waves move through air the particles are displaced both right and left as the energy of the sound wave passes through it. The motion of these particles is parallel to the direction of the energy origin and this phenomenon is why we characterize sound waves in air as longitudinal waves. A speaker cone is designed to create such a longitudinal wave. As the cone moves back and forth it pushes on neighbouring air particles. The forward motion of the cone pushes air molecules horizontally to the left while the backward retraction of the cone creates a low pressure area allowing the air particles to move back to the right. This movement creates regions in the air where the air particles are compressed together and other regions where the air particles are spread apart. The high pressure regions are known as compressions and the low pressure regions are known as rarefactions (note; not refractions - that's to do with light waves). 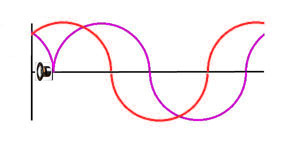 Wavelength (also known as path length or soundwave length) are common terms when talking speakers and physical sound. 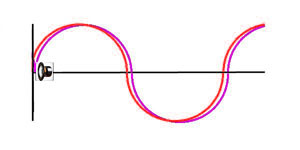 Wavelength is the distance the aforementioned disturbance travels along the medium in one complete wave cycle. However at this stage there is a small differentiating factor that should be explained and that's the difference between transverse and longitudinal waves. For traverse waves this pattern occurs once every wave cycle and is commonly measured from one wave peak to the next adjacent wave peak (or from one wave valley to the next adjacent wave valley). Since longitudinal waves do not contain peaks and troughs, their wavelengths must be measured differently. A longitudinal wave consists of a repeating pattern of compressions and rarefactions. Therefore the wavelength is commonly measured as the distance from one compression to the next adjacent compression or the distance from one rarefaction to the next adjacent rarefaction. When speakers move backwards and forwards they do so many times a second. Each time the cone does one complete movement forward then backwards then back to the zero point it's known as a cycle or one hertz (a.k.a. 1Hz). If the speaker undertakes one thousand of these cycles per second it is known to be playing 1000 hertz or 1 kilohertz (a.k.a. 1000Hz or 1kHz respectively). Music is the repeating pattern of these high and low pressure regions in various frequency orders and certain patterns of frequencies our ears interpret as harmonious. This harmony is simply the music you're listening too. 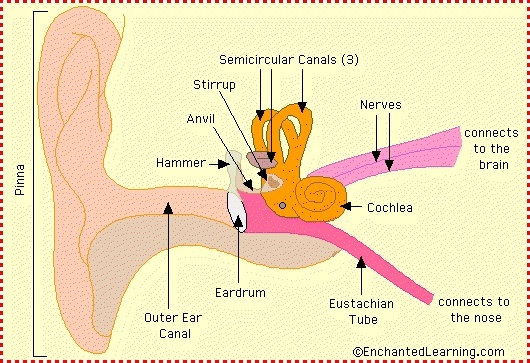 The Pinna (the outer ear skin section) catches these waves and directs them into our ear canal which houses our ear drum. The ear drum then mimics these varying pressure waves and lets your brain know what its hearing. 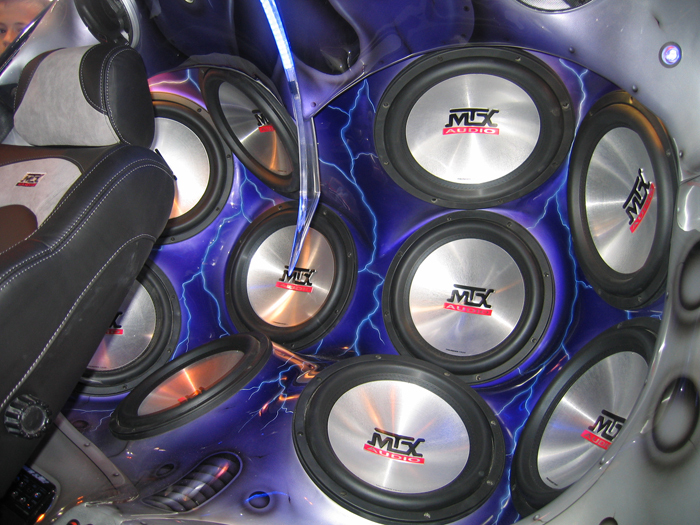 Now you understand the basics of how sound physically works so let us move to the sound deadening itself. As speakers move in alternating directions the sound emanates from both the front and rear of the cone. 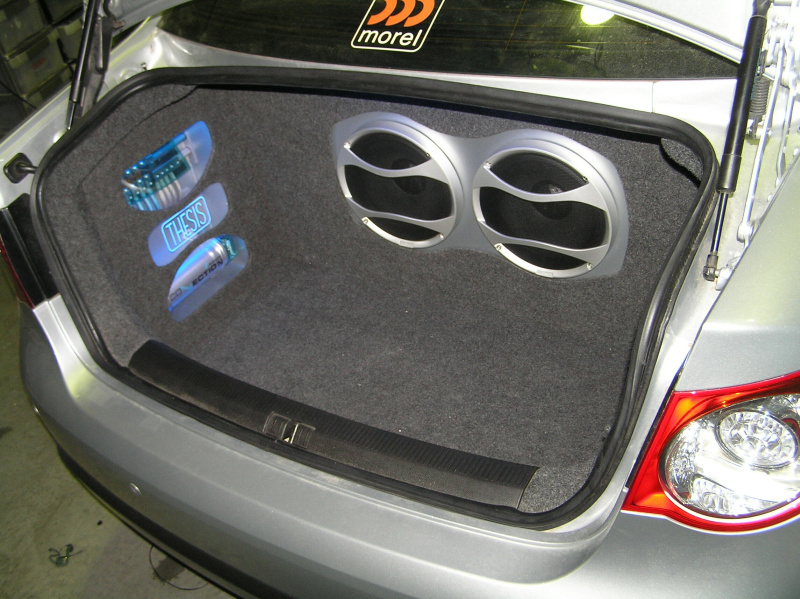 The front wave is heard by you while the rear wave is what the sound deadening and diffusers deals with. 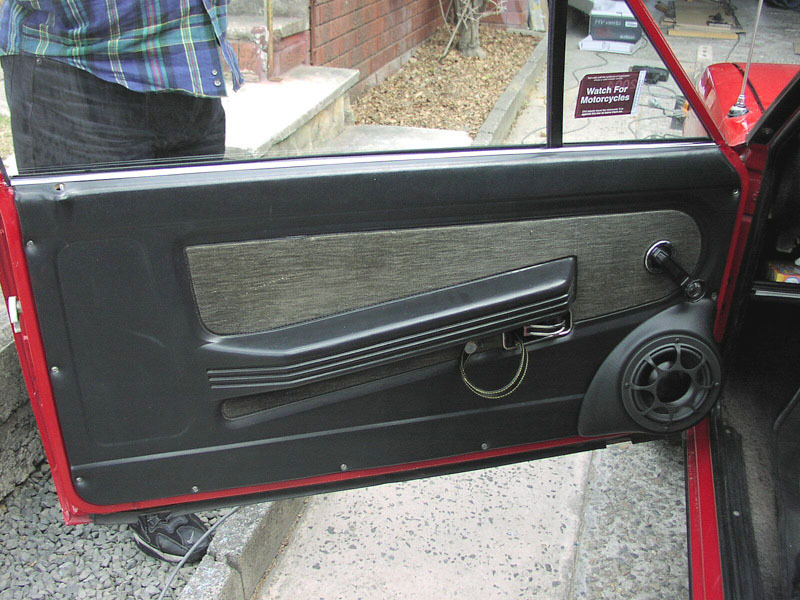 With all due respect; your cars doors are glorified metal cans. They echo and reverberate inside and the skins flex easily, causing bass to become blurred and muddy and even to cancel itself out all together. I usually explain it by using the following analogy. Imagine you're seated in a boat in the middle of a crystal clear flat lake. One hundred meters away there is another boat floating idle. If you start gently rocking you boat, waves emanate from it. Pretty soon these waves reach the second boat and it also begins bobbing to mimic these waves. The problem is that as this second boat rocks it not only reflects your waves back but also creates its own. 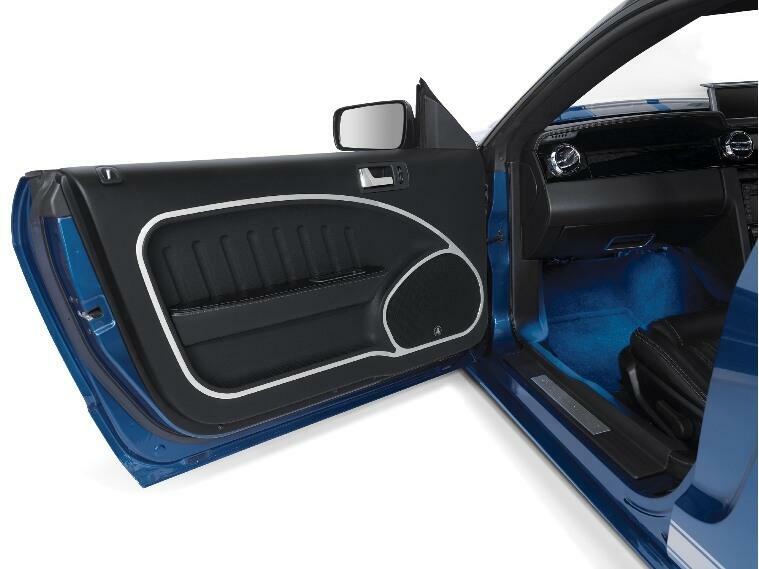 Your doors are the same in that the metal skins flex and create all matter of sound effects. These waves are only minutes or seconds out of phase (i.e. not even whole degrees) to the active wave and the result is that your ears get bombarded by literally hundreds of sound waves that are not supposed to be there. This creates an echoic effect and the end result is that the music sounds hollow and tinny. 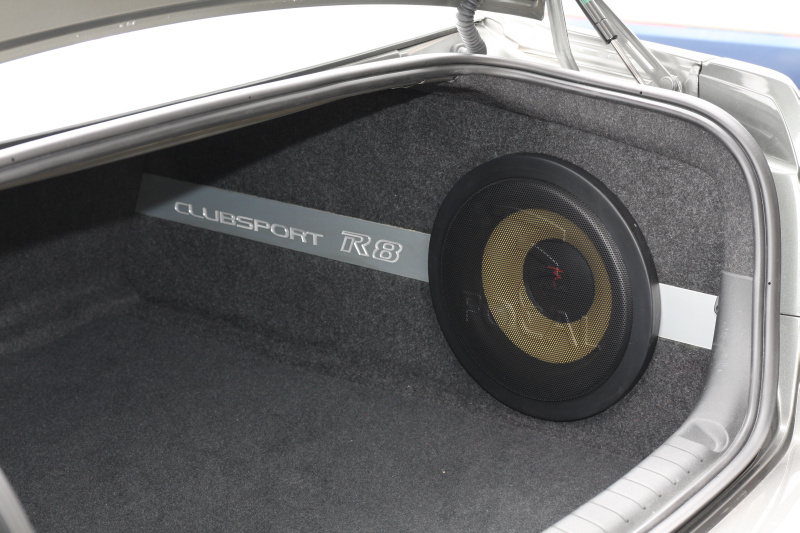 By adding sound deadening you're adding mass to the doors skins (like swapping the second boat for a cement pier in our analogy). This combats flexing its effects on internal sound waves. 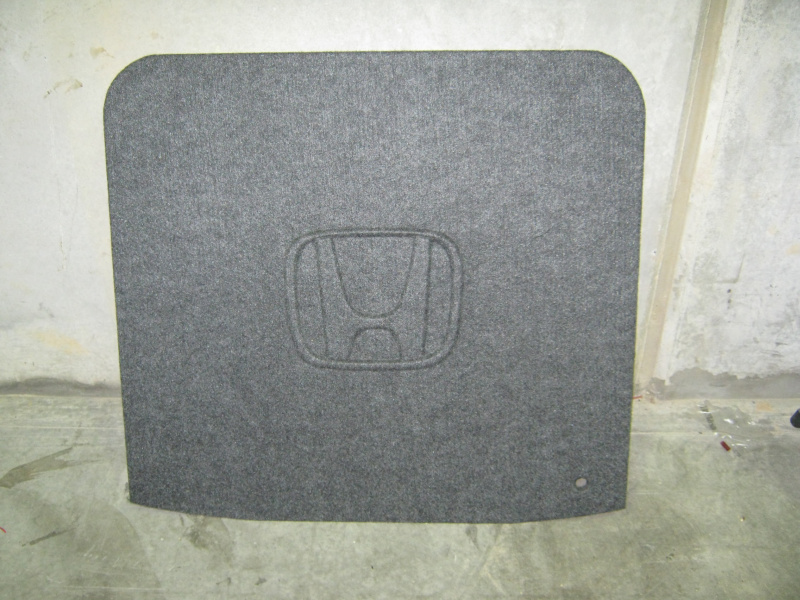 Diffusers are absorbent pads that resemble foam or tiny egg cartons. 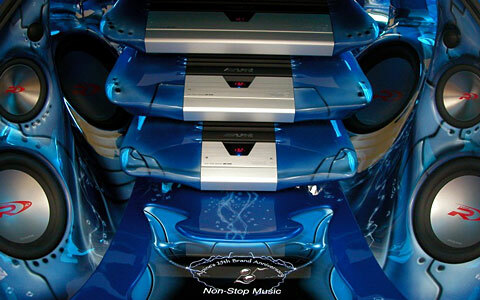 These fight wave reflections and are placed directly behind the speaker. Remembering back to our boat analogy with the cement pier (deadening) now in place; while extra waves are not being created any more, the main waves will still be reflected. 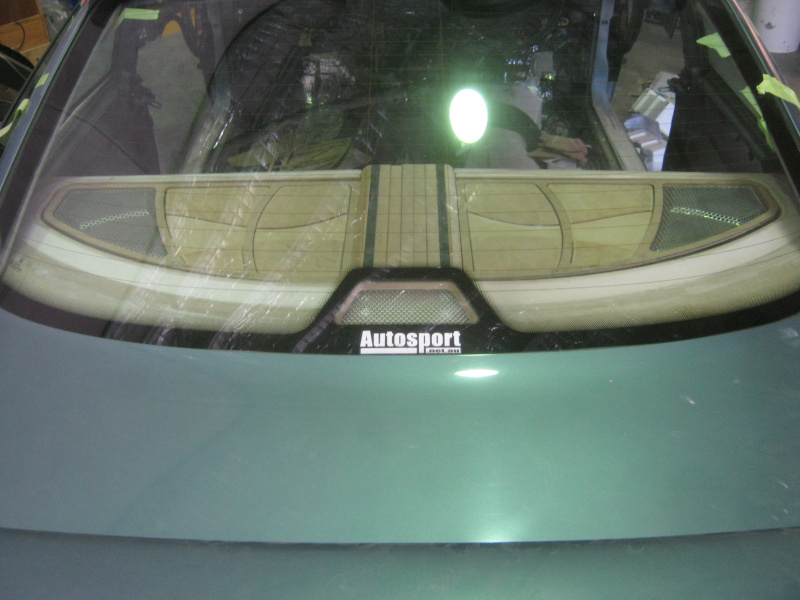 This is where the diffusers come in. We know from above that sound waves have a certain lengths at any given frequency. Somewhere within these frequencies is the perfect distance for sound emanating from the rear of the speaker cone to travel to the doors outer skin. This will then reflect and come flying back to impact the cone and cancel the next cycle. The diffusers catch these sound waves and trap them much the same way that the paint on stealth aircraft catches radar waves or submarines rubber skin traps sonar waves. 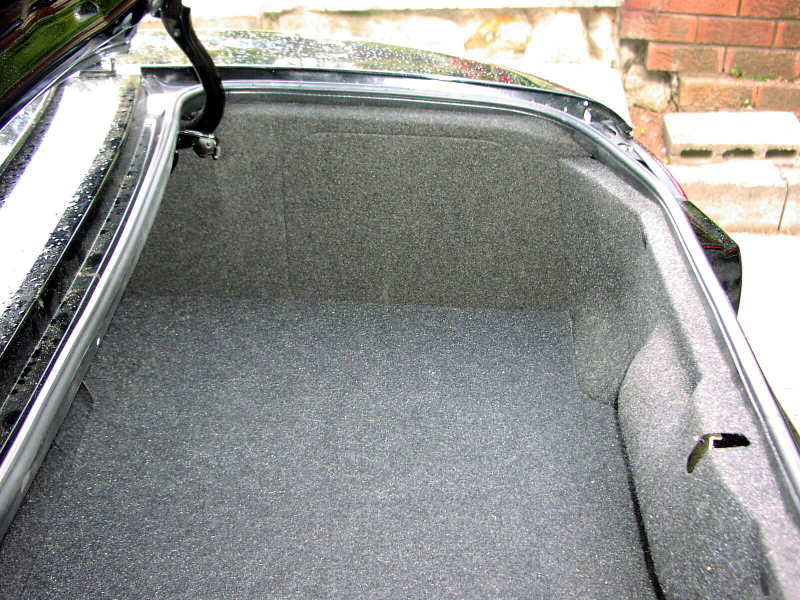 The reason you need diffusers on top of the deadening is that most sound deadening has a smooth skin and hence still reflects sound waves. 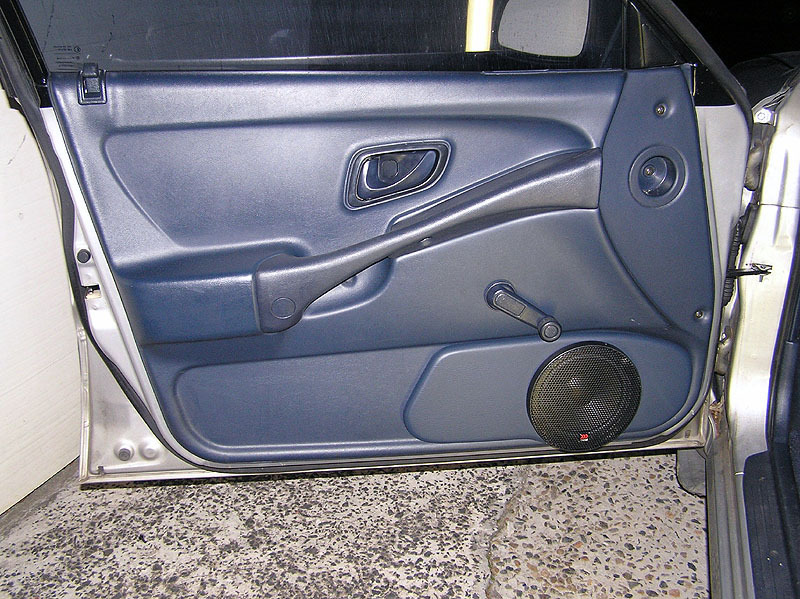 Another vitally important aspect of achieving good midbass is to seal the speaker into the door. In nature all elements take the easiest path from origin to destination. Water is a good example of this phenomenon; you pour it out and it will run wherever the easiest path is. Air is the same. When your speaker cone moves forward, it creates a high pressure cell right in front of the speaker cone. If there is a high pressure cell in front of the cone then there will be a low pressure cell on the rear side of the speaker cone. 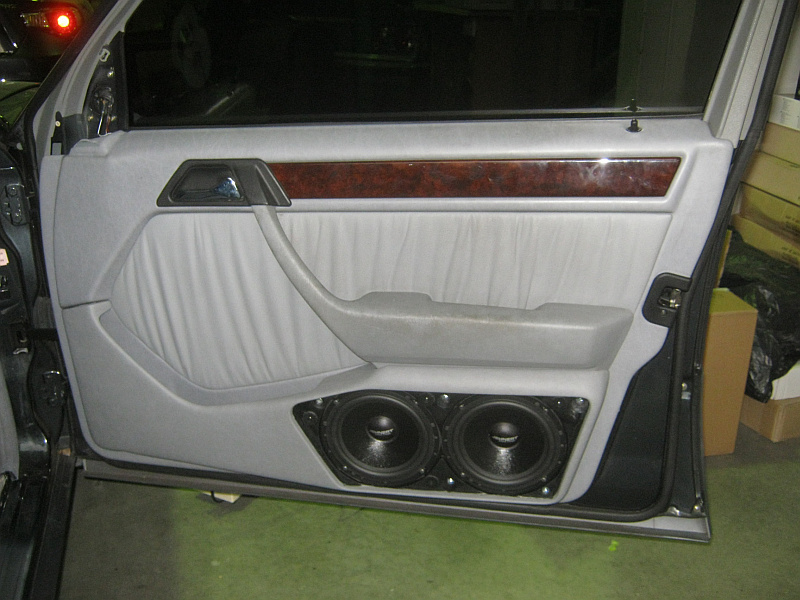 If the door is fully sound deadened and the speaker is sealed on using sealant of foam gasket, the high pressure air will move out towards you with the end result being incredibly punchy and tight midbass from your doors. 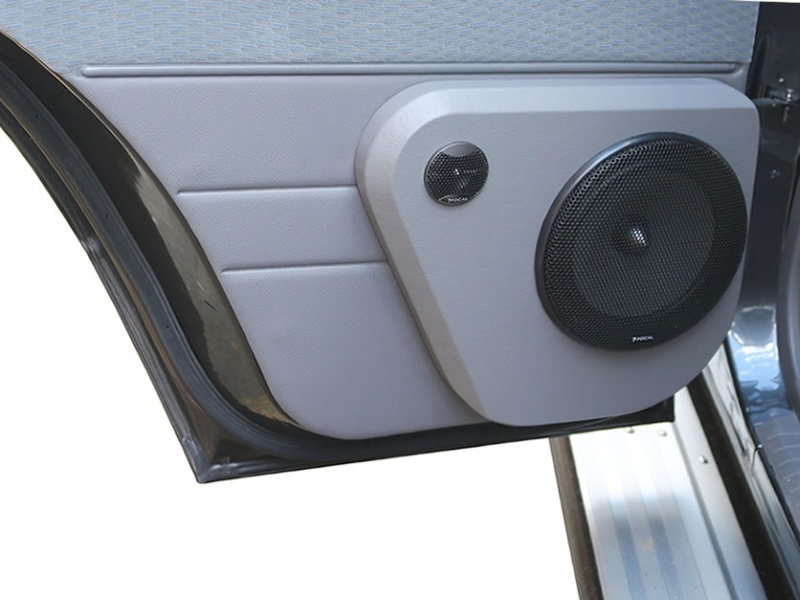 If there is no sealing (say the speaker is simply screwed down to the metal) and contains air leaks everywhere, the high pressure air simply takes the easiest path and moves around the edge of the speaker frame to behind the speaker where the low pressure cell is. In simple terms, you get no bass. 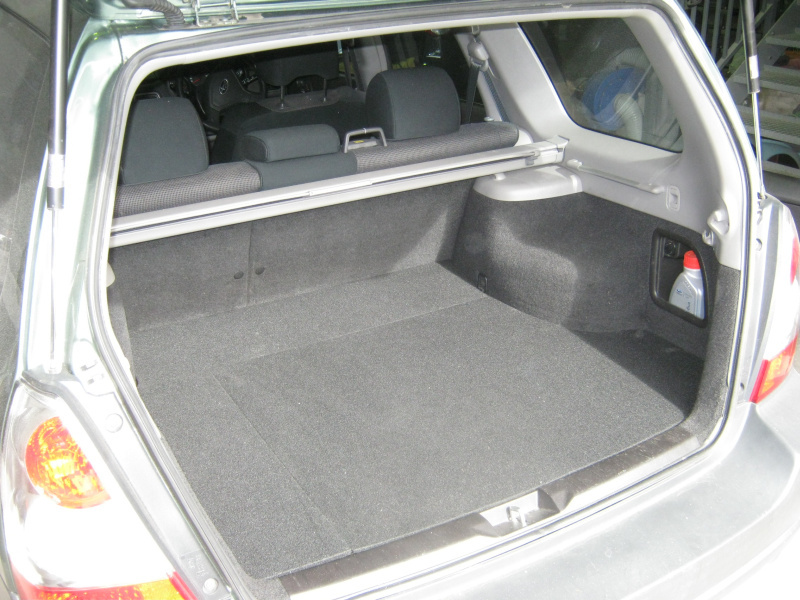 Many cars come with deadening from the factory but it is usually an insufficient amount, often only being a few inches here and there to minimise rattles during transit. 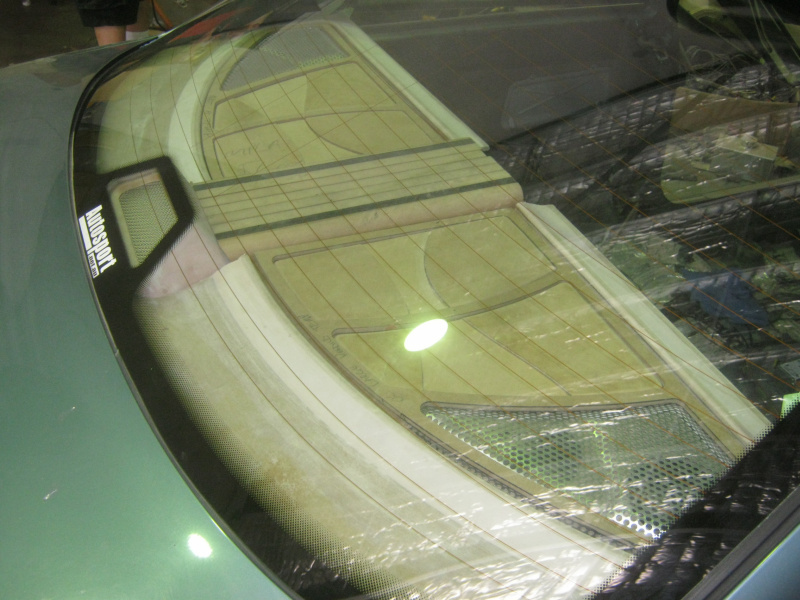 Car manufacturers limit this deadening in order to keep production costs down. 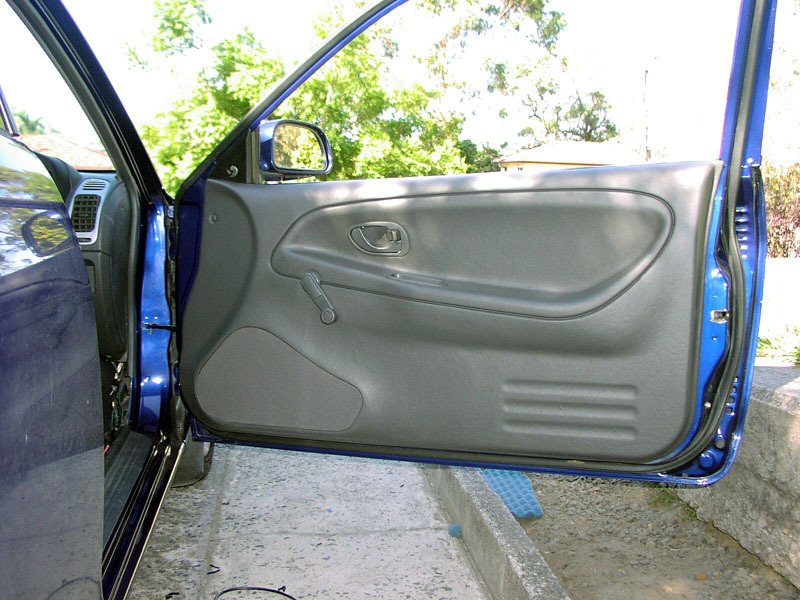 How much deadening you end up installing depends on your budget but both the inner and outer skin of your front doors should be fully deadened at least. 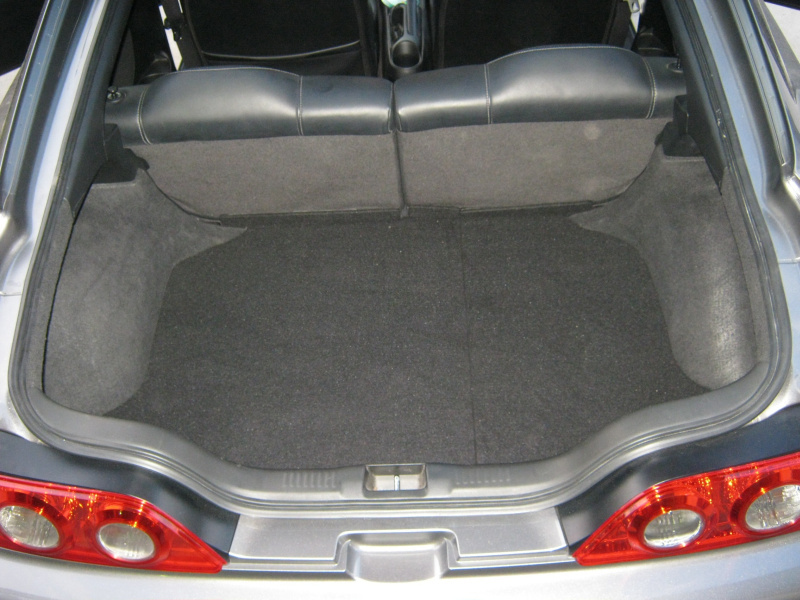 You can always add more to the boot, floor and roof down the track. 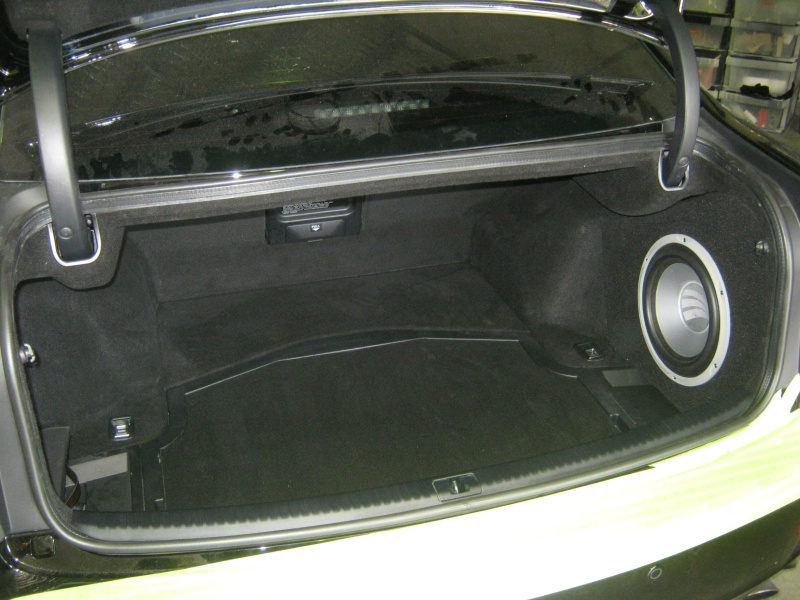 In conclusion; for the serious sound enthusiast sound deadening is an absolute must. 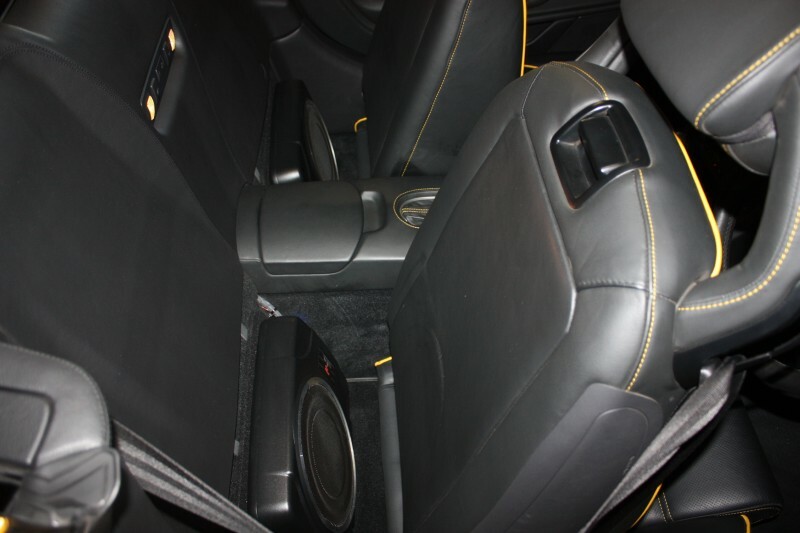 If you have a close look you'll notice the cars that sound the best in every continent (especially the ones that win the sound offs) are chock full of deadening. 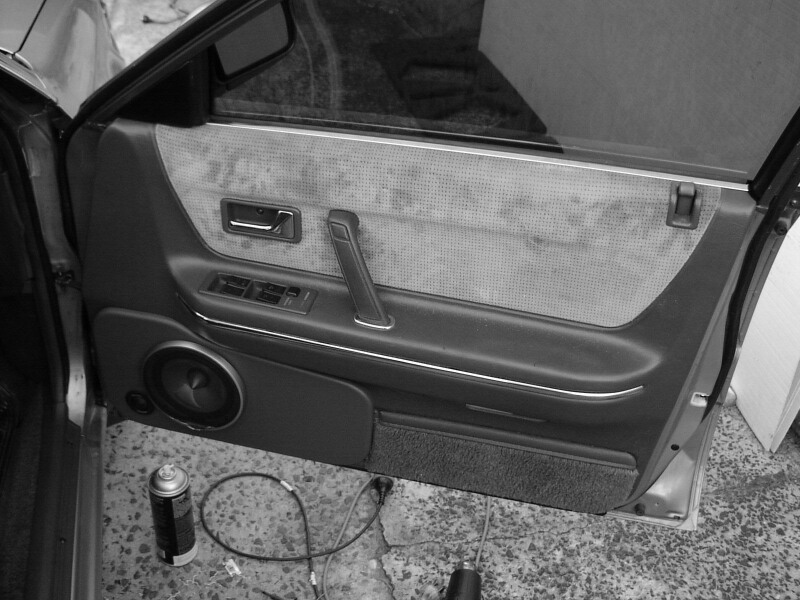 Sound deadening even helps factory speakers so get your self some today. Note; wavelength image taken from A Review of the Universe - Structures, Evolutions, Observations, and Theories. Absorption, reflection, refraction, standing waves, azimuth, dispersion and the list goes on; these and all matter of other phenomena associated with soundwaves often receive mentions aplenty, especially pertaining to subwoofer enclosure design and tweeter aiming. However if you've ever wondered what the actual wavelength of a particular frequency is; use this wavelength calculator. Just enter in the frequency you're interested in and this'll return it's physical peak to peak cycle length. Think about a concert, opera or other similar performance; you don't sit with your back to the band or performance do you? 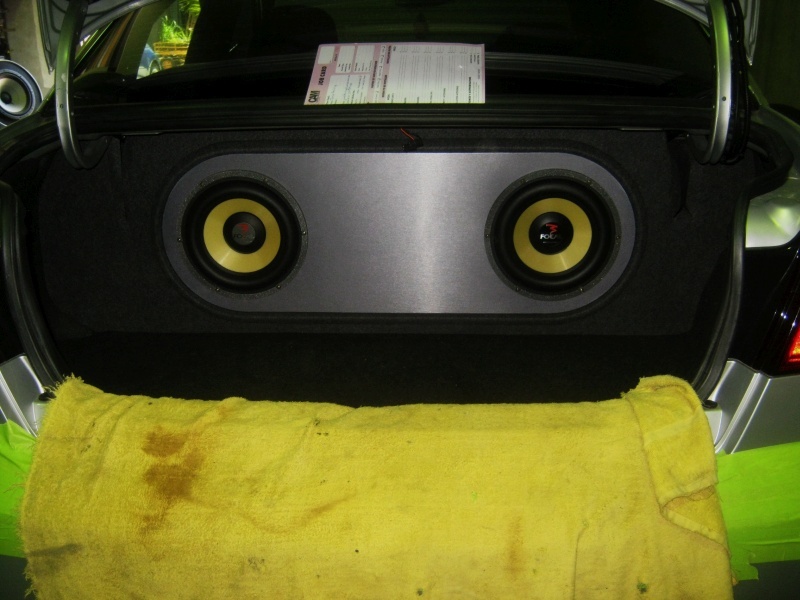 It's the same for your car, in that seeing as you're seated at the front and your ears face forwards we recommend you concentrate on getting the front stage and image perfect and leave the rear speakers alone. Therefore the short answer to the aforesaid question is 'no' if you're serious about sound quality, specifically regarding staging and imaging. Expanding upon this though requires us breaking the answer down into three parts. The Pinna, also called the auricle; is the visible part of the outer ear. This membrane collects various frequencies of sound waves from front-on before redirecting them into the outer ear canal. It's important to remember that each pinna individually is responsible for determining height whilst the two work together to determine width. Because they face forwards; sound coming from behind the pinna will not be collected accurately unless the frequency or volume fluctuations are significant. Nearly all music played in cars today, whether stemming from hardware such as CD or software such MP3; is stereophonic or stereo for short. The basic dictionary definition of stereo is two channel; left and right. We say basic because whilst technically there can be more such as featured in quadraphonic; 99.9% of all stereo music is two channel stereo. There's no centre channel information contained within the sound stream, nor is there any surround or rear channel information either. Just left and right. This intrinsically leads to the three main laws you're going to encounter in Newton's, Archimedes' and Pauli's. 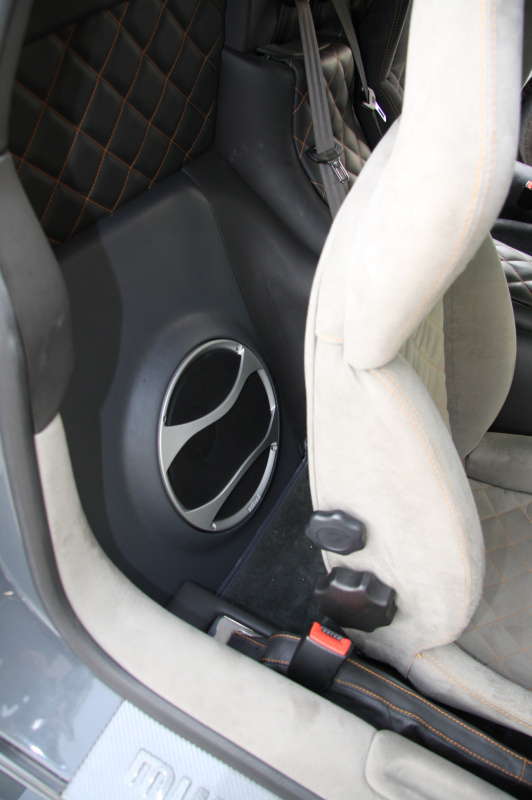 There's a very finite amount of air within your car's interior. Archimedes laws of displacement says that as you begin to agitate any one portion of this air you'll start influencing other portions of it too. With that in mind let's move to Newton's laws of motion. With it we can predict the first few bounces of a sound wave. 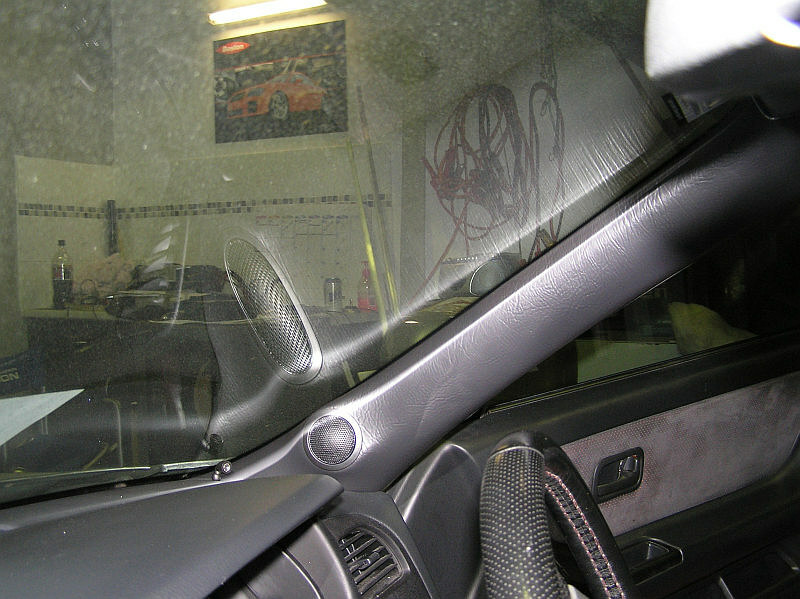 Think of your car interior as a bucket of water. When you put two fingers in (i.e. your front speakers) and begin motioning them you can easily make out the neat waves that emanate henceforth. However put another two fingers (i.e. 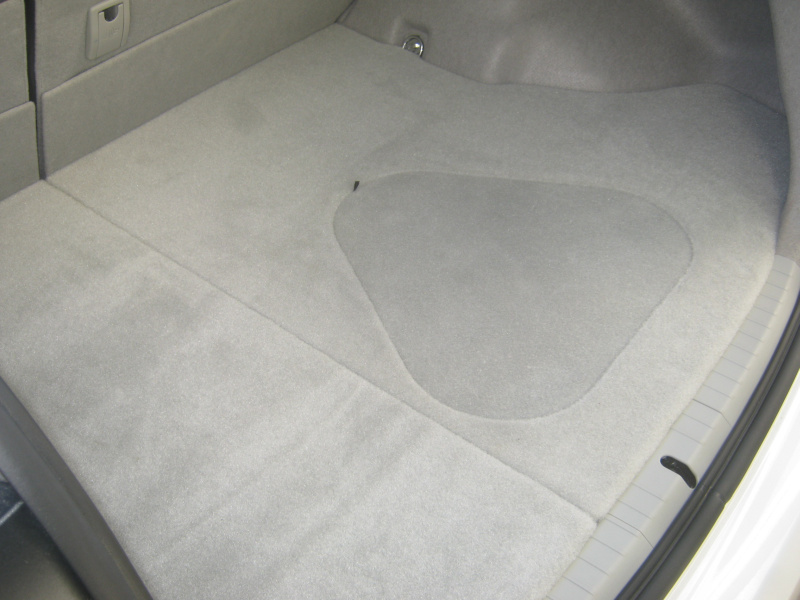 your rear speakers) into that finite amount of water and suddenly your surface turns into a choppy mess. About now is where you'll then encounter Pauli's princlple, that states two things cannot occupy the same space at the same time. 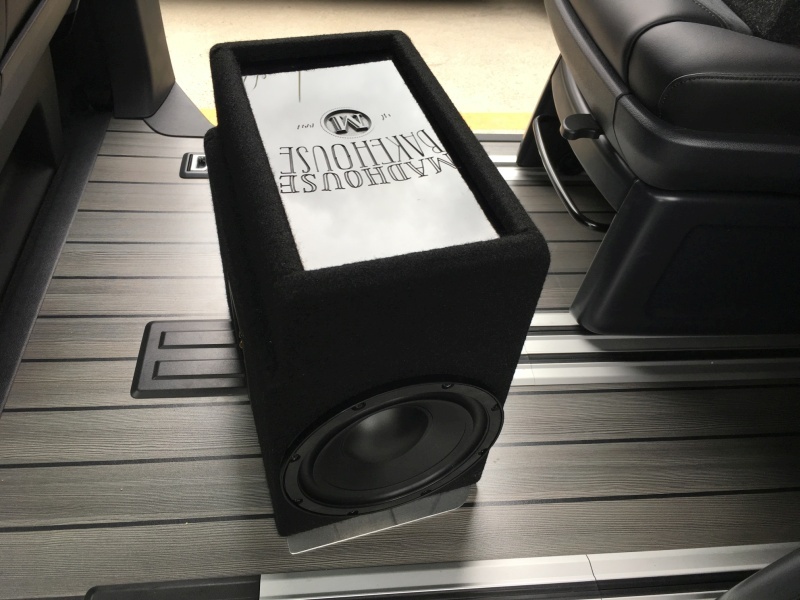 Though not a problem in a large home theater room; sadly if you have a heap of speakers all playing the same thing within the finite confines of a car interior they're going to start affecting one another, thus resulting in some nasty cancellations and dead zones. 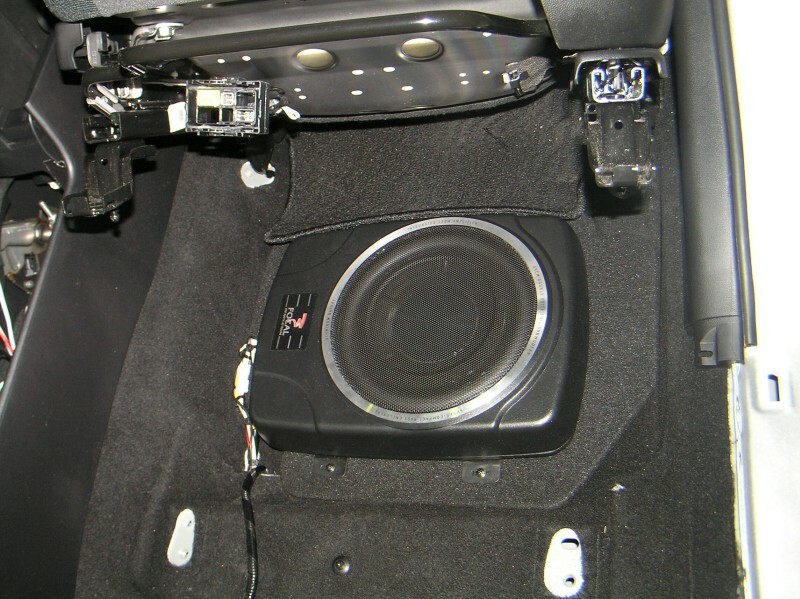 These are the reasons many demo and competition cars either have their rear speakers turned down or simply don't have them at all. Indeed it's why when talking sound quality we have front 'stage' but only rear 'fill'. 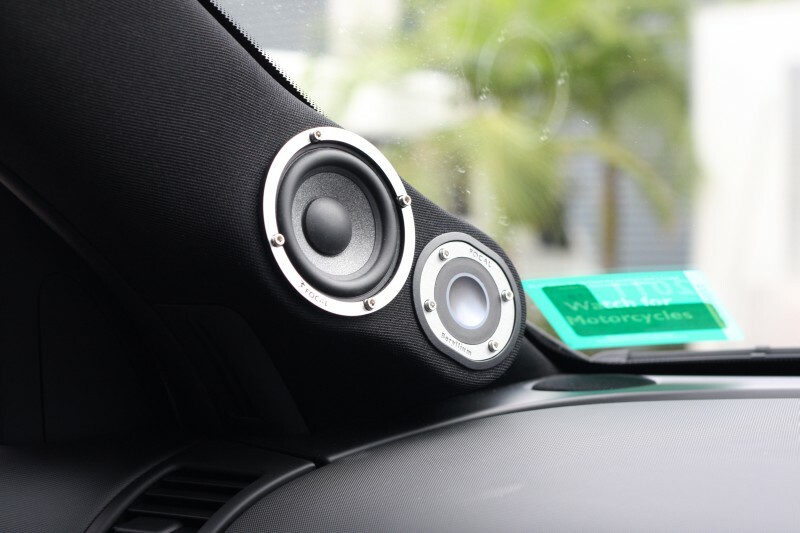 One thing that should be mentioned though is that even when you're only running front speakers you should still have an ambience that fills the entire car, when the system is tuned correctly with a quality sound processor. Cables quality and the difference it makes within audio is one subject bound to start an argument at any audio gathering, for everybody it seems has a different opinion. 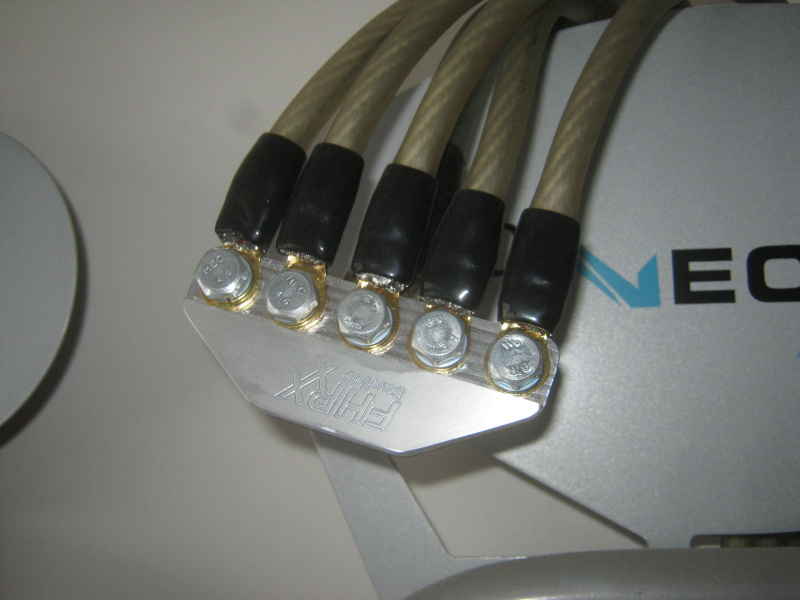 To us cables are not just cables; the reason we recommend high quality cables is two fold. The first and primary reason pertains to the cable's current carrying ability. Not only do better quality cables tend to have a lot more strands, these strands are usually constructed from superior conductive materials such as gold, silver and copper. As opposed to aluminium, tin and zinc commonly found in the cheaper alternatives. 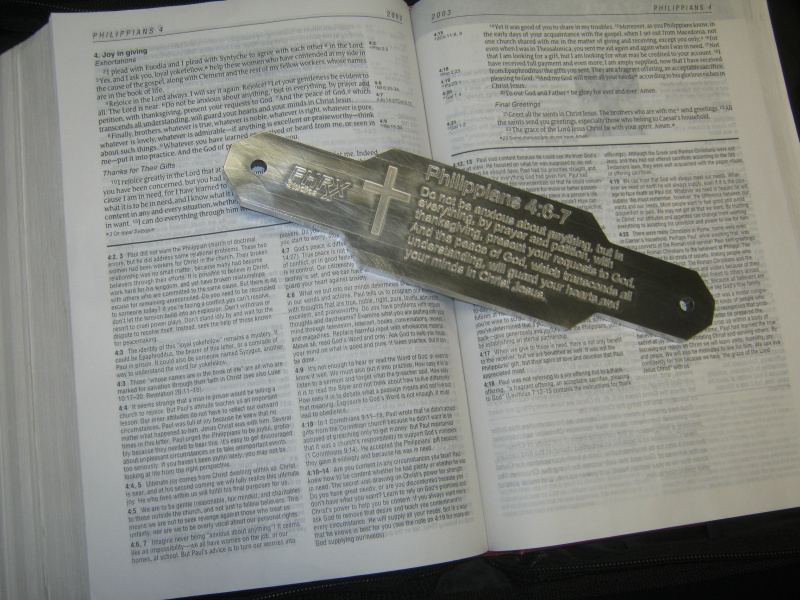 A comparison of the two is pictured below. This means that for any given gauge of cable the superior ones will flow a lot more current whilst at the same time converting less of this energy into heat. The other reason we advocate the better quality cable is because they tend to have a much more uniformly extruded jacket. If you get a meter of cheap cable and compare it to a meter of more expensive cable and chop it at 25mm intervals you'll find the cheap cable comes dangerously close to breaking out of the jacket every so often due to poor extrusion dies. See image above. Again not important if you plan on having your system for three months but if those cables have to withstand literally years of abuse under carpet (water / dirt / feet impacting them) then this might be of concern. If you'd like to read more about the intrinsic intricacies of cable design then be sure to canvas two in-depth papers by cable virtuoso QED known as "The Genesis reports". These reports delve deeply into the realm of high end cable philosophy, thenceforth lending themselves to plenty of good old fashion polarised discussion. Read them and more by visiting the QED academy. 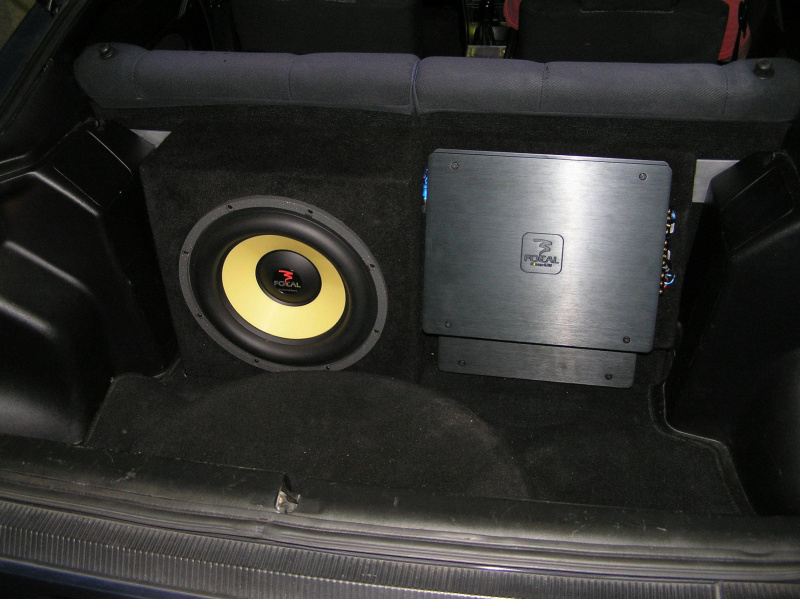 When running more than one subwoofer in an enclosure, you'll need to decide between using a common chamber (where all subwoofers run in the same airspace) or a separate chamber enclosure (where each subwoofer has its own airspace). 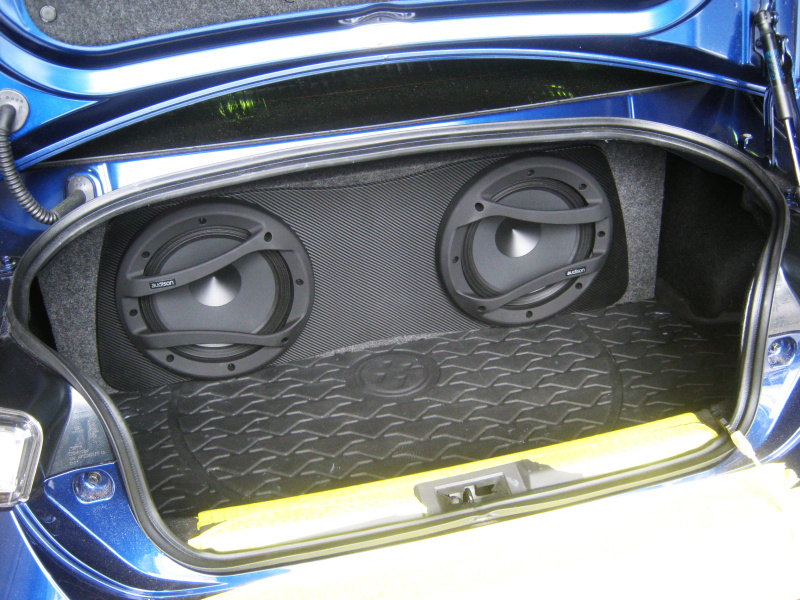 Common chamber enclosures have no dividers between the subwoofers and the airspace inside the box is the internal volume for one subwoofer multiplied by the number of subwoofers in the enclosure. 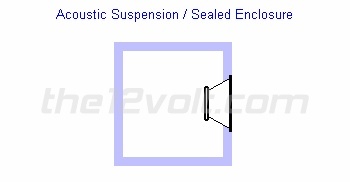 Separate chamber enclosures are built in a way that sees every subwoofer isolated inside the enclosure in its own chamber. 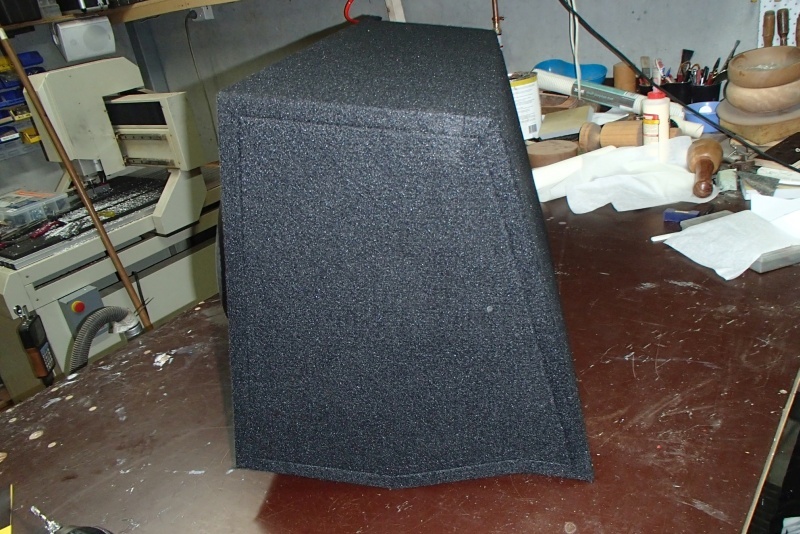 Generally speaking, it's usually better to have each subwoofer running in its own isolated enclosure, especially in a sealed box. We say this because if one of the subwoofers ceases working for any reason in a common chamber enclosure, it could cause the other subwoofer(s) to unload and you could end up ruining the subwoofers that are still working. 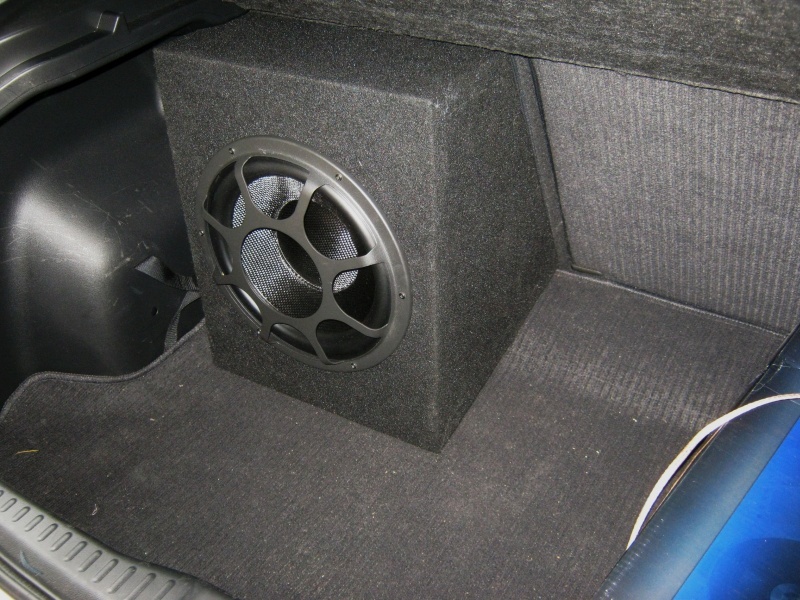 For example, if your subwoofer can only handle a 1cf sealed enclosure and is running flat stick when it's brother dies, then all of a sudden that remaining subwoofer is in a 2cf sealed enclosure which may lend itself to a catastrophic suspension failure. 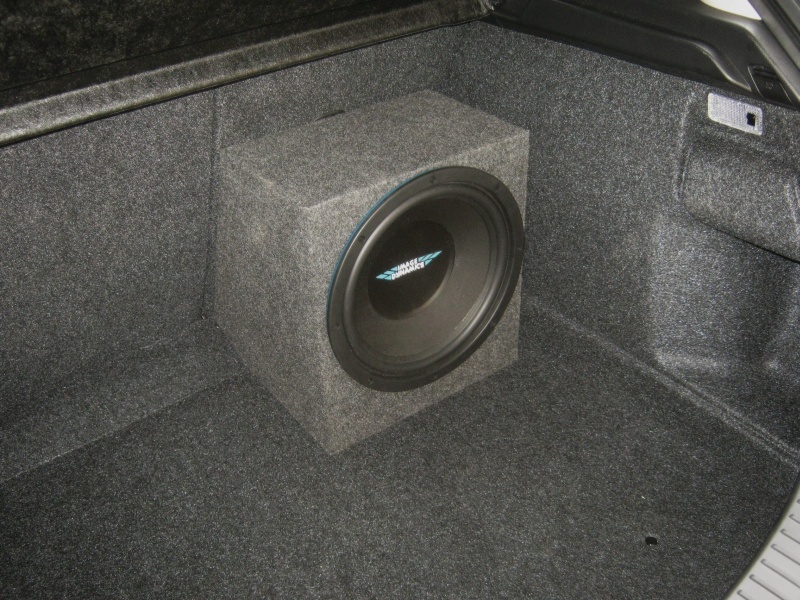 Ported and bandpass enclosures are the only type of enclosures that we tend to recommend running with a common chamber. 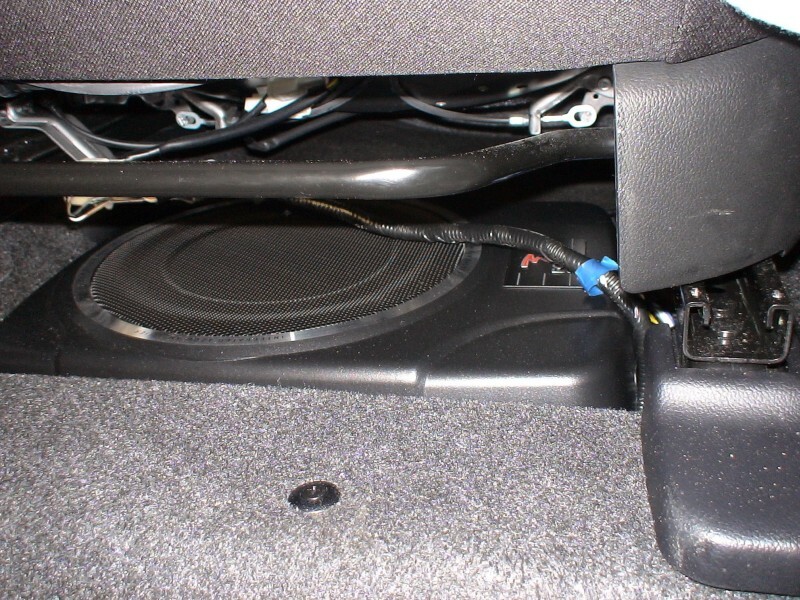 This is because it allows you to have a single port (either slot, round or otherwise) acting as the port for all subwoofers in the box. 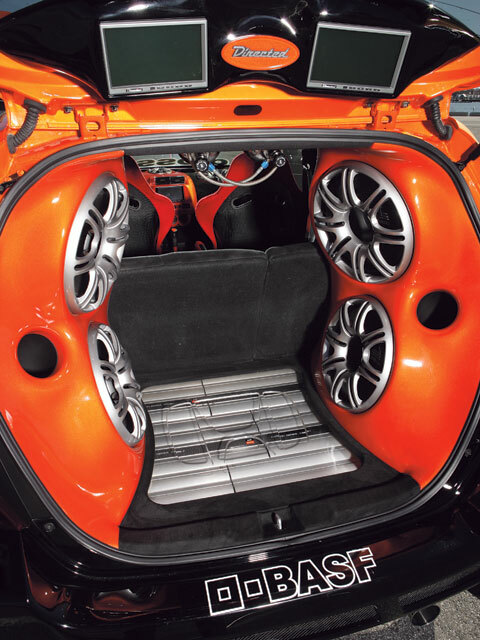 This will generally require less space than having separate ports in separate chambers for each subwoofers. 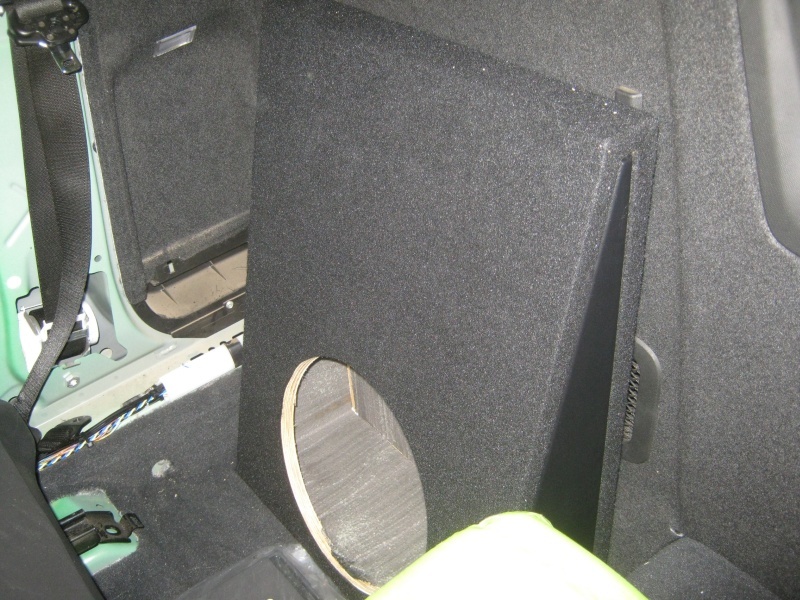 The possibility of a good subwoofer unloading when another fails is less likely in a ported box as well. 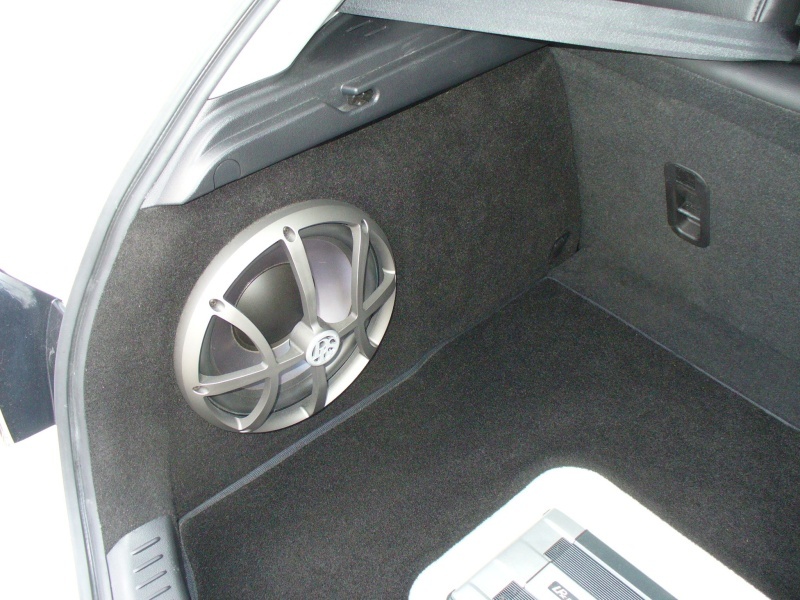 In conclusion; if you're running with a sealed box then we suggest it should have separate chambers for each subwoofer. 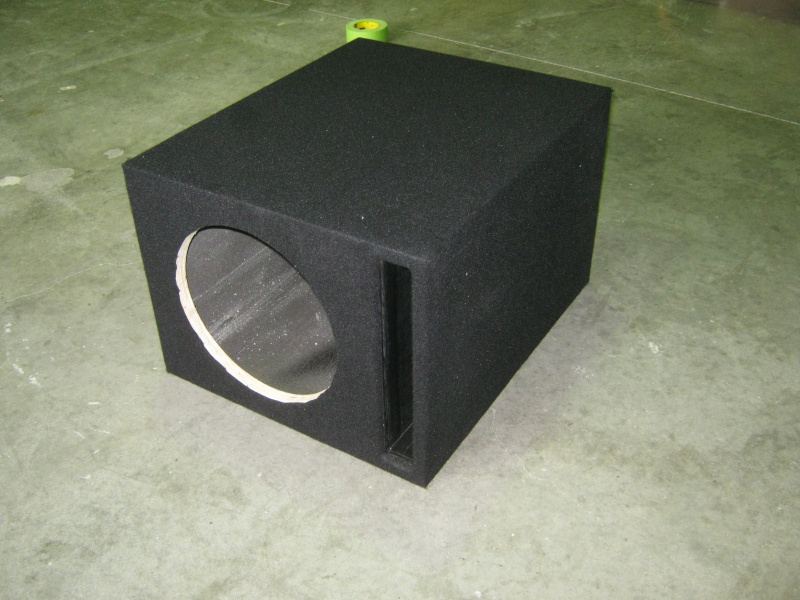 If you're running a ported subwoofer enclosure then it is quite okay to have either separate or common chambered enclosure. However, if you have the space it is always best to design a multi-chambered enclosure so each subwoofer is isolated in its own airspace. 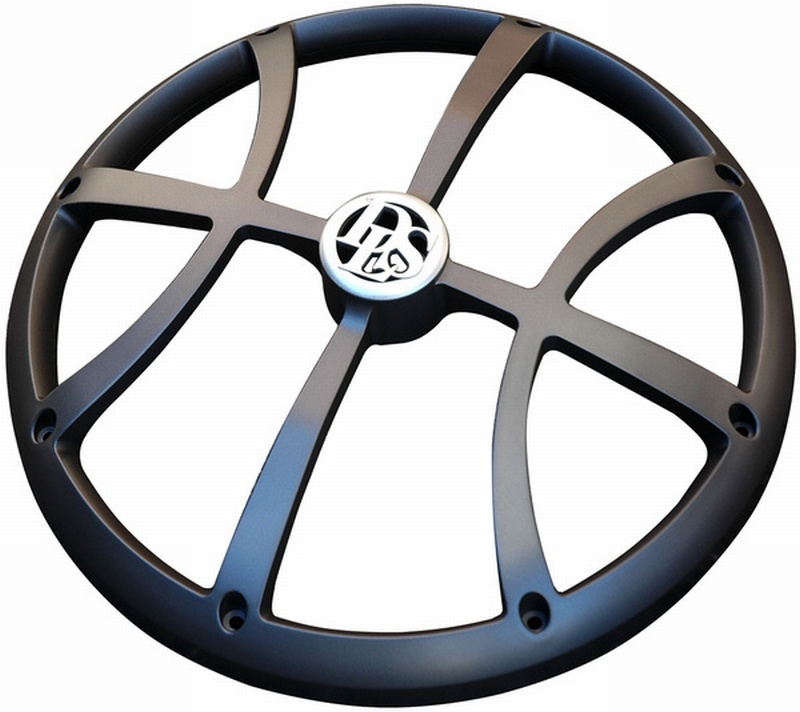 When it comes to protecting your new subwoofer there are grilles of every shape size and type. 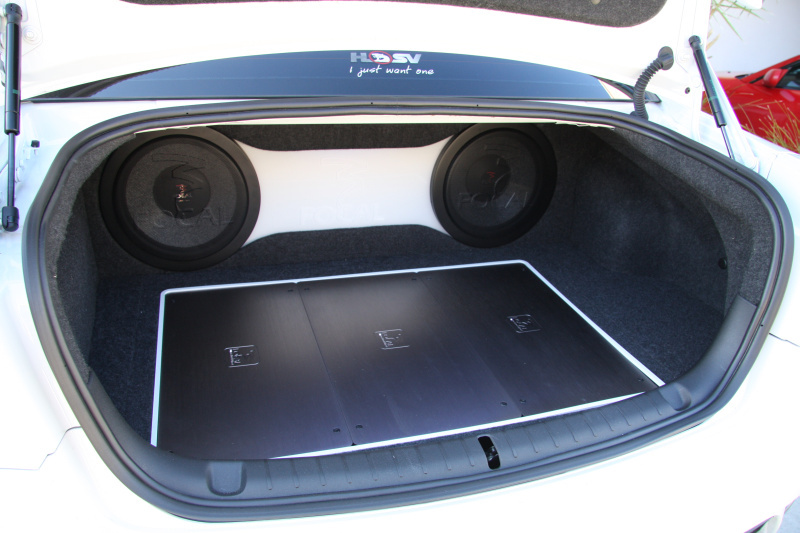 From simple bars to completely exotic custom machined numbers; we have your subwoofer covered - literally. To this end; we get asked so often about what grilles are available that we actually decided to add it to the frequently asked questions page! 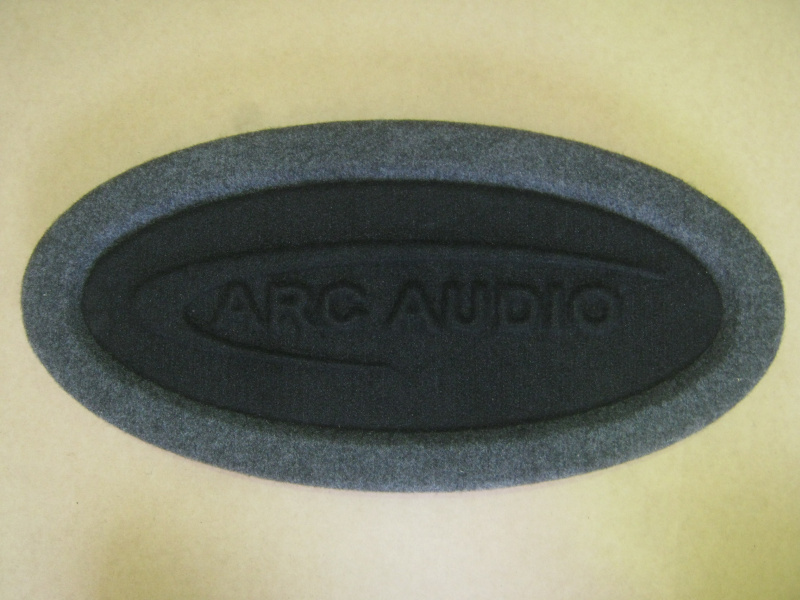 Below are some of the more common types and flavours of grilles we employ here at Fhrx Studios to protect your subwoofer. Steel grate grille. These are the most basic grilles available and're most functional, which is a good thing because let's face it; they're ugly as sin. Approximate pricing starts at $15. Steel mesh grille. These are the cleanest and mose commonly used grilles. Approximate pricing starts at $50. Chrome grille. 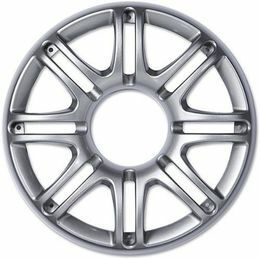 These are a little decorative but still tend to resemble mag wheels. Approximate pricing starts at $40. 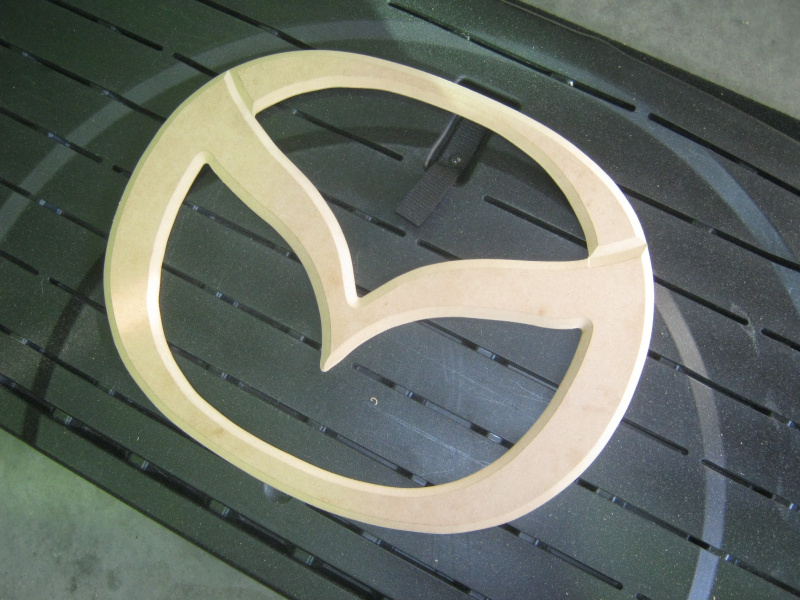 Custom made grille. 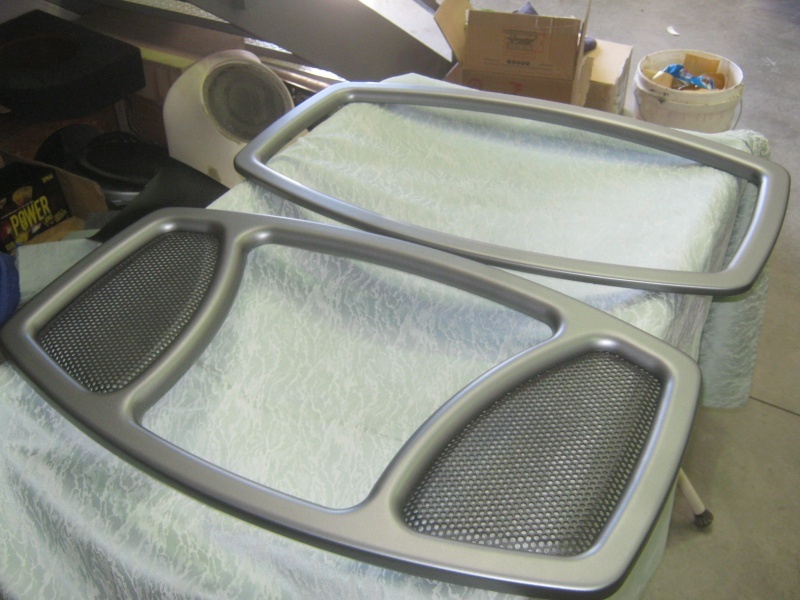 These are custom made from scratch for those subwoofers where a standard 'off the shelf' grille will just not do. This may be due to excursion or physical dimension issues. Approximate pricing starts at $80. 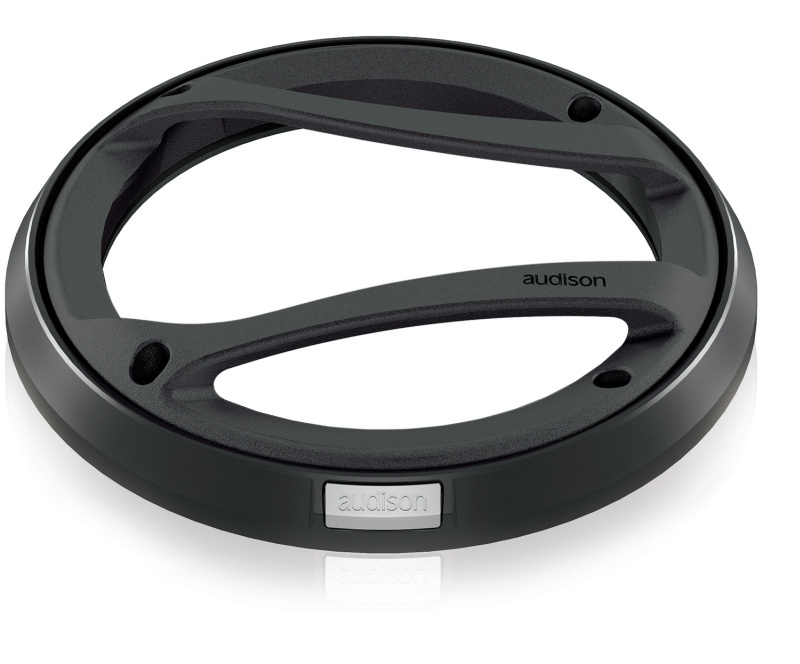 Audison. Great looking grilles from the Italian giant. The black grilles are designed to protect the Voce range whilst the silver protect the Thesis range. Approximate pricing starts at $59. 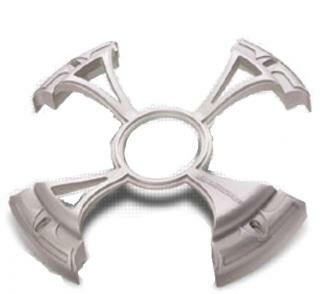 Crossfire The A-spec alloy grille is the most commonly used from all Crossfires products. Approximate pricing starts at $45. DLS. Despite being shaped like a basketball these grilles are very strong. Approximate pricing starts at $99. Fishman Audio. 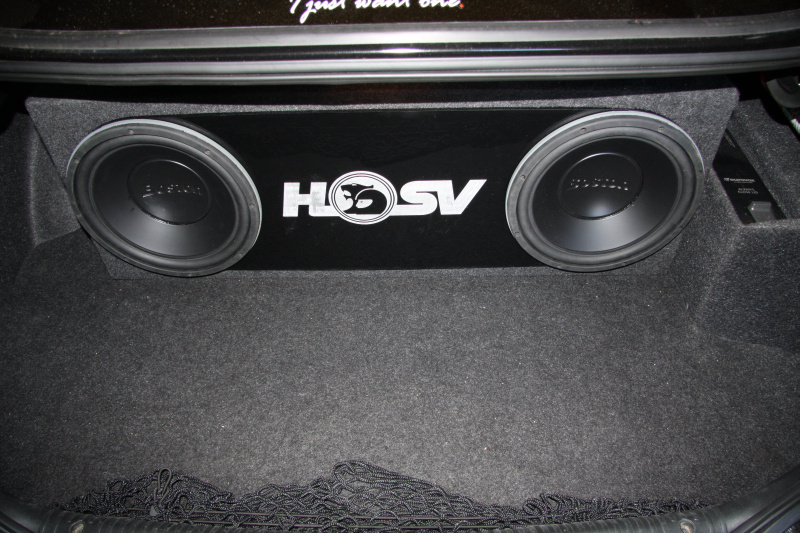 Stylish and good for subwoofers with high excursion. Approximate pricing starts at $90. Focal. 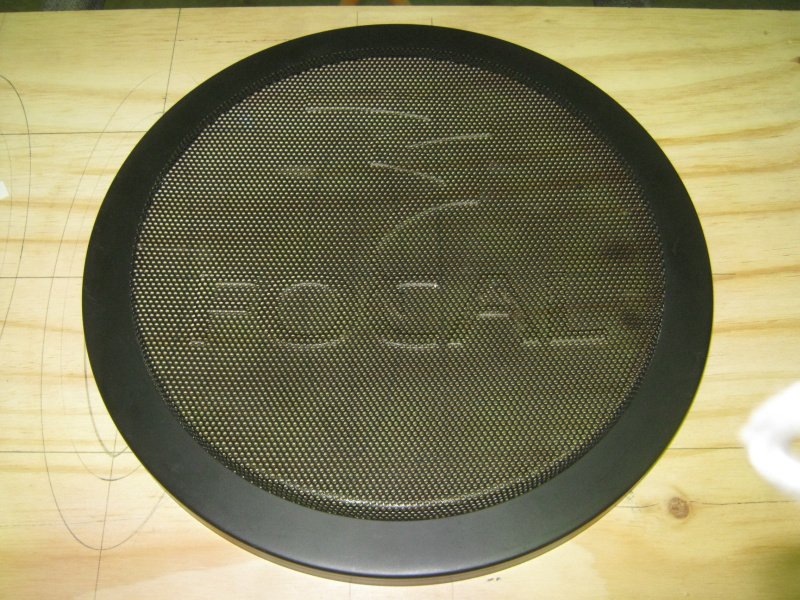 These great looking mesh grilles were Focal's protective effort, though sadly they're now out of production and can be quite difficult to find. Approximate pricing starts at $79. Hertz. These are from the Italian giant. Approximate pricing starts at $49. Morel. Not only suitcase proof but bulletproof too. Approximate pricing starts at $59. 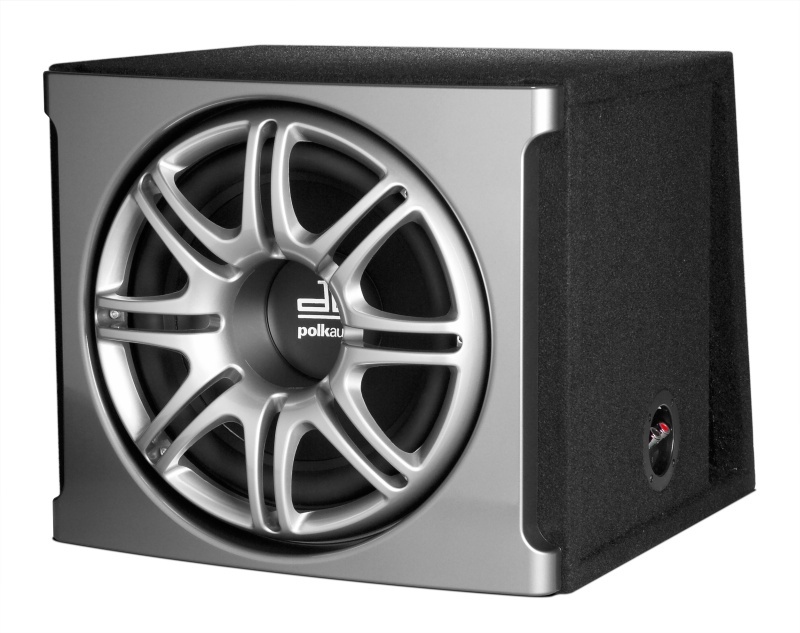 Polk Audio. Of course you can get American grilles too. Approximate pricing starts at $45. Handle grille. 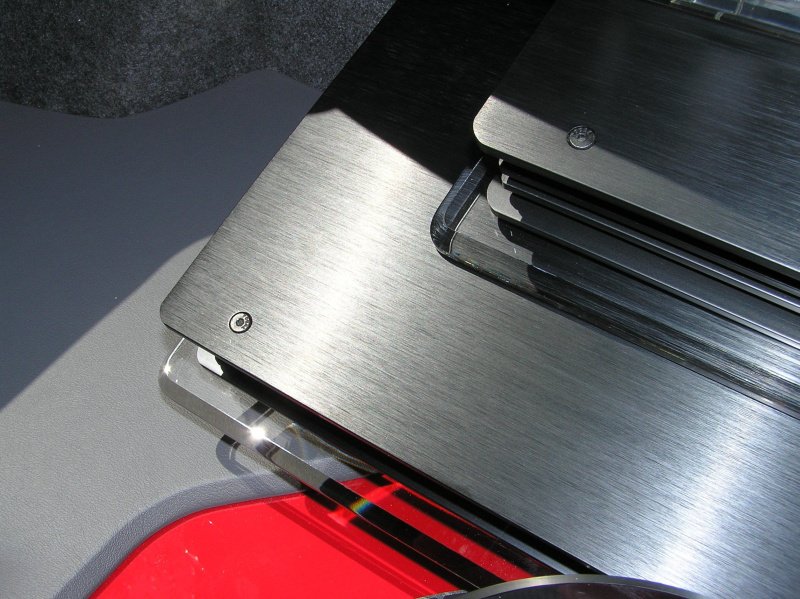 These grilles are often made from simple kitchen drawer handles and with the options available look right at home in most cars. Approximate pricing starts at $20. Bar and plate grille. 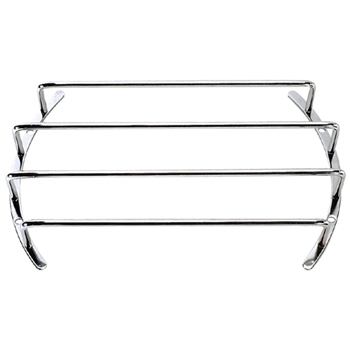 These grilles are similar to the handle grilles except they have base plates attached. 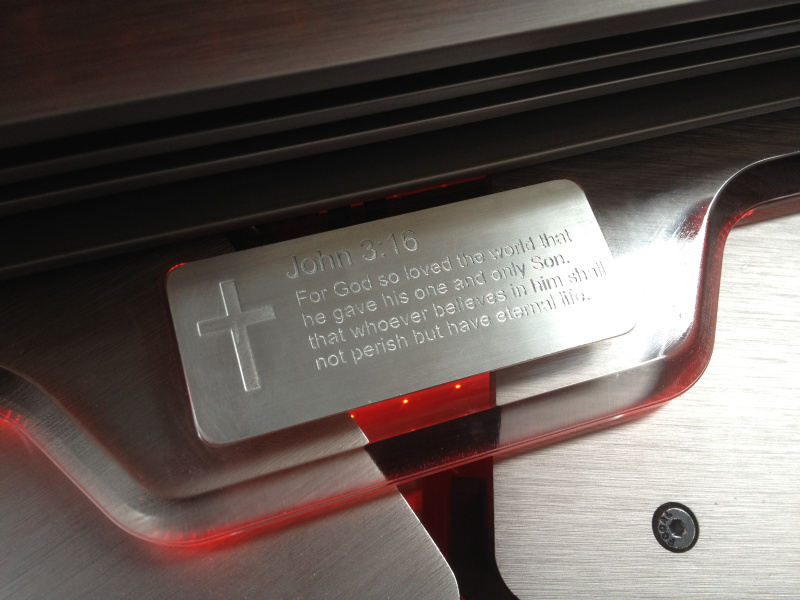 If you're using metal base plates you can also have your own custom designs engraved. Approximate pricing starts at $100. 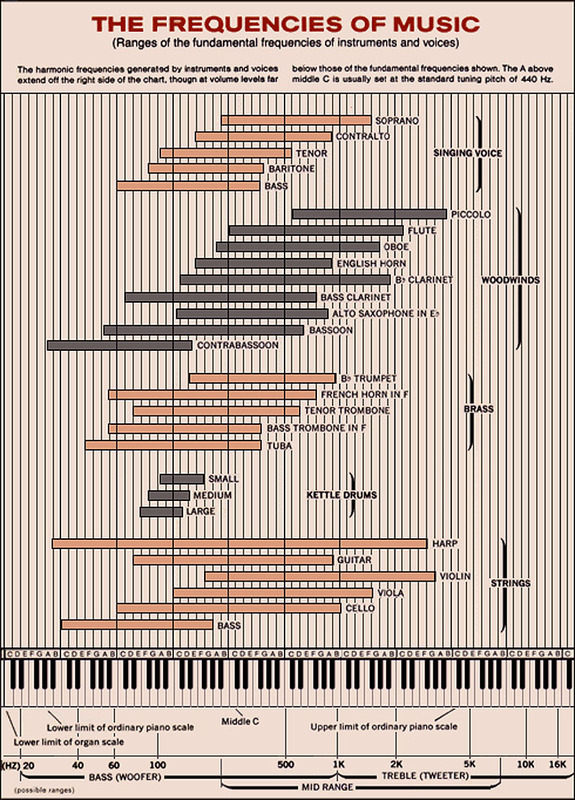 Ever wondered what instruments play which frequncies? Or wondered what the difference is between an alto singer and a soprano? Well look no further, below are two frequency charts that will help clear things up a little. These types of charts are what we more commonly use to demostrate where each frequency lies. 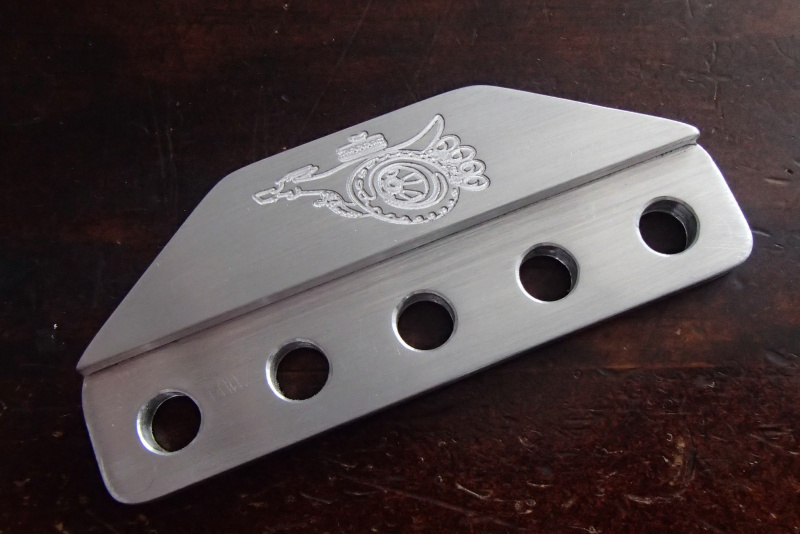 These will also aid you in tuning your system, especially if you're using a multi-band equalizer. Just like the petrol tank at the back of your car holds the fuel for your engine, your battery holds the fuel for the electrical components within your car. A standard battery is okay for standard electrical demands but once you start adding electrical components (such as amplifiers) you'll need to bring the power storage system up to speed too by either adding a capacitor or upgrading your battery. Lets look a little further into what a battery actually is. Batteries differ to stiffening capacitors in that they create electricity via a chemical reaction whereas caps simply store energy. Your standard run-of-the-mill lead-acid cell (i.e. 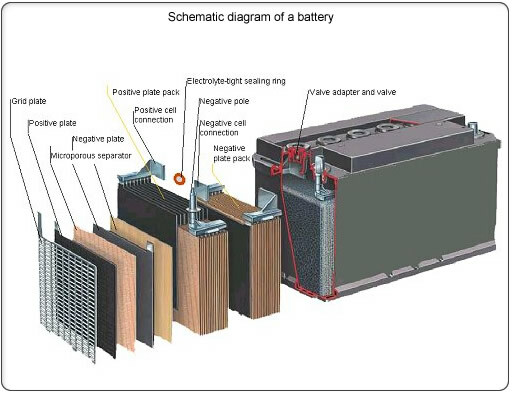 factory car battery) is created using a large number of thin plates that are mounted tightly side by side (or in spiral / circular cells as is the case with Optima batteries). The material these plates are made from alternates as they sit side by side (i.e. plates 1, 3, 5, 7 and 9 are one material while plates 2, 4, 6, 8 and 10 are the other). The most commonly used of these materials are Lead Dioxide (PbO2 / the positive plates) and Sponge lead (Pb / the negative plates). These plates are immersed in electrolyte which is most commonly diluted Sulphuric Acid (H2SO4). The types of metals and the electrolyte used will determine the output of a cell. A typical fully charged lead-acid battery produces approximately 2.11 volts per cell so when you couple six of these cells together you get your twelve volt car battery. The chemical action between the metals and the electrolyte (battery acid) creates the electrical energy. Energy flows from the battery as soon as there is an electrical load (e.g. a starter motor, an amplifier, a pair of headlights, a heater and so on) that completes a circuit between the positive terminal (connected to the positive plates) and the negative terminal which is connected to the negative plates. Electrical current flows as charged portions of acid (ions) between the battery plates and as electrons through the external circuit from negative to positive. Just re-read that last sentence again too; the power flows from the negative to the positive - this is why we put so much emphasis on earthing kits and other earth upgrades when installing systems. The action of the lead-acid battery is determined by many factors, some of which include the chemicals used, state-of-charge, temperature, porosity, diffusion, and of course; load. As a side note I should also mention that while many batteries (such as Optima and Odyssey) are called dry cells, they're actually gel-cells. The electrolyte is actually a jelly like substance rather than a true dry substance. Moving to the actual life and home of batteries, what most people don't realize is that car batteries operate in a constant process of charge and discharge. 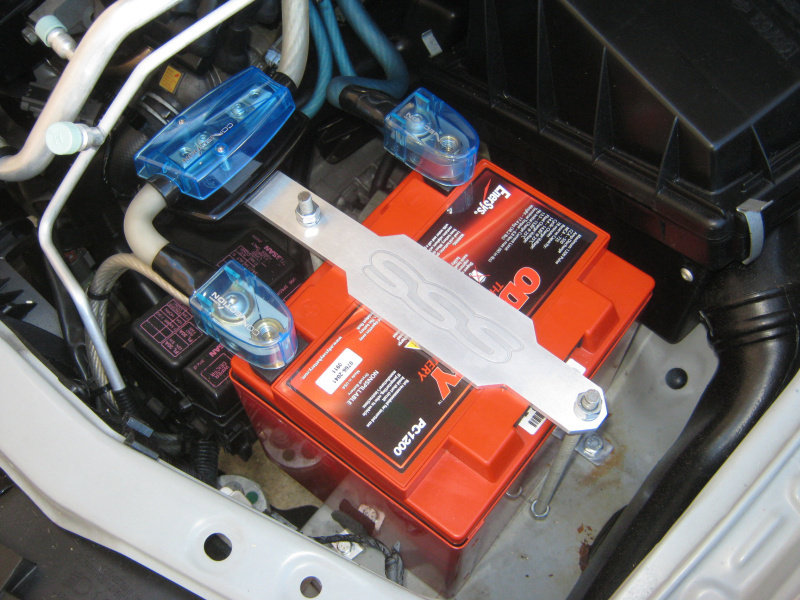 When a battery is connected to a load that needs electricity (such as the starter motor) current flows from the battery and it begins to discharge. In the reverse process a battery becomes charged when current flows back into it. This process restores the chemical difference between the plates. This happens constantly while you're driving because the alternator puts current back into the battery. Expanding this concept and getting a little more technical; as a battery discharges the lead plates become more chemically alike. The acid becomes weaker and the voltage drops. Eventually the battery is so discharged that it can no longer deliver electricity at a useful voltage. You can recharge a discharged battery by feeding electrical current back into it. A full charge restores the chemical difference between the plates and leaves the battery ready to deliver its full power again. This unique process of discharge and charge in the lead-acid battery means that energy can be discharged and restored over and over again. This is what's known as the cycling ability in a battery. More about battery cycles later. When the battery won't start your car people usual refer to it as "dead". However that is not technically correct. 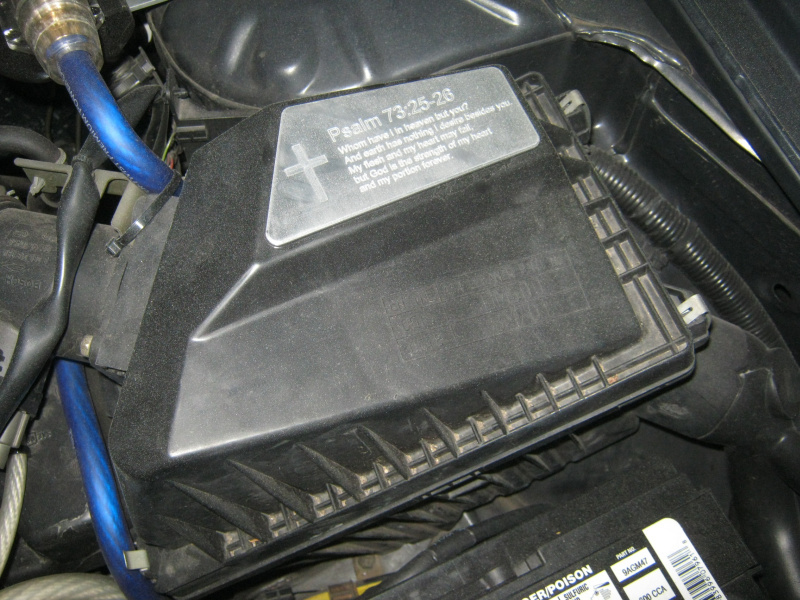 A battery that's merely discharged (from leaving your headlights on for example) can be jump-started from another fully charged battery and recharged to its full capacity. About thirty minutes of driving around should allow the alternator to fully charge the battery. However if the alternator (or another part of the cars electrical system) is damaged the battery will not recharge. 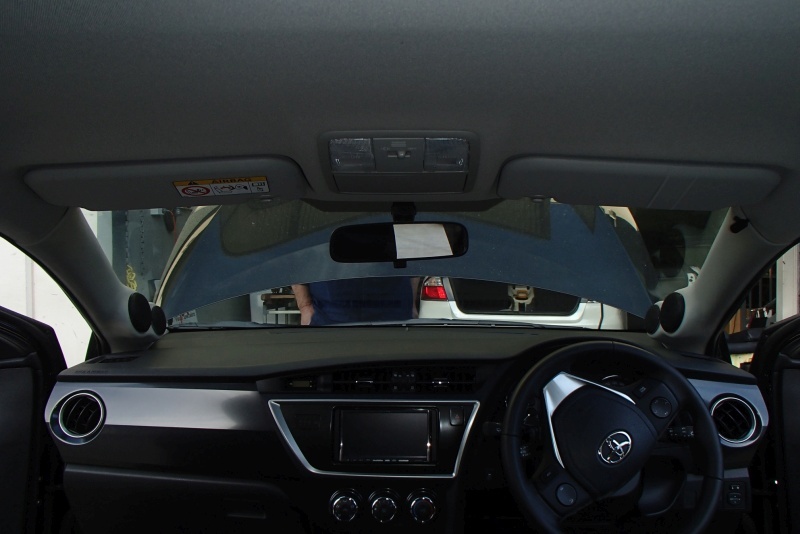 So if your battery keeps discharging, have someone check the electrical system before changing the battery. Recharging can only be undertaken a certain number of times for any given battery and when once it reaches the end of its service life (when the active material in the plates can no longer sustain a discharge current) it must be replaced. 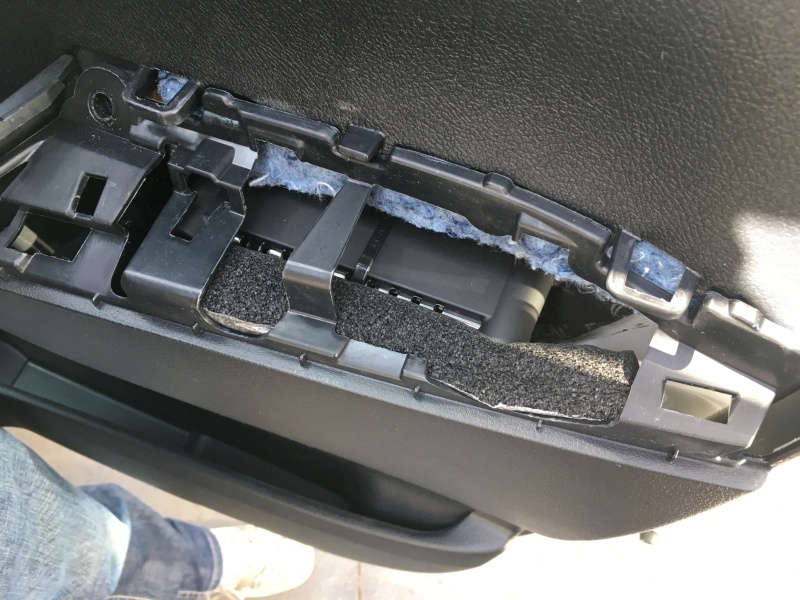 Car batteries age as the active positive plate material sheds (or flakes off) due to the normal expansion and contraction that occurs during the discharge and charge cycles. 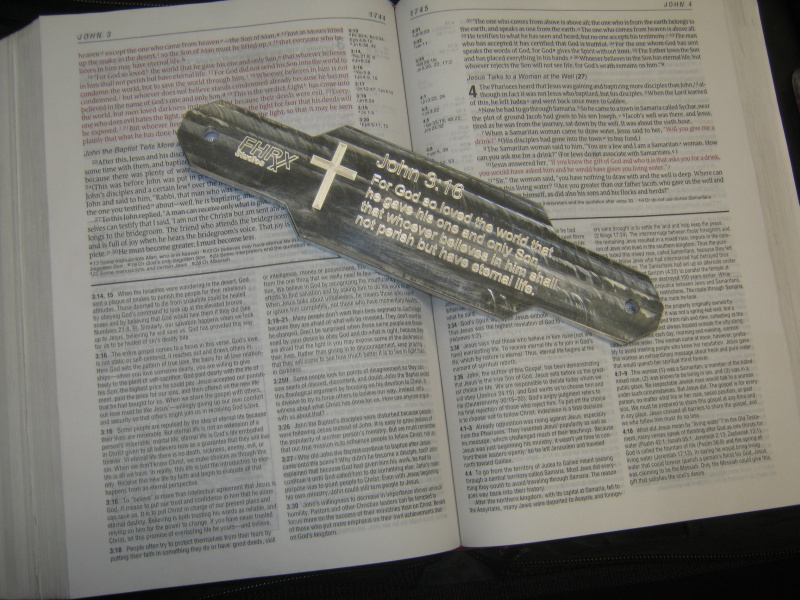 This causes a loss of plate capacity and muddy sediment to build up in the bottom of the case. This can eventually lead to short between the plates of a cell and is a shore fire way to kill off the battery. In hot climates there are additional causes of failure such as positive grid growth, positive grid metal corrosion, negative grid shrinkage, buckling of plates or loss of water. The list doesn't end there though. Deep discharges, heat, vibration, fast charging, and overcharging all accelerate the "aging" process. Scarily though; approximately fifty percent of premature car battery failures are caused by water loss during normal recharging and charging (in other words; a lack of maintenance). The water simply evaporates under high temperature (either internally or under bonnet) and many people simply don't bother to top it up. And for heavens sake purchase a battery that is of the right size for the job at hand. 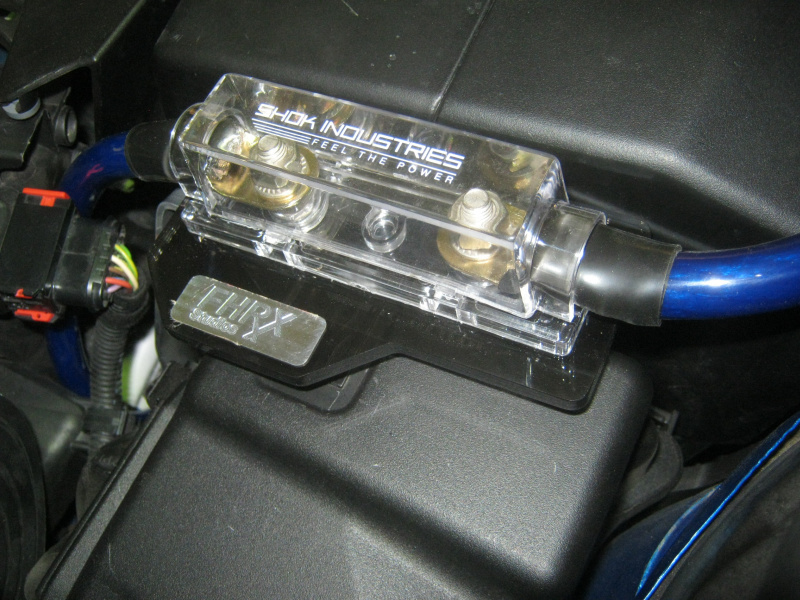 Many intercooler kits (such as the one for the 200SX) come with Odyssey 650 battery to allow the intercooler tube to go through the battery tray. These batteries are designed for jet skis and are literally murdered when you start placing big demands on them. Battery cycle is another important aspect to consider and if you're an audio nut you no doubt will have heard of deep-cycle batteries. A cycle is defined as one discharge and one recharge of the battery. 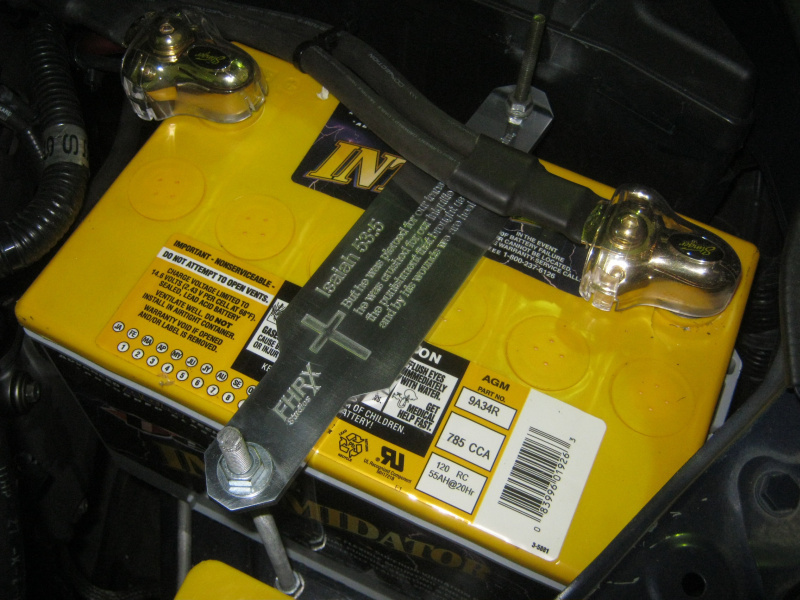 Most normal and deep-cycle batteries are lead-acid cells and use exactly the same chemistry for their operation. The difference is in the way that the batteries optimize their design. 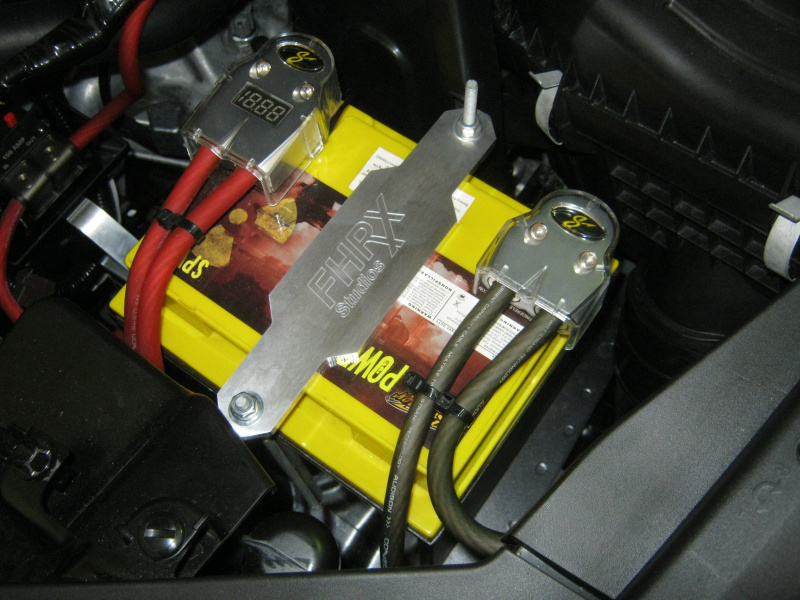 Normal shallow cycle car batteries are designed to provide a very large amount of current for a short period of time. This surge of current is needed to turn the engine over during starting. Once the engine starts the alternator provides all the power that the car needs so a car battery may go through its entire life without ever being drained more than 20 percent of its total capacity. 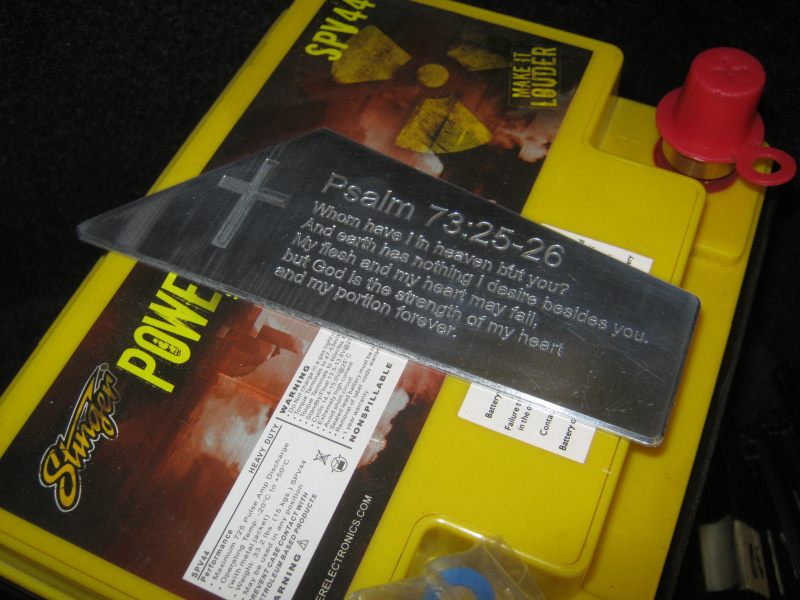 Used in this way a normal car battery can last a number of years. 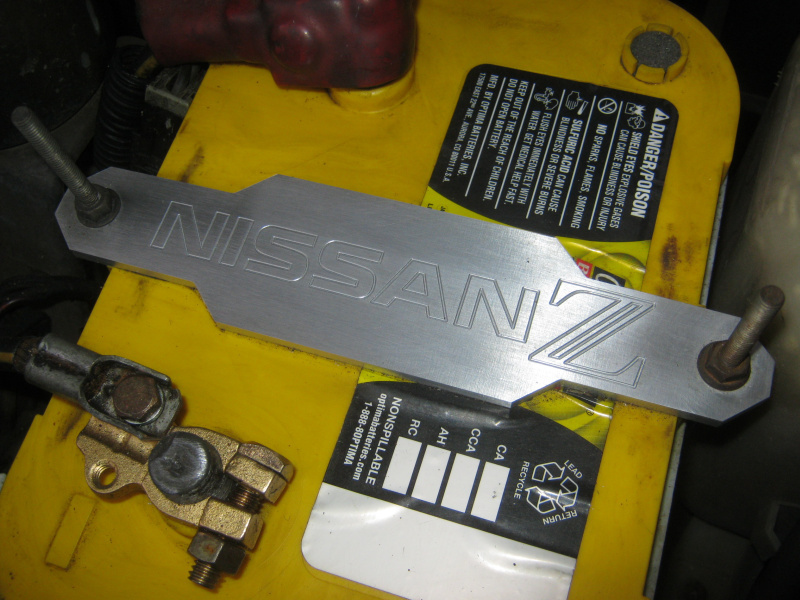 To achieve a large amount of current a normal car battery uses thin plates in order to increase its surface area. 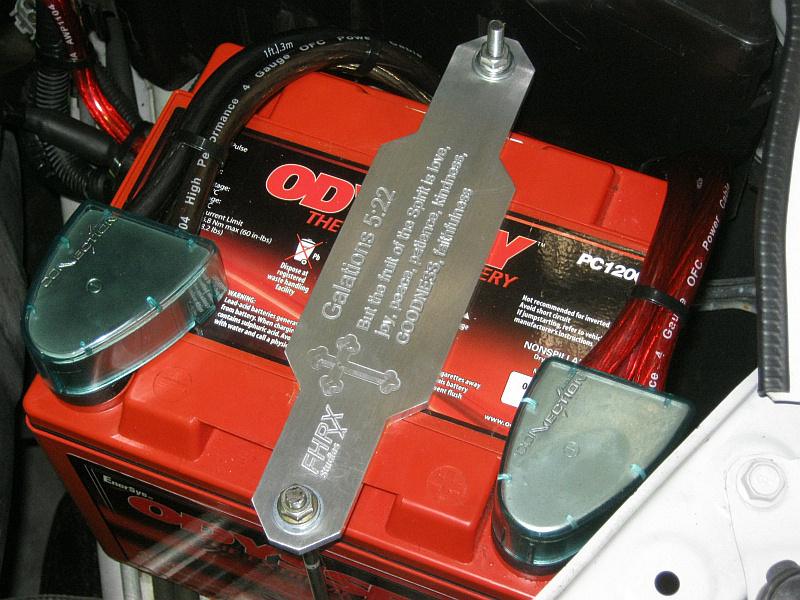 Deep cycle batteries are designed differently. 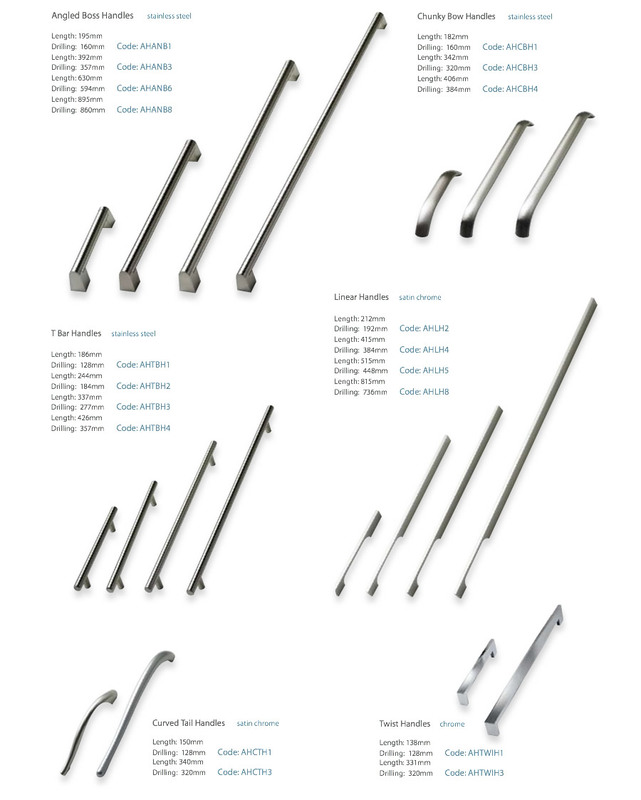 They're designed to provide a steady amount of current over a long period of time. They can still provide a surge when needed but not quite as powerful as a normal car battery can. A deep-cycle battery is also designed to be deeply discharged over and over again (such as when you're playing your stereo for long periods of time without the engine running). 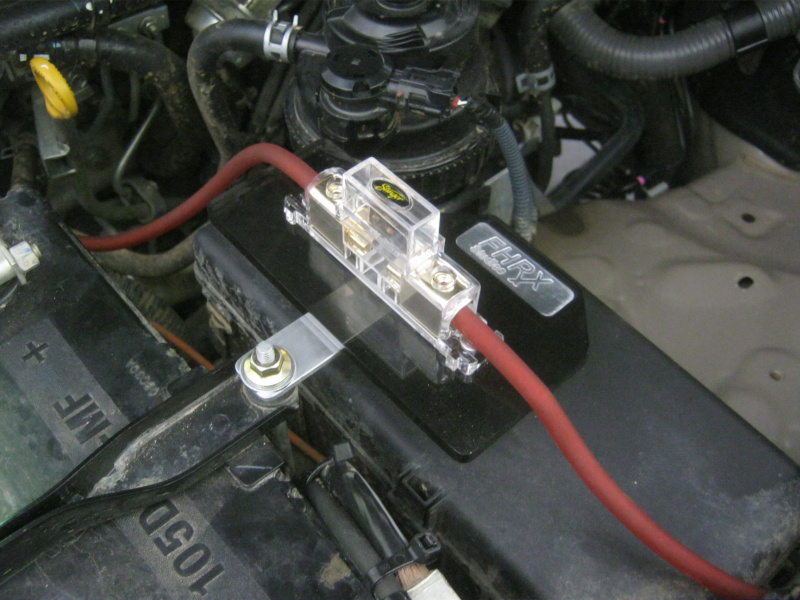 This is something that would ruin a car battery very quickly. 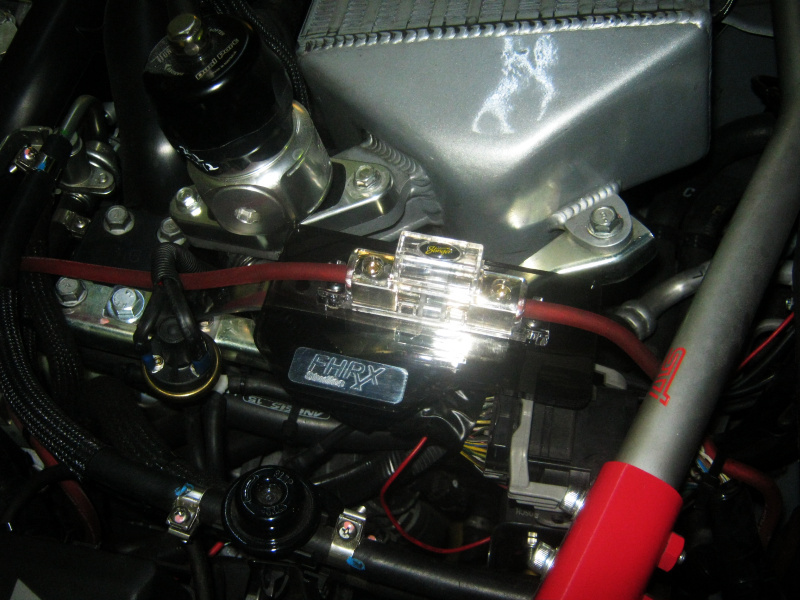 To accomplish this feat, a deep-cycle battery uses thicker plates. 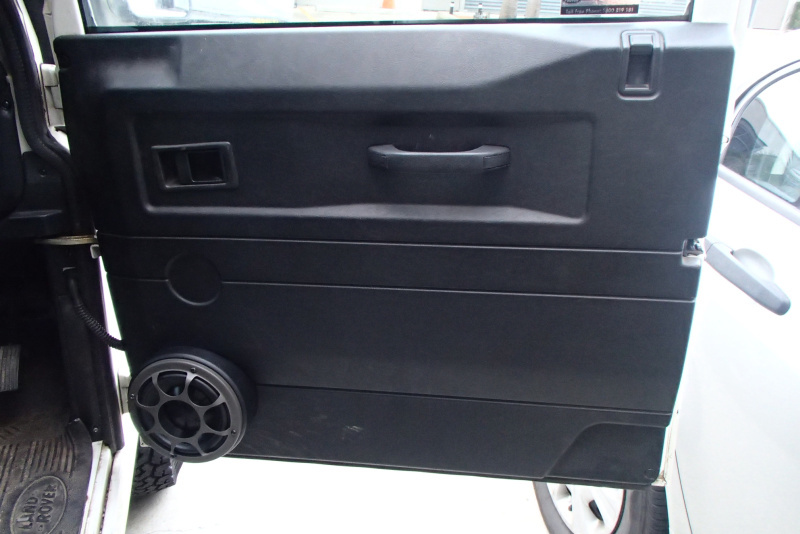 The deep-cycle battery can withstand several thousand total discharge/recharge cycles, while a normal car battery is not designed to be totally discharged. You would be ill-advised to purchase a battery without understanding some specs and two of the more important ones for a car battery are CCA and RC. 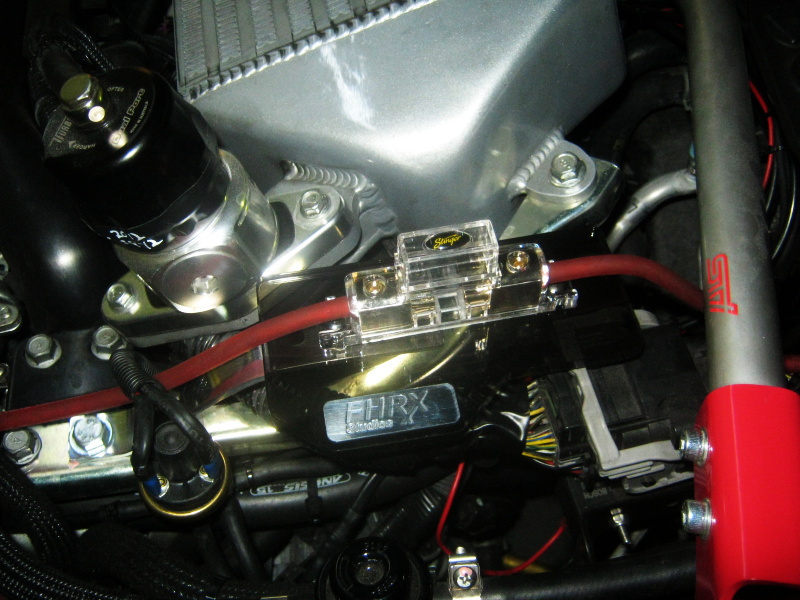 Cold cranking amps (CCA) refers to the number of amperes the battery can produce at 0 degrees C for 30 seconds. Reserve Capacity (RC) is the number of minutes that the battery can deliver 25 amperes while keeping its voltage above 10.5 volts. 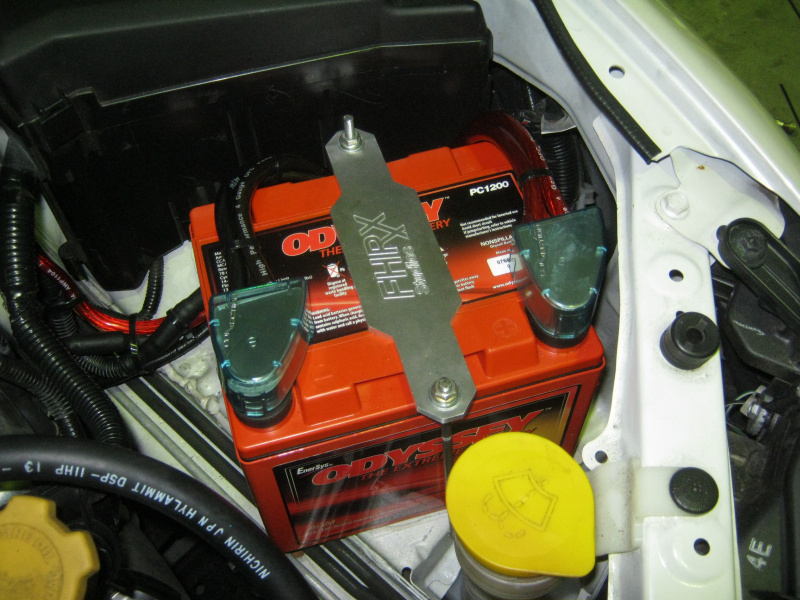 Typically a deep-cycle battery will have two or three times the RC of a normal car battery but will deliver less CCA. For this reason you'll usually find deep-cycle batteries in sound quality cars and normal car batteries in sound pressure level cars. It's very important in SPL competition cars that massive amounts of current remains on tap for instant usage. The help this cause capacitors are also often employed right next to the amplifiers. Capacitors (also known as stiffening or power capacitors) are similar to batteries but have one main difference in that they do not generate electricity. Rather; they only store it and discharge it - fast. They have a similar mechanical built to a battery, utilizing two rolled up plates of electrically conductive material separated by a dielectric insulator. Within this frame an electrical field charge is stored. The quantum (quantity) of this charge is the capacitor's value, measured in farads. 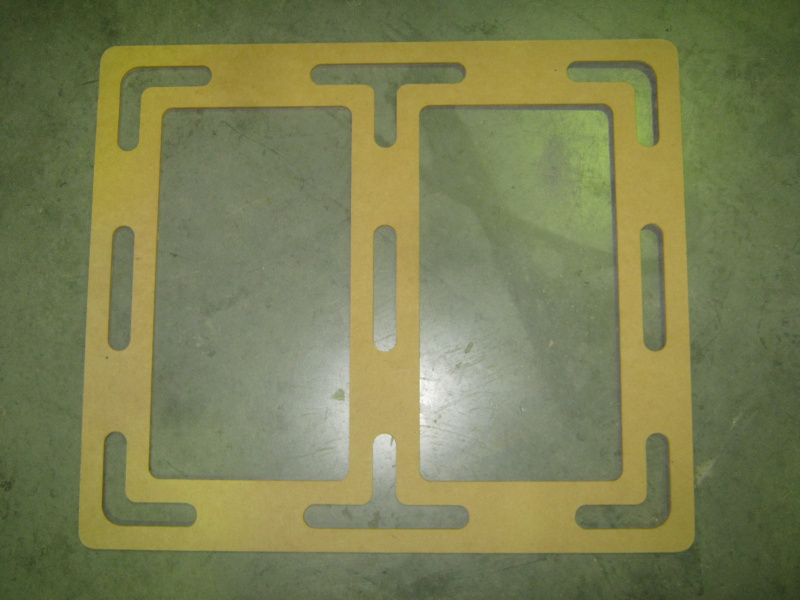 It is determined via a few factors including the surface area of the plates, the effective distance between the plates and the chemical composition of the dielectric material. Audio capacitors (the ones the size of coke cans) are fast discharging energy reservoirs that store the necessary power your amplifier will need to punch those big bass notes while limiting clipping. They store power during intervals when it is not required (which is most of the time) and release it when a short term transient demand exceeds what is available from the car's power system. If you wish to keep your factory car battery, generally you'll use a stiffening capacitor to keep your energy levels topped up. From the smallest 0.5 farad to monsters like the 35 farad one available from Stinger, you're guaranteed to find a capacitor suitable for your installation. When selecting what size cap you need there is a very general rule of thumb that states you require around 0.5 farad (500,000 microfarads) per 500 watts of continuous power output. Using more will not cause any problems other than damage to your bank account balance. Like batteries, caps have many different specs but one important one (besides farads) is named the Equivalent Series Resistance. All caps are rated for ESR and in a perfect world they would only have one figure. However all conductors have resistance and in a cap there are many conductors such as terminal leads, foil and even the dielectric electrolyte and the resistance of these conductors all contribute to the capacitors series resistance. It's essentially the same as having a resistor in series with an ideal capacitor. Capacitors with relatively high ESR will have less ability to pass current from its plates to the load (the amplifier) so consider this aspect before purchasing. In conclusion; aftermarket capacitors and batteries are NOT substitutes for a poor charging system. Even with an after market battery you may have to install a stronger alternator if your charging system is struggling. Remember too that while not all audio systems need a cap but they are nice if you can budget for one. In much the same way a car will stop with the factory brakes but if you can afford Brembo six pots you'll stop a lot faster! Note; image above is taken from How Stuff Works. The short answer is; yes there sure is. It is called Mobile audio and it can be found by clicking this link. You most certainly should. However before we canvas this topic you might first want to read about how batteries work. For once you have a clear understanding of batteries and direct current we can then move onto to how to go about getting it efficiently moving around the car. 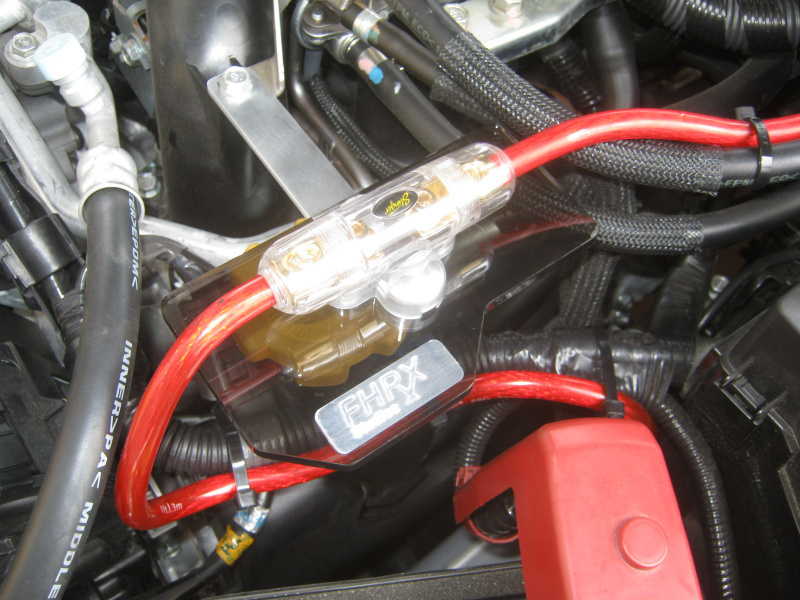 With engineering technology in modern cars getting more and more advanced one aspect that tends to get overlooked by many a manufacturer is an adequate grounding system dedicated specifically to assist the engine electrical and ignition systems. Upgrading existing earths in addition to adding numerous new key earth cables may not seem like much but when you do it the difference is certainly noticeable. 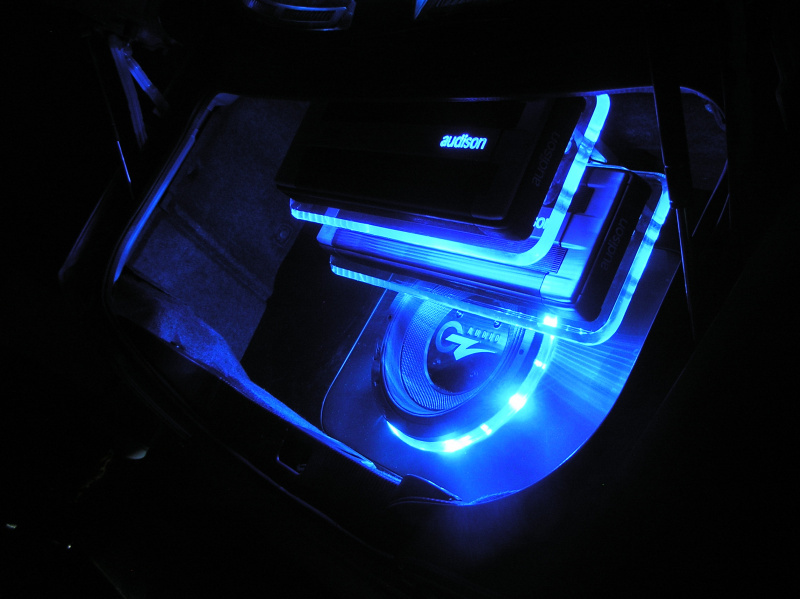 Not only will you see small improvements in power and torque figures, your motor will run smoother, it will rev cleaner, your lights will be brighter and although hardly likely to impact you, earthing kits actually assist in fighting engine water corrosion caused through electrolysis. 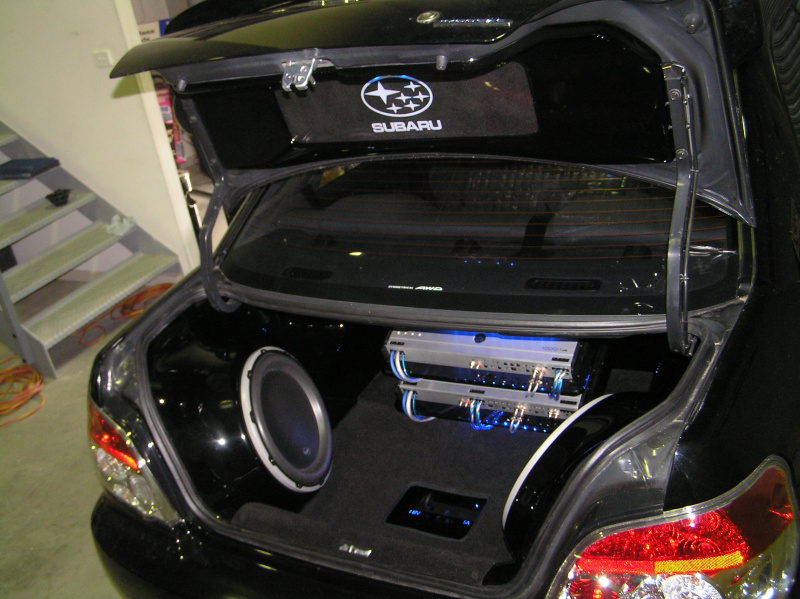 The big winner though is your sound system though, because like everything else in life; your amplifiers need fuel too. So why add additional earthing? As you know; direct current flows in a circuit from the negative battery terminal, through the car and it's electrical devices then returned to the battery via the positive terminal. Everything is fine and dandy from the factory with current happily flowing through all the various electrical devices and back to the battery. However then you install yourself a titanic new amplifier. This is usually where the problems start, and it's not what many people assume either. See when it comes to inadequate earthing systems it's usually not the cable itself that is the problem but rather where those cables are anchored. 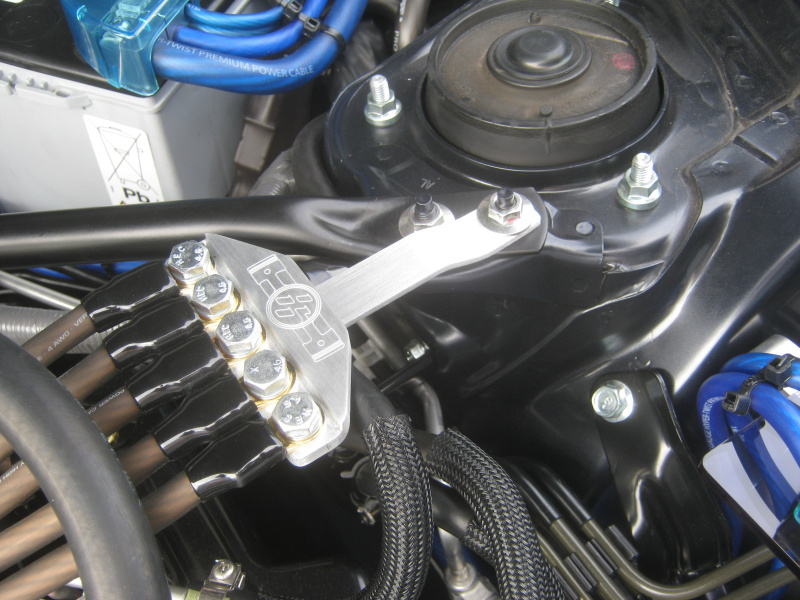 Earthing cables are regularly attached to the side of the engine bay via a small screw often located on sheet metal. Here is where the first bottleneck is created, as you're trying to flow enormous amounts of current across one or two bolt threads. It's for this reason we install multiple earths on cars. 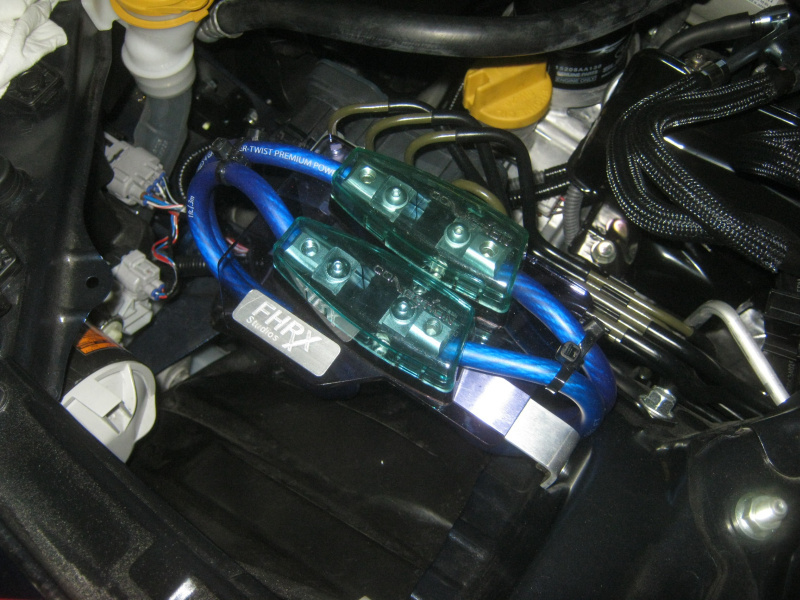 These additional cables runs from the battery negative terminal to various points over the car such as shock towers, head, plenum chamber etc. Thenceforth this allows current to flow much more readily. Click here for photos of smaller earthing upgrades. 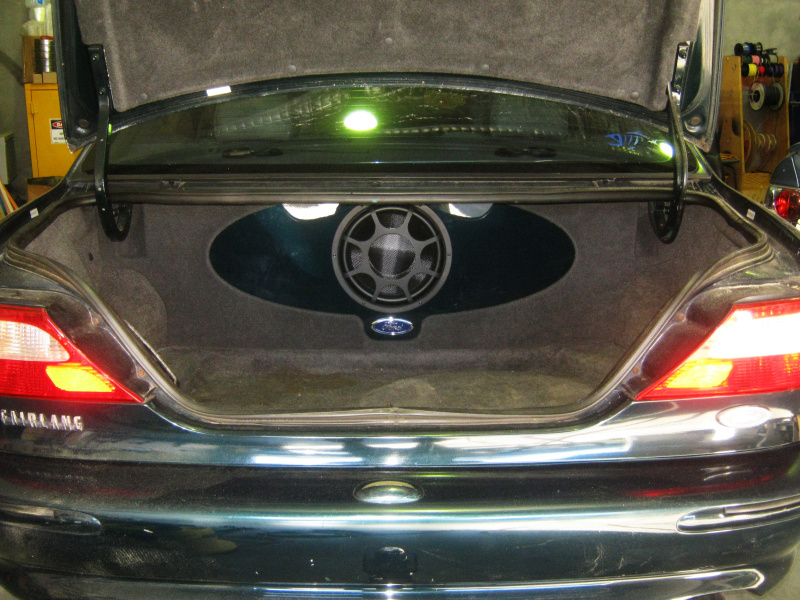 Click here for photos of larger earthing upgrades including our various earthing kits. 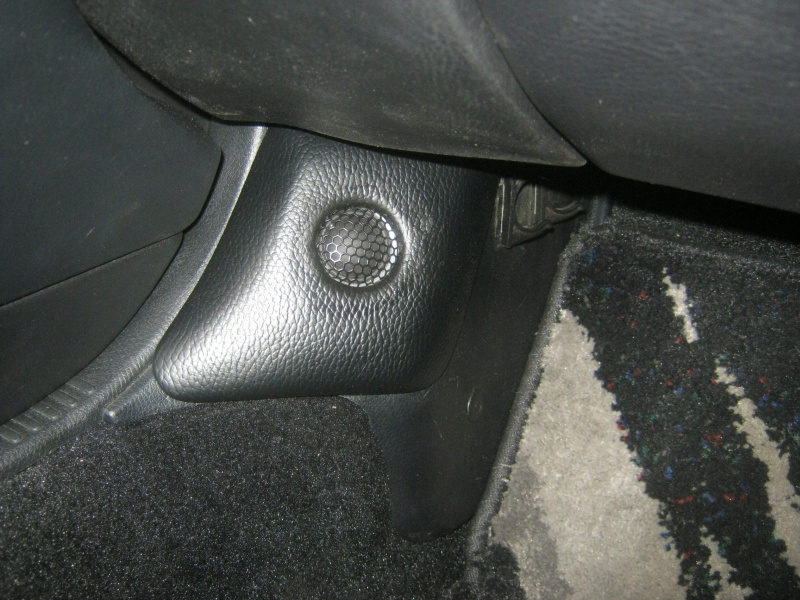 A quick disclaimer to the nitpickers; these earthing upgrades will ONLY assist if your cars existing earthing system is inadequate for the current you're attempting to flow. 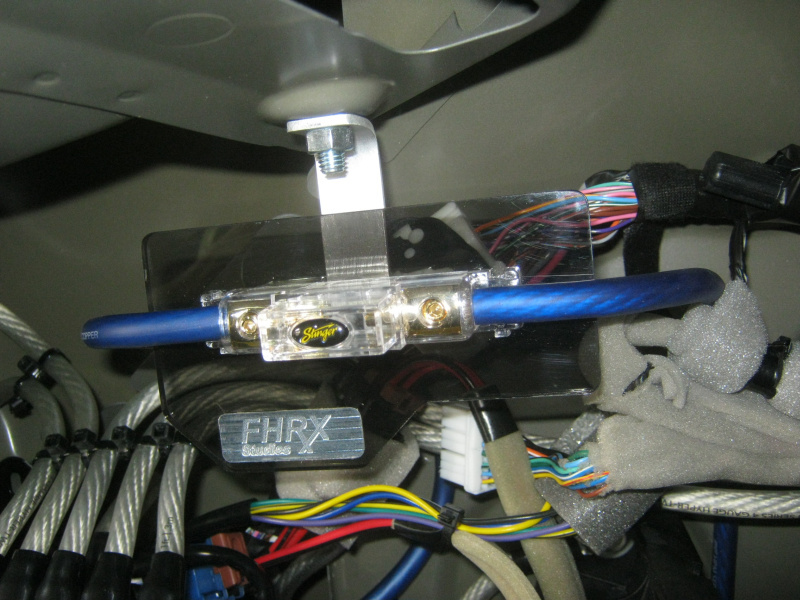 If your car already has a titanic earthing system capable of handling hundreds of amperes of current flow then you'll garner little value in adding additional earthing cables. 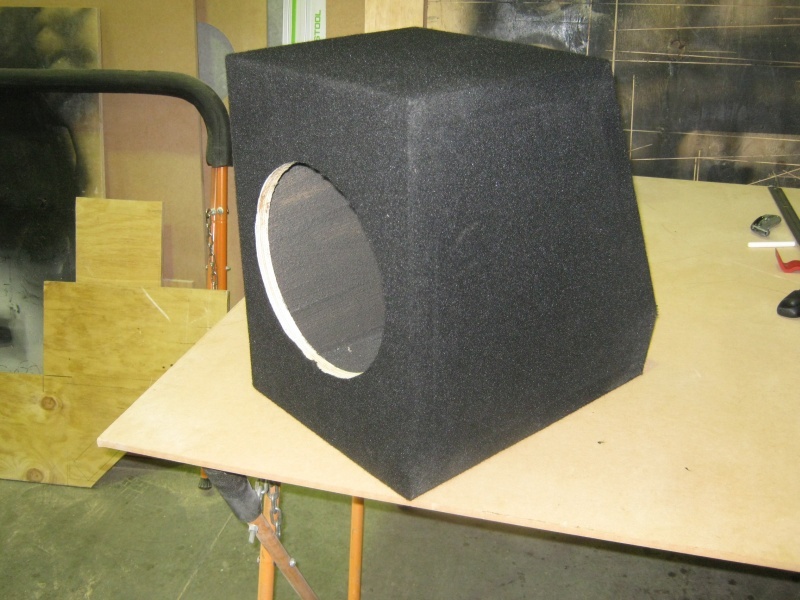 We're frequently asked what subwoofer enclosures are available for different budgets. 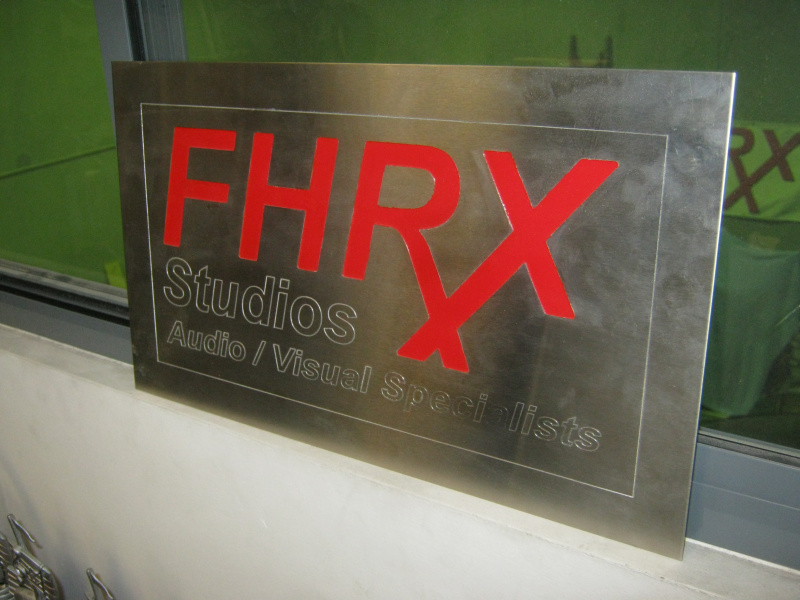 Below are some of the more common enclosures designs we construct here at Fhrx Studios. 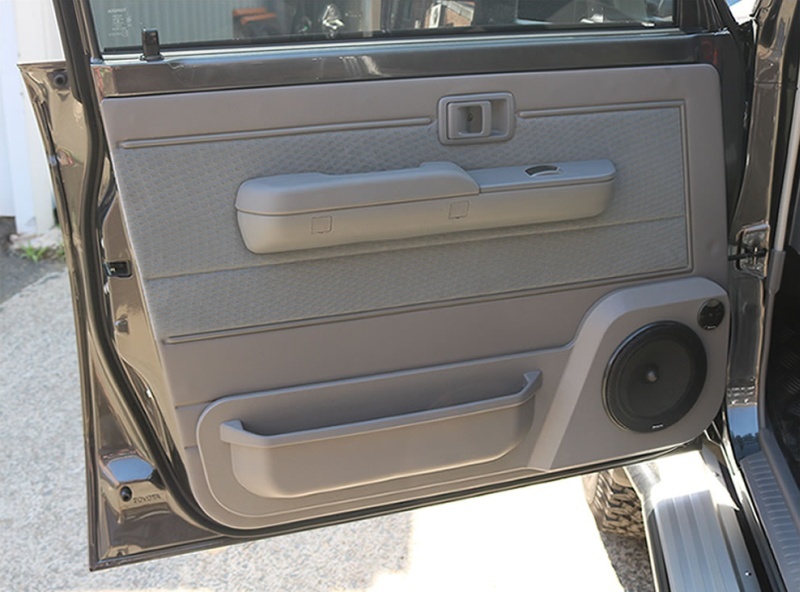 All our enclosures are designed not only to suit your desired type of bass, but are also specifically to match your car and your particular subwoofer. Construction material varies depending on the application however we typically start out using materials such as builders plywood, marine plywood and reinforced multi-panel as our most common ones. However we don't just stop there; in the past in order to achieve serious resistance against more severe tension and compression moments we've employed various metals such as aluminium and steel right through to inconel and even titanium. Besides the practical and extreme there is also the plain exotic - this has seen us make them from such materials as carbon fibre, marble, granite and even porcelain. 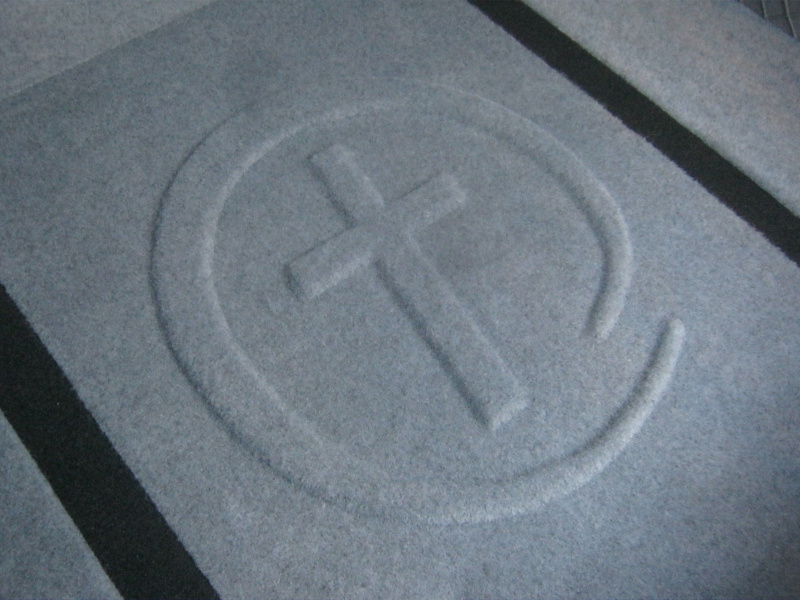 When it comes to finishing your enclosure the most common two methods are carpet and vinyl or a combination of both. 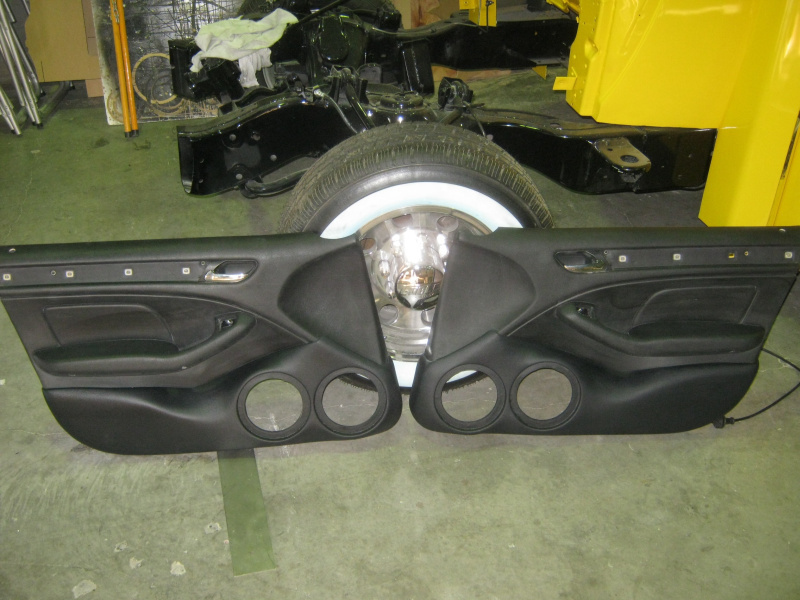 However provided the surface is correctly prepared you can have anything from two-pac paint through to plasma spraying or plating. Level 1 geometic. 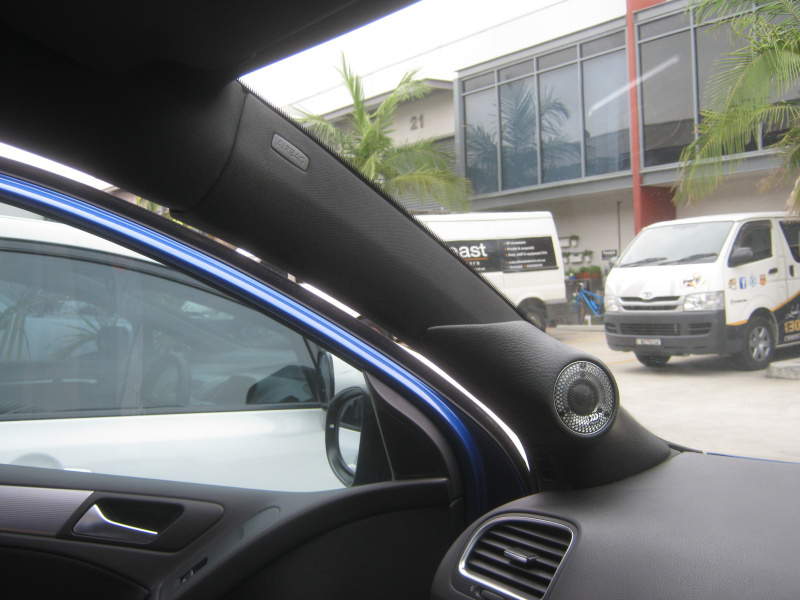 These enclosures are simple geometic shapes built to match the lines of the car. Approximate pricing starts at $300-$500 each depending on complexity. Level 2 geometic. 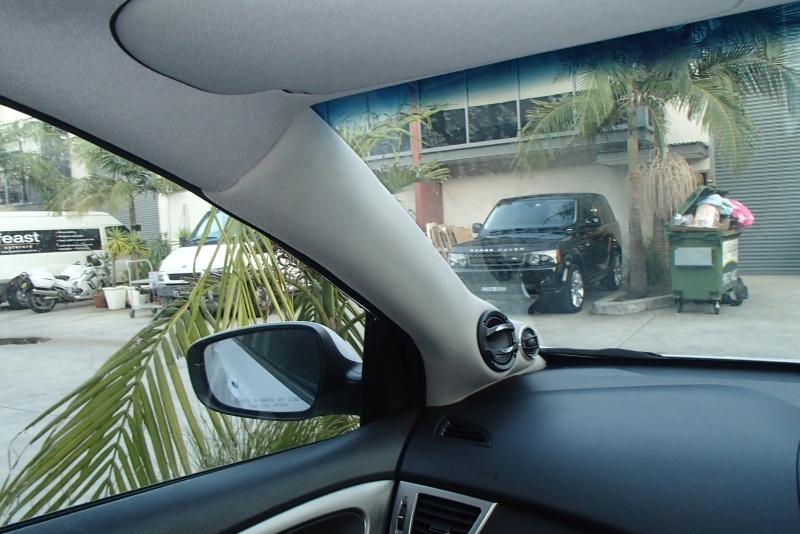 These enclosures are more complex geometic shapes built to match the lines of the car. Approximate pricing starts at $400-800 each depending on complexity. Level 3 geometic. These enclosures have painted or wrapped faces for additional decoration and effect. Approximate pricing starts at $400-1000 each depending on complexity. Level 4 geometic. These enclosures have racks built into them to hold additional components. Approximate pricing starts at $500-1500 each depending on complexity. 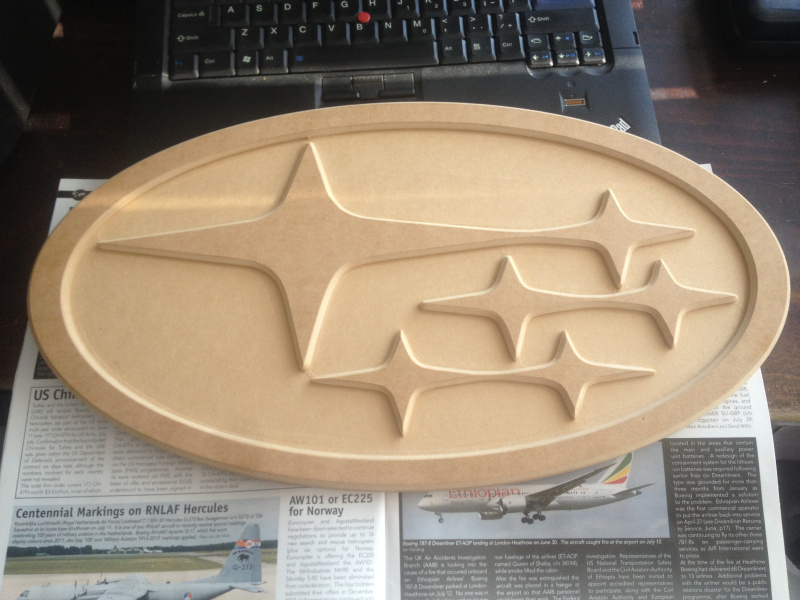 Level 1 moulded. These enclosures have flat faces and fully moulded back ends. Approximate pricing starts at $600-1500 each depending on complexity. 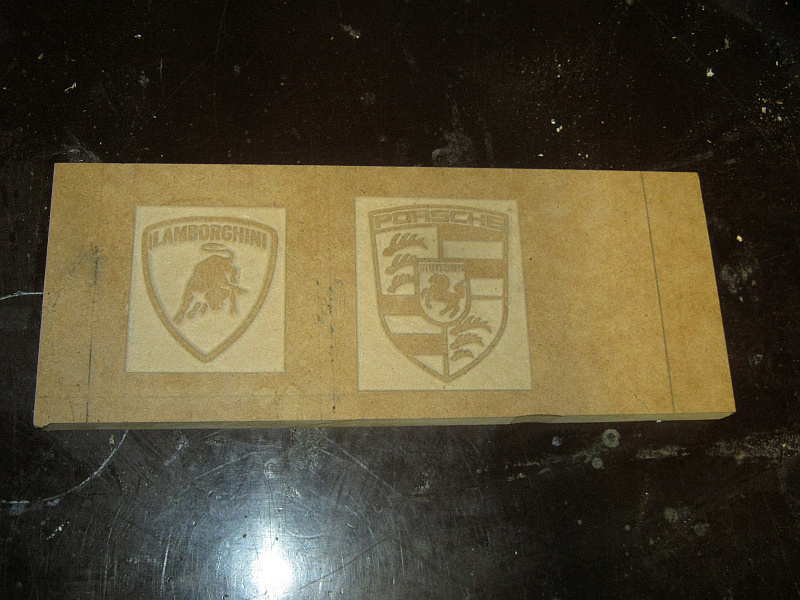 Level 2 moulded. These enclosures have moulded front faces and moulded back ends. Approximate pricing starts at $700-1800 each depending on complexity. Level 3 moulded. 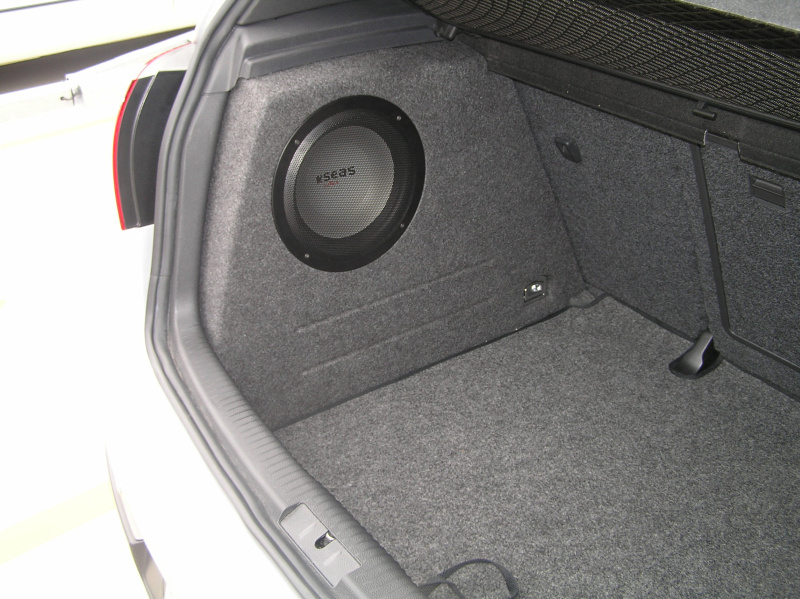 These enclosures have doors to cover the subwoofer. Approximate pricing starts at $800-$2000 each. Level 1 extreme. These enclosures have moulded front faces, moulded back ends and also a moulded intermediate face plate. Approximate pricing starts at $1000-$1800 each depending on complexity. Level 2 extreme. These enclosures are about as extreme as they get. 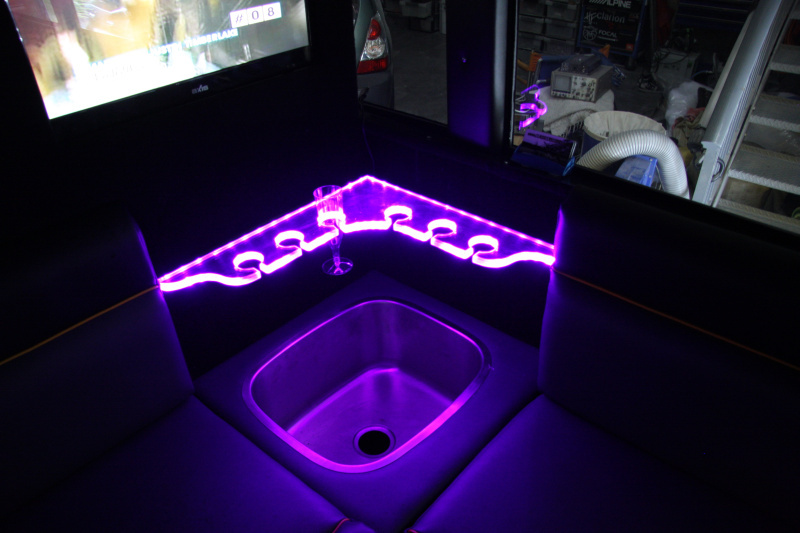 They're completely custom built in every way and are finished with every conceivable decoration. Approximate pricing starts just about anywhere! Level 1 stealth. 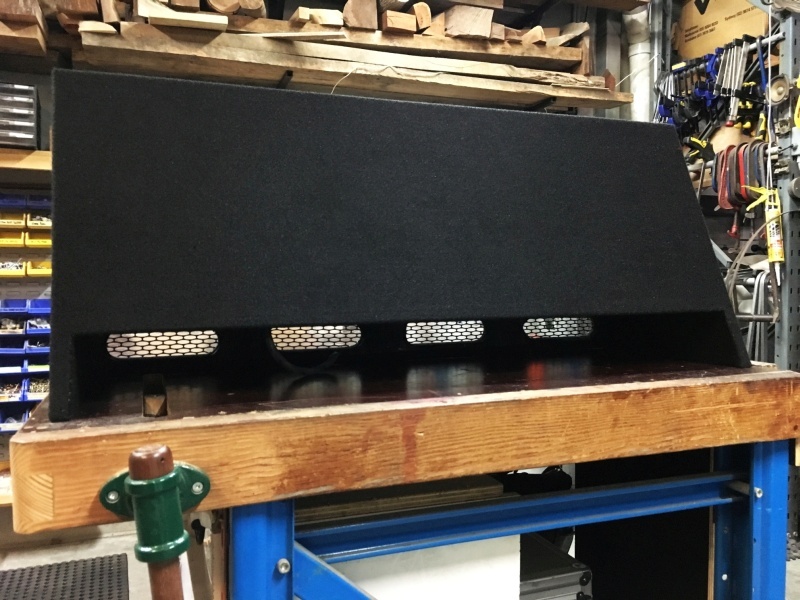 These enclosures completely hide the subwoofer altogether. 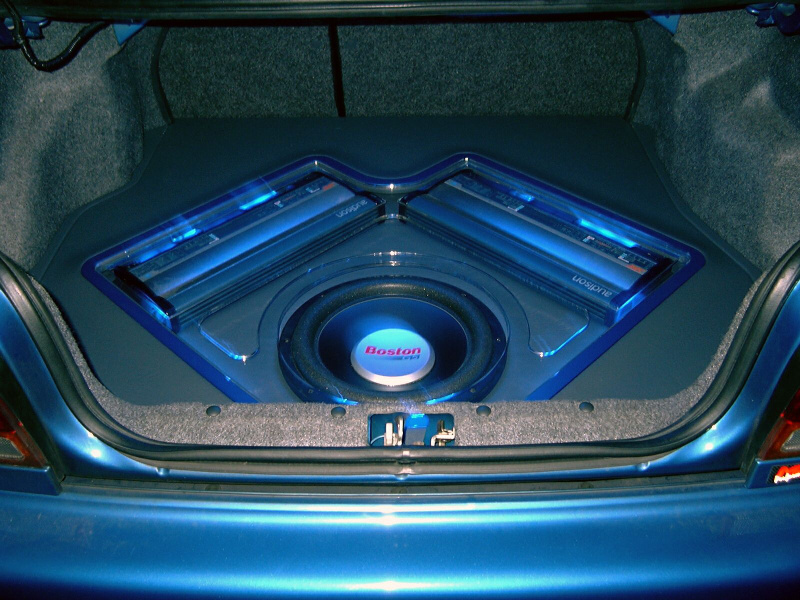 When people are discussing sealed enclosures, you'll often hear the Qtc of the enclosure / subwoofer combination mentioned during the discussion. 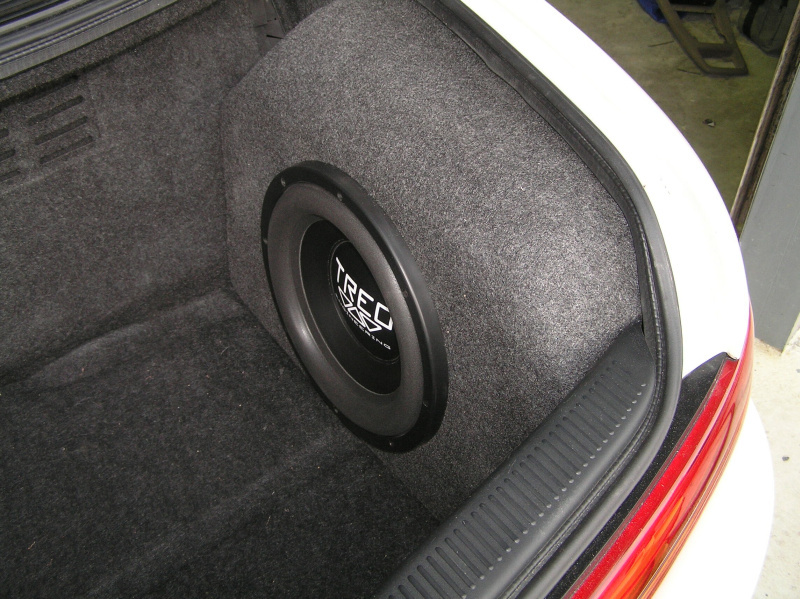 Qtc is the total resonance of the speaker system and basically is the relationship the enclosure will cause the subwoofer to have between smooth roll off and peaking at a particular frequency. An enclosure with a Qtc of 0.707 will give you the best of both worlds. 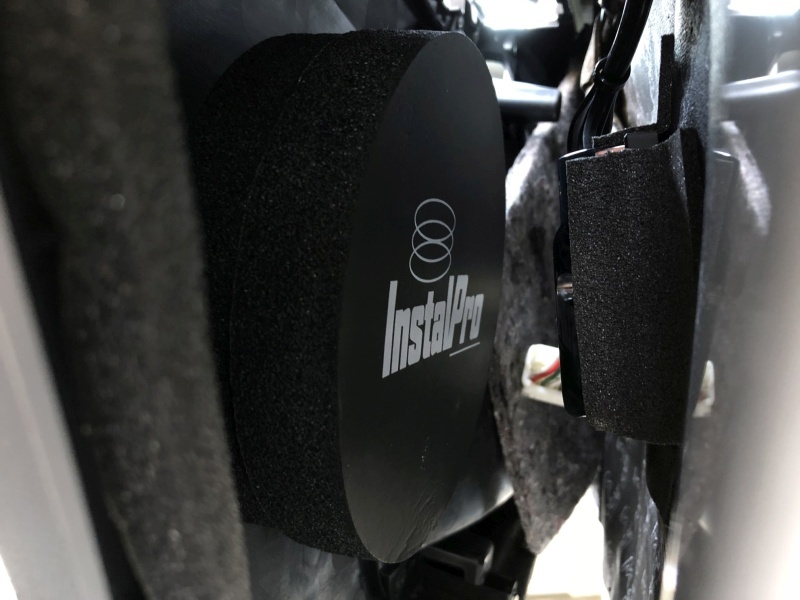 In other words; the best peaking in conjunction with the lowest and smoothest possible roll off (also known or F3) point for your subwoofer. If you look through the Thiele / Small specs which should come with your new subwoofer, you'll find Qts, Vas, and Fs. These are the main three electro-mechanical parameters that influence the Qtc. Using a calculator and various formulae, experienced shops can calculate your required enclosure volume. In the chart above, the relative efficiency of the example subwoofer is set at 90dB. So when we look at the F3 point we need to start with a realistic sound pressure level (for example 90dB - 3dB = 87 dB). These coloured lines show how the different Qtc's look when plotted. Now getting back to the Qtc of 0.707. 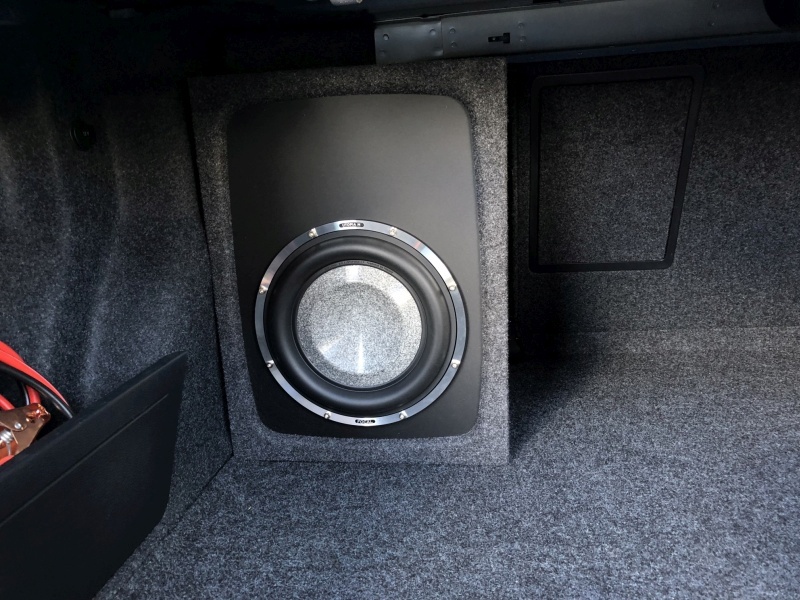 While in theory this is best compromise for many a subbass requirement, sound quality inclined buffs often look for what is called a critically damped enclosure. 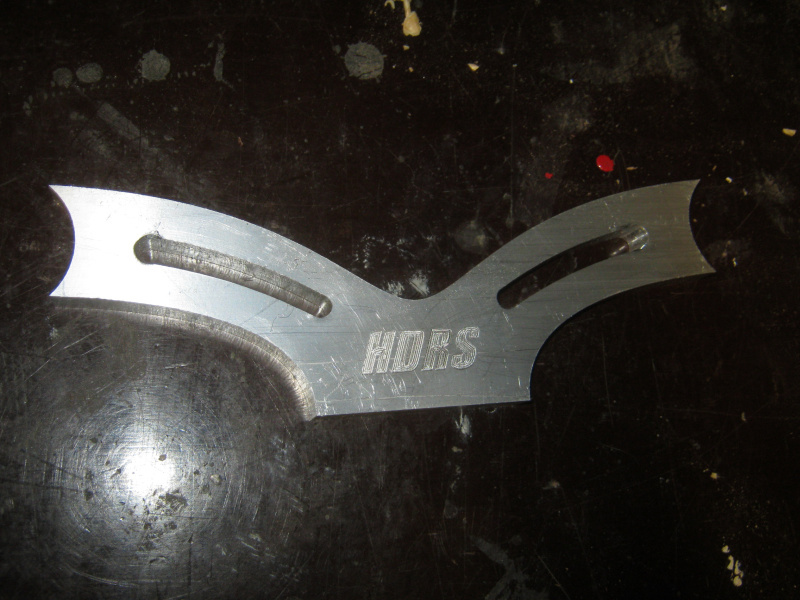 These have a Qtc lower than 0.707 and hence have the smoothest and lowest rolloff. However this can also work against you because the lower the Qtc goes the more issues you can run into such as control loss or over run. 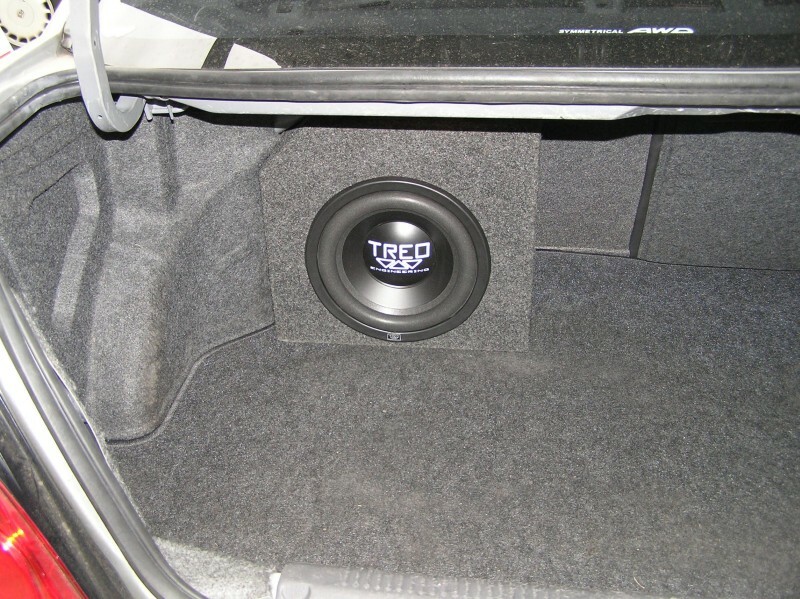 Customers wanting louder subwoofer enclosures at the expense of a lower roll off (without resorting to porting for achieveing this phenomenon) tend to construct enclosures that have a higher Qtc than 0.707. 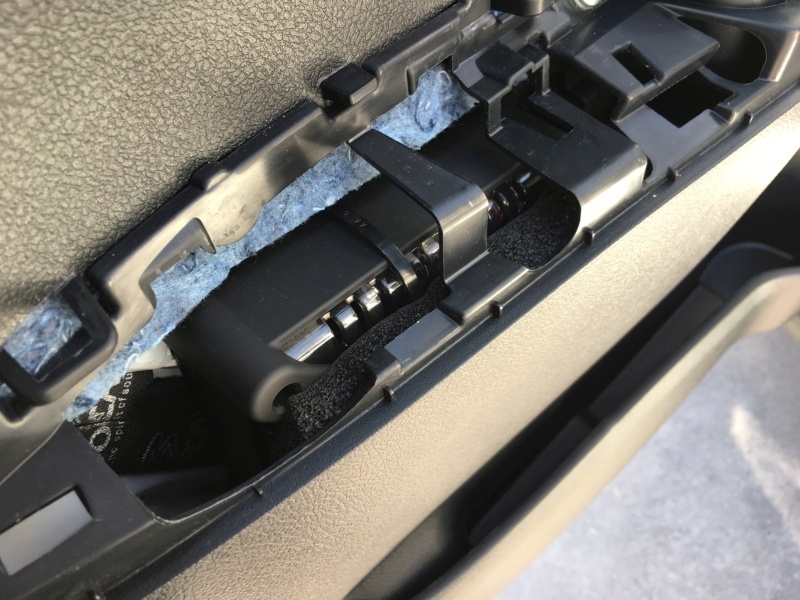 In real world terms though; if you're not too sure then it's wise to trial a few different sized enclosures in your ride before you settle on the final design. 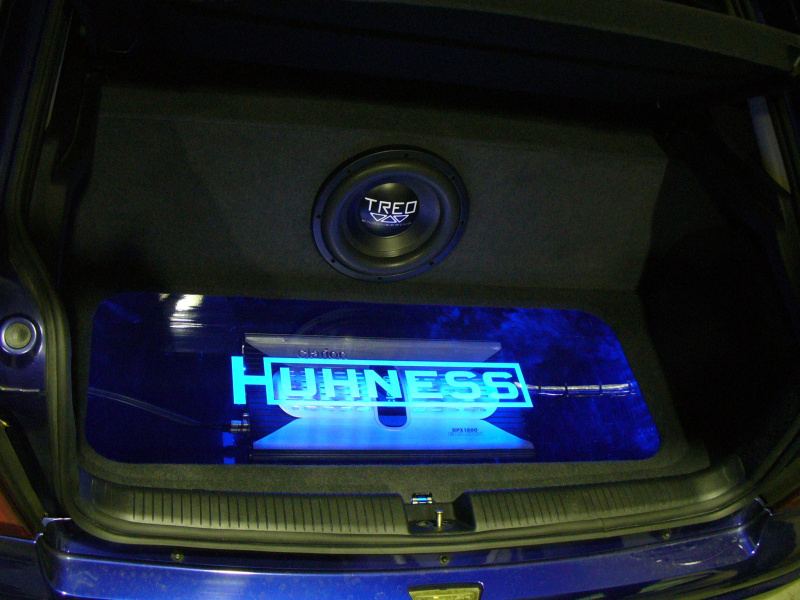 Note; image above is taken from CarStereo.com. For years we've been publically avoiding a discussion regarding the elephant in the corner of the room although we seem more than happy to grumble about it in private - the issue of why you (the consumer) should be buying local rather than taking your business overseas, especially when asking stores for unrealistic install pricing. I'll break this discussion into four separate parts. The first part will concentrate on what local stores require from you. The second part will concentrate on what stores are actually offering you, the third part concentrates on the possible negative consequences for yourself while the fourth part concentrates on the negative consequences for us (the industry) when you take your business overseas. Part one - What your local stores require from you. Whilst this should be palpable, it only takes mere minutes of discussion with some people to become painfully obvious that it�s not. That is the issue of how stores work � not just audio but all stores. By their very nature, retailers and wholesalers make a living by selling products for a slightly higher price than they buy it. Most people seem to understand this basic commercial phenomenon but we still get person after person asking for everything to be done for next to nothing. Bear in mind the money you pay us for work undertaken is actually how we pay our mortgages, rego, insurance, grocery, gas, water and electricity bills and what have you. 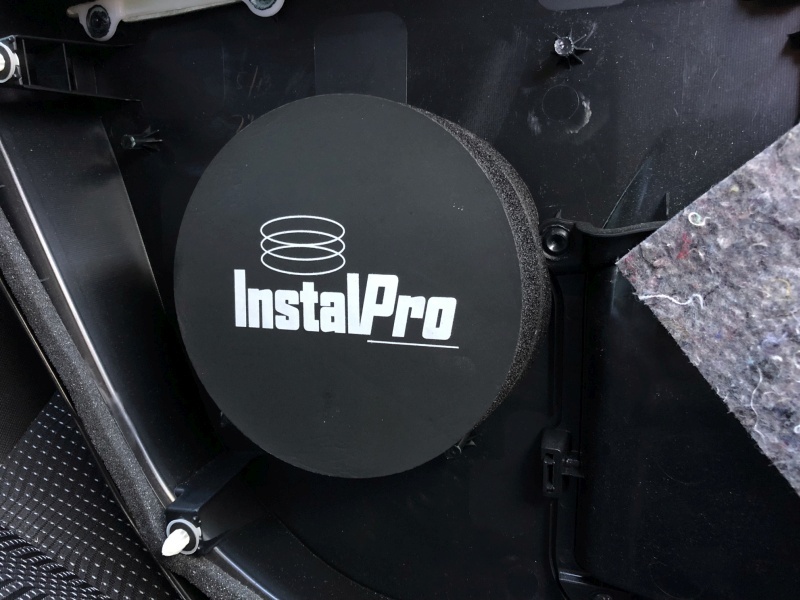 This is not to say you should always pay top dollar; all shops will discount prices, do package deals, offer group buys and so on, but you shouldn�t be asking your installer to do your planned $1000 install for $75. After all; try going to work tomorrow and telling the boss you won�t be requiring payment. Sure he�ll love you but how long will you last? Part two - What your local stores are offering you. Constant re-tuning. Every weekend we have people everywhere down here using the oscilloscope and real time analyzer for tailoring their system tuning. We often help them do it, listening and explaining how ears work and what to listen for in the car. This is done free of charge. 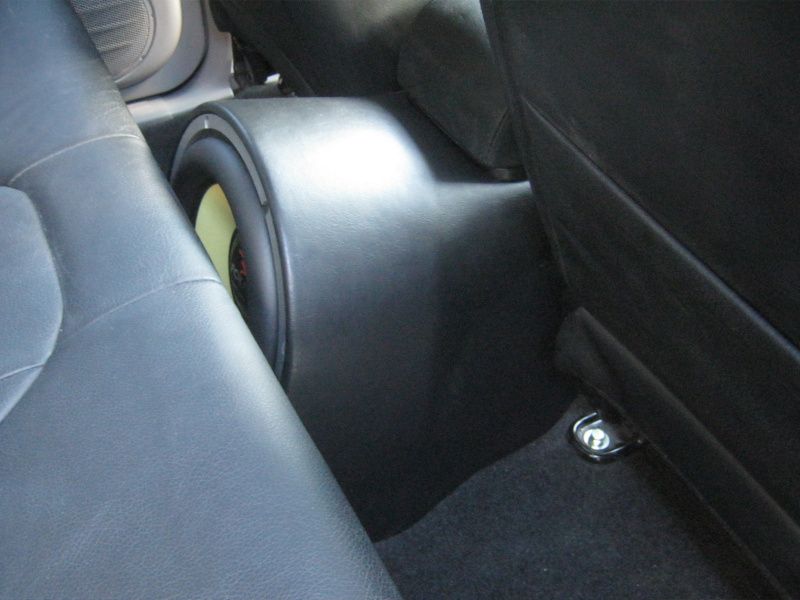 We constantly give people off cuts of sound deadening and cable for free when they need it. We help people find and solve system problems for free. We chase noise (hiss, whine) issues in peoples installs for free. We help people find and solve rattles for free. 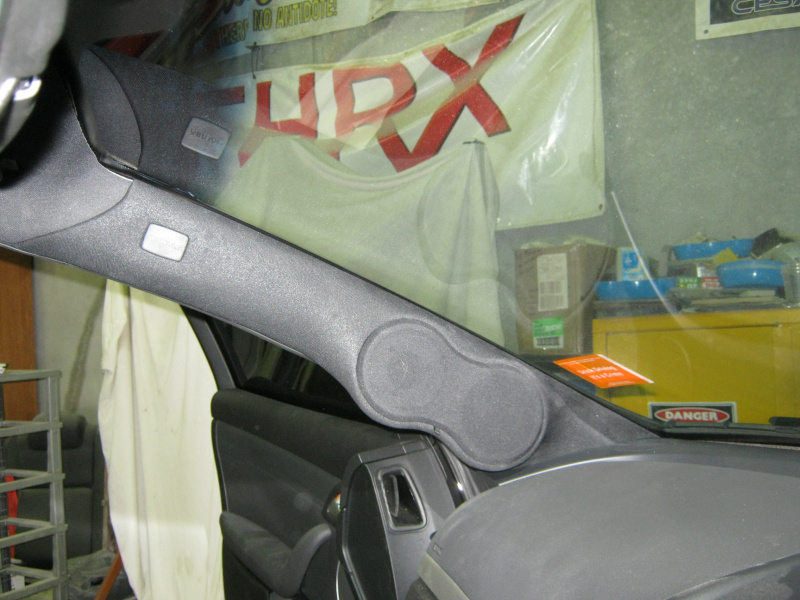 We let people trial new equipment if they want to see how it goes in their car. We write a lot for magazines meaning we get to audition many products we don�t hold accounts for. This means we can advise people of what products to use and what to avoid for any given budget. We offer free postage on just about everything. This includes when we send your components away for repair. We fit and remove products often for free after the initial install price is charged (if you upgrade your amplifier for example). 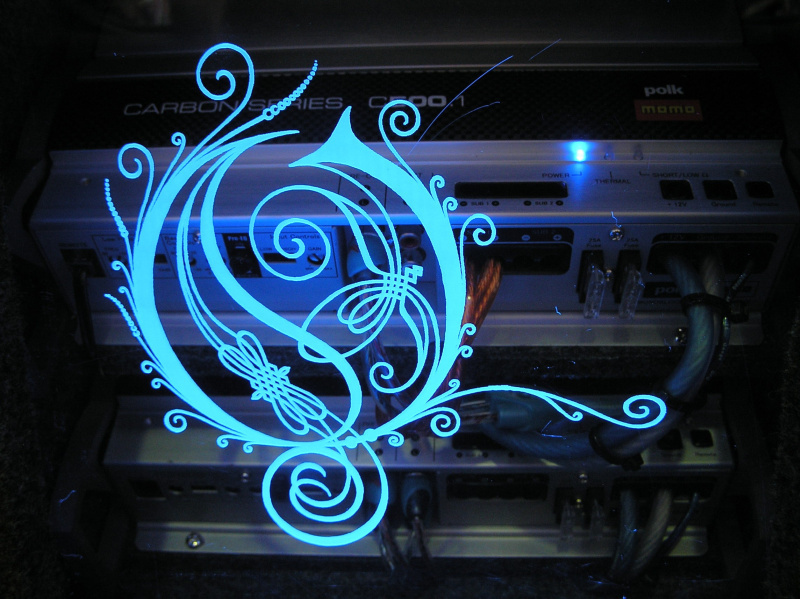 We often buy products back off people if they wish to move sideways with a product (changing amplifiers for example). We often re-install dodgy system installations for a significantly reduced or free price because we�re of the opinion that you shouldn�t be charged twice for the one install. We work all hours of the night to fit into people busy schedules. Spare a thought for our girlfriends, wives and families who don't see us until well into the night each day. We answer email enquiries within minutes, not days. We offer free yearly battery servicing (discharge, test and trickle charging). We offer free bench testing of existing components. We offer free system and enclosure design if you�re not sure how to design the best enclosure. We run and fund sound offs. We pick people up, drop them off and not just to the local station either - last year I dropped a customer off at Jindabyne which is a thousand kilometre round trip. 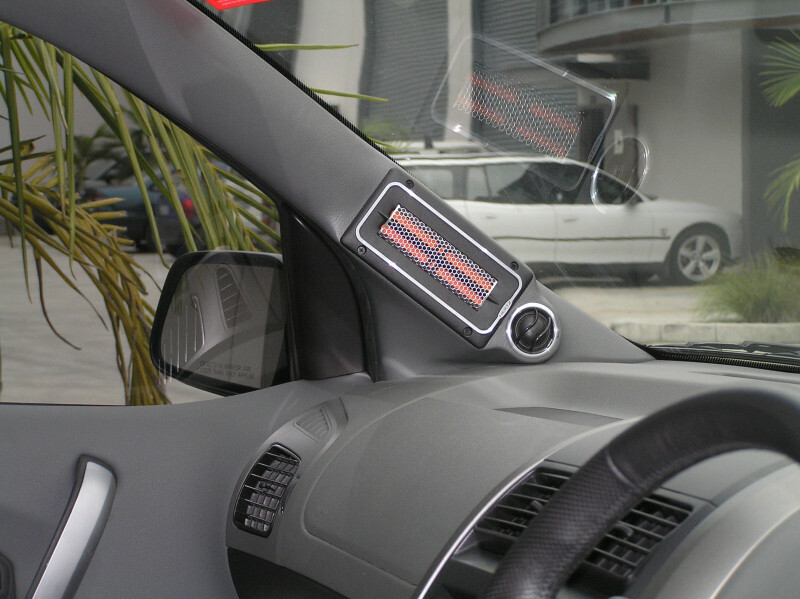 We often spend hours installing and tuning processors such as the BitOne into people�s cars just to show them what they do because you can only tell them so much verbally. Again; all for free. 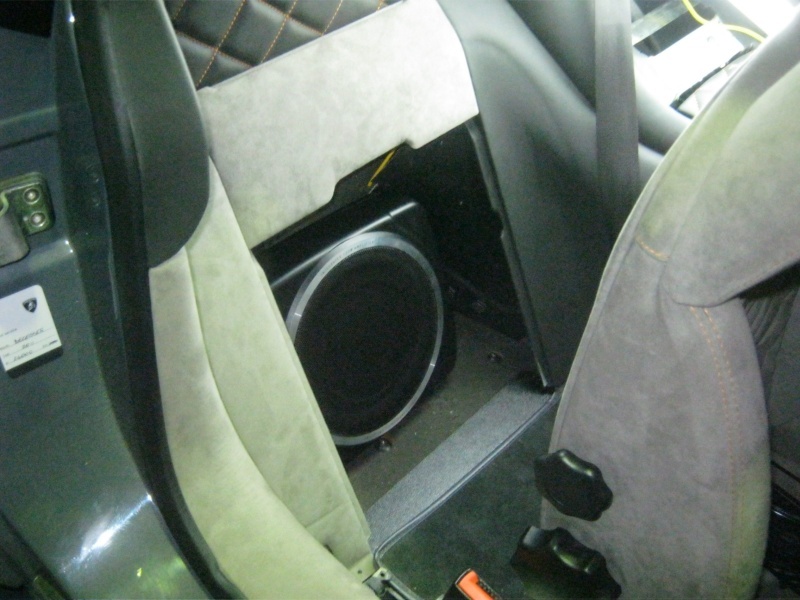 We�ve given people replacement speakers free of charge in the past. 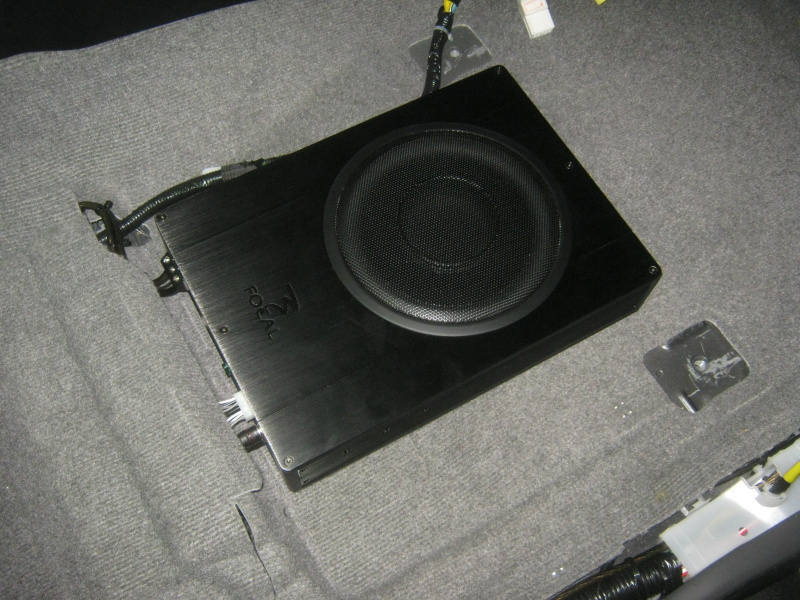 The most recent example was when we gave Wayne a replacement Boston Z6 midrange when his amplifier died and damaged an existing one � that�s a $300 driver. 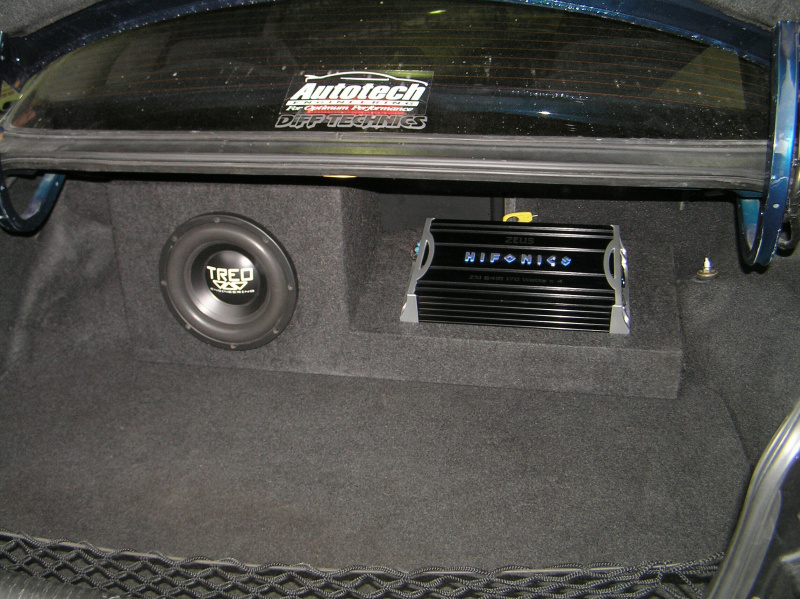 We gave Doug a free Audison sub controller. We gave Zenafore a free dash kit because I had it sitting here taking up space. There are countless numbers of people on here that we�ve given earth upgrades too, just to show them how their amplifier works better once it can get serious current. We offer people free drinks when they�re here. 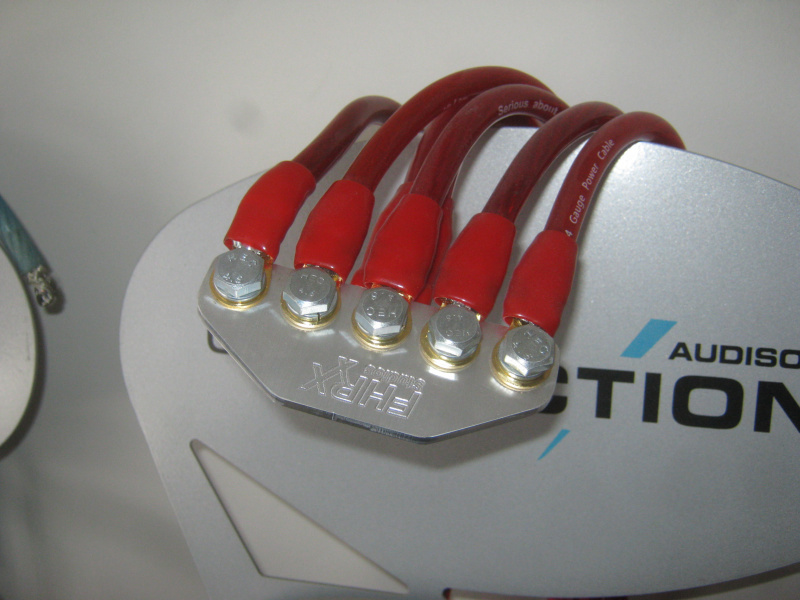 We�ve given many people many small things like fuses and terminals. 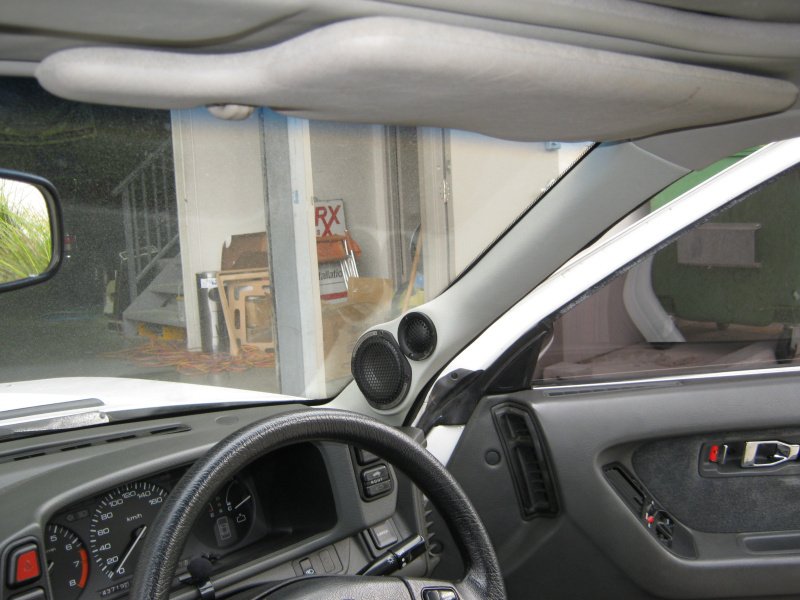 We�ve given people alarm items such as glass break and tilt sensors for free. 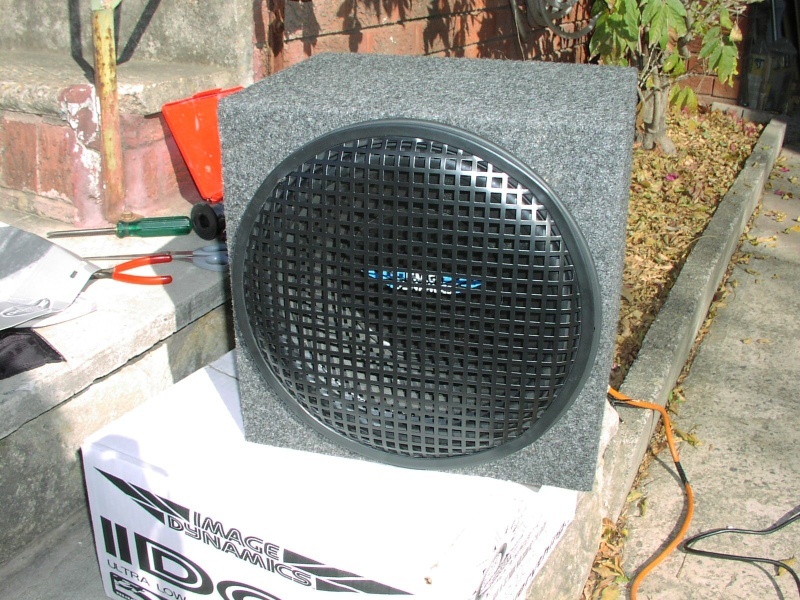 We�ve done free amplifier repairs for people whose product damage wasn�t their fault. Finally there are the various aspects of the install itself. Despite stores charging you a certain amount for the labour, we quite often spend up to four times the actual man-hours to get your install just right (without charging you a dollar more). I won�t go into all the various install techniques themselves as people can read all about them here. Alternatively, you can check out the various images contained in our section of this website. So after reading through those lists you�ll hopefully appreciate that it can get a little despairing when people bring us boot full�s of equipment they�ve bought off online eBay stores and then ask us to put it in cheap or for free, all whilst expecting us to maintain a high standard. Part three - What are the negative consequences for you if you�re not supporting the local industry? Some of the products sold are fakes. 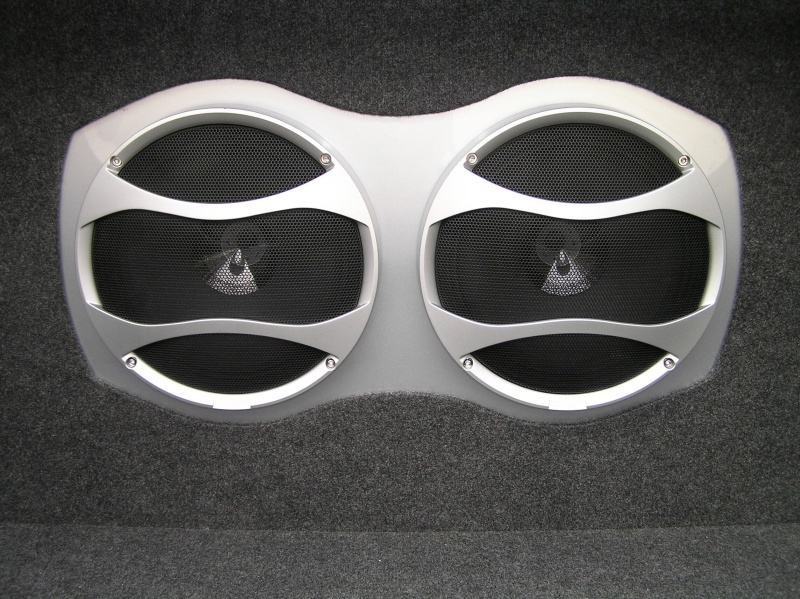 We constantly see people buying equipment online, only to seem upset to find their brand new $1000 speakers they only paid $100 for aren�t the real McCoy. You might get evaluation, test or malfunctioning stock. If you have a look around various websites such as ARC Audio and Zapco you�ll see numerous warnings against buying online for these exact reasons. I cannot tell you how many times people have brought stuff online only to find it malfunctions when they install it. Lack of warranty. Many manufactures track their products via serial number and won�t provide any warranty if they�re not in the continent they were initially distributed too. To get around this many online stores simply remove the serial number. This will net you the same result � no support at all. You have no avenue for returns much of the time. 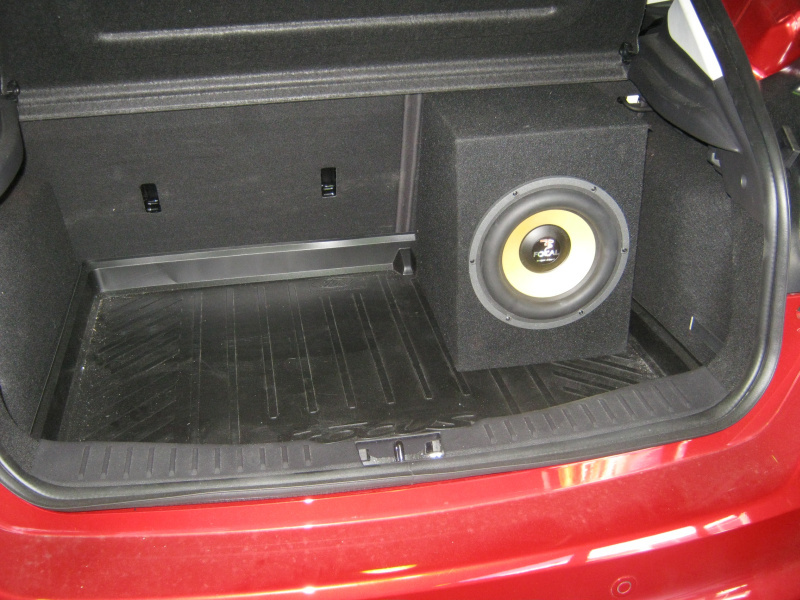 If you get a new set of speakers and they don�t fit into your car, many local stores will gladly take them back. This is very rare if you�ve bought them online. Part four - What are the negative consequences for the industry itself if you�re not supporting it? Stores close down due to being forced to compete with prices under their cost price. Importers close down due to shops not asking for any stock. The only winners initially appear to be you. But who will you turn to for assistance once all the decent shops are no longer around? Information websites and forums like this one suffer because the funds they depend on (that come from shops and importers) cease to come in. This means less free information, advice and assistance for you. The product itself suffers. 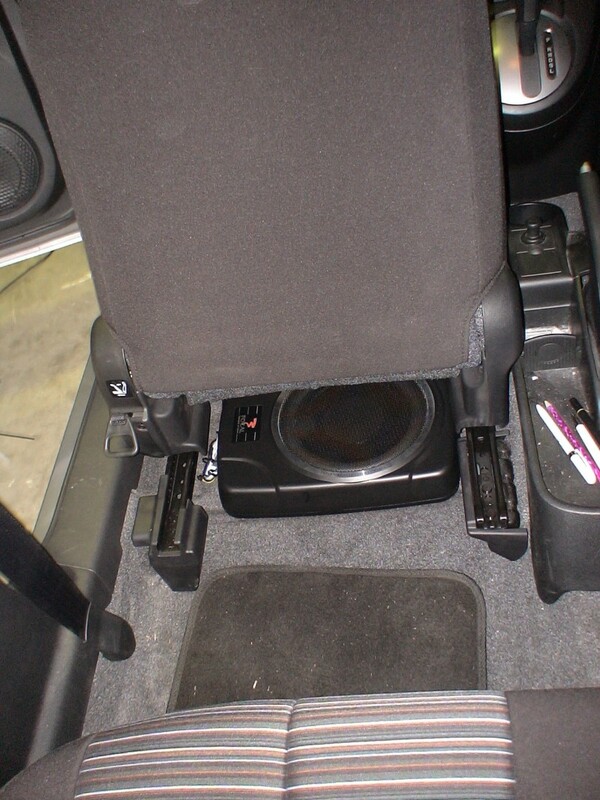 As more and more people simply chuck equipment in their cars on the cheap, sadly many have very limited knowledge about how to get the best possible sound from it. 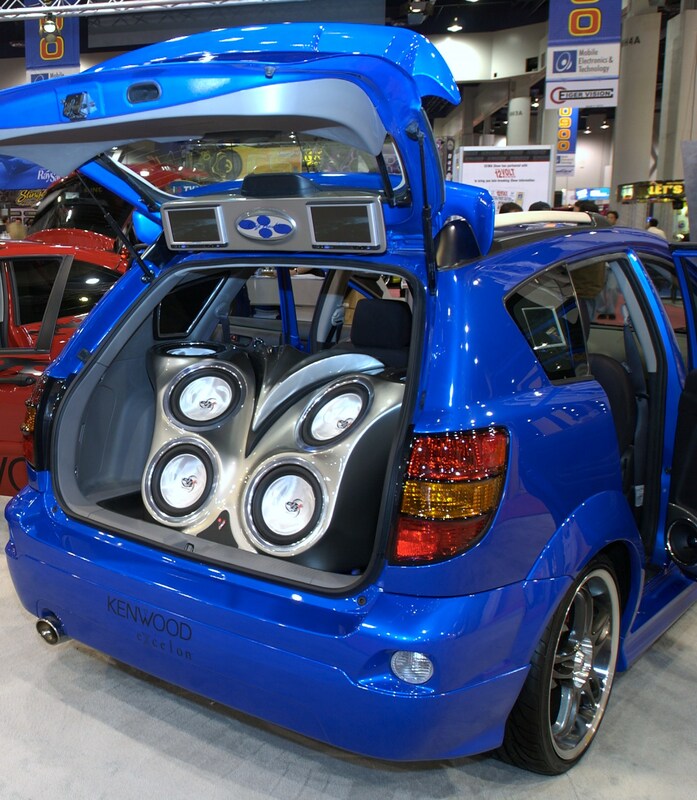 This means that the entire quality level of the car audio industry goes down as a whole. There is a good reason why specialist shops are called 'specialists'. Competitions suffer. Stores sponsor and run many of the sound offs we all compete at. Without stores it�s quite likely there will be limited (if any) sound offs. Publications suffer. When stores and sound offs start disappearing, advertising is no longer required and feature cars are in less abundance for publications. Therefore; what direction are the rags like INCAR going to go? Now we're not fools - we appreciate completely that you can save a lot of money online and whilst we don�t like to admit it sometimes, we tend to agree that if you can legitimately save thousands off your product(s) then you probably ought. But don�t buy everything online to save yourself fifty dollars and then expect stores to bend over backwards for you. We�re all more than happy to help you regardless of where your equipment came from (i.e. we�re not �that� up ourselves) but keep two things in mind. The first is; just remember you might just be shooting yourself in the foot by purchasing overseas and killing off the local stores. Secondly; keep in mind we need to make a living by charging a fair price for your install (read; fair price, not exorbitant price). Why not at least give your local store a chance to price match the prices you�ve found overseas before you send all your cash offshore? 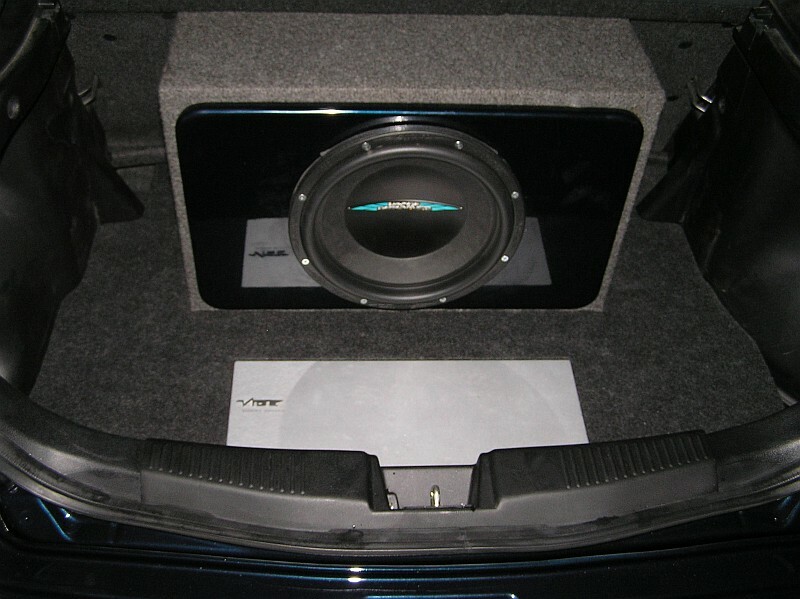 Delving a little deeper; we�re not talking about cracking 90-200Hz lower midbass frequencies like most slim-line subwoofers tend to output, but real deep impacting 30-80Hz bass that feels like you have a bass instrument thumping away right behind you. Double bass, cello, pipe organ, tuba, bass guitar, timpani, bassoon and the list goes on; these instruments simply cannot come to life with a lame slim-line subwoofer setup. So what makes the iBus units so different? Well the secret is in the design in that it doesn�t use a port to try and boost frequencies way below the F3 of the driver, nor does it utilise an adapted subwoofer with a minute excursion that cannot really handle any serious movement. 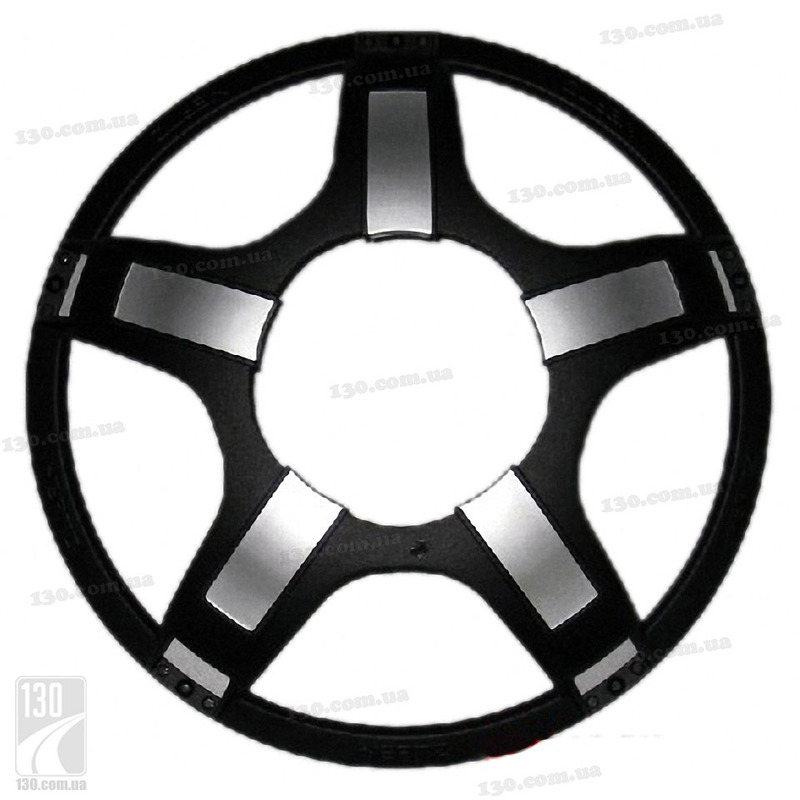 Instead the driver is designed specifically to work with this strong alloy enclosure, from its edge wound voice coil design to it�s rather complex suspension system. 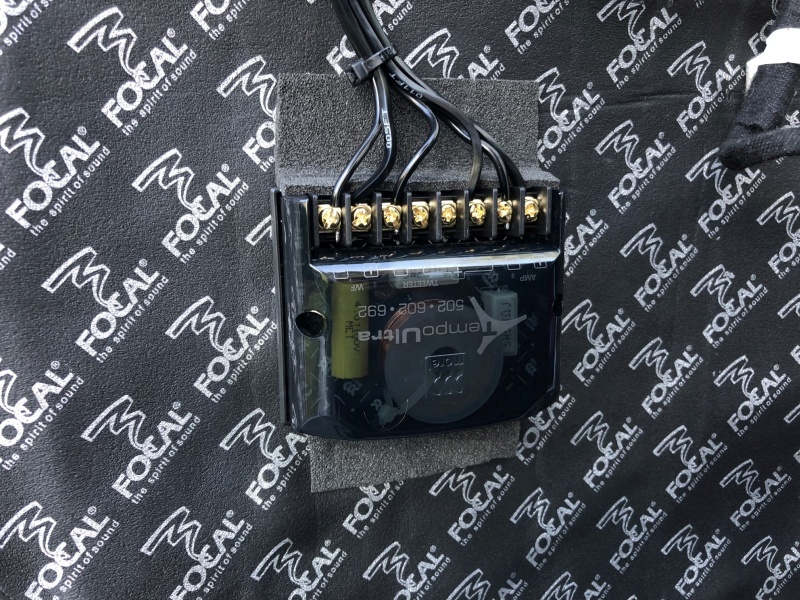 Focal has really taken care to get the Qtc of the enclosure just right (it is around 0.71-0.73). This means it doesn�t boom at a certain higher frequency but rather rolls off smoothly and quite deep into subsonic territory. I won�t carry on too much about enclosure �Q� here either suffice to say that it�s an important aspect to take into account when designing an enclosure. For those of you interested in more information regarding this topic, click here. Getting back on topic; below we show you how we actually implement these units into small cars, sports car and utes. These are the most common applications they find themselves in and to undertake this task we simply make up a new stronger false floor to which the iBus can be bolted to upside down. You then just provide its amplifier (it�s an active enclosure) with power and signal and off you go. It comes with power cable, bass remote control and also has high level inputs so you can plug your existing speaker wires straight into it for signal. Starting with boot installations, this is what they look like when installed in boots. We tend to make a new floor that allows the units to sit upside down within the factory tire. That way it doesn't impact any of the vehicles functionality at all. 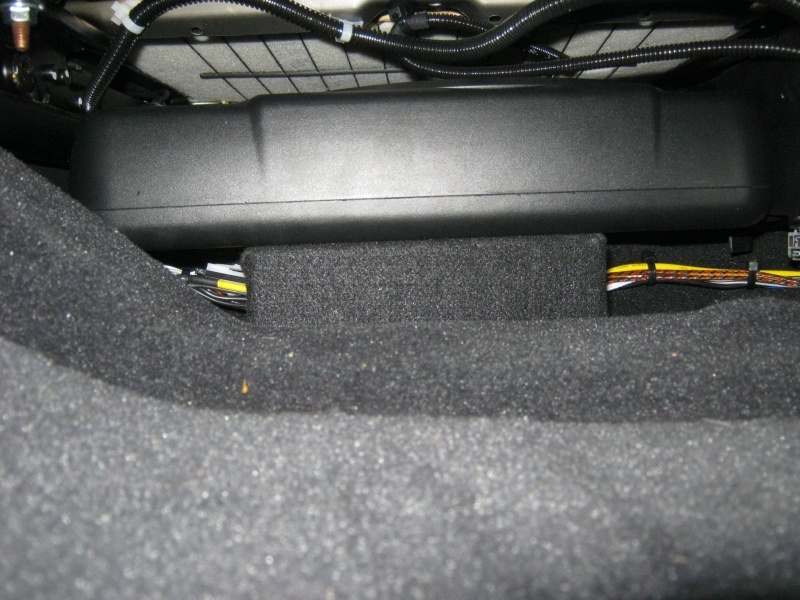 Then there are the under seat installation. 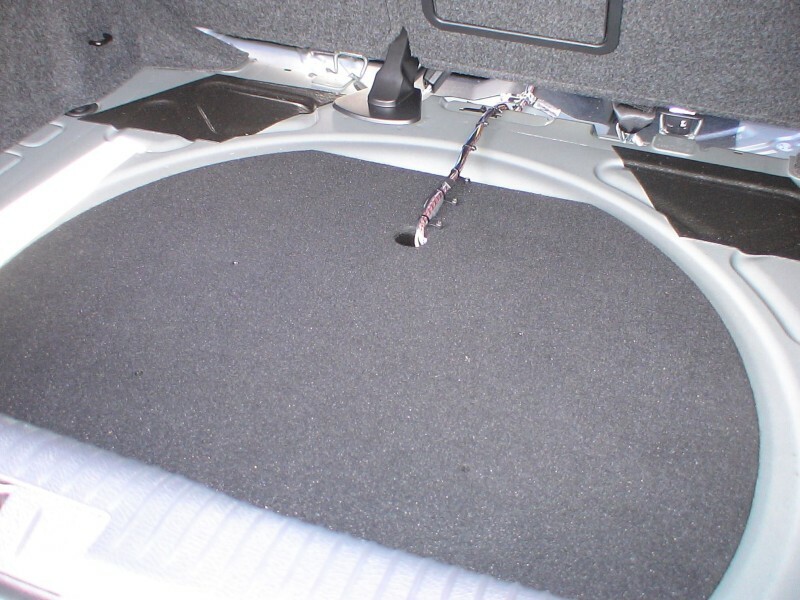 This scenario is most common is utes and in cars where maximum space required and it won't fit inside the spare tire (Japanese cars for example). 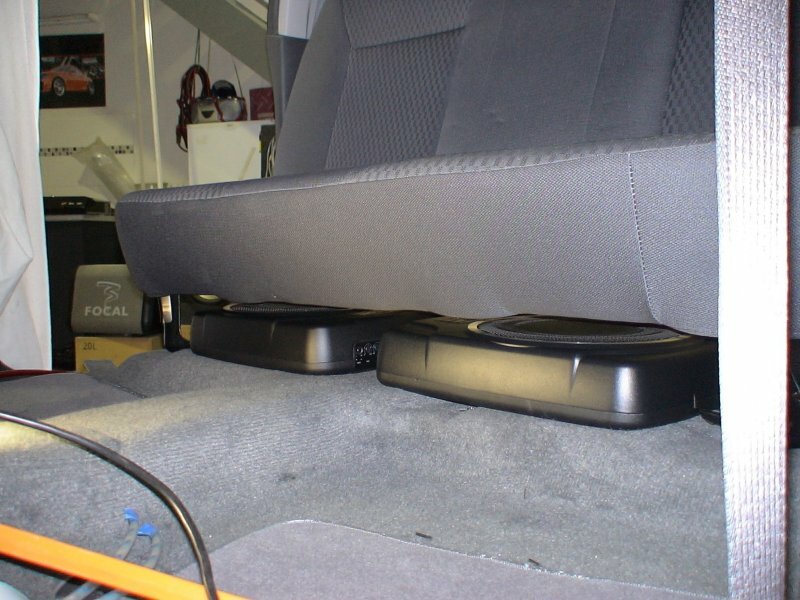 Most of the time they simply sit under the seat but if extra bass energy is required we make a plate that can bolt down to the factory bolts, allowing the unit to transmit more kinetic energy to the passengers. Next up is behind the seats. 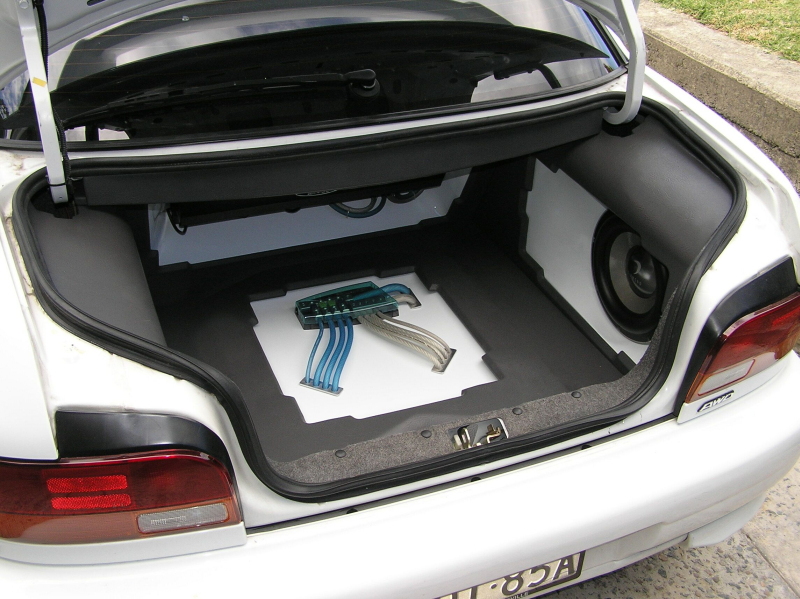 If you own a ute with low seats or two seat sports car such as a Lotus or Lamboghini, then one or two of these units can easily be mounted either behind or under the seats. 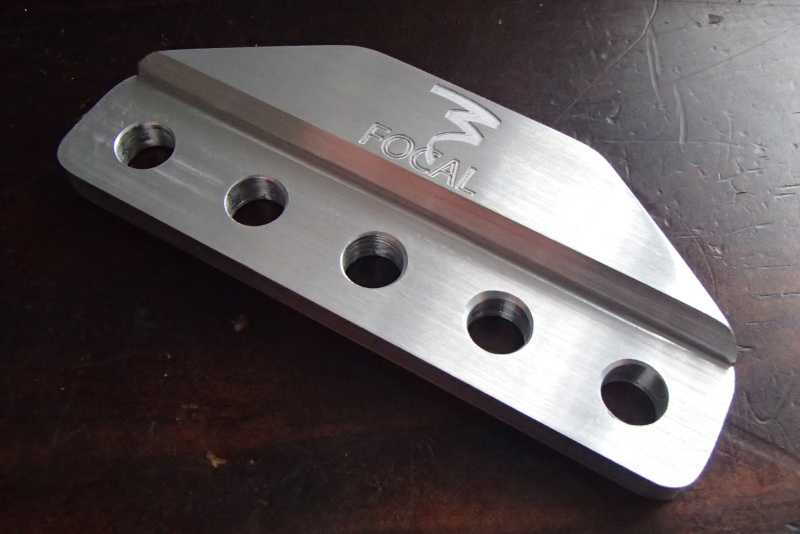 We usually make up alloy brackets and a mounting plate to hold them in place. 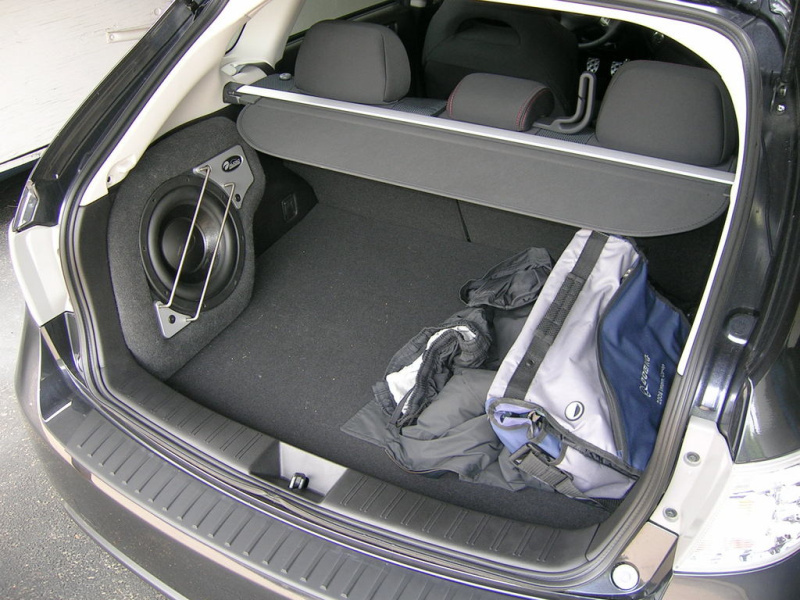 Don't let's be limited though for if there is space, then we'll jam a subwoofer in there. 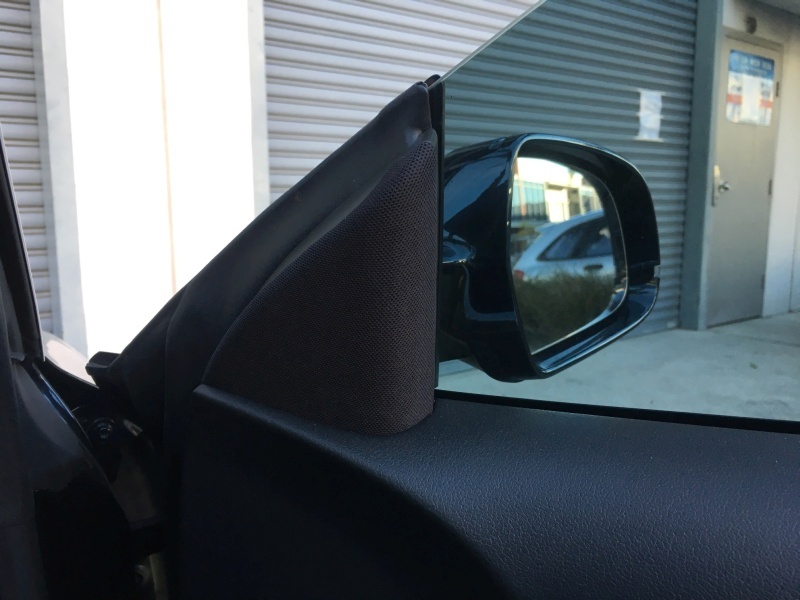 With this mindset we've mounted them in even stranger places; everywhere from behind footwells where long sports cars tend to have a lot of feet space due to their length, to down behind boot side panels. If it will fit then why not? Of course the important thing is the price; they're actually not that expensive at all. Click here for the information sheet from Focal or feel free to email us for more information and pricing. So you've just installed all your new audio gear only to discover that whilst your system sounds wonderful, you cannot help but notice it looks just like everyone else's. Now you're faced with an interesting conundrum; with one option being that you could spend a titanic amount of money glassing, painting and chrome plating everything in sight. 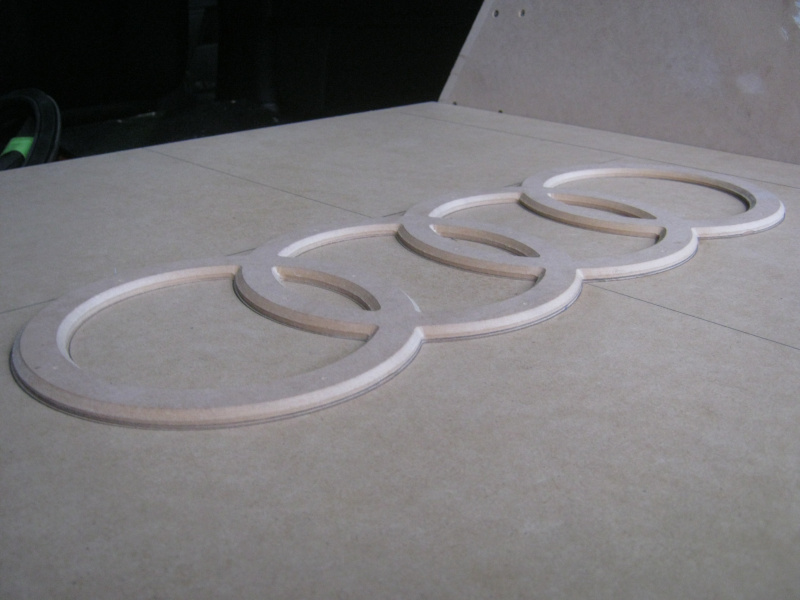 A more effective and professional looking option however is to instead add some personalised touches to your install using our CNC machine. 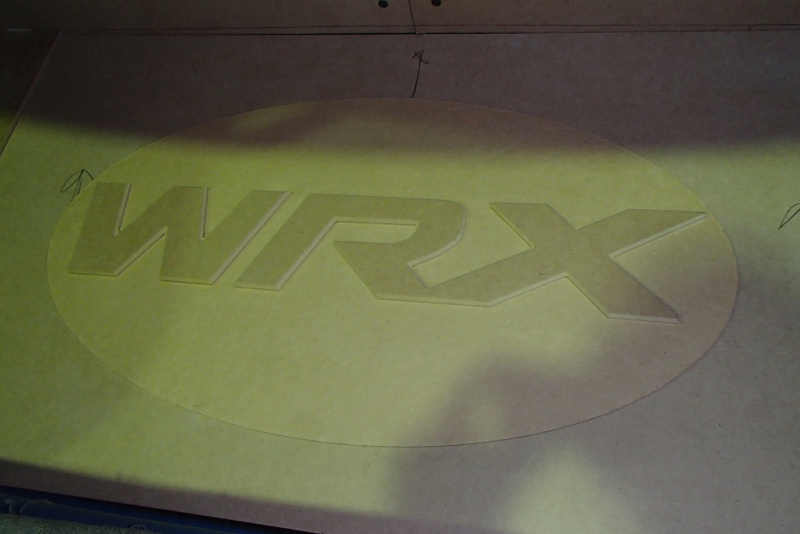 Utilising this methodology you have the option of engraving or cutting various shapes, logos and other decorative pieces to suit your particular install. This'll not only render it highly individualised but in the process also allow you to highlight the various elements you wish to show off. 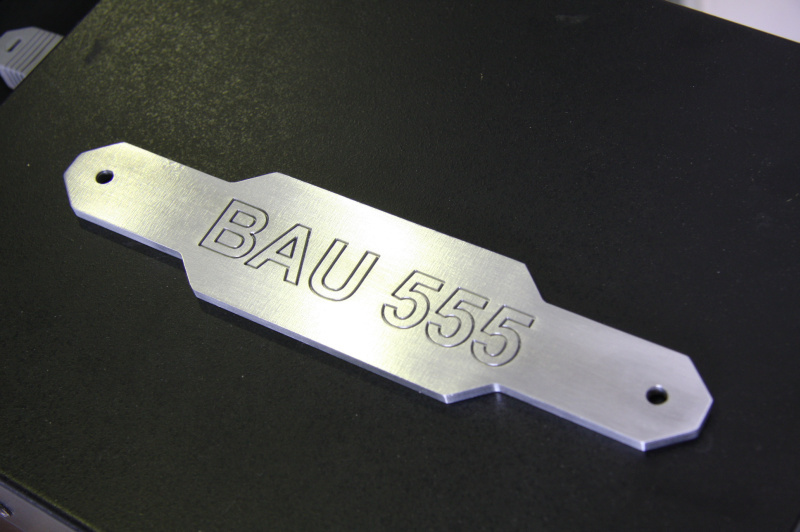 Although the most common items we're asked to manufacture are metallic battery clamps and text plates, the reality is that if you can draw it we can CAD it and henceforth machine it for you. 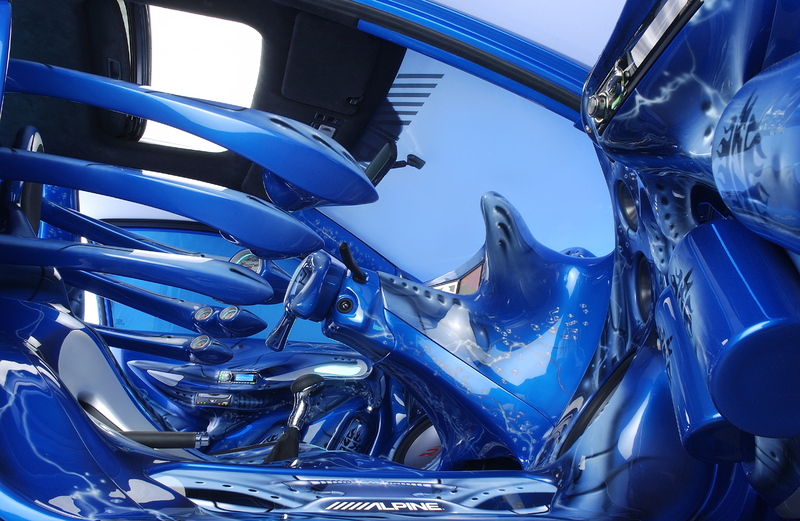 In addition to the parts within the engine bay and decorations on flat surfaces, you'll actually find there are many areas of the car just screaming for a little more detail. Windows are one item which stand out and look a million bucks with just the addition of a simple (or complex) logo of image. 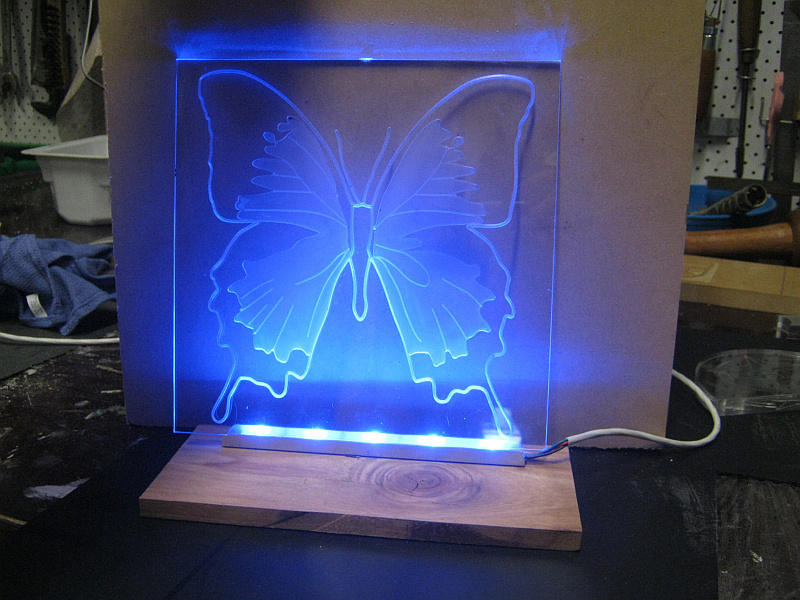 The engraving is not just limited to text either - graphics and even LED back-lit three dimensional holographic-type engraving is also possible thanks to the mill's superbly accurate vertical axis. 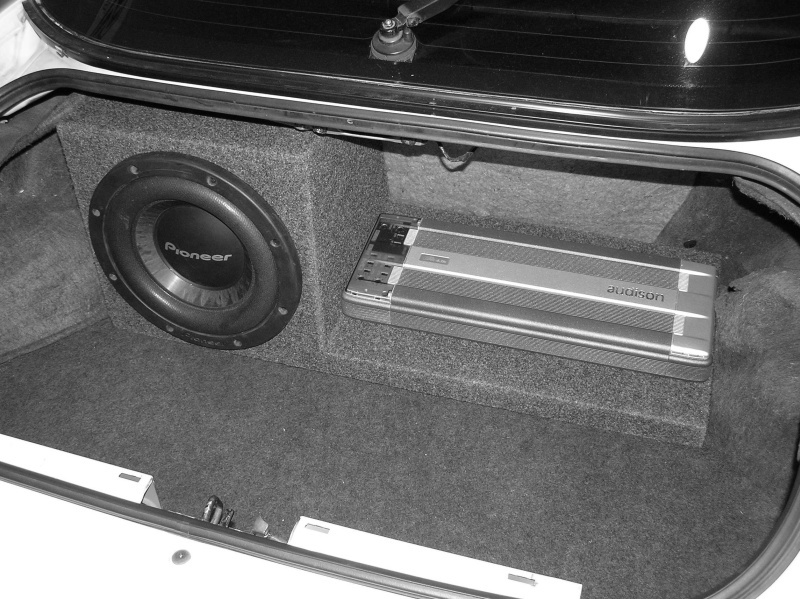 Hell these parts don't even have to relate to your stereo. 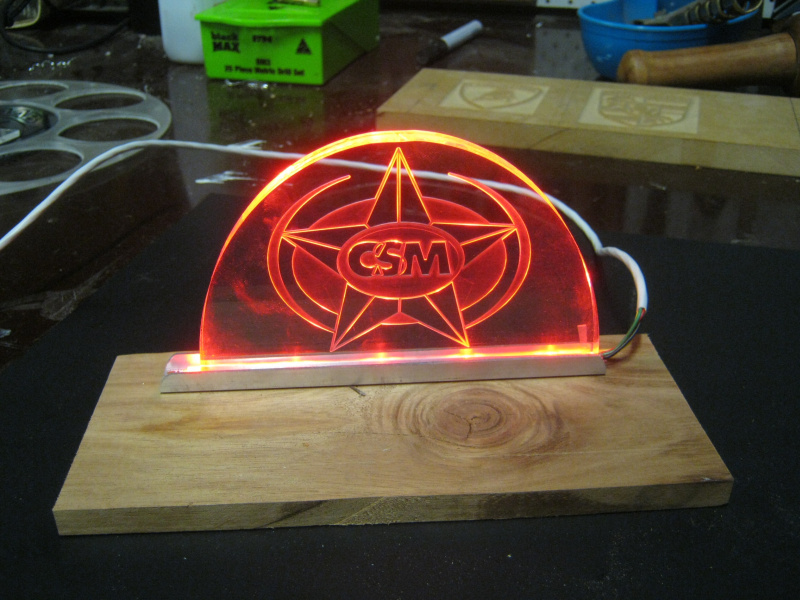 As stated above; realistically we can manufacture just about anything you want to customise. 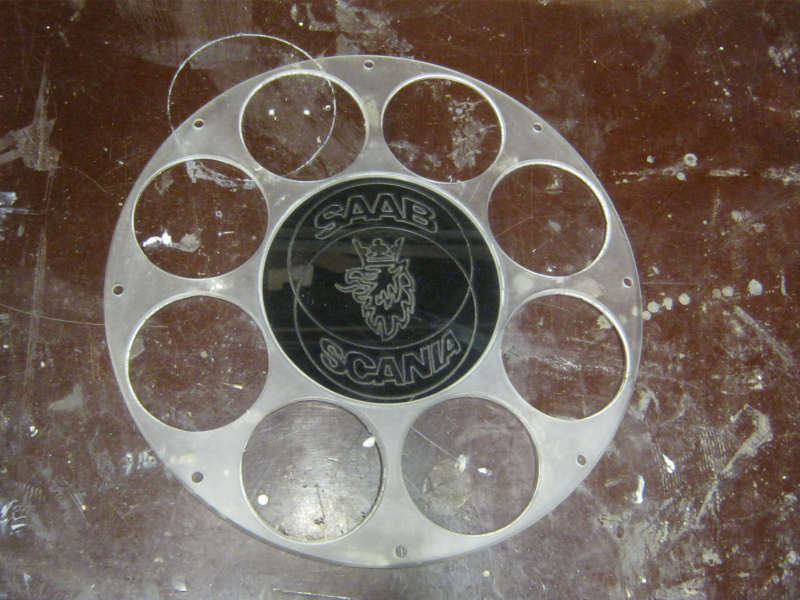 Be it a deck plaque, a bling'esq trinket, a drink holder or a set of wheel centre caps and inserts, if you can draw it we can manufacture it. So if you're keen to customise your car with a profession touch that isn't over the top, sitting there screaming 'somebody give me some more attention' then why not shoot us an email? 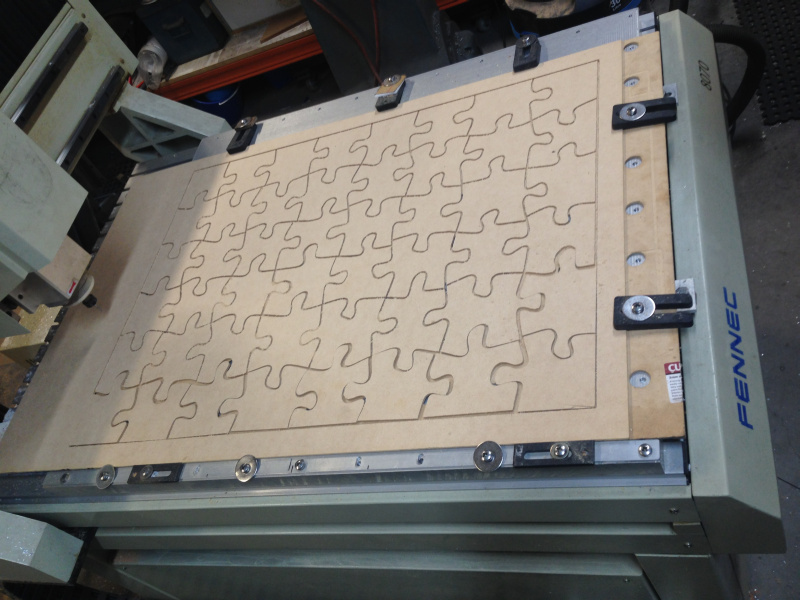 For those amongst you who are more the nuts and bolts engineering types, or if you're simply just interested in what the Fennec CNC machine looks like and how it manages to punch out all those complex and intricate shapes, we've prepared a small video clip of it knocking out a plaque for one of our jobs here recently. 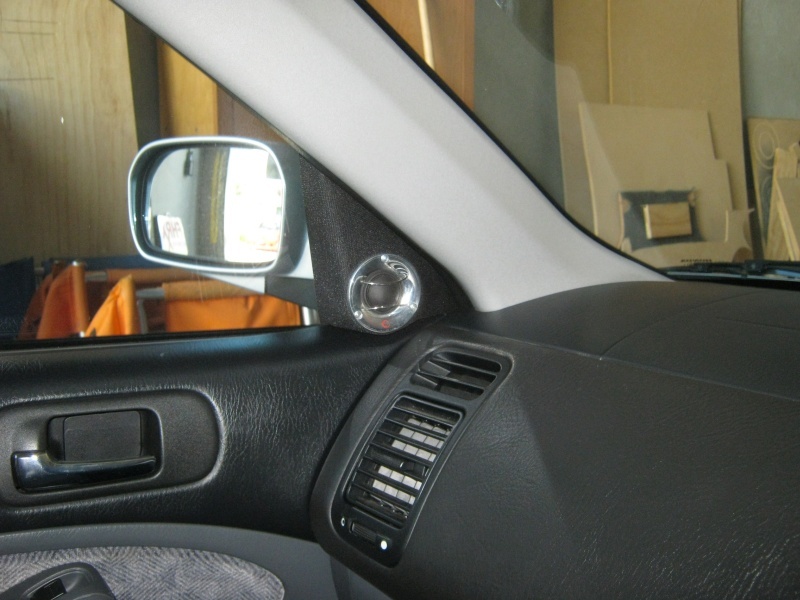 When we install lighter crossovers, we don�t screw them down for a couple of reasons. 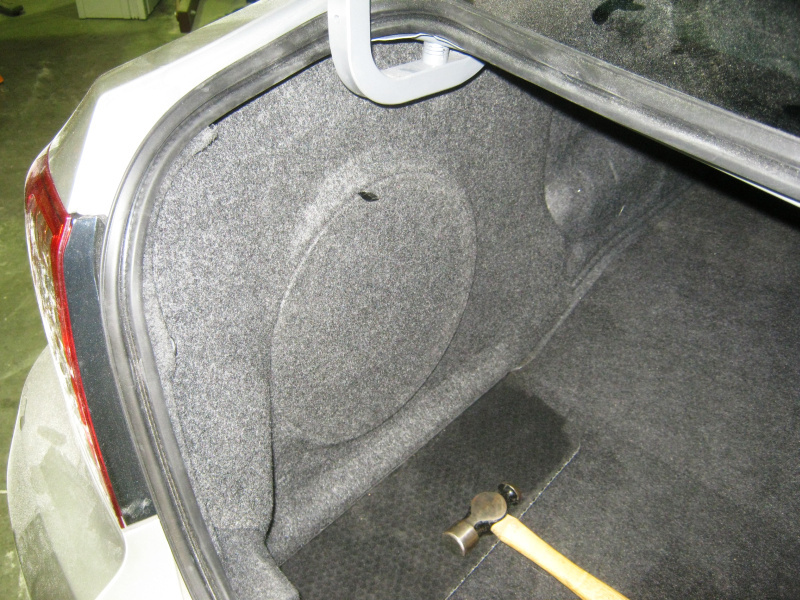 The first of course is that it would be conducive to drilling holes in the car, which we refuse to do. 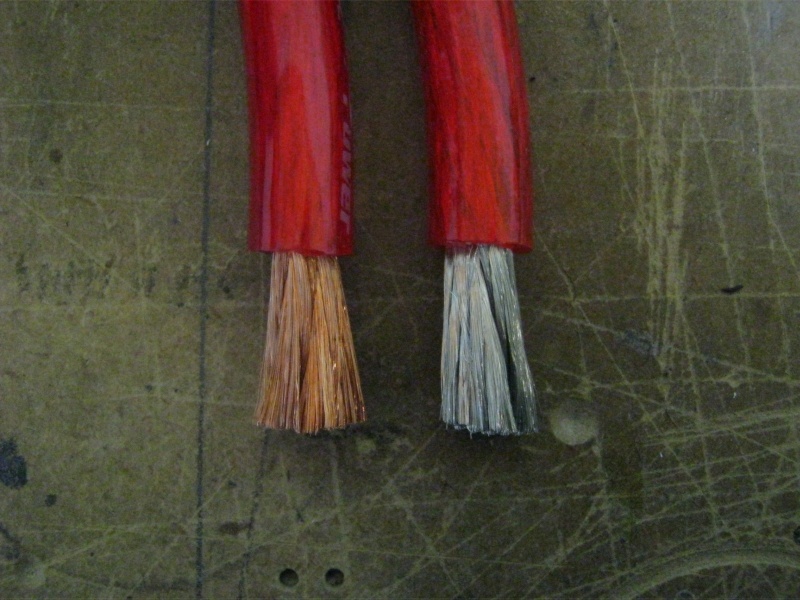 Secondly; time and time again we find crossover PCB�s bent and broken because of being screwed down. Whilst some crossovers possess seriously robust cases; the reality is that most have flimsy cases, which love to bend and flex when screwed down. This in turn often lends itself to bending the PCB within and intermittent shorting henceforth as a result. 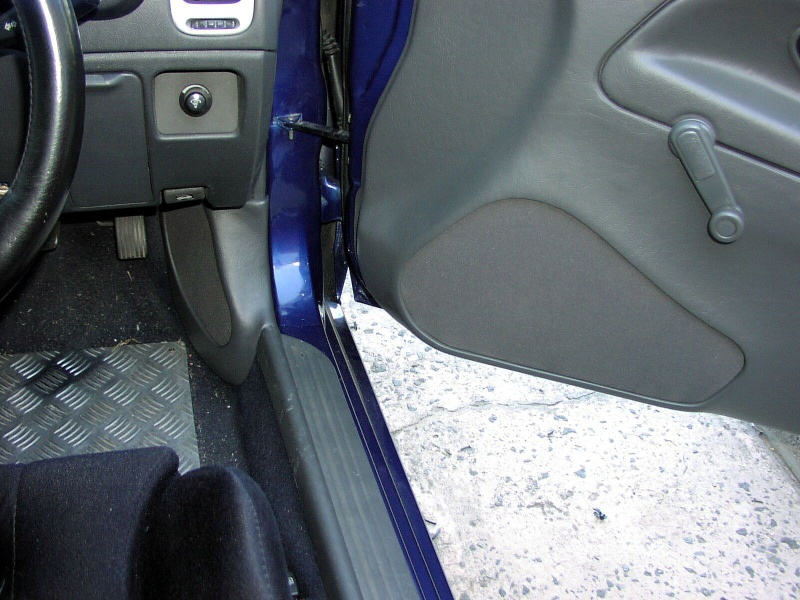 The foam liner shown above secures the crossover in position then we use a mat on the door trim itself to gently resist against the crossover when it�s in situ; thus stopping it from moving. This works every time for the aforesaid lighter crossovers. Now for the heavier units; we either weld up metal brackets to hold them in place else we install them elsewhere such as under a seat etc.